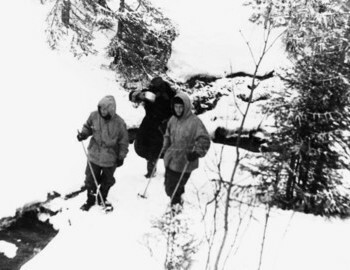 Initially the officials were hesitant to sound an alarm about hikers disappearances in Mt Otorten when they missed their day they were supposed to call. 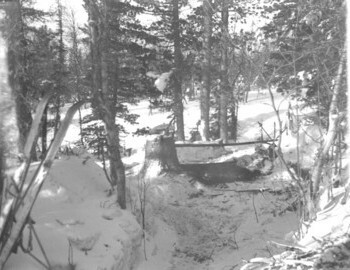 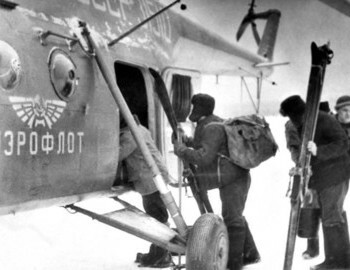 From Vizhay Blinov group that was mentioned in the Dyatlov diary on January 24 returned in the middle of February and reported a heavy snowstorm in the area of the Kholat Syakhl and future Dyatlov Pass. 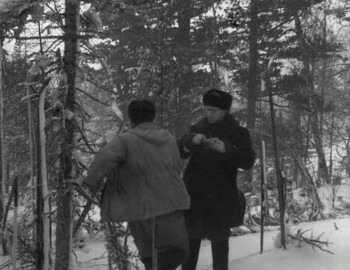 In light of this information it was assumed that hikers are spending these extra days somewhere in the safety near Dyatlov Pass. 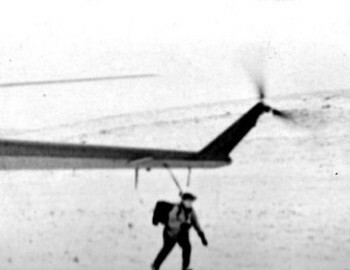 Risking lives to make extra miles do get back at the due date made no sense. 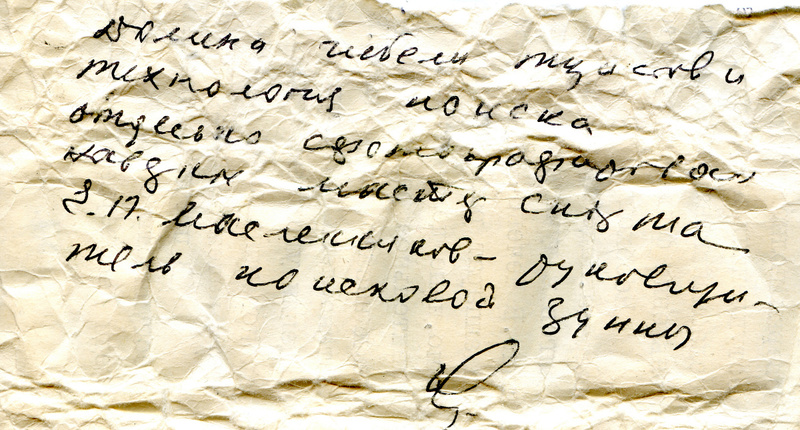 Head of sport club of UPI, Lev Semyonovich Gordo, even lied about receiving a telegram from Dyatlov about the delay to calm parents of Dubinina and Kolevatov. 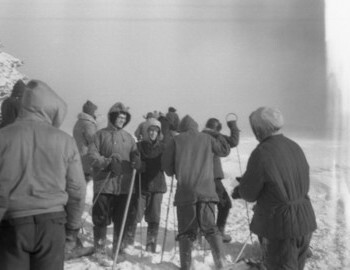 He assumed that in few days the group of Igor Dyatlov is going to make it anyway. 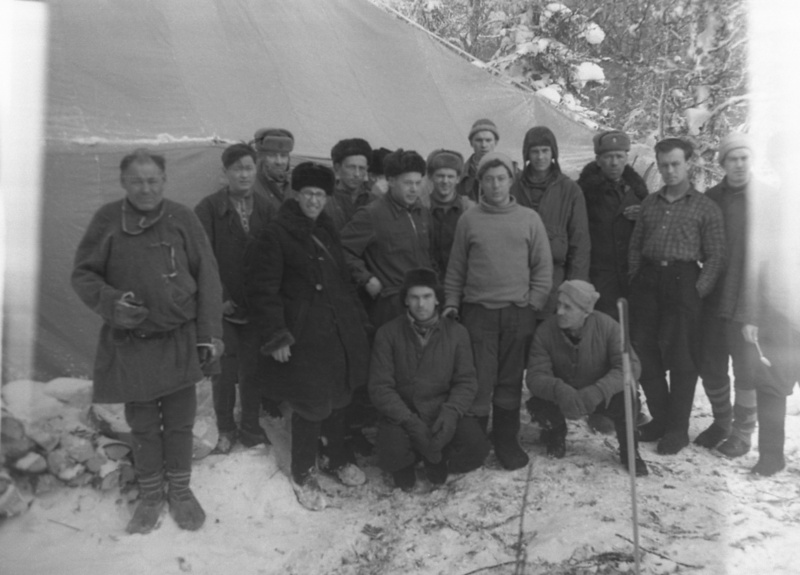 Relatives eventually forced to organize a search party by complaining to the local head of the Communist party. 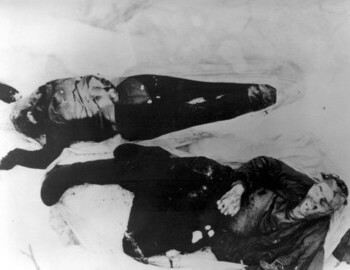 Negative publicity was unwanted and actions had to be taken. 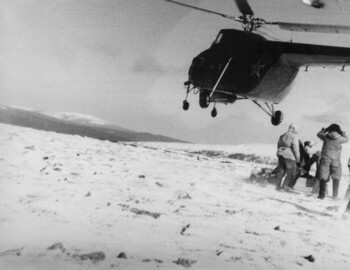 The head of the military department of UPI, Colonel Georgiy Semyonovich Ortyukov, took charge of search and rescue party. 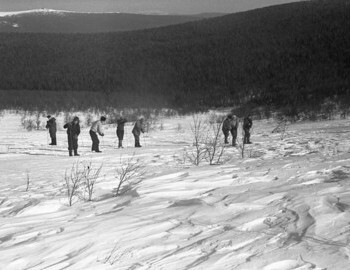 Many of students volunteered to search for their lost friends. 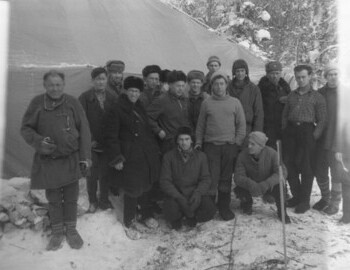 Several rescue parties were sent to the region on February 21. 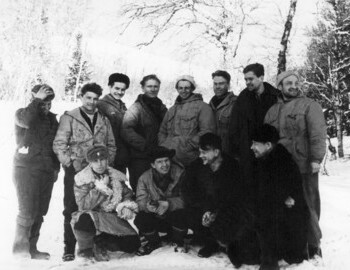 One of these groups were headed by Blinov and another Sogrin. 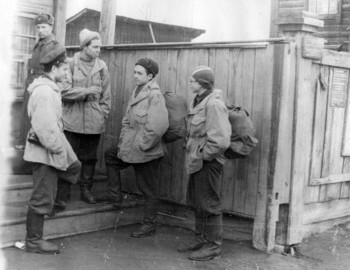 Both groups just returned from their trips and knew the conditions of the region. 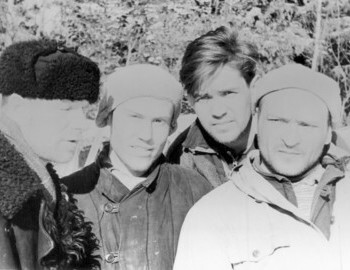 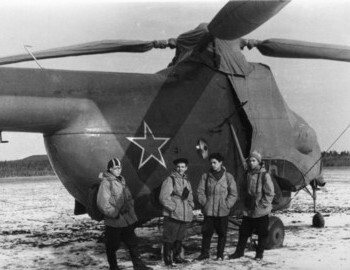 Another group of Vladislav Karelin was in the area and joined the search effort. 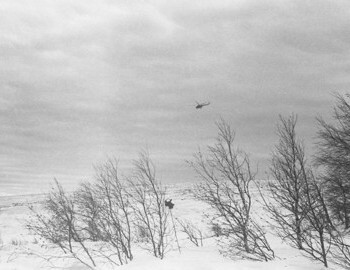 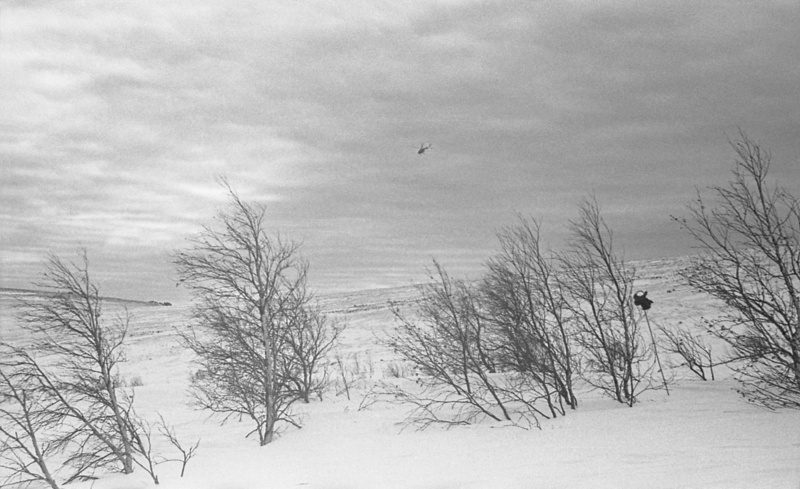 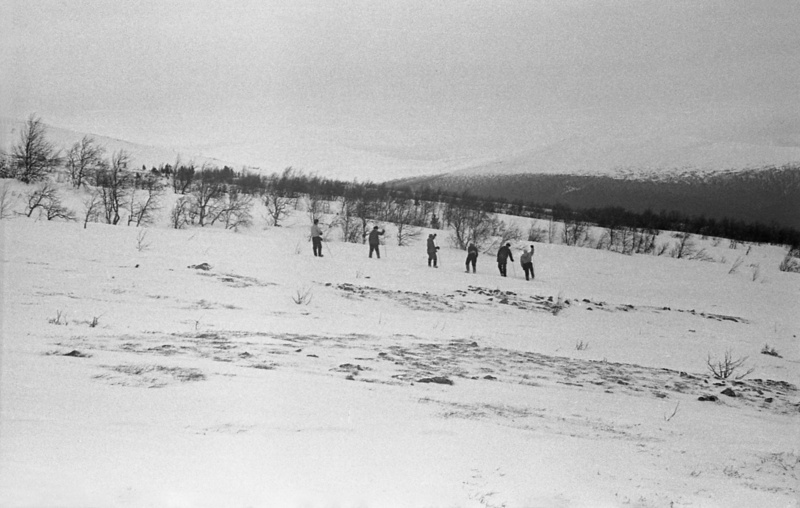 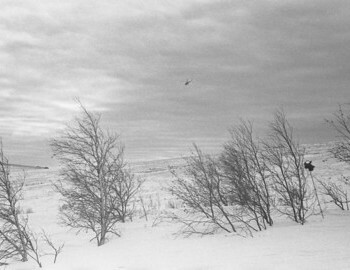 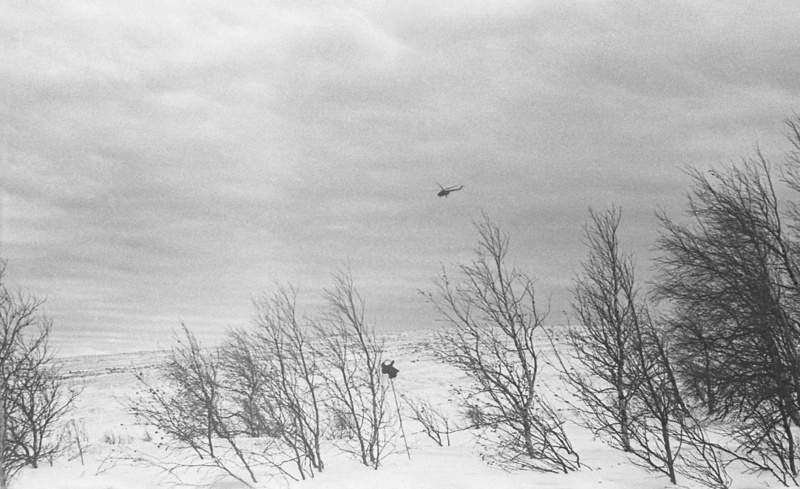 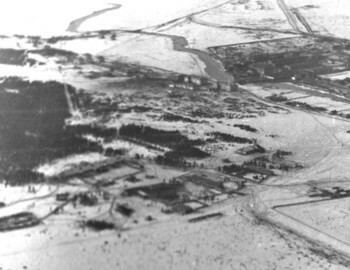 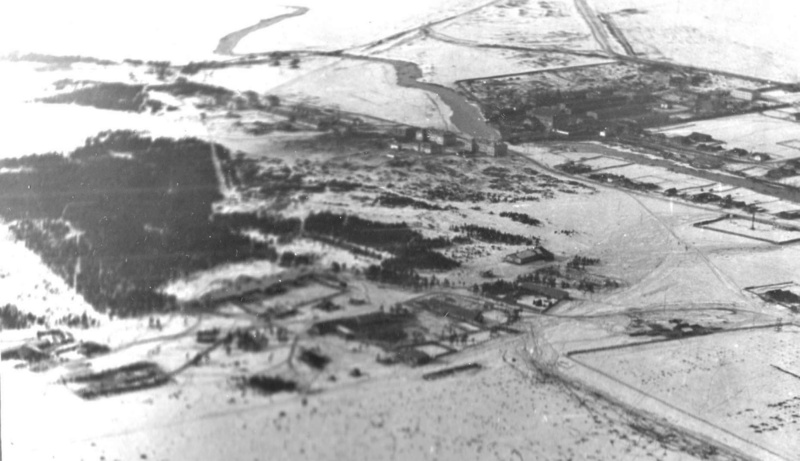 Planes took off from Ivdel airport to search for the group from the air. 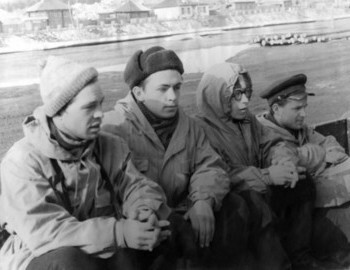 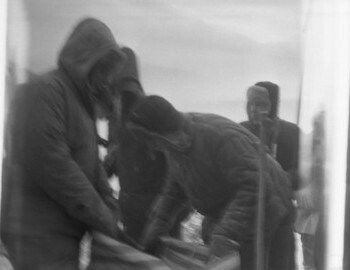 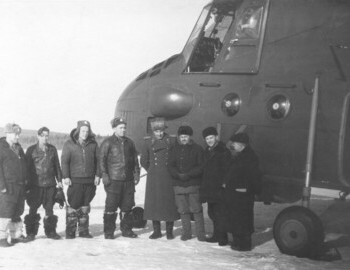 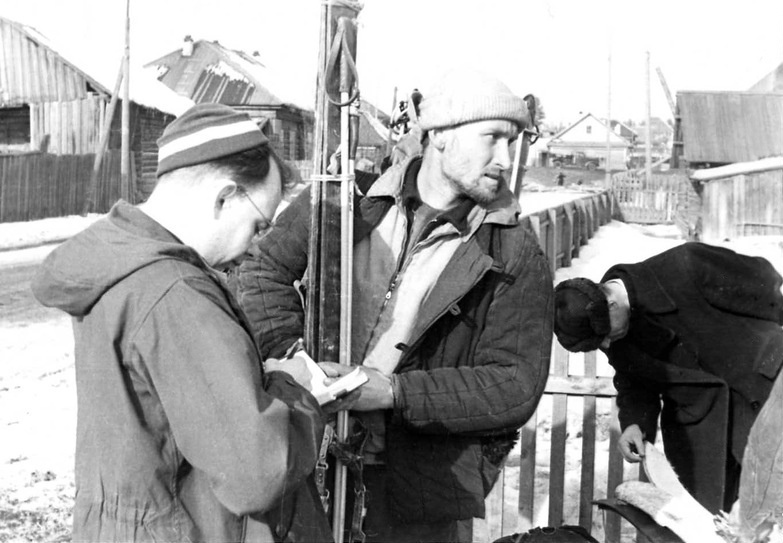 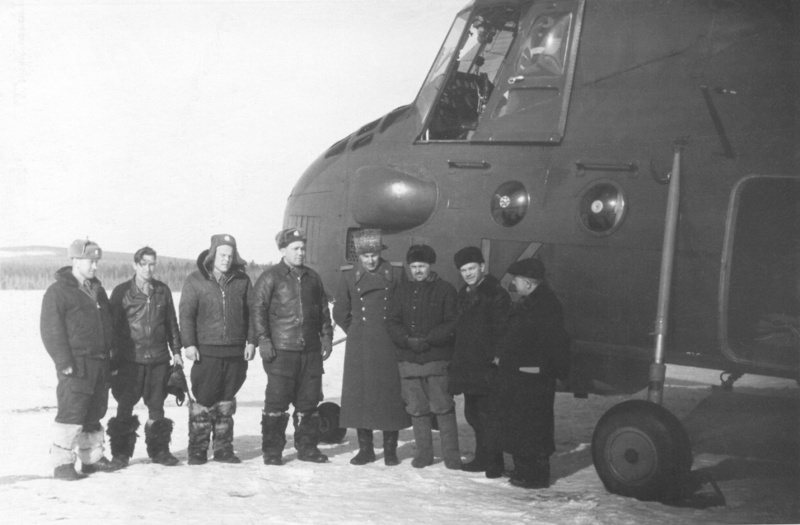 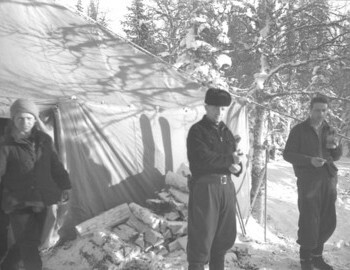 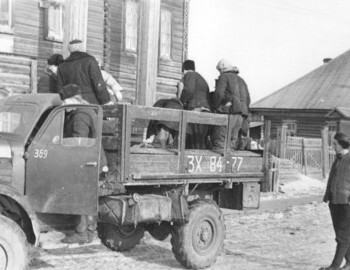 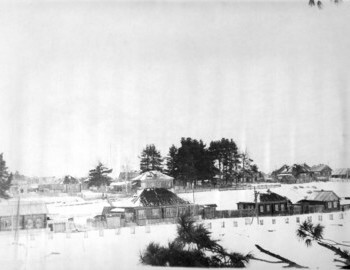 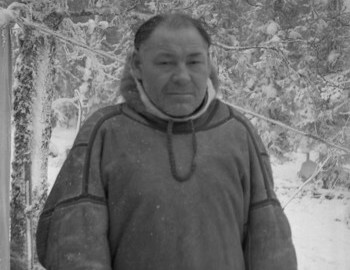 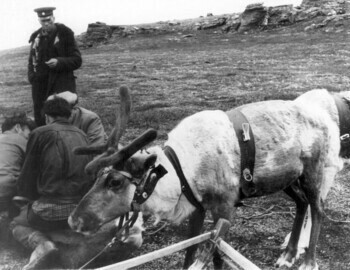 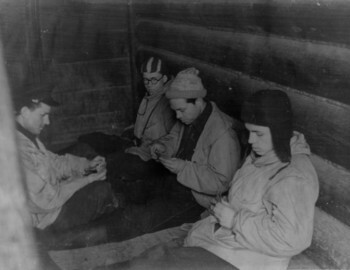 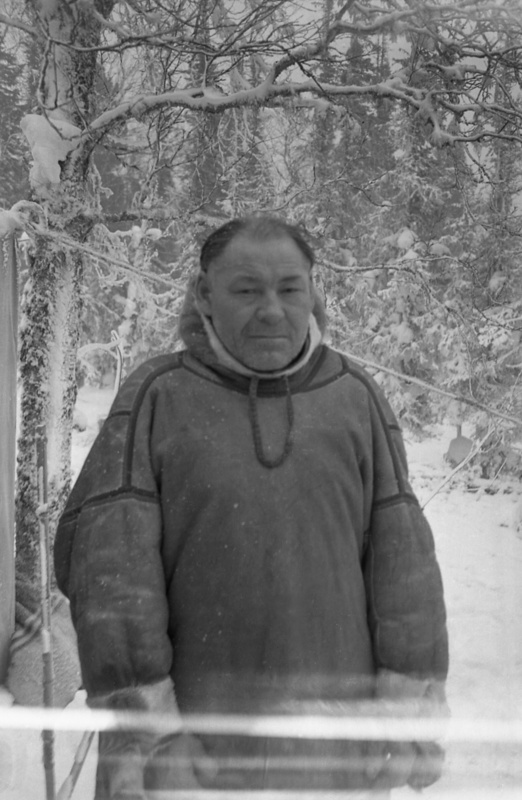 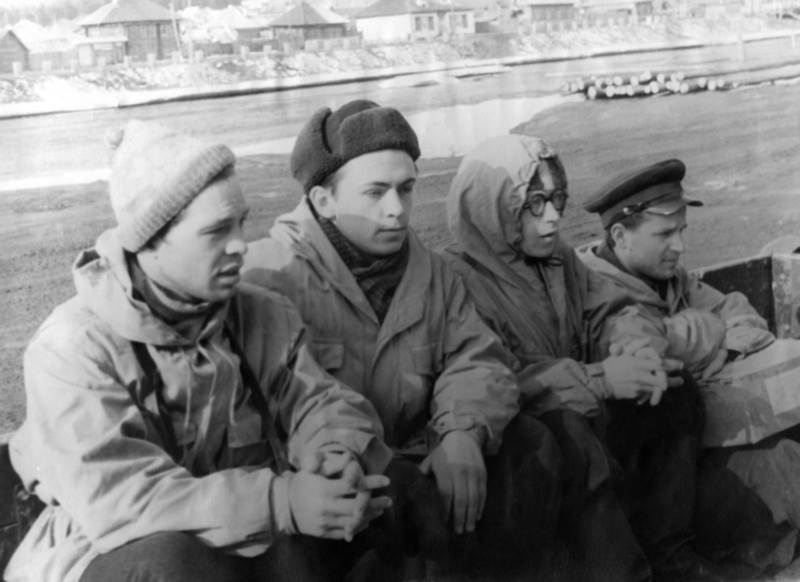 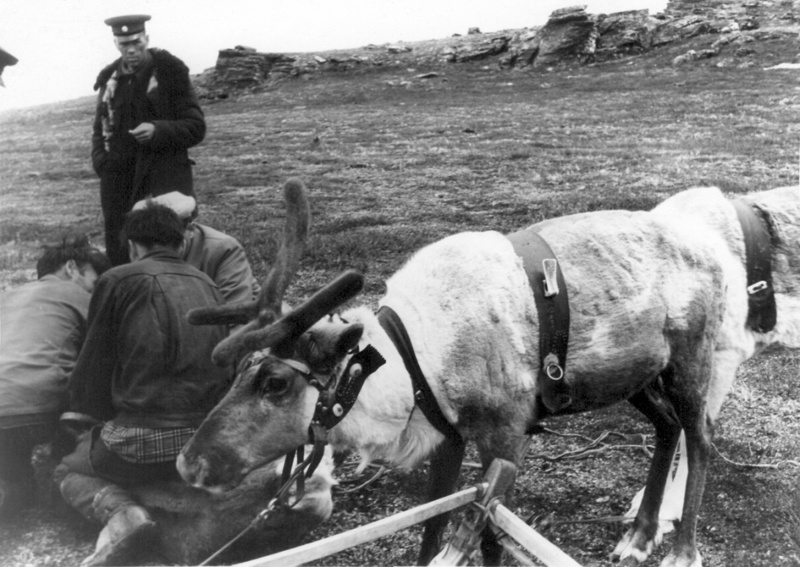 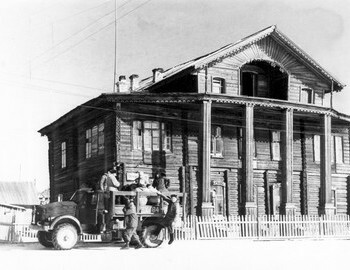 On February 22 several prison guards from the Ivdel LAG under leadership of captain A. 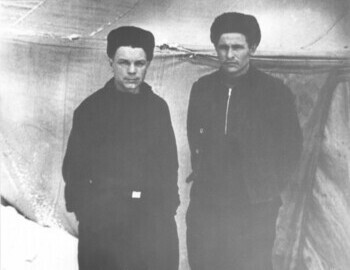 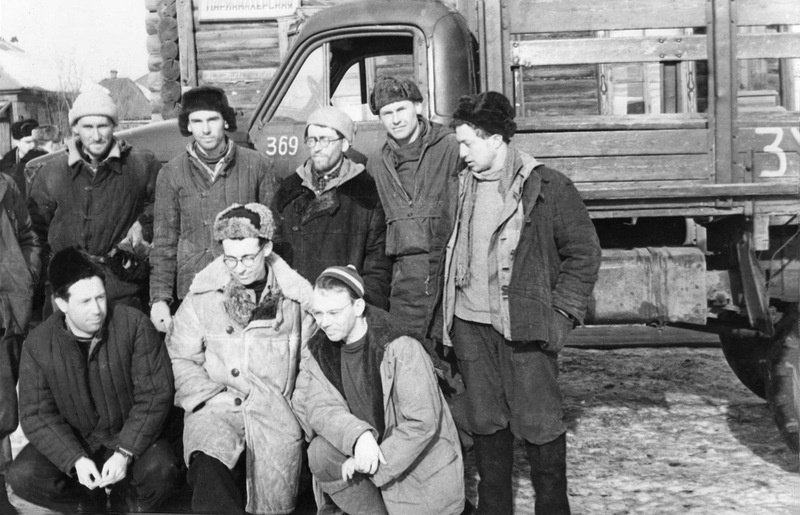 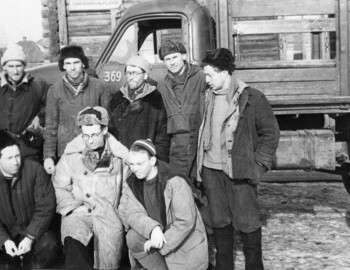 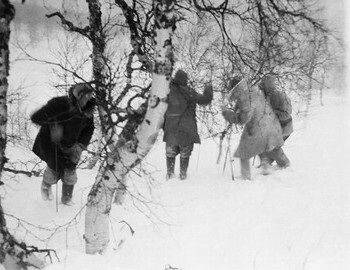 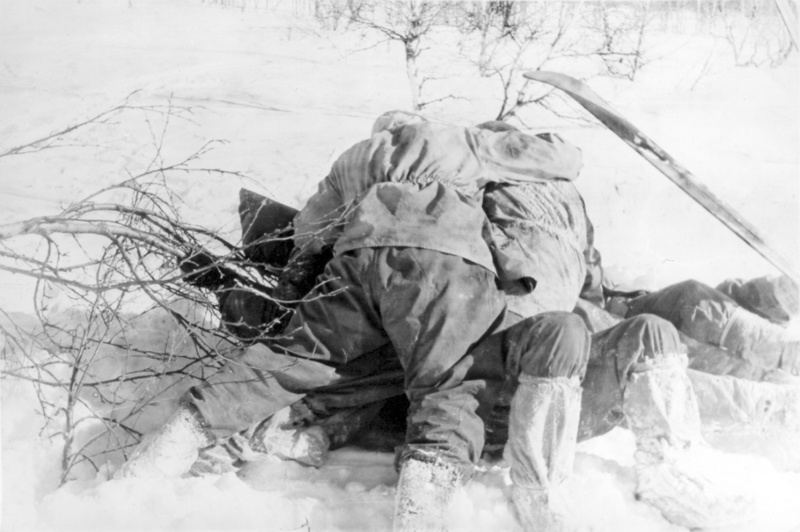 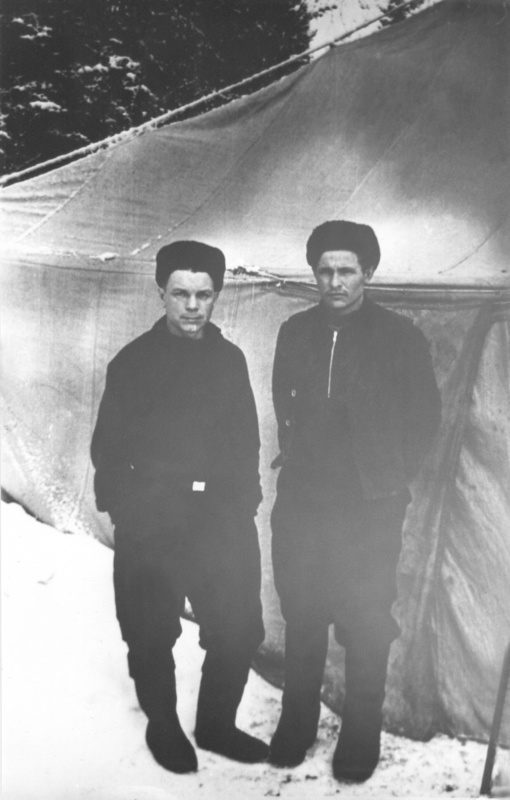 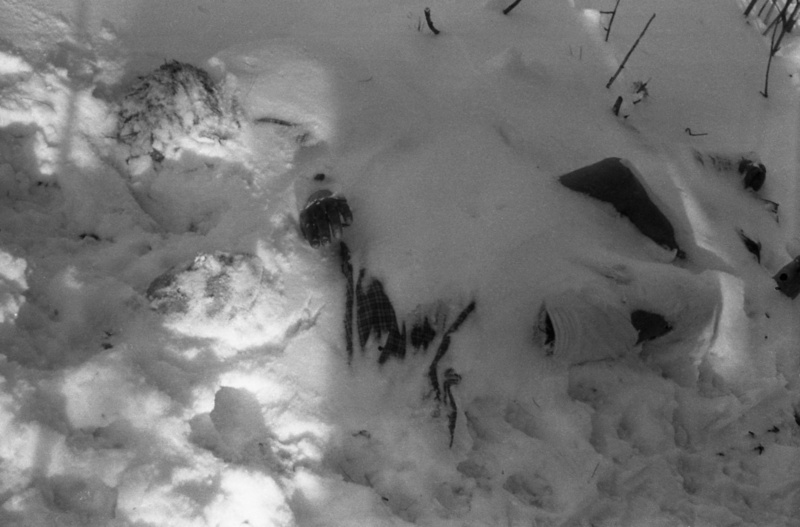 A. Chernyshov and another 7 officers of MVD (cops) under command of leutenant Potapov have joined the search in the Dyatlov Pass. 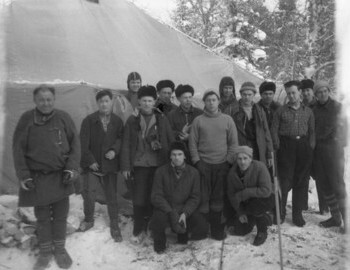 Another three groups were formed in UPI from student volunteers under leadership of Oleg Grebennik, Moises Akselrod and Boris Slobtsov. 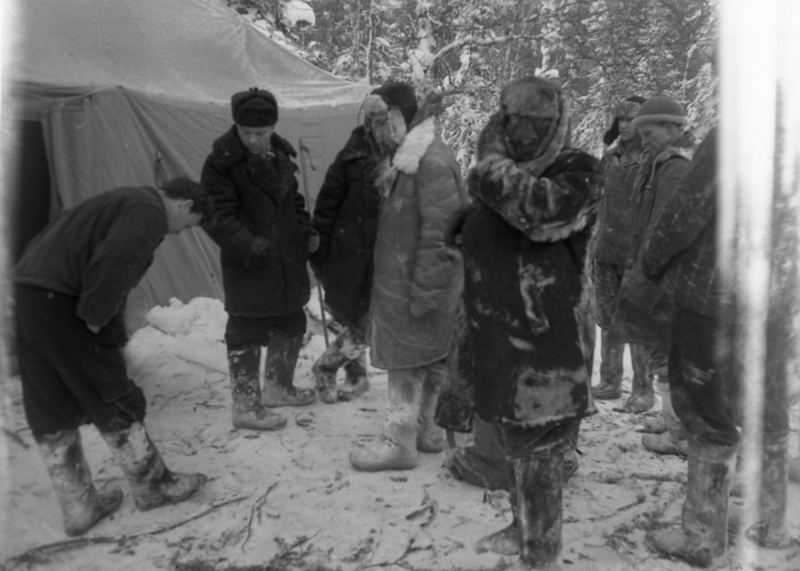 Additionally local Mansi hunters volunteered to help and look for the vanished group. 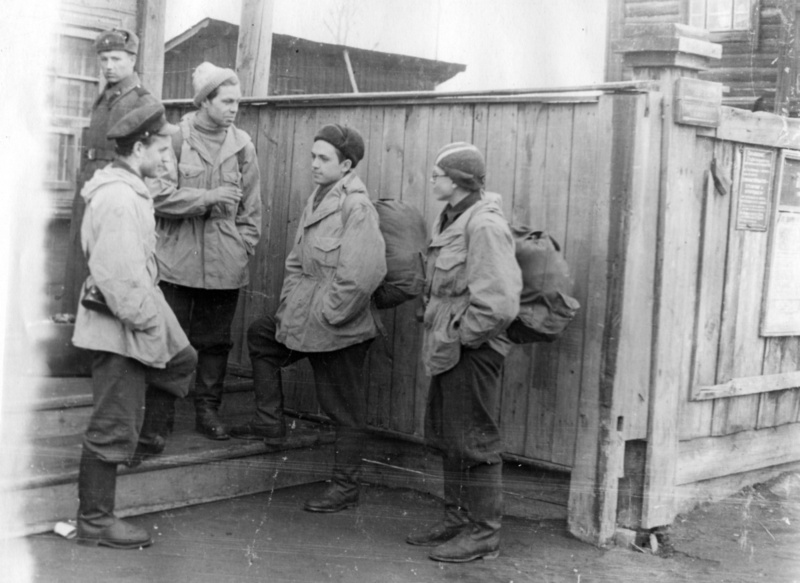 Moscow sent several specialists including E. P. Maslenikov, Baskin, Bardin and Shuleshko. 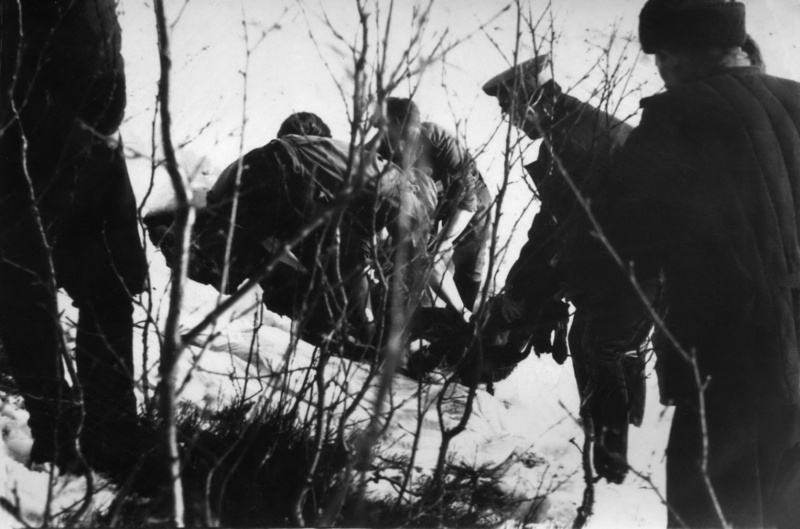 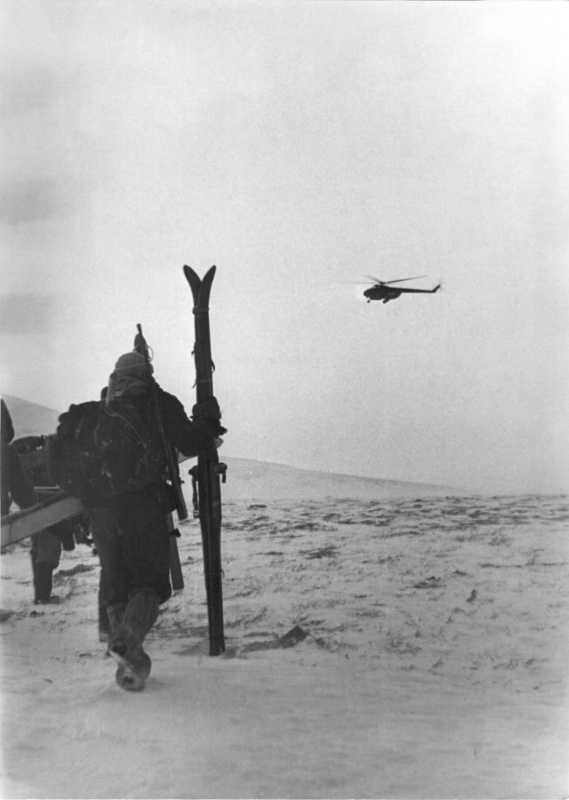 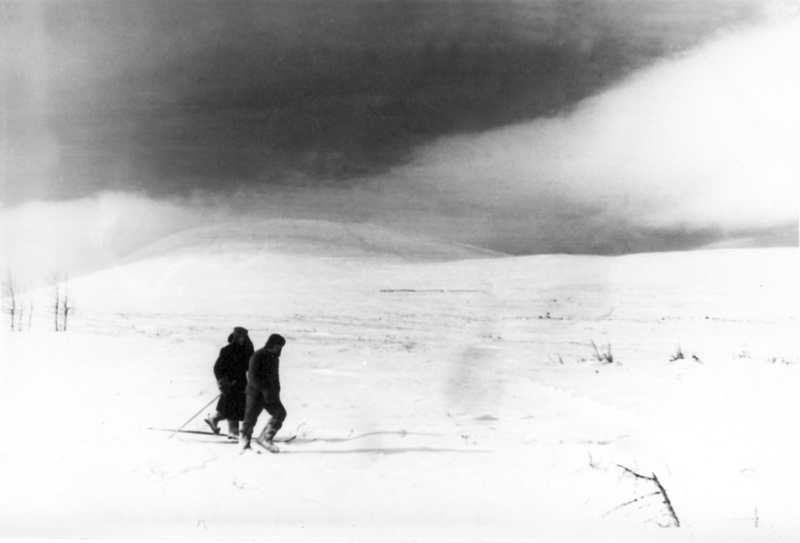 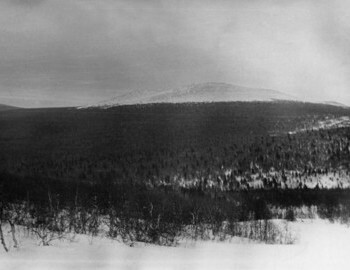 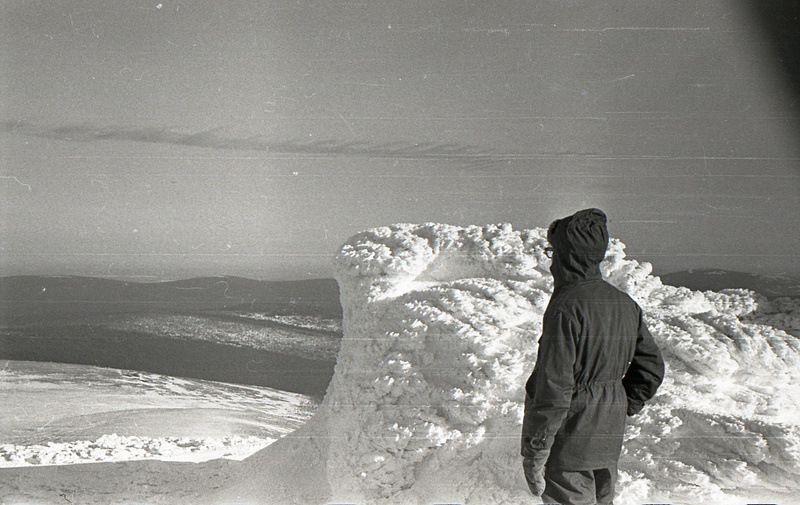 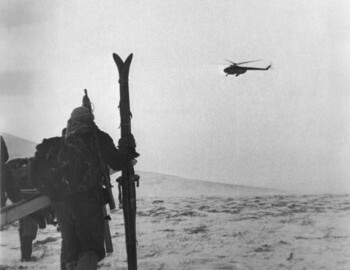 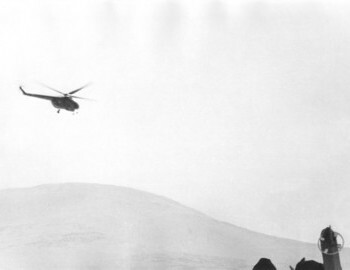 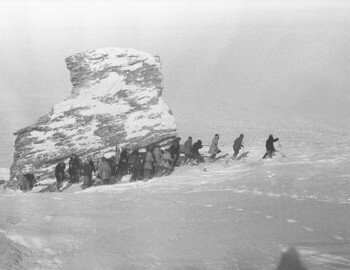 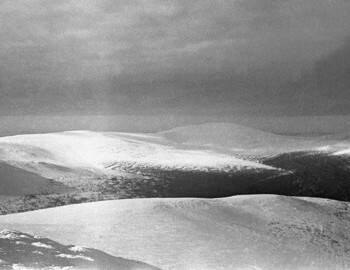 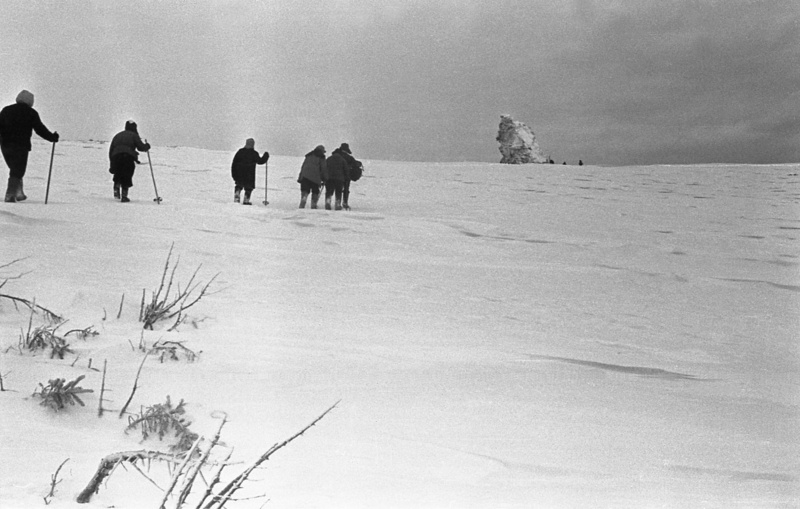 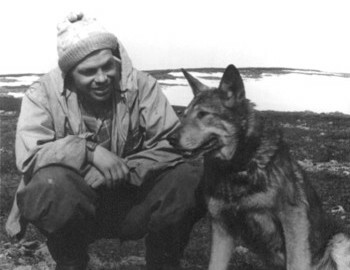 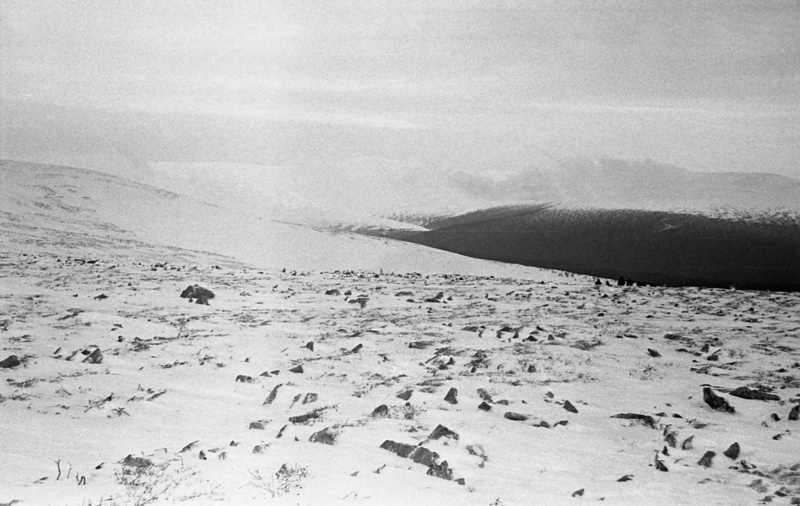 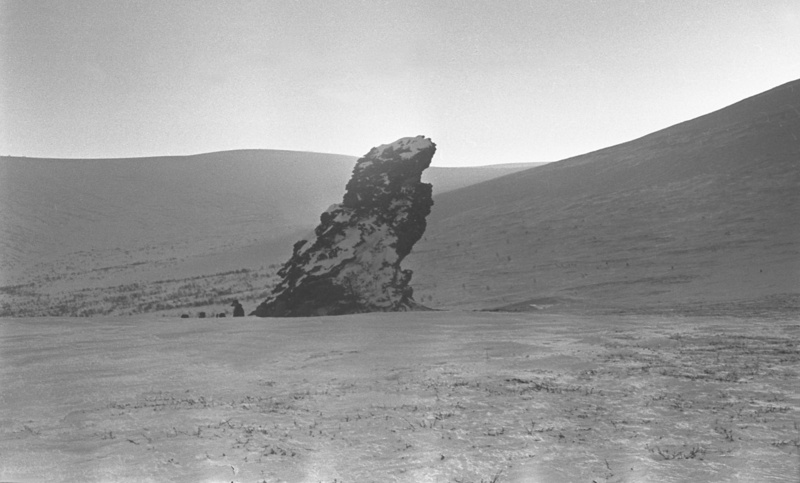 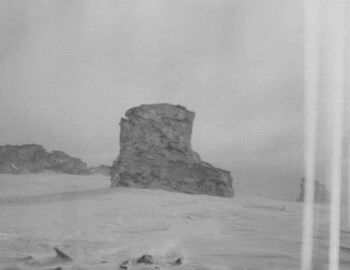 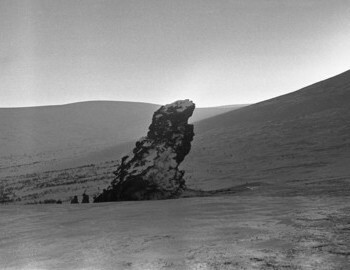 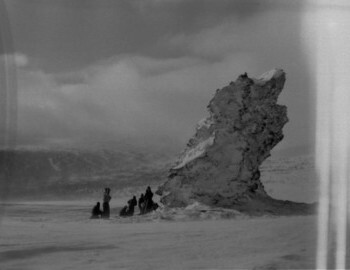 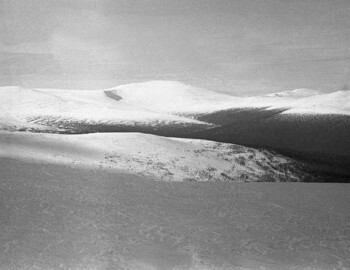 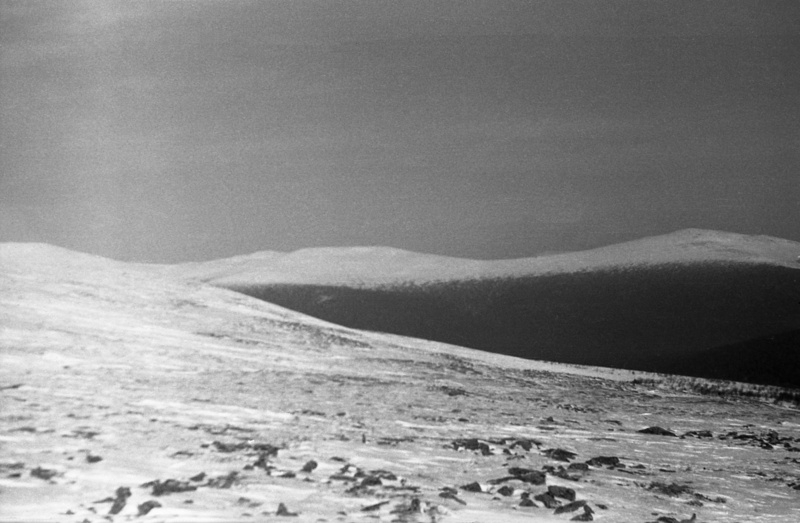 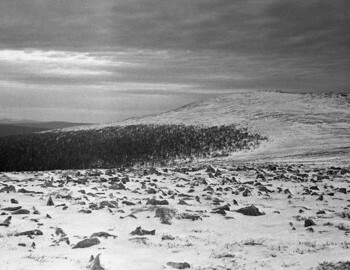 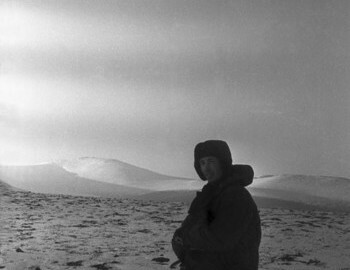 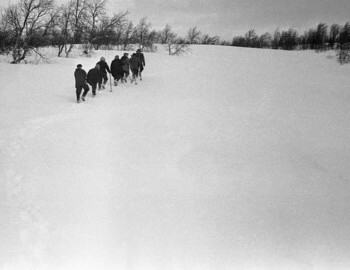 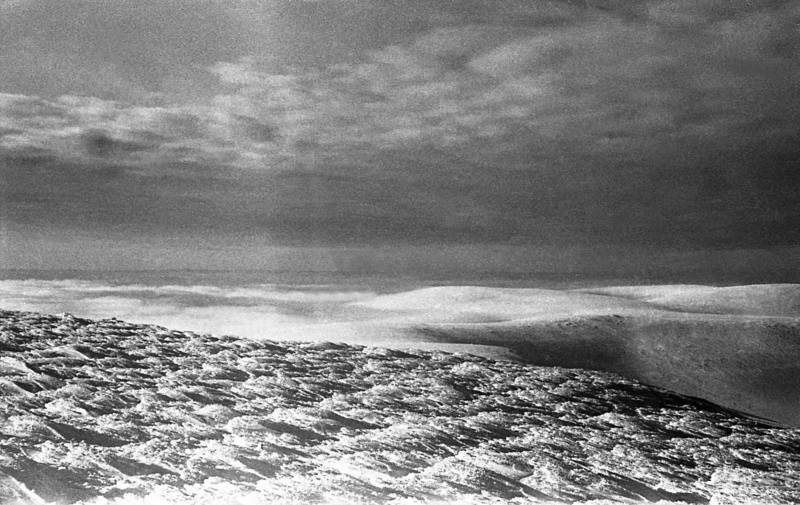 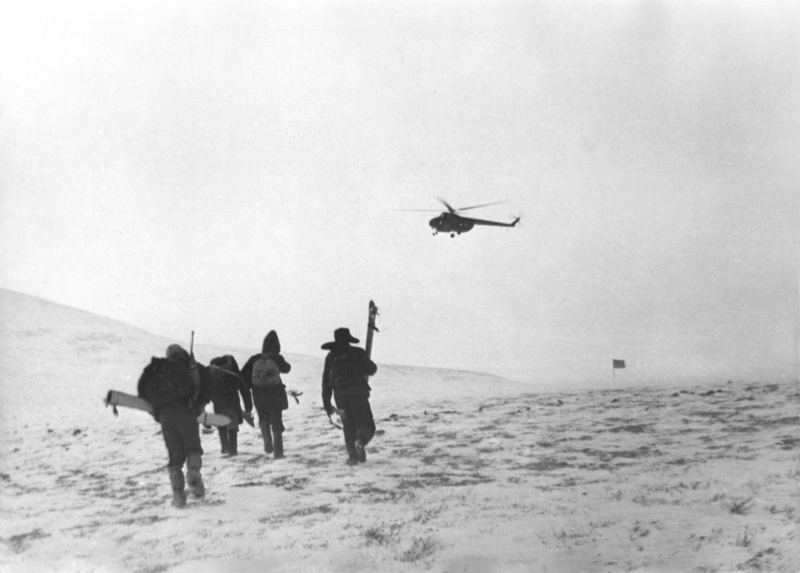 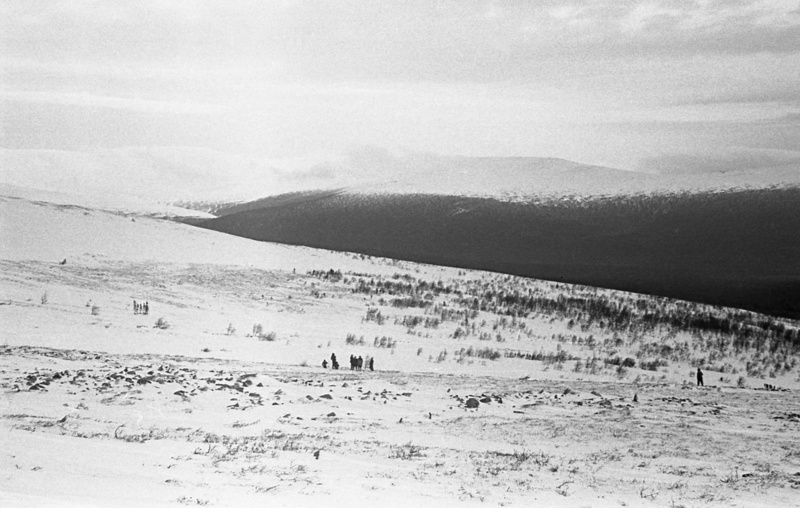 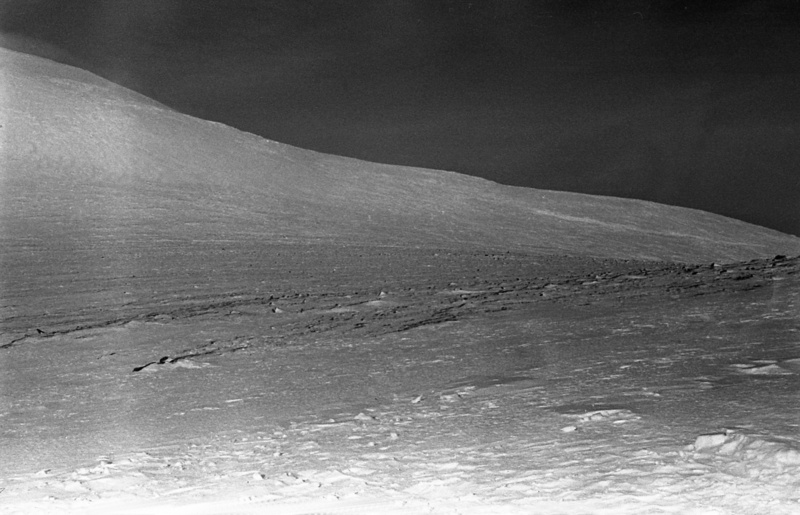 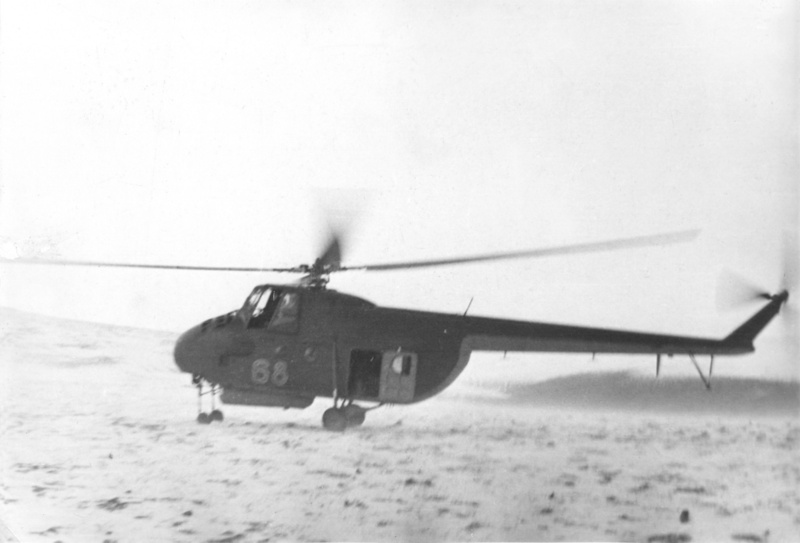 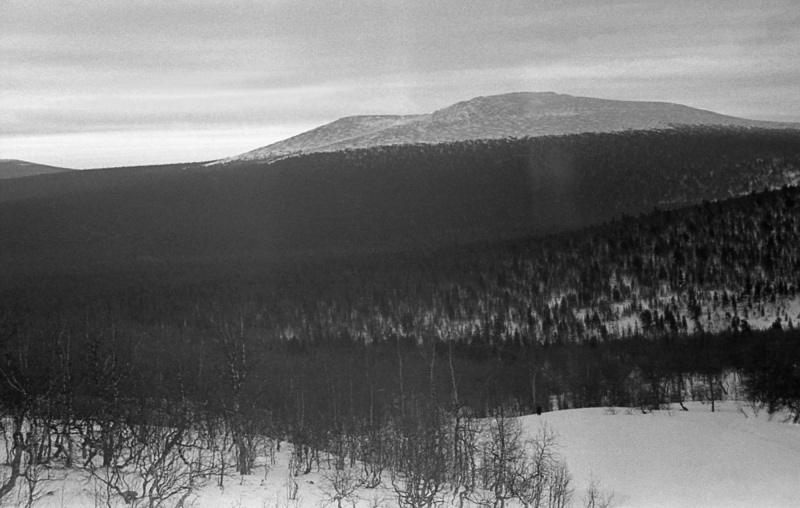 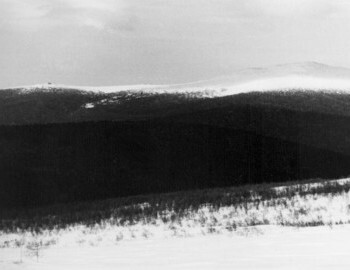 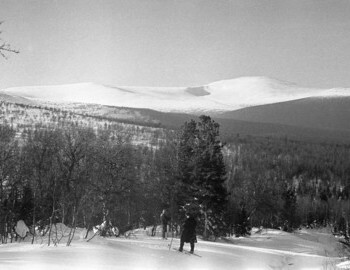 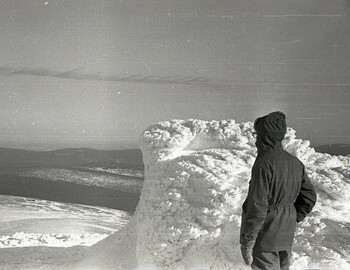 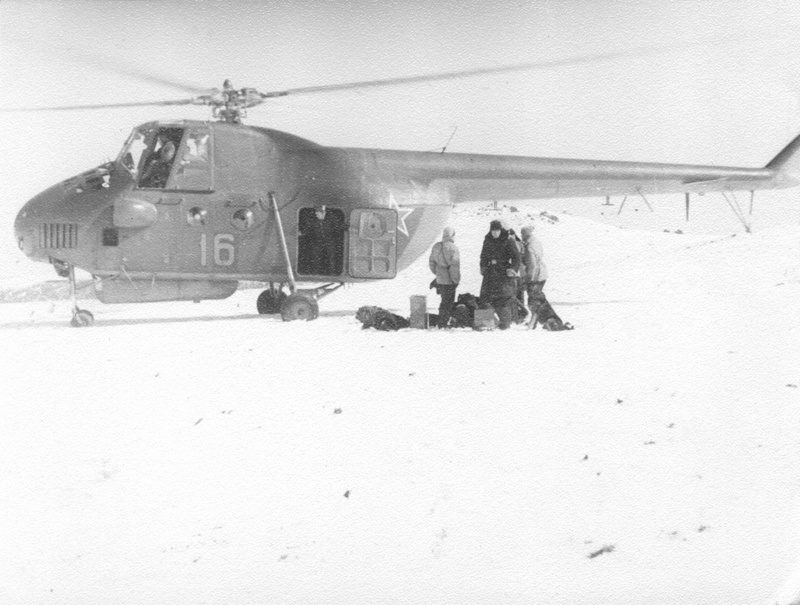 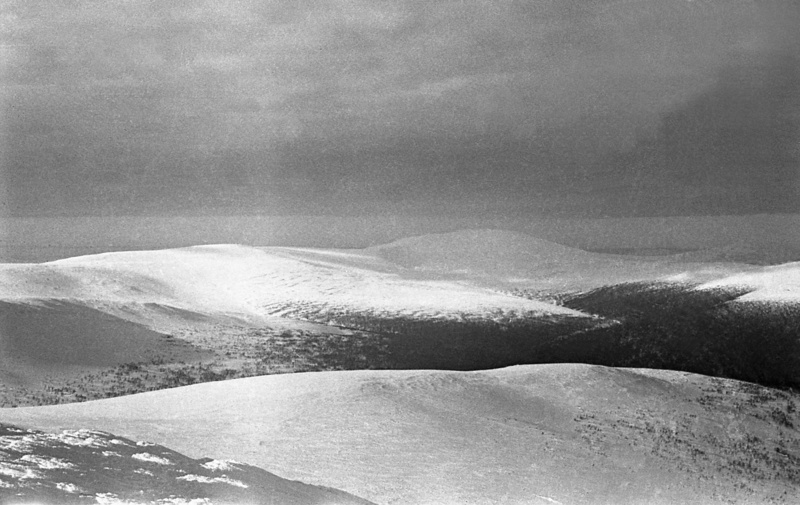 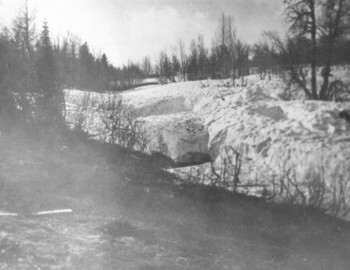 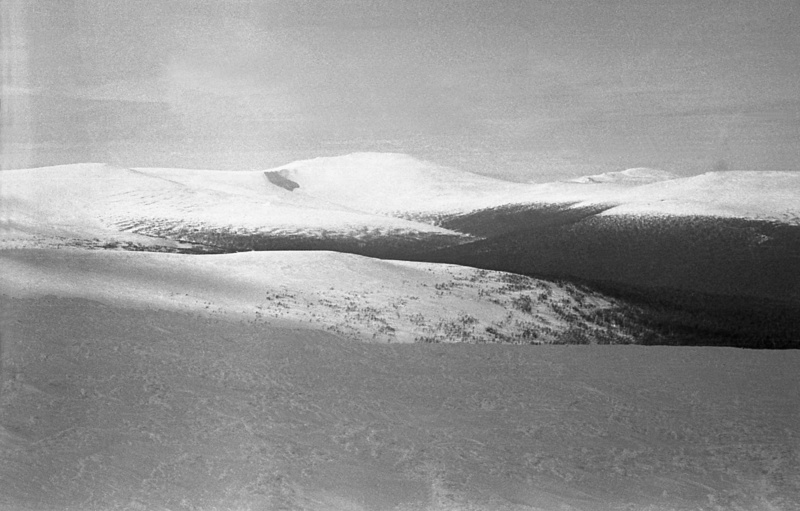 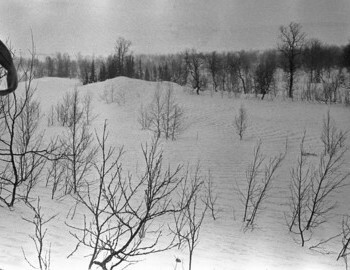 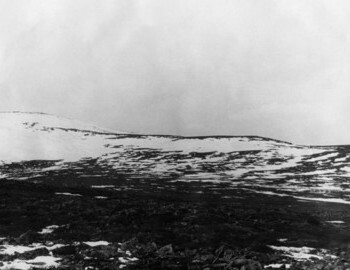 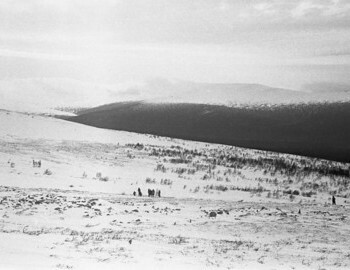 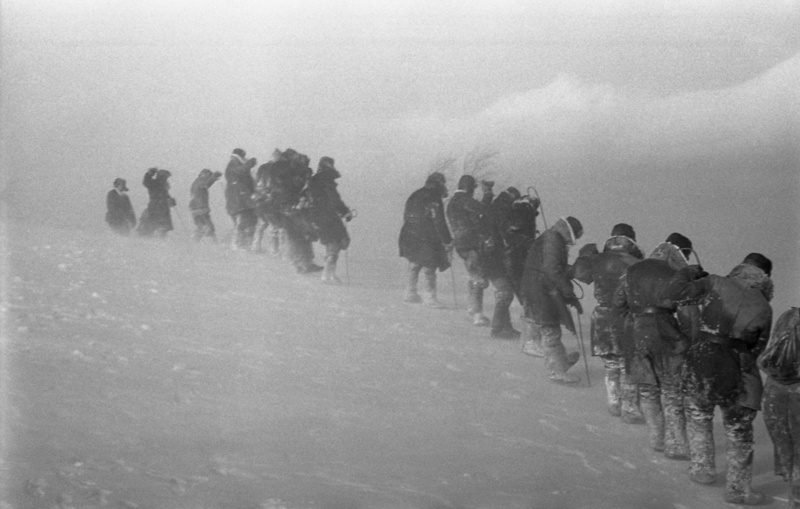 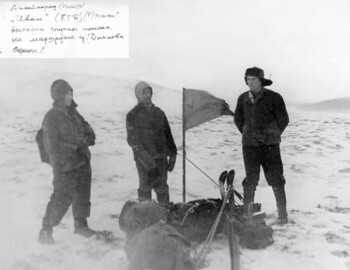 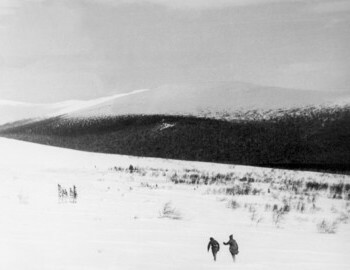 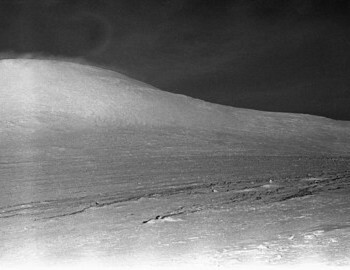 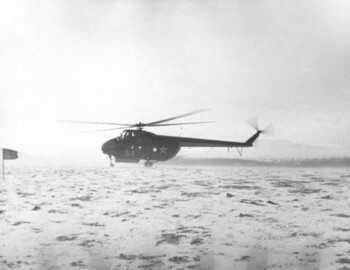 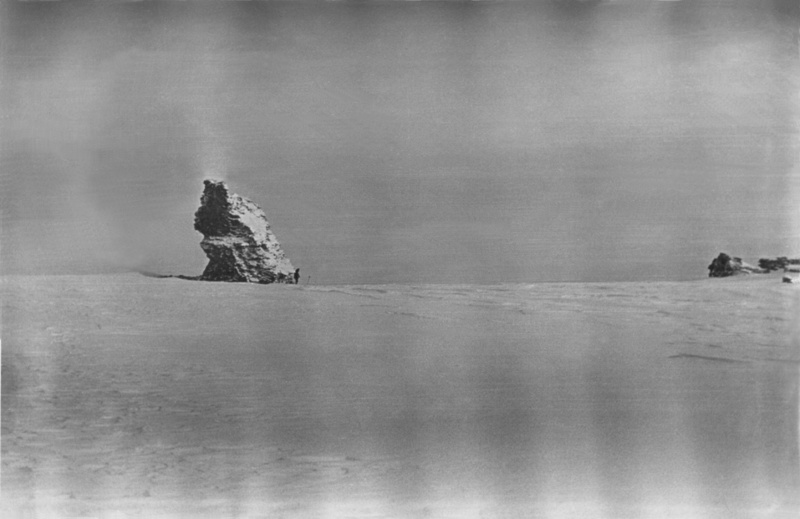 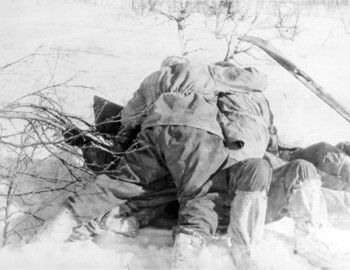 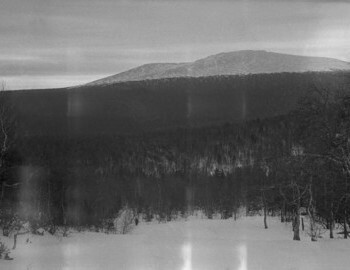 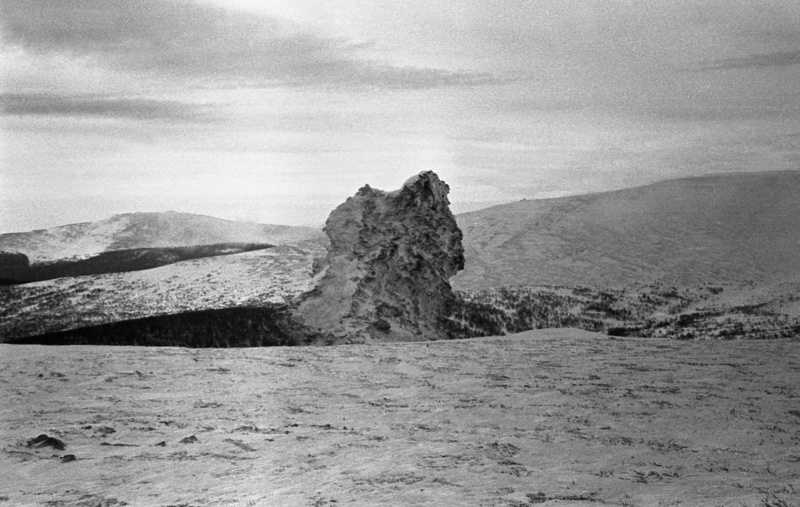 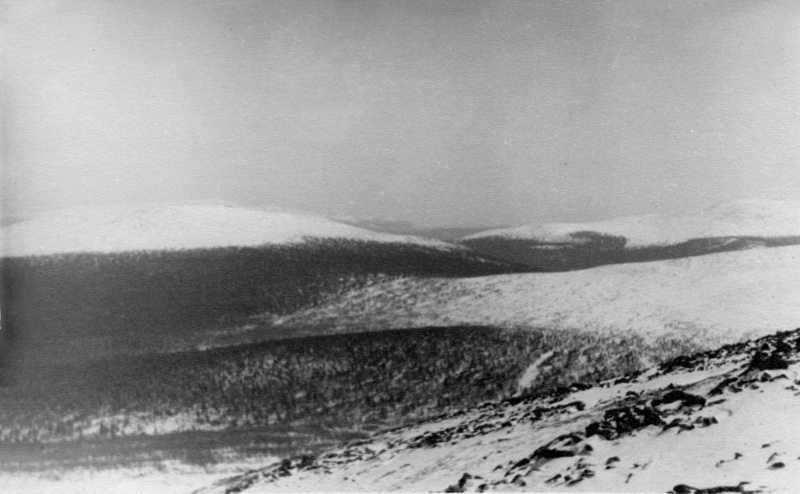 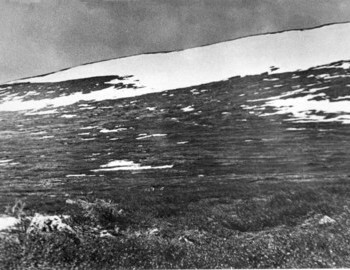 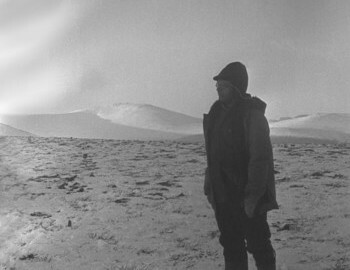 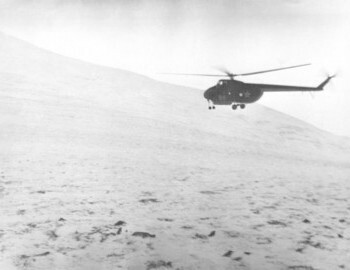 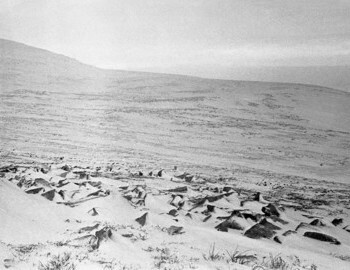 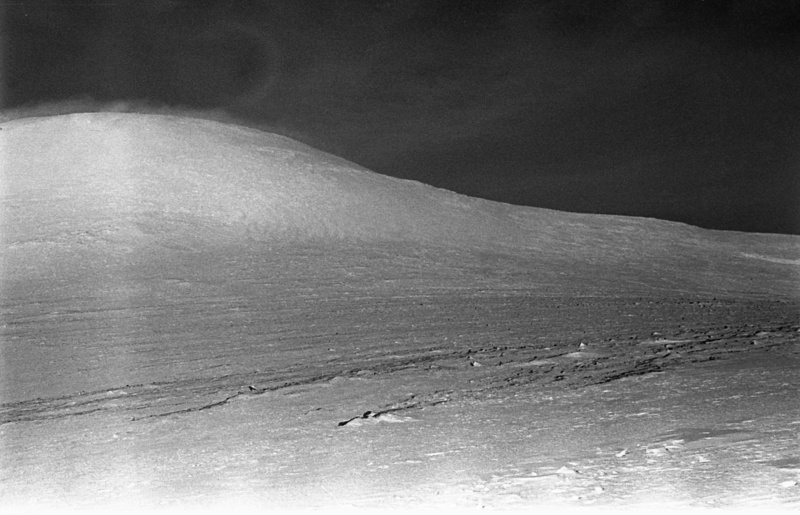 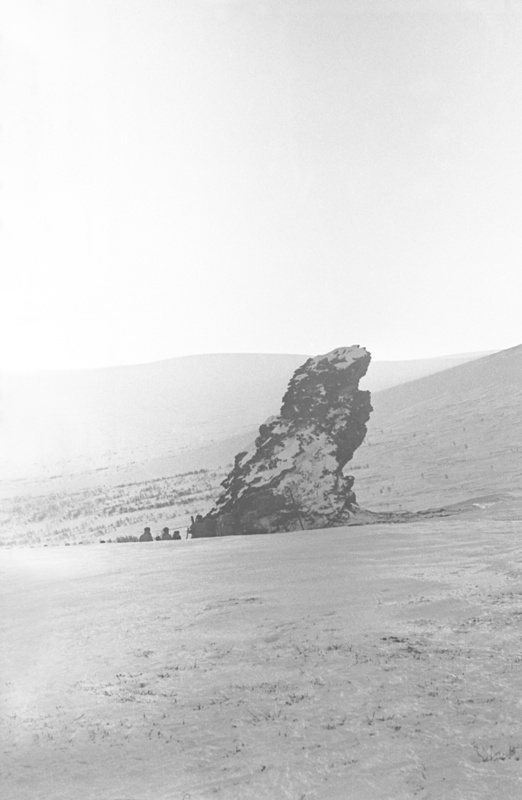 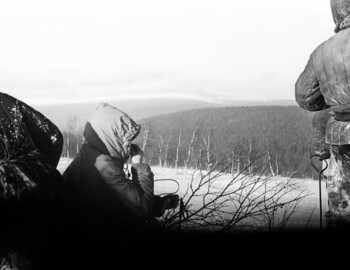 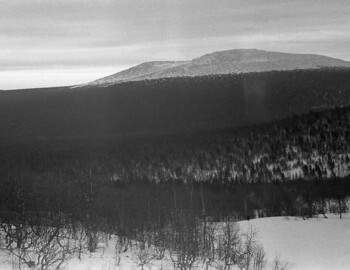 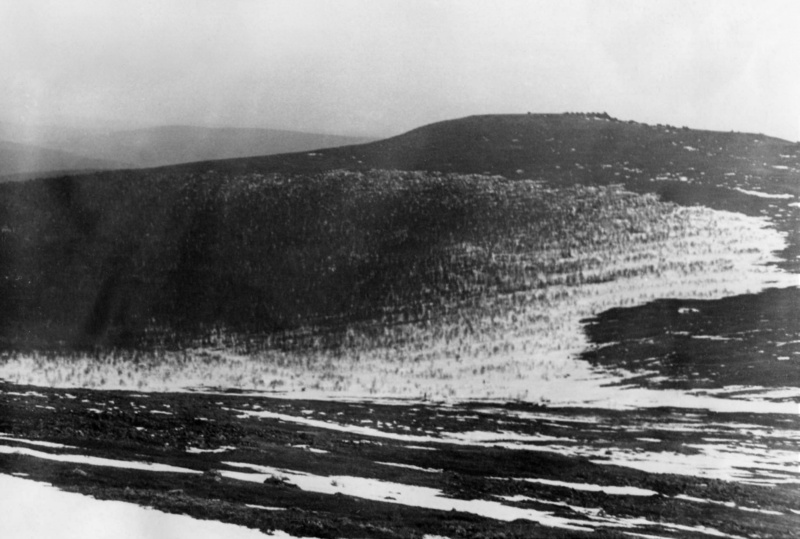 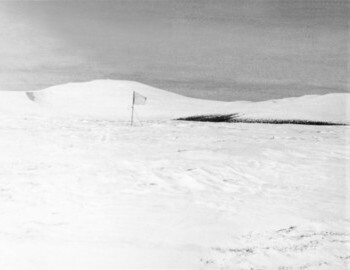 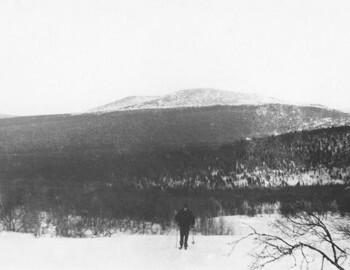 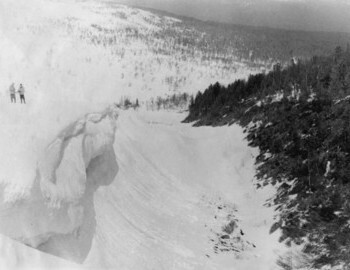 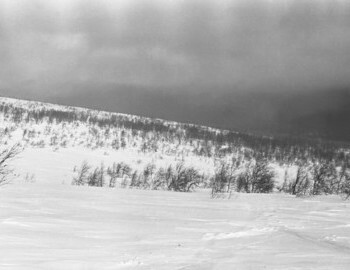 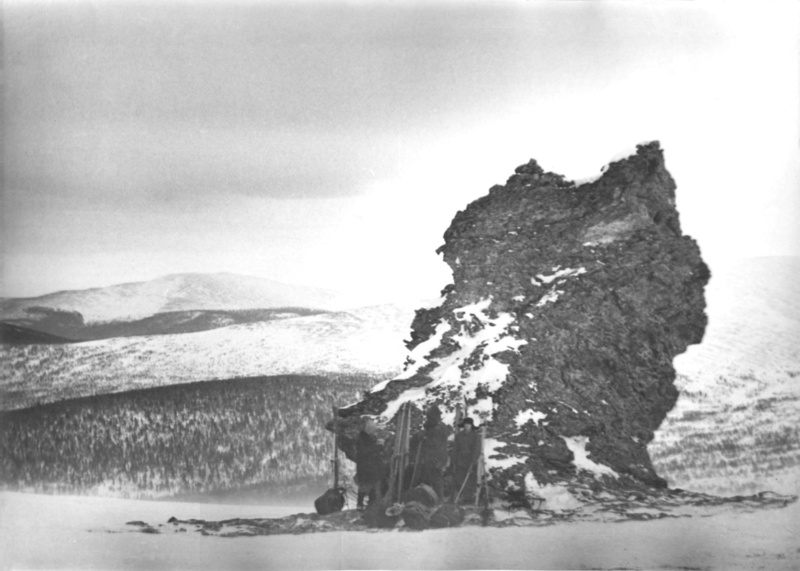 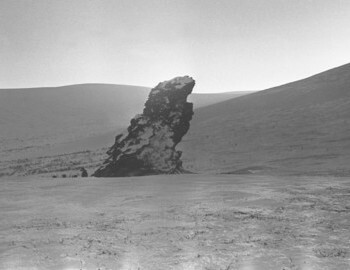 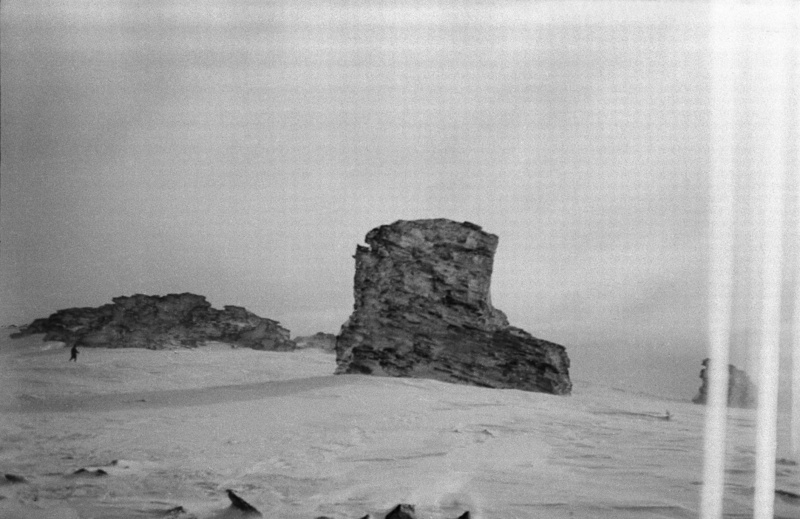 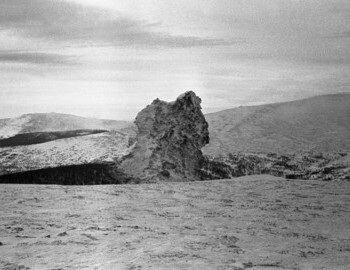 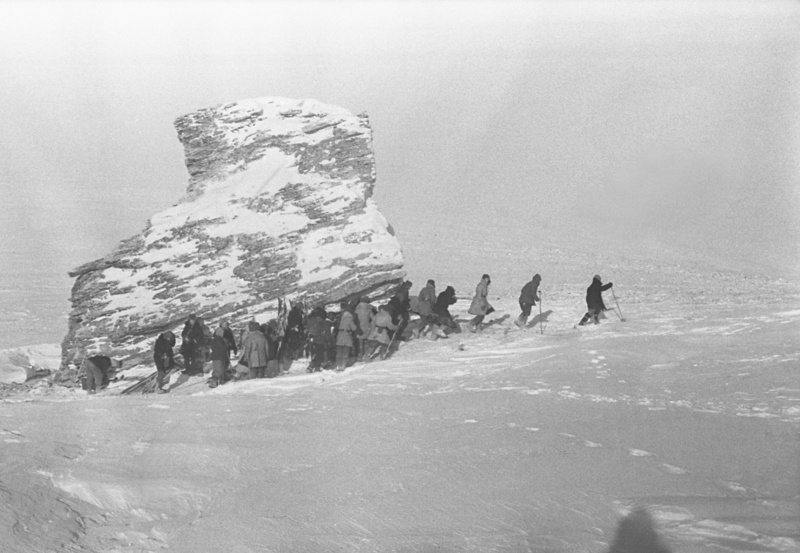 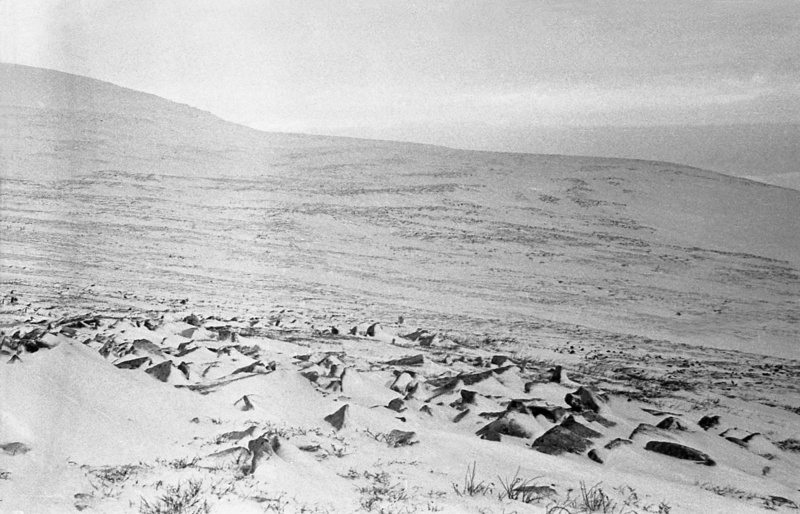 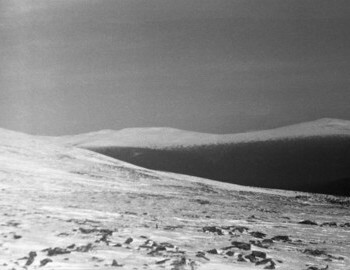 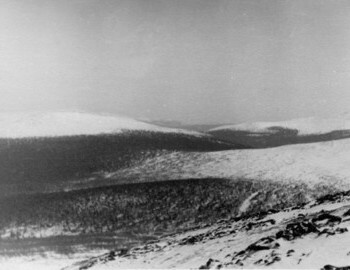 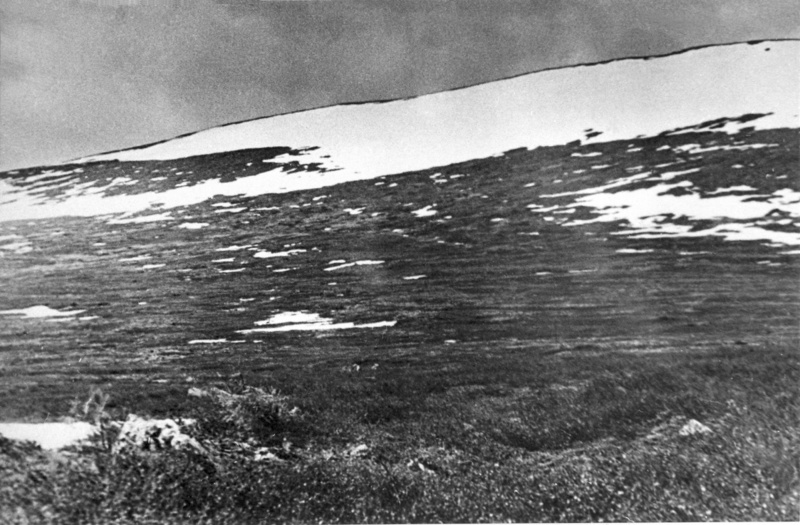 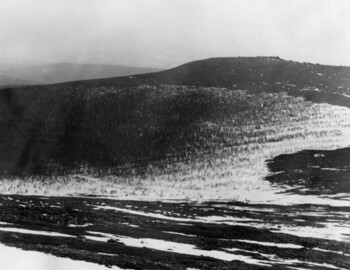 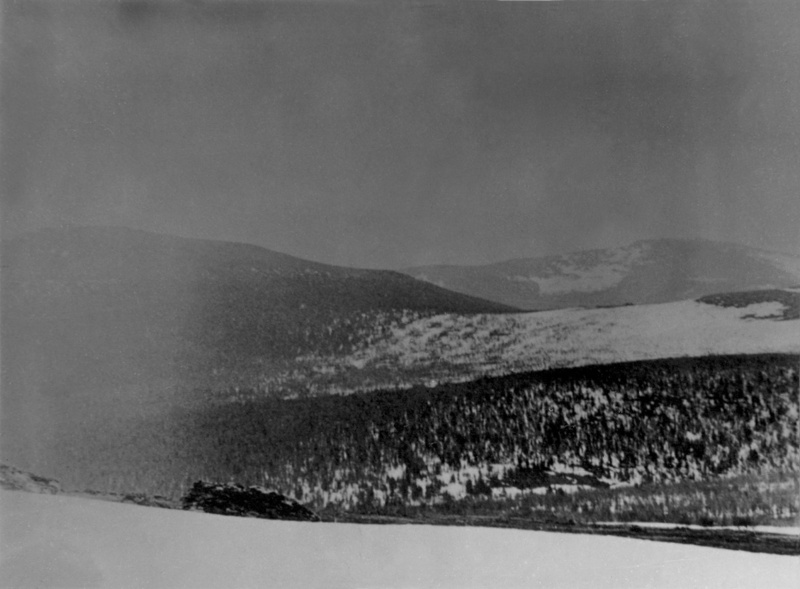 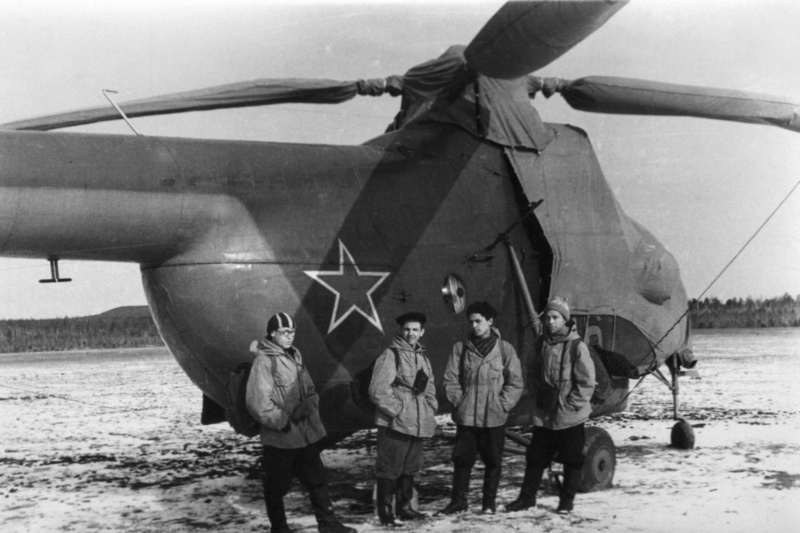 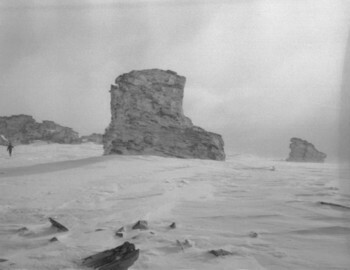 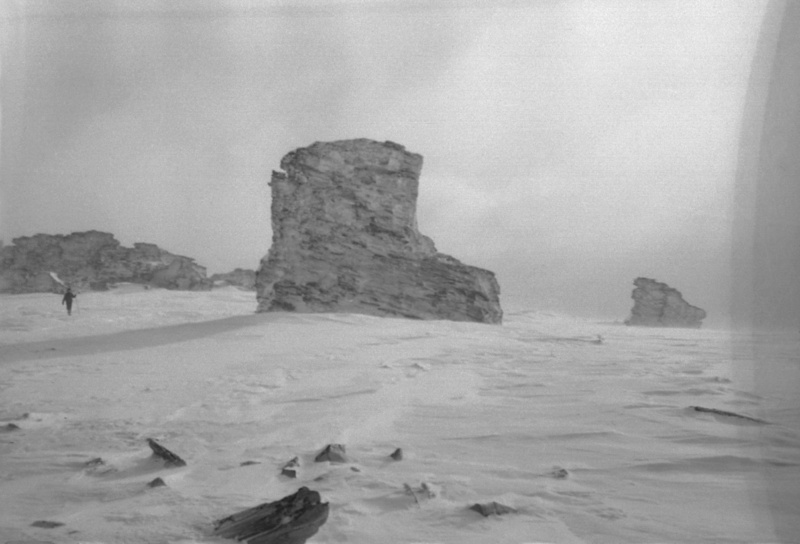 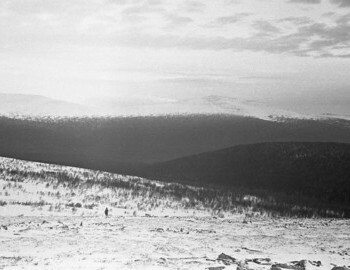 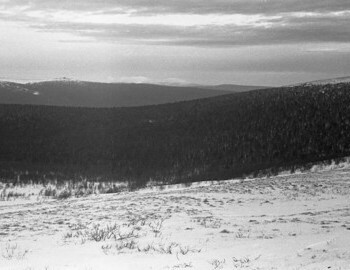 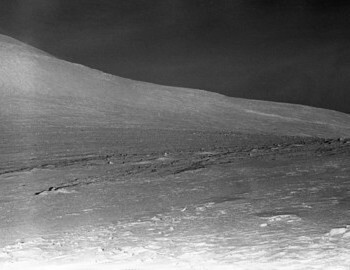 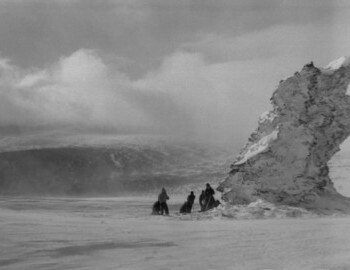 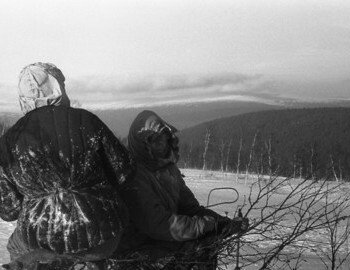 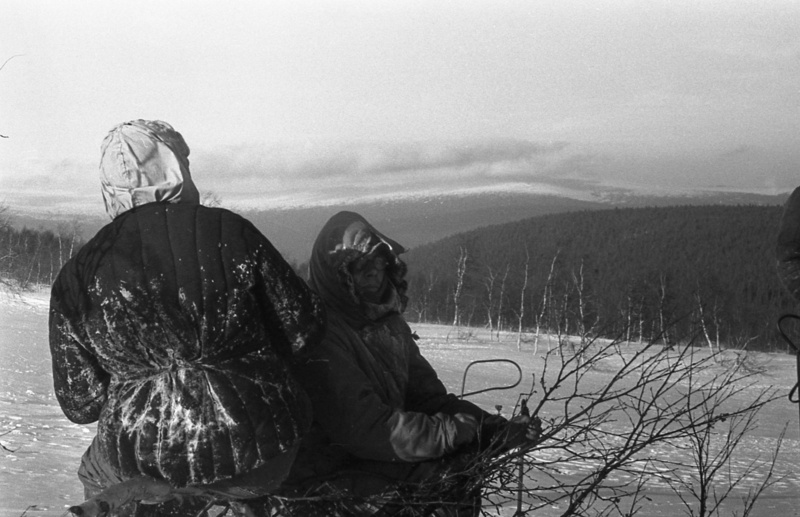 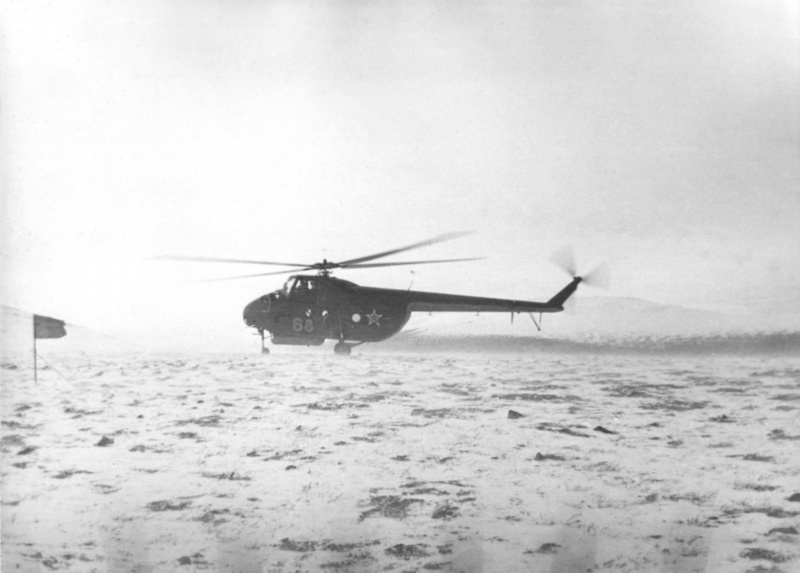 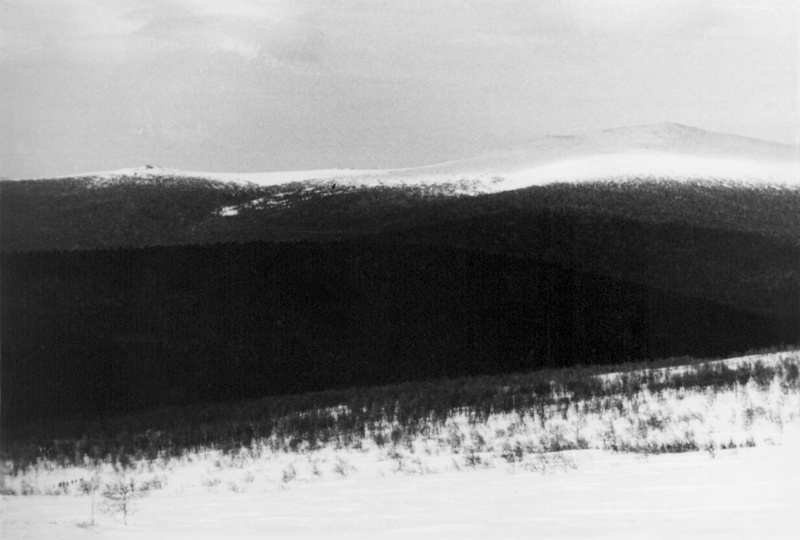 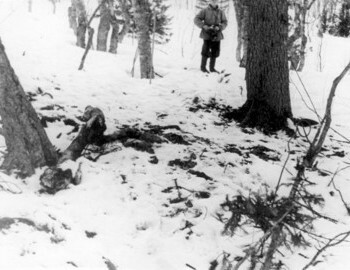 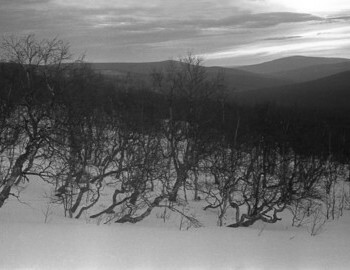 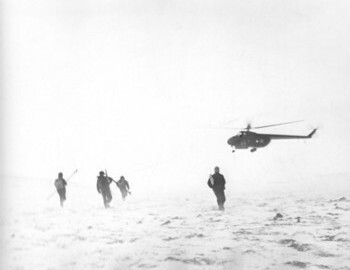 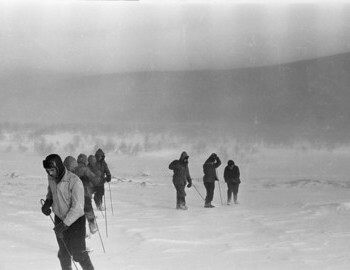 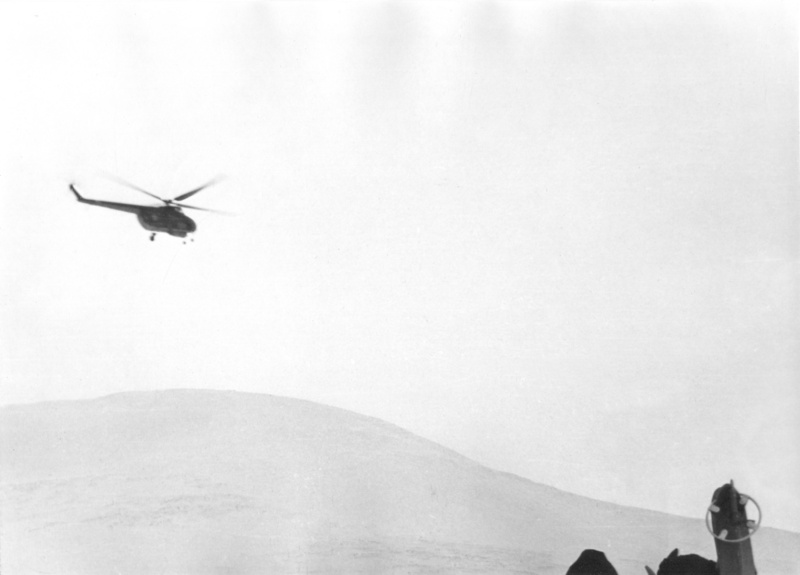 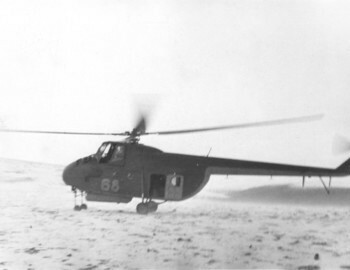 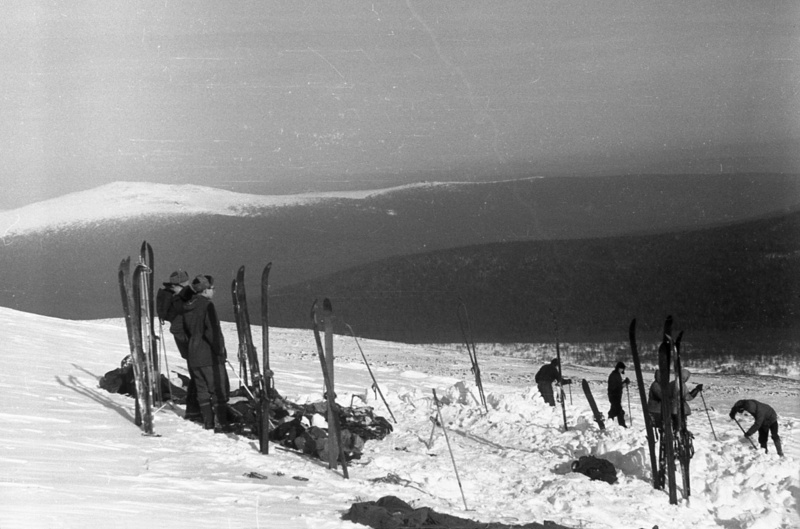 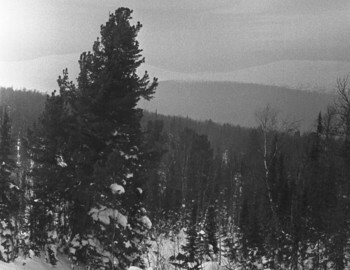 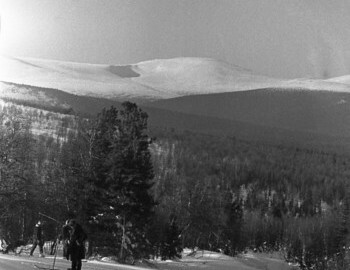 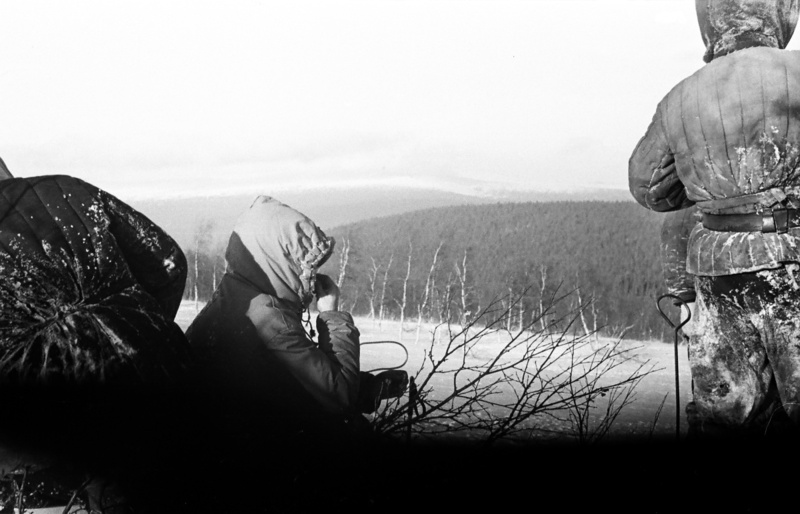 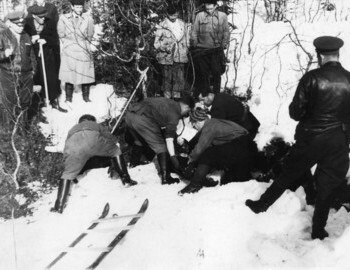 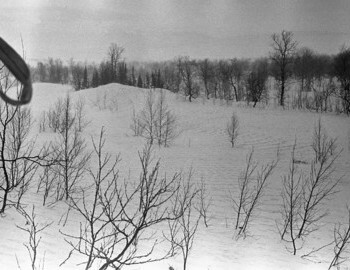 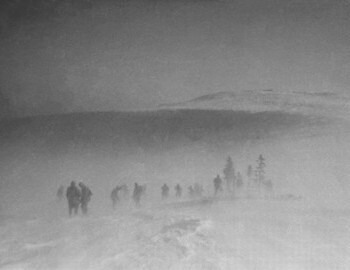 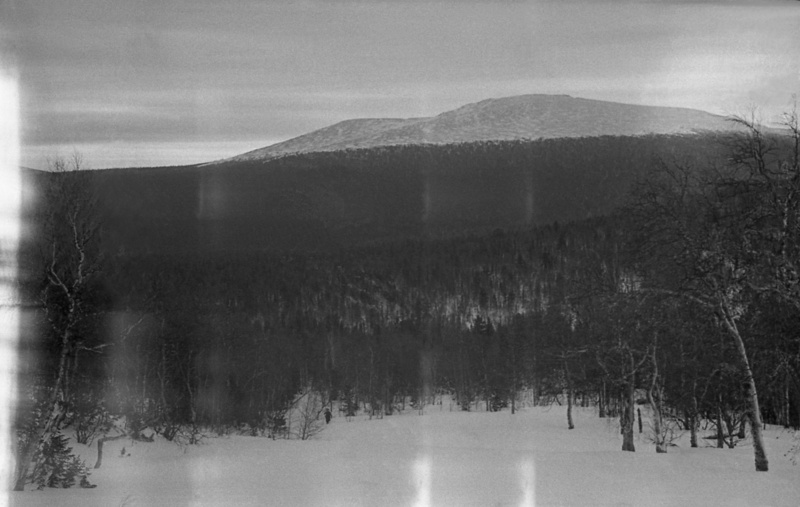 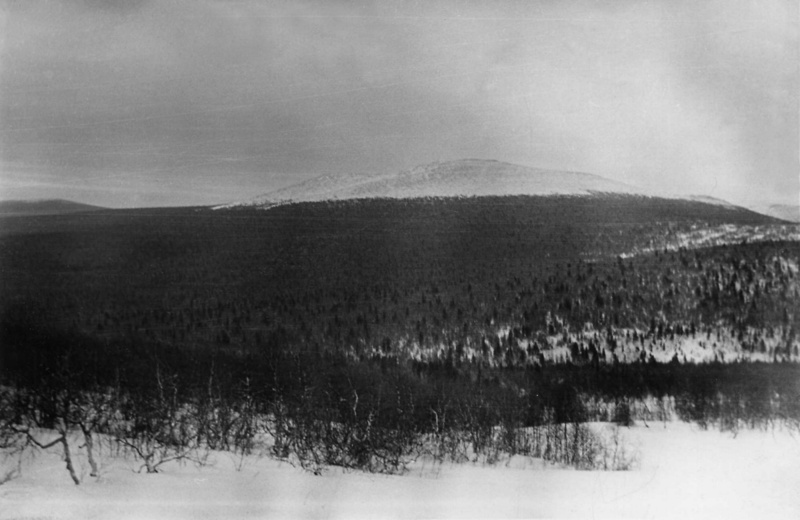 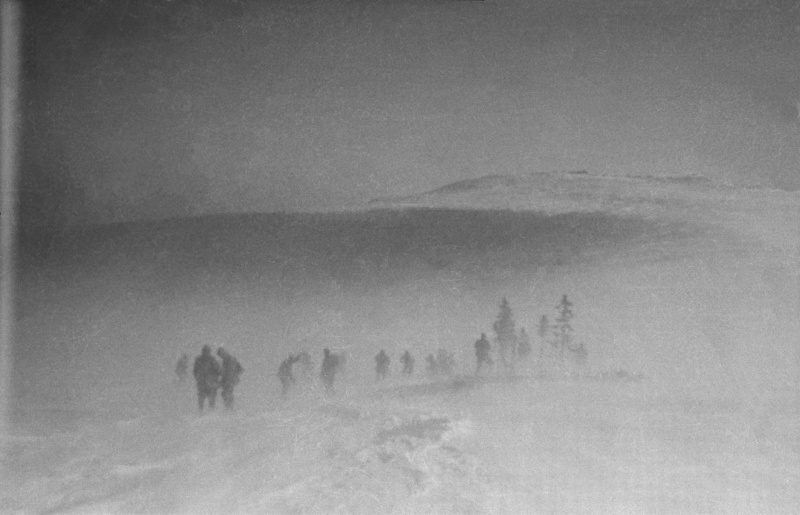 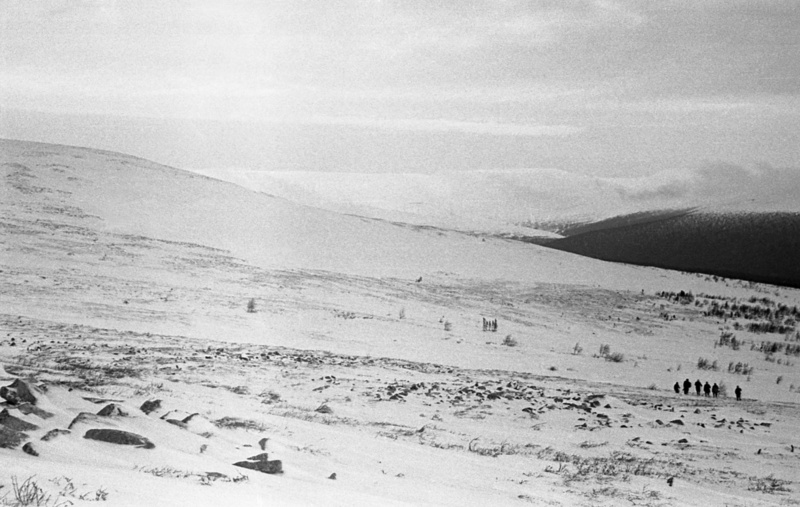 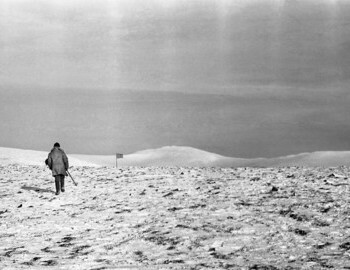 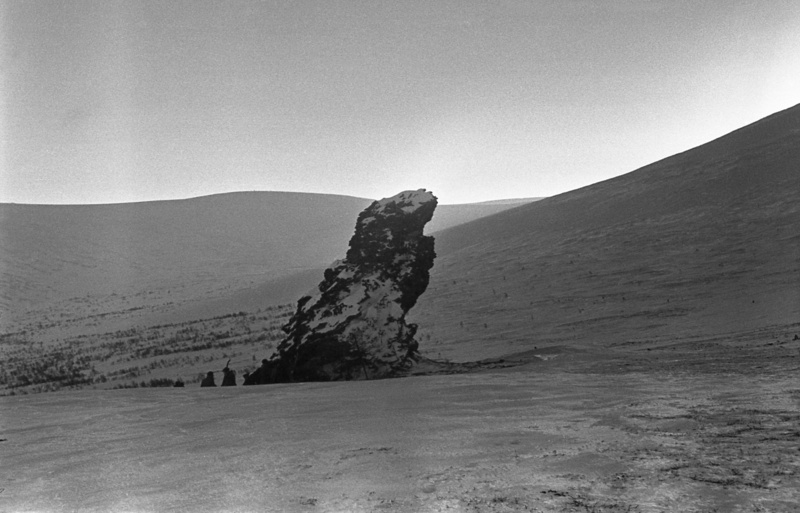 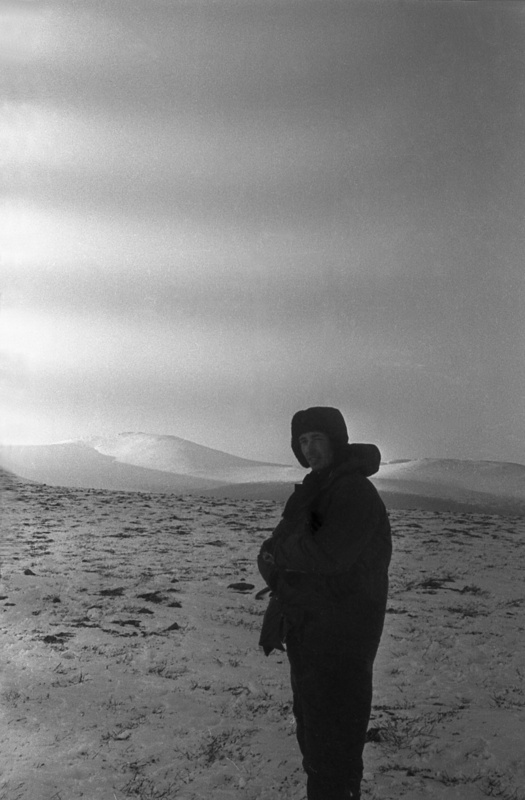 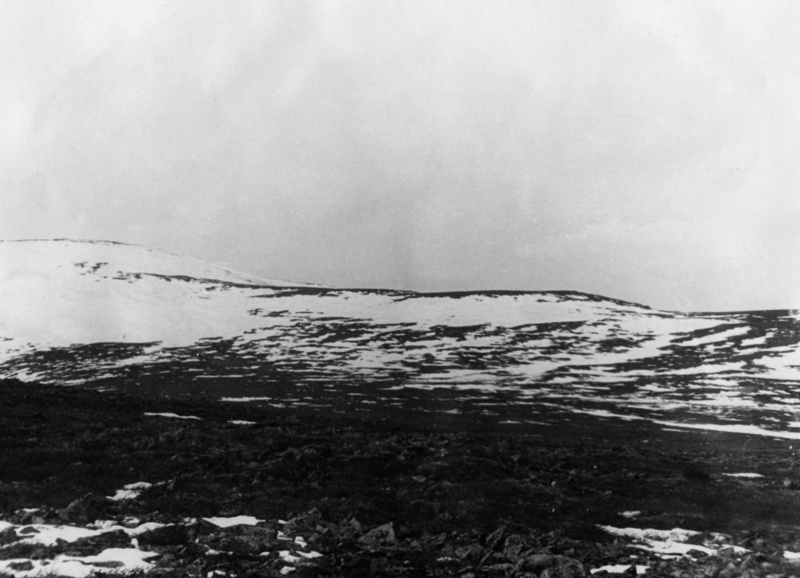 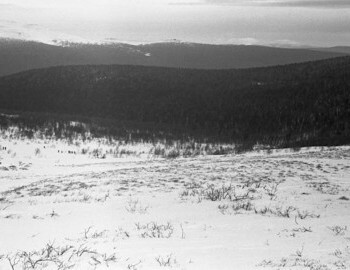 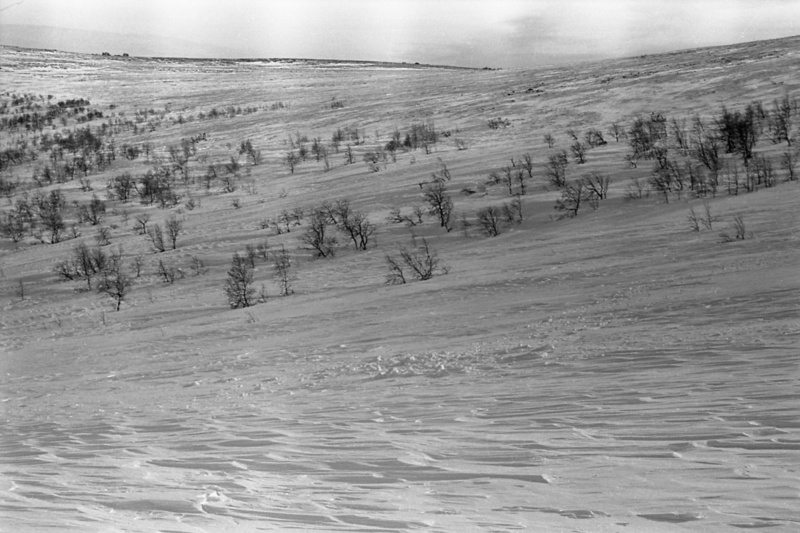 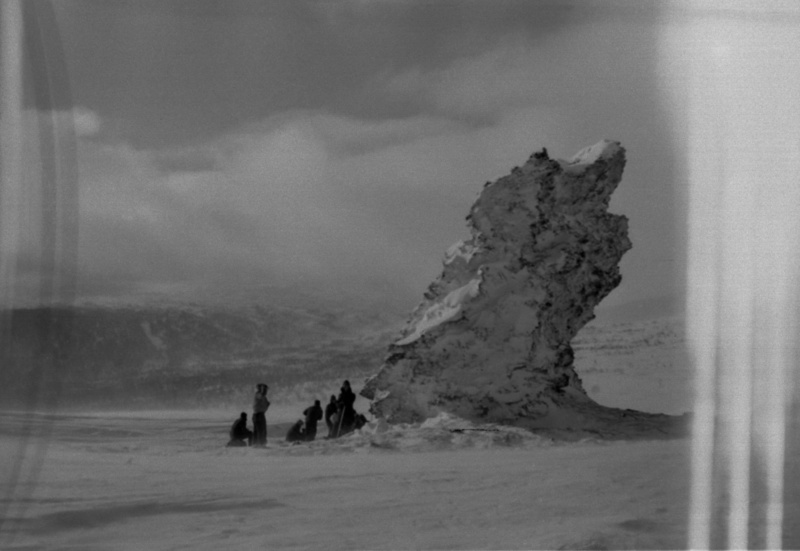 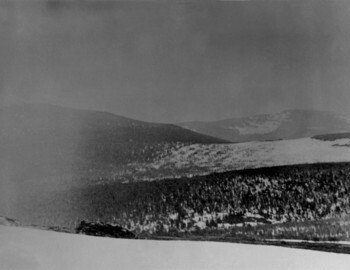 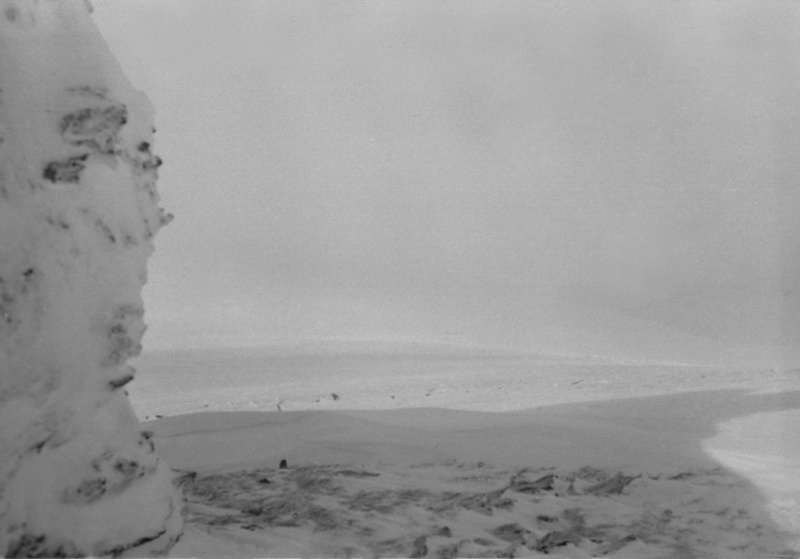 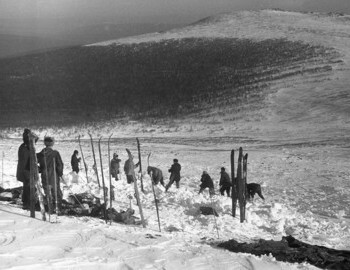 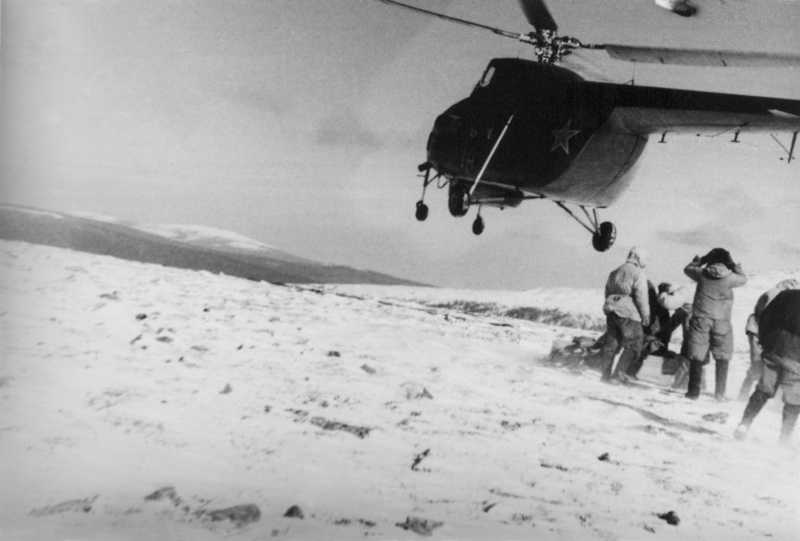 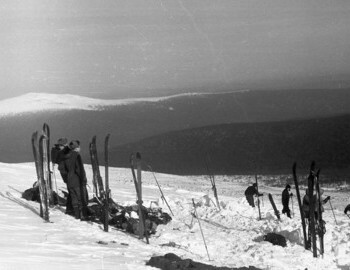 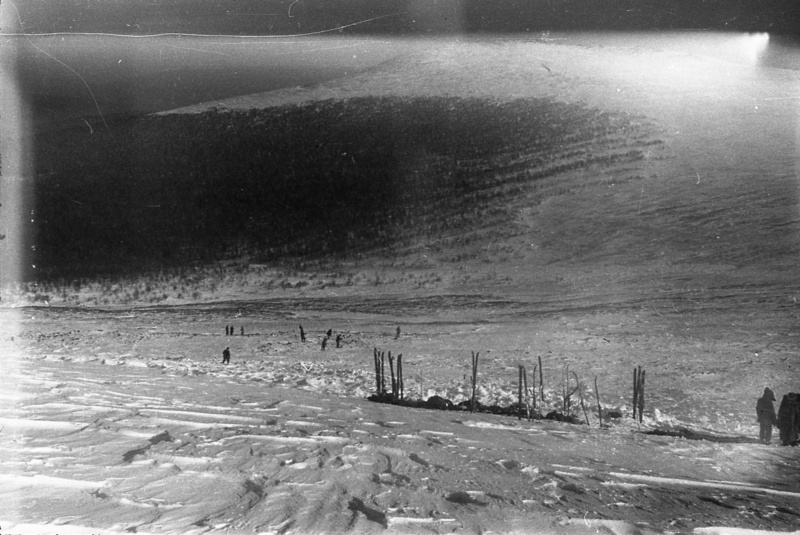 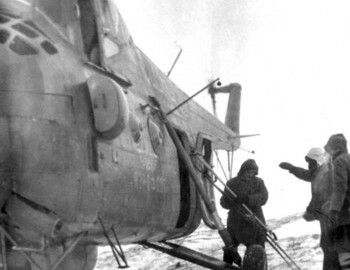 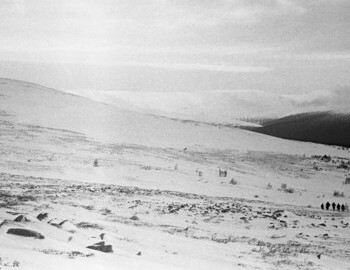 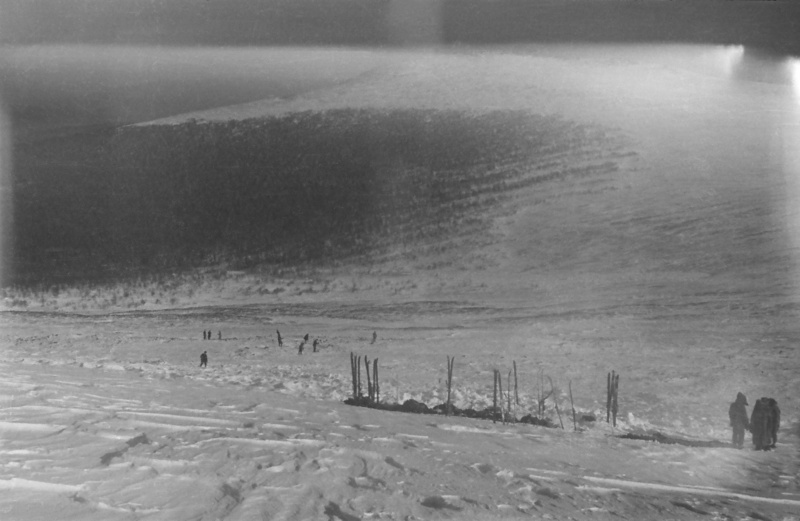 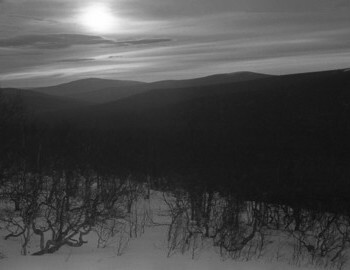 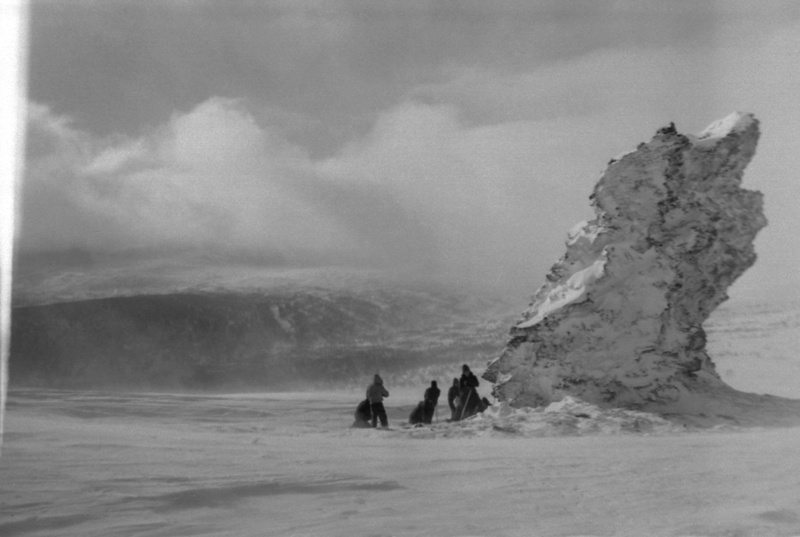 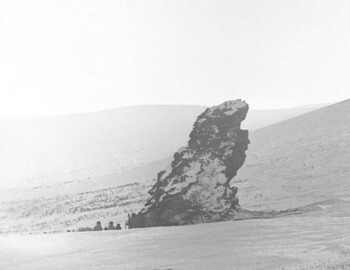 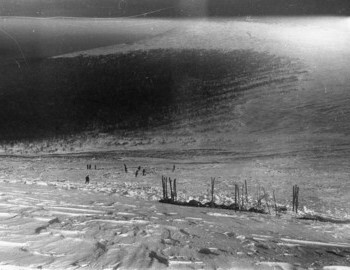 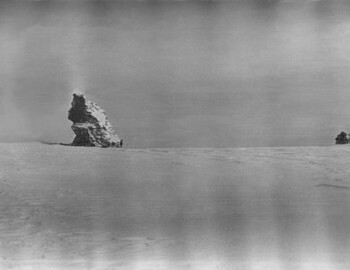 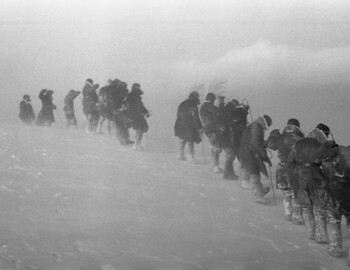 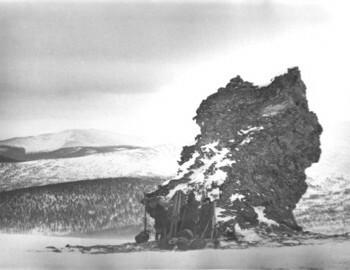 On February 23 group of Boris Slobtzov was dropped near mount Otorten, a final destination for Dyatlov. 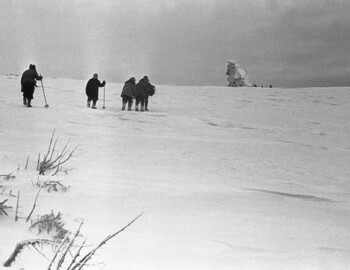 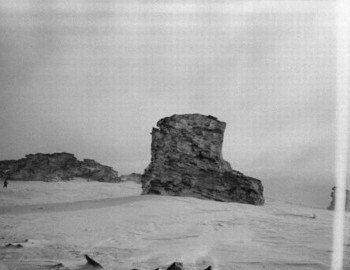 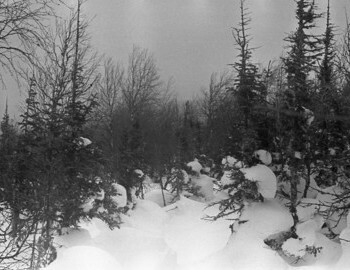 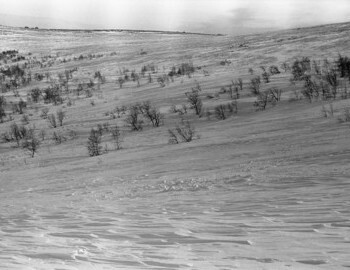 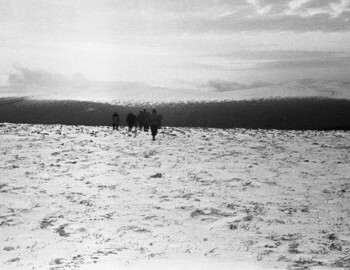 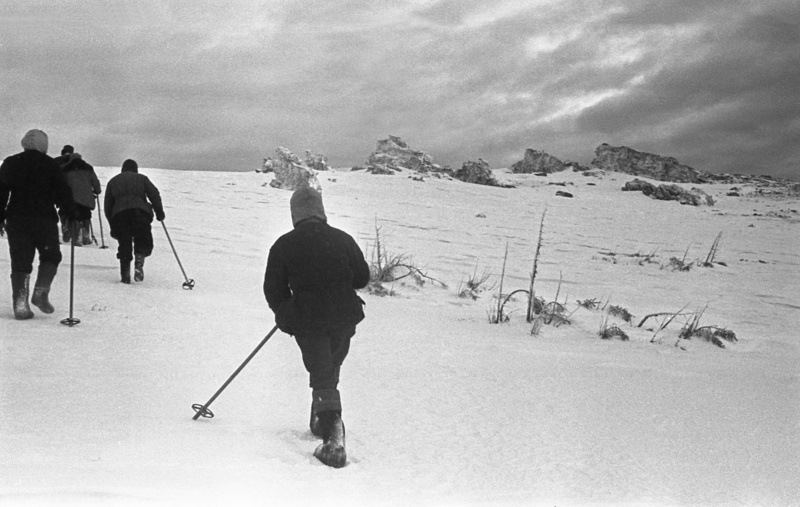 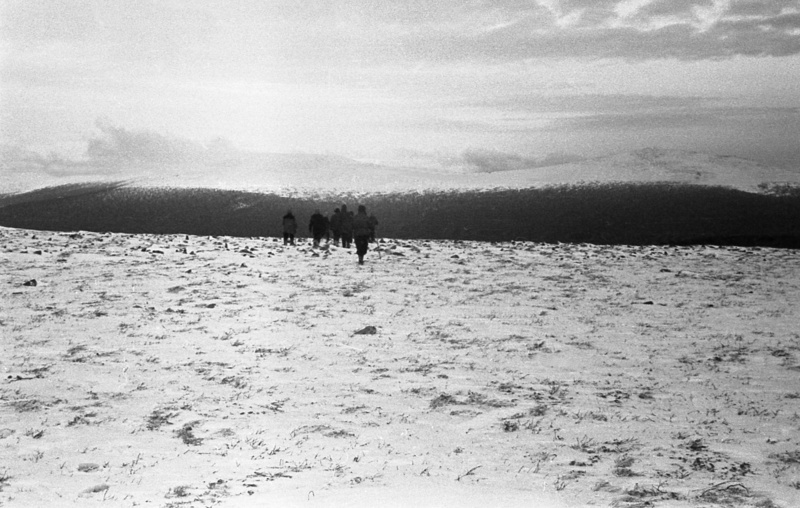 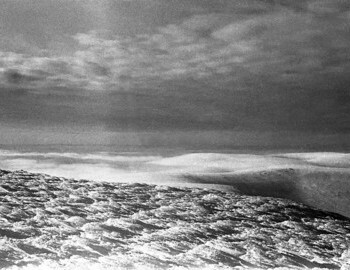 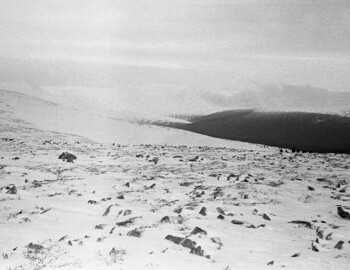 The next day on February 24th they reached the mountain and came to conclusion that hikers never made it this far. 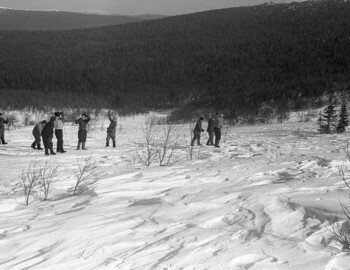 Students did not find any records, flags or anything else that would indicate recent visit of the group. 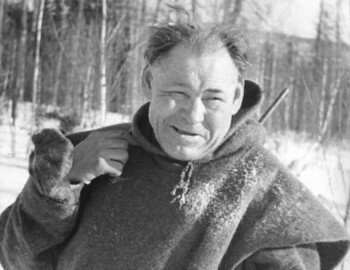 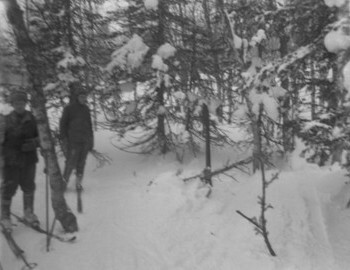 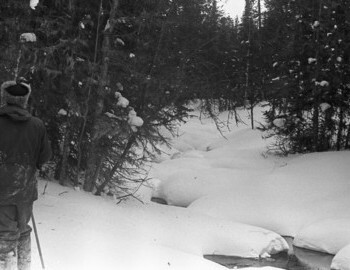 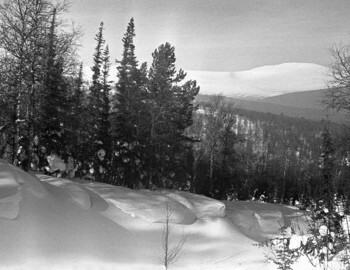 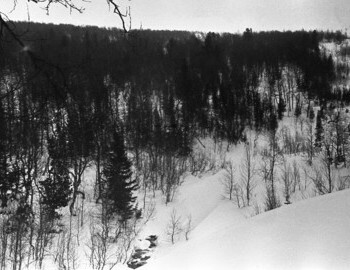 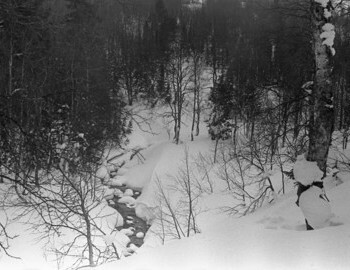 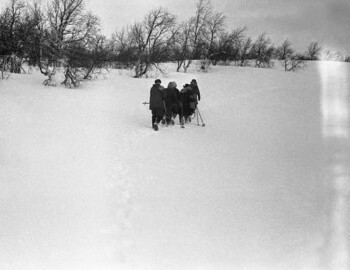 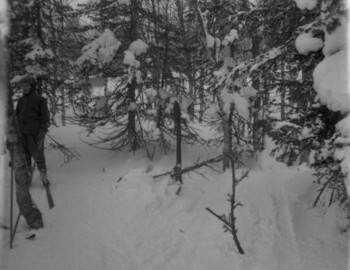 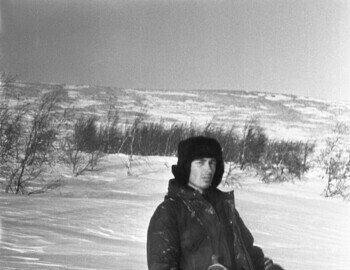 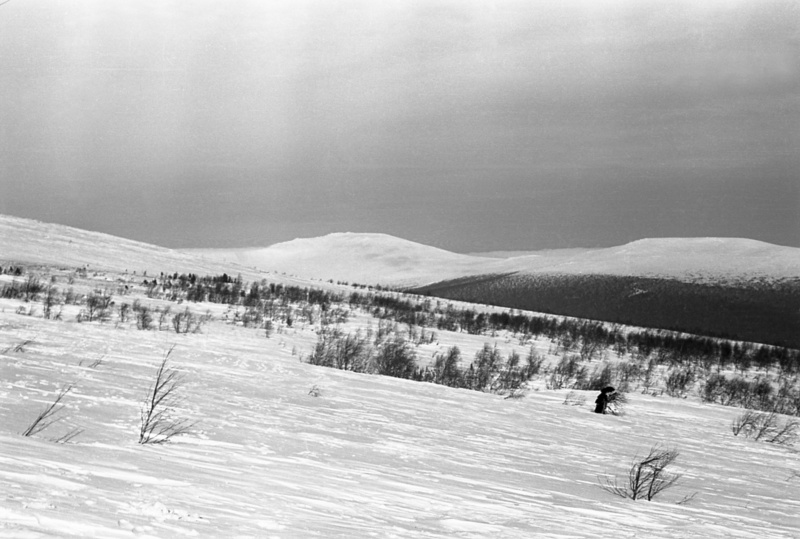 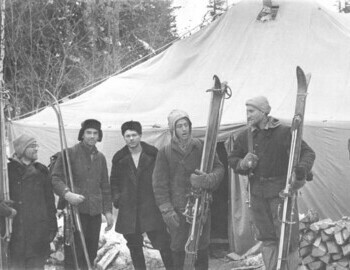 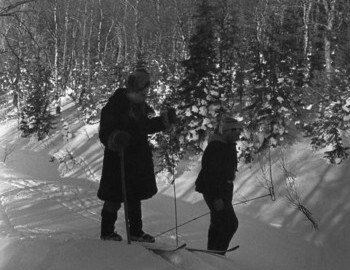 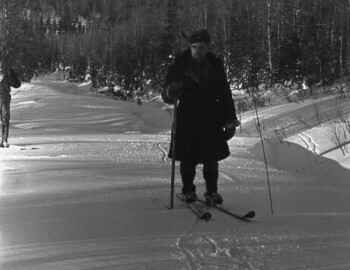 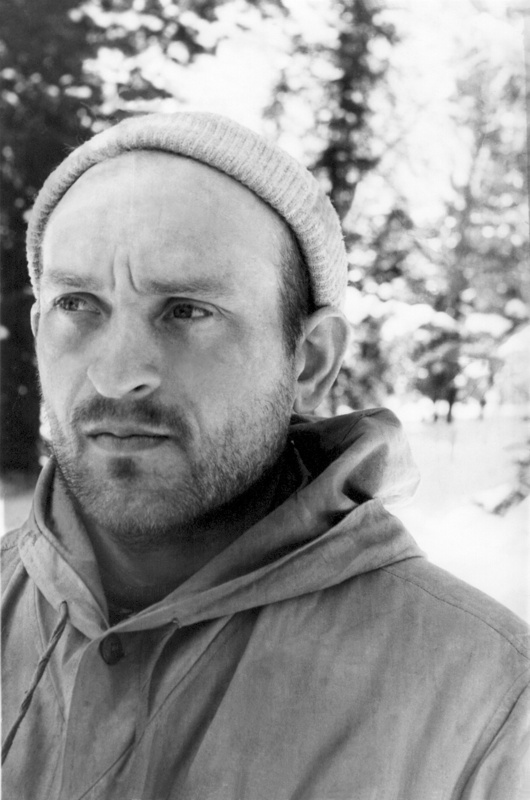 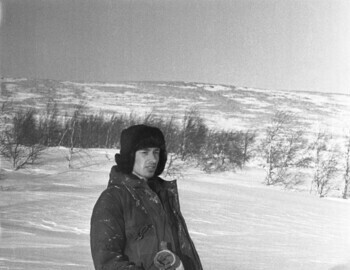 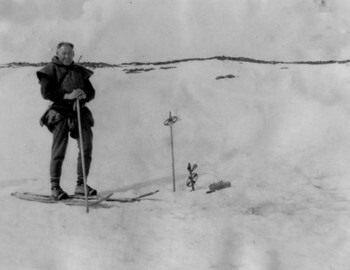 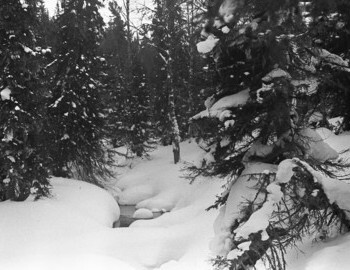 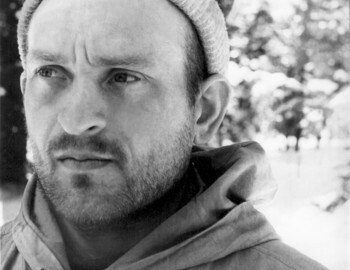 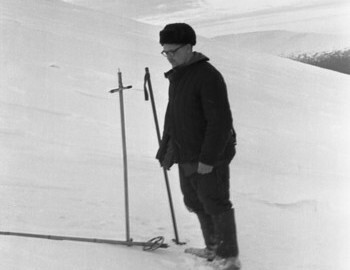 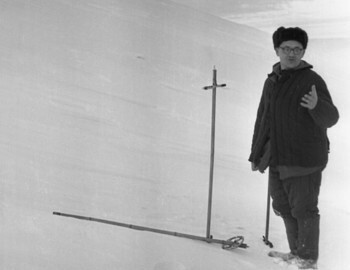 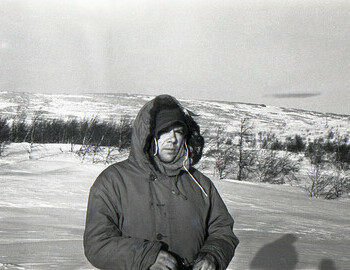 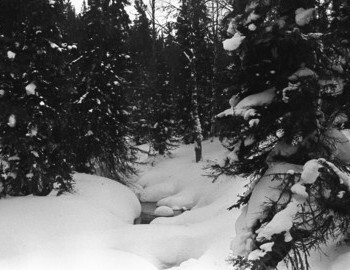 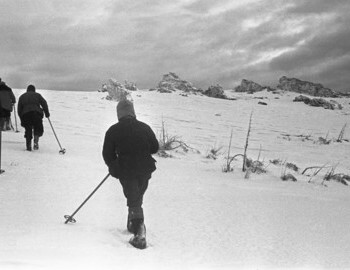 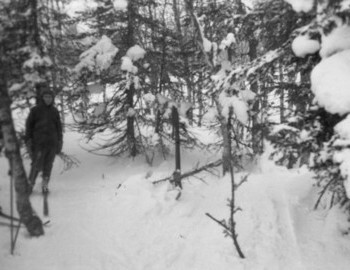 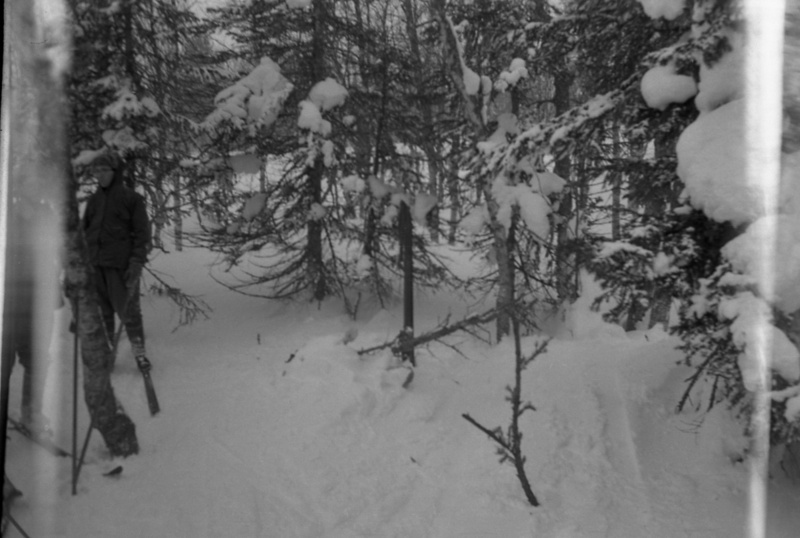 On February 25 Boris Slobtzov and his group finally discovered the trail of skis that he assumed to be that of Dyatlov. 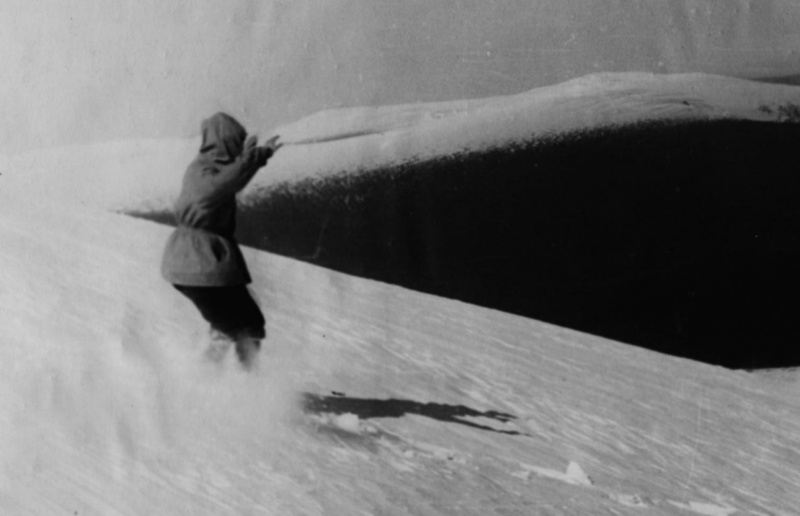 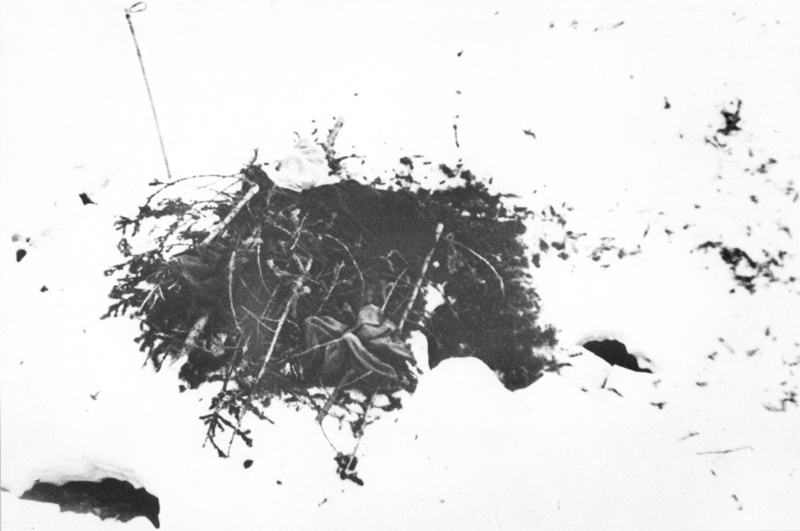 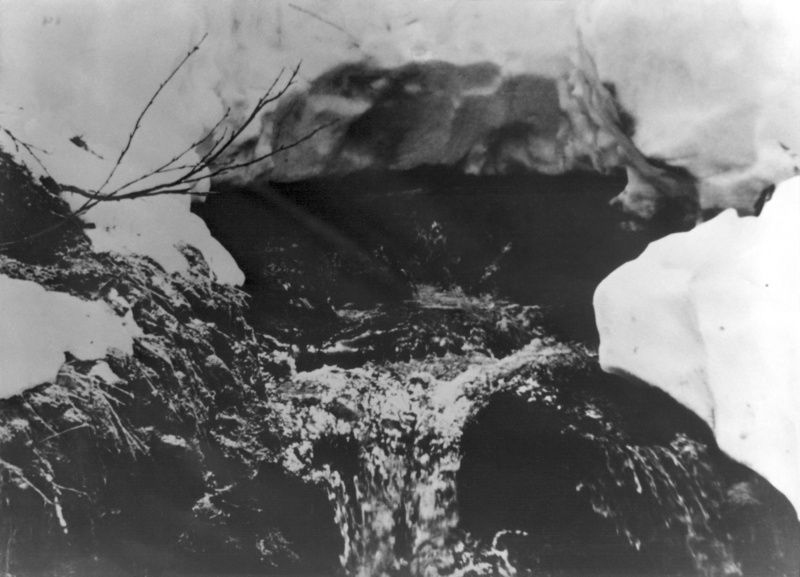 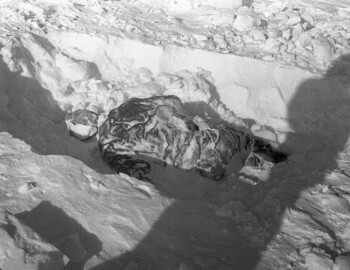 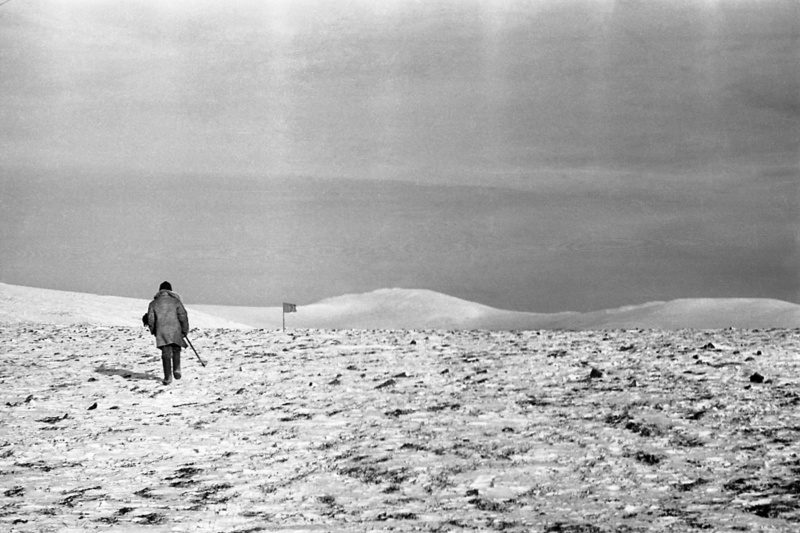 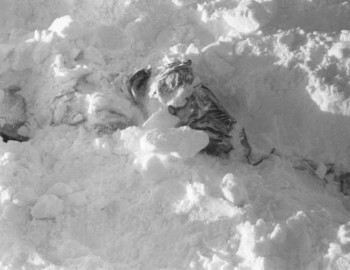 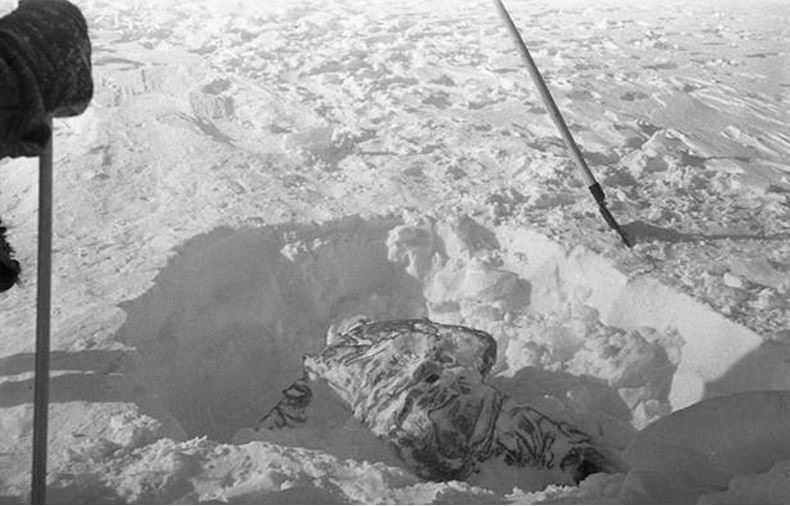 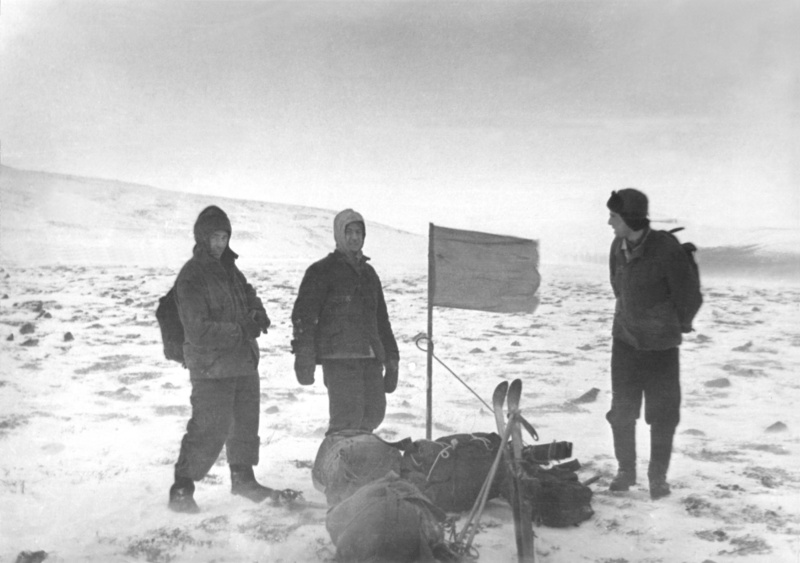 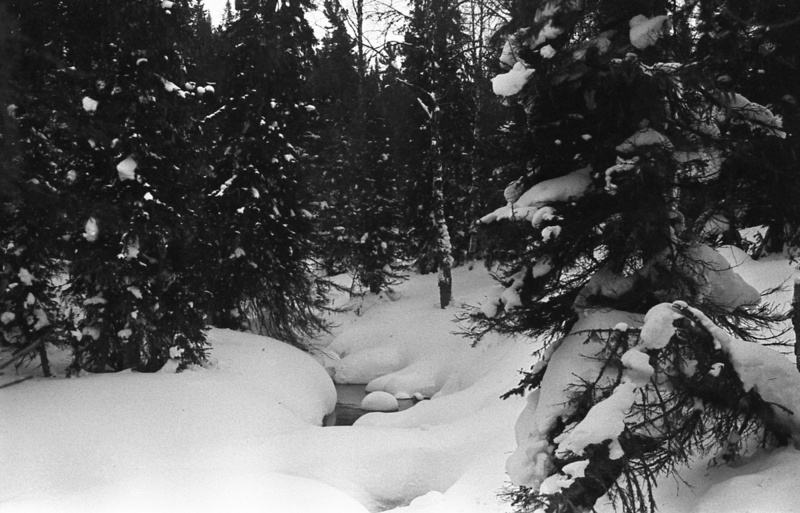 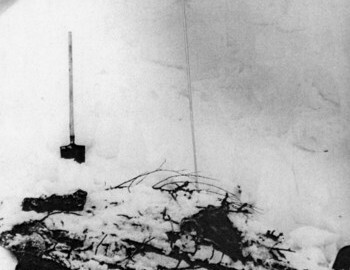 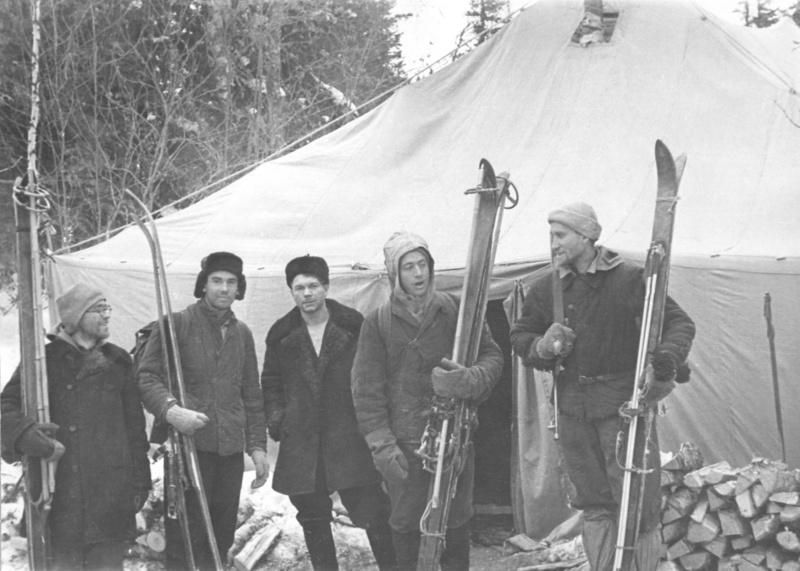 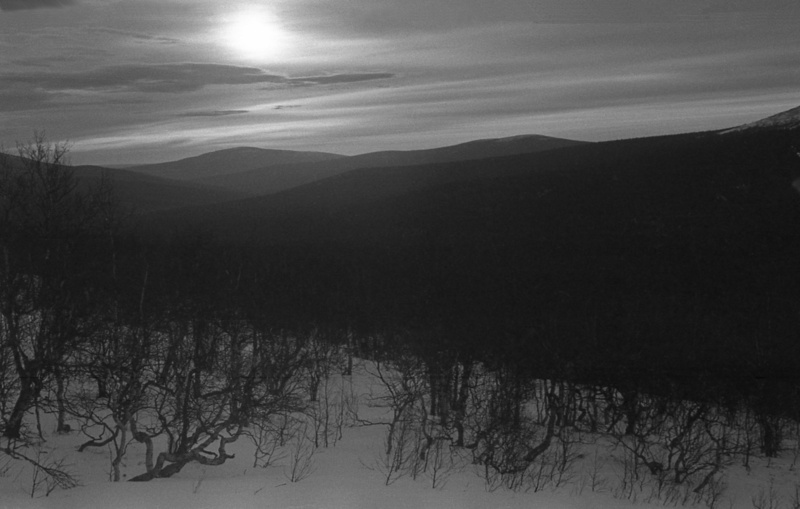 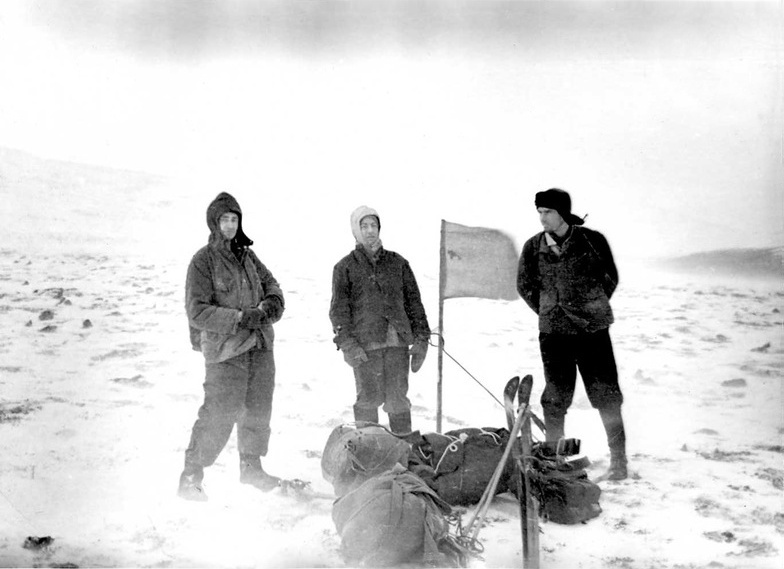 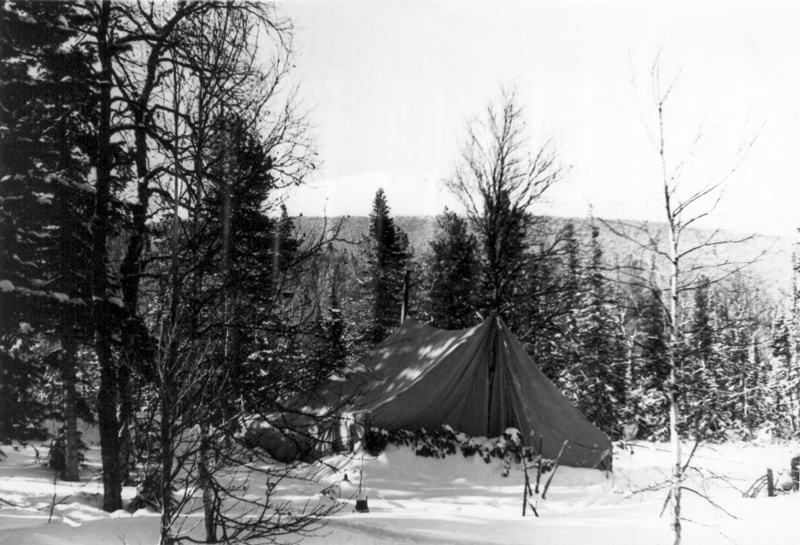 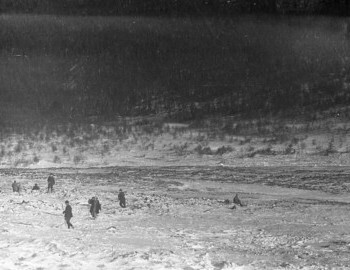 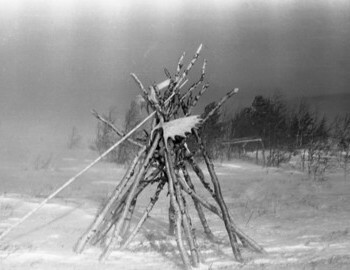 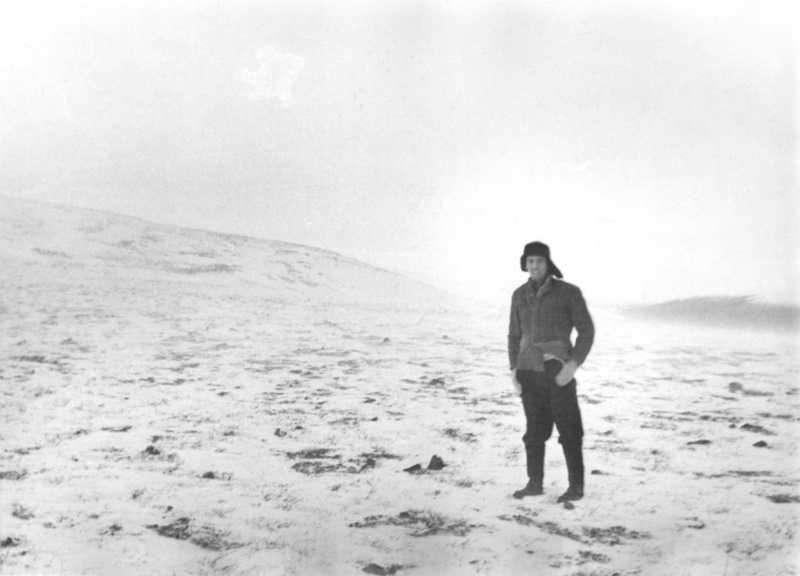 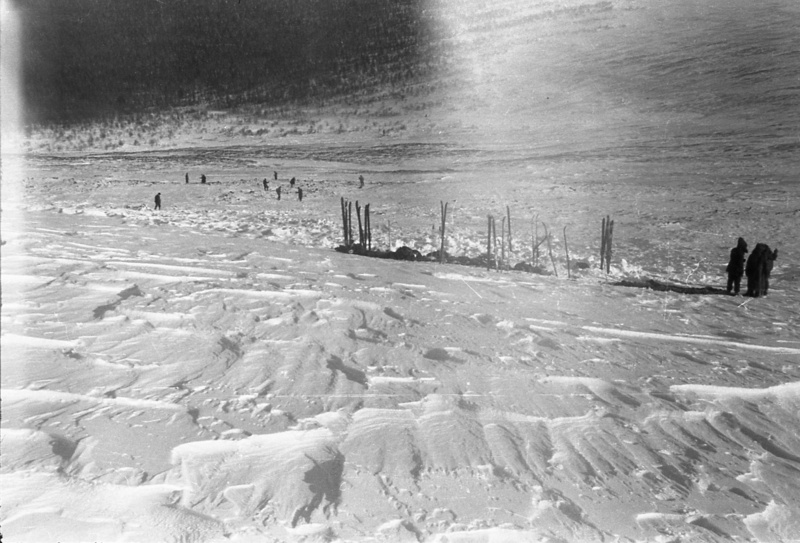 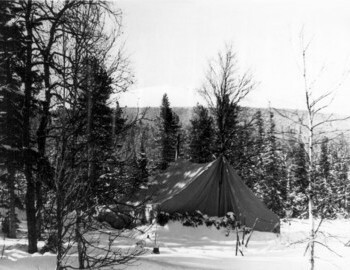 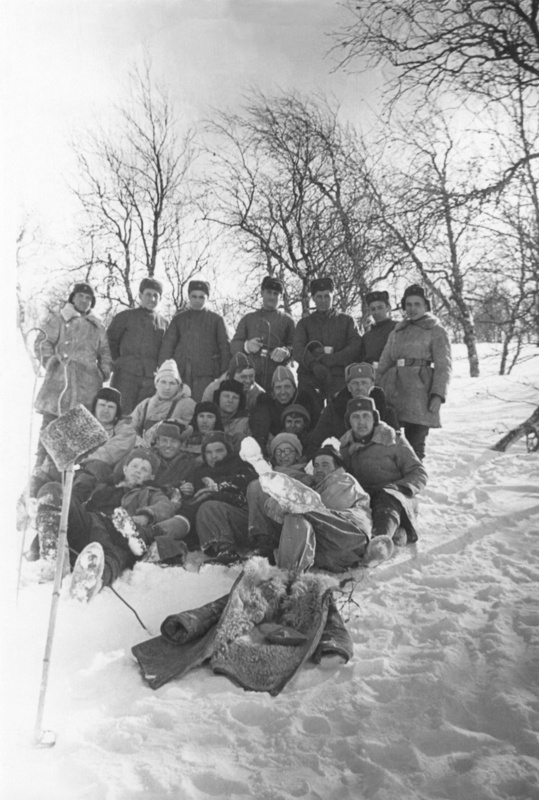 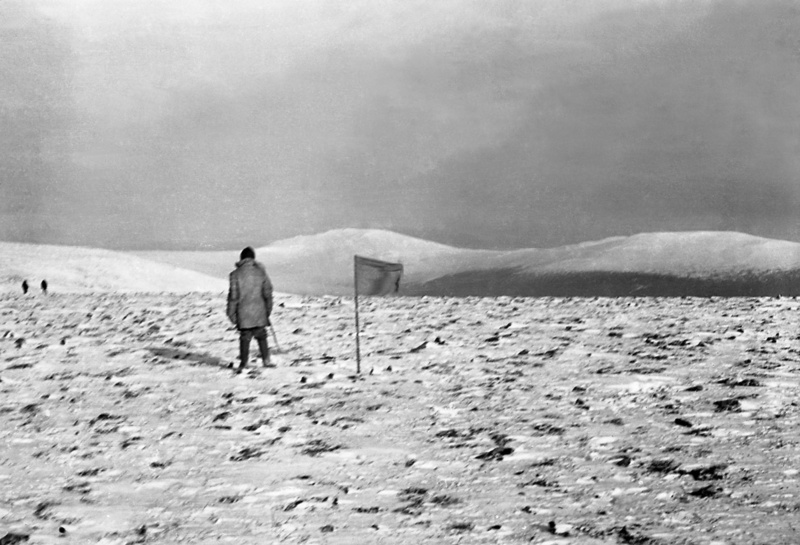 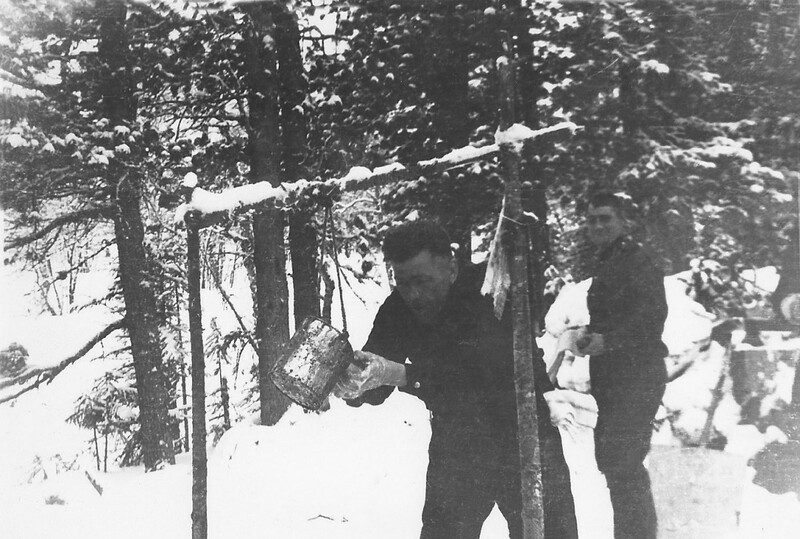 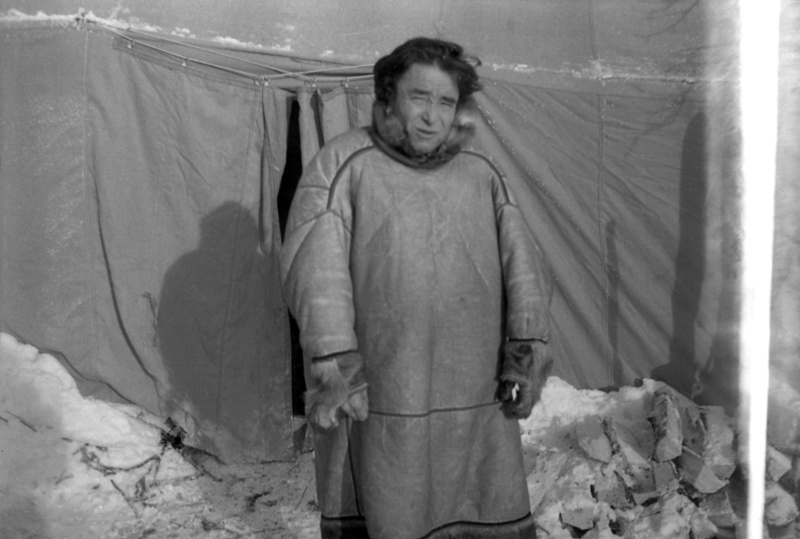 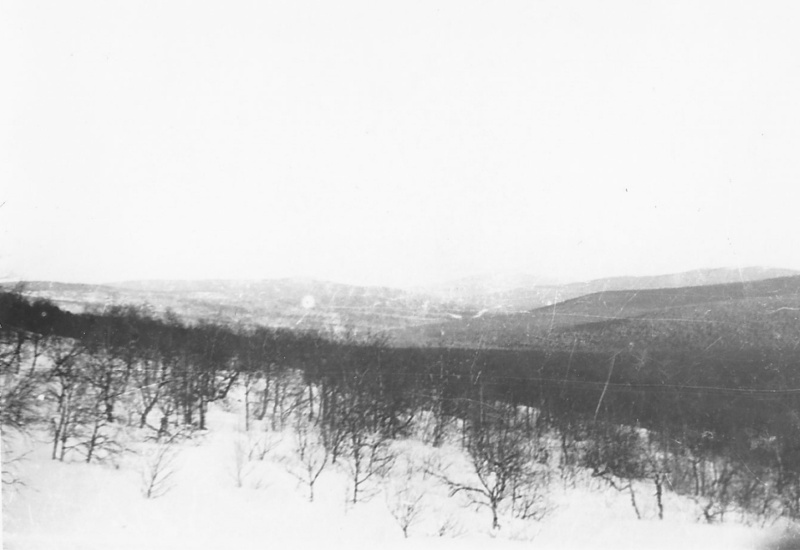 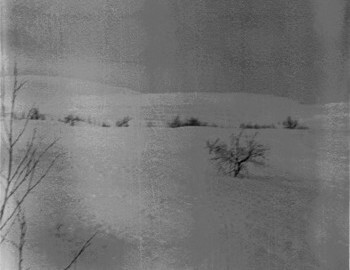 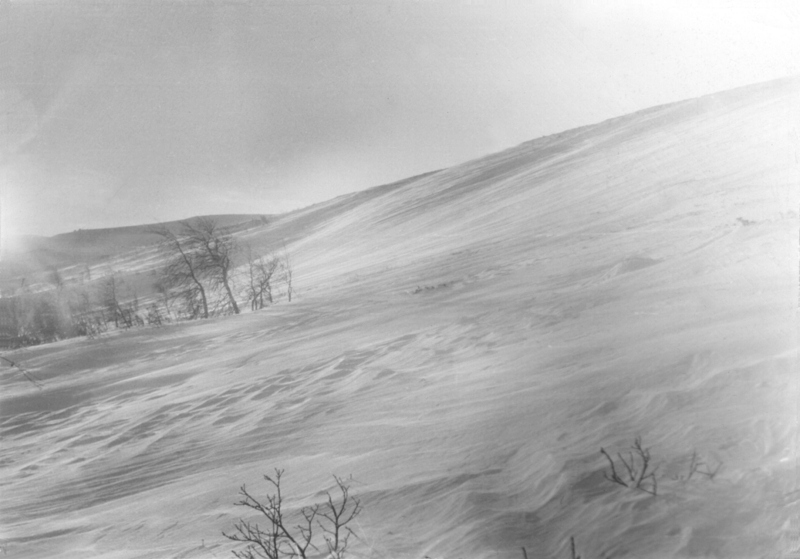 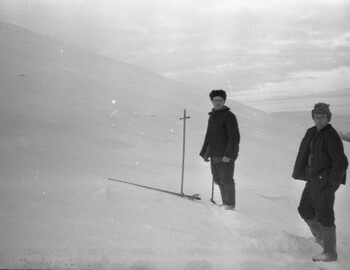 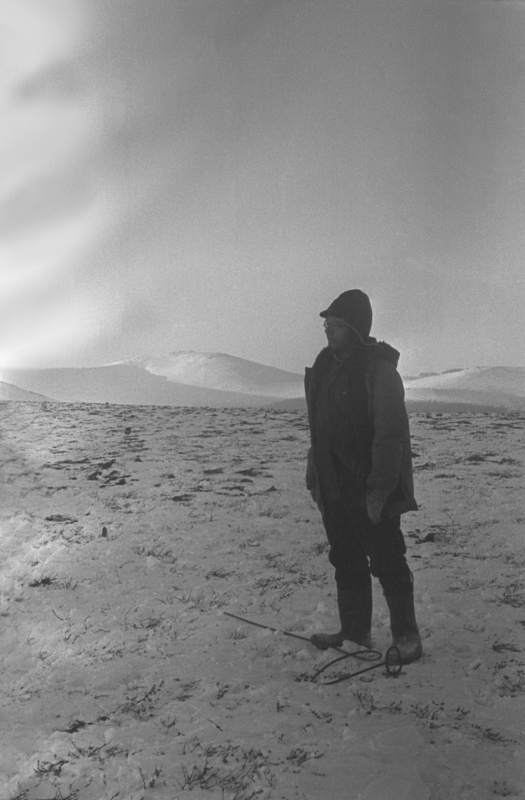 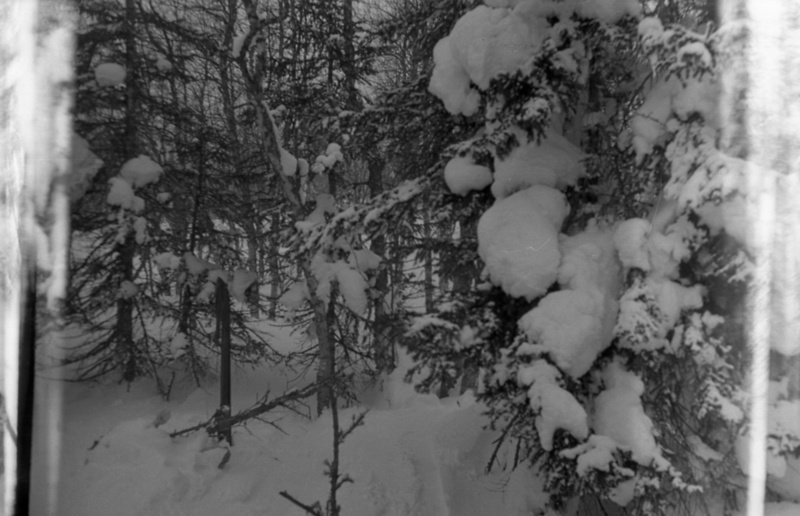 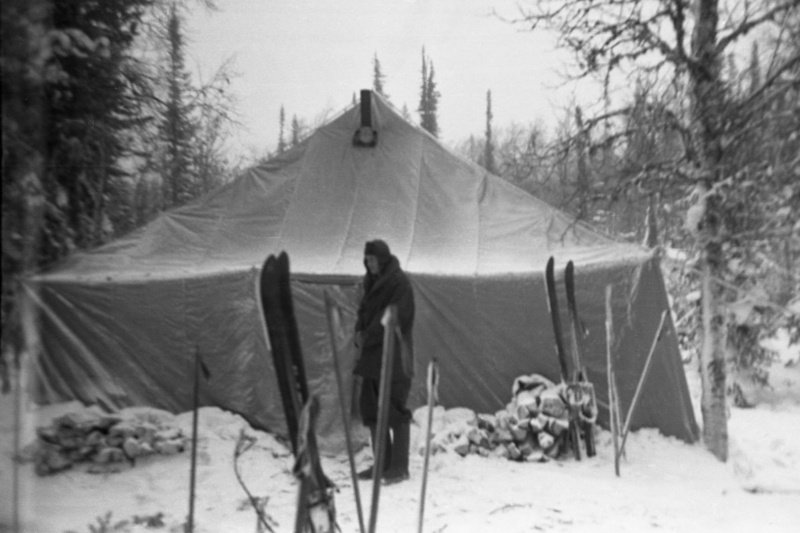 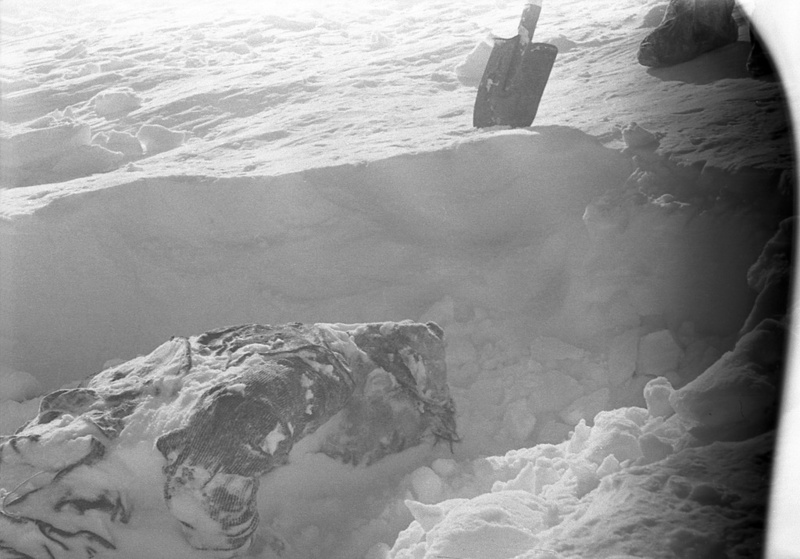 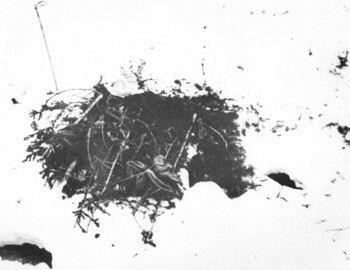 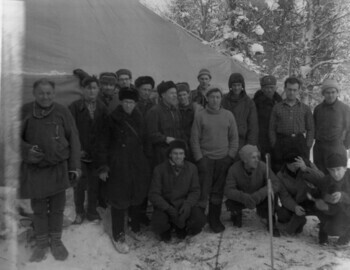 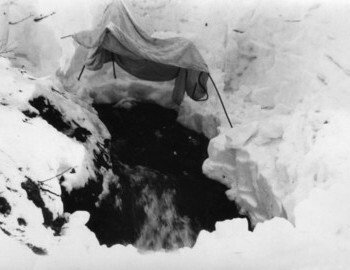 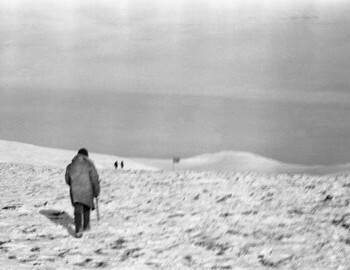 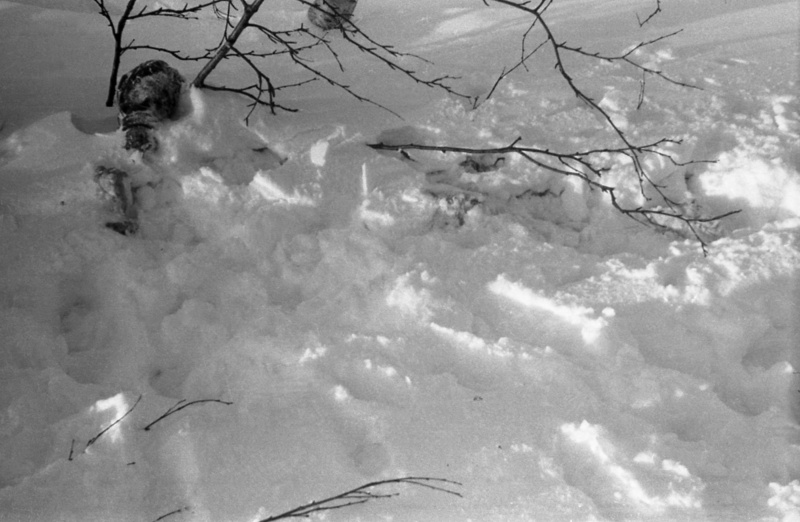 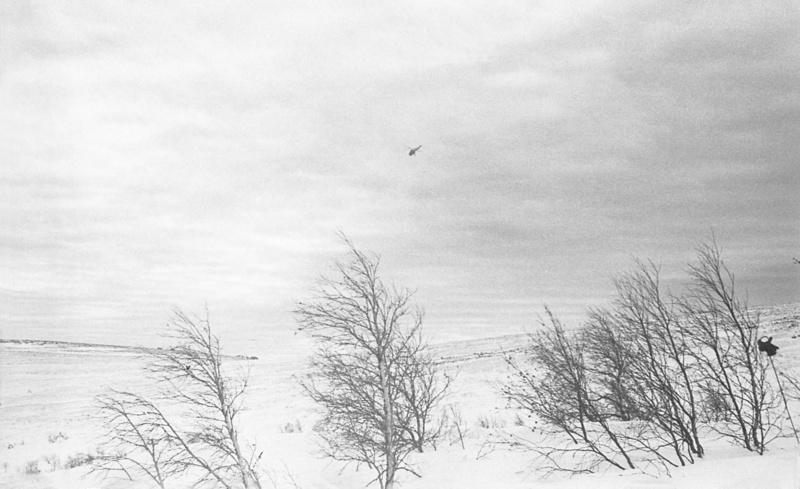 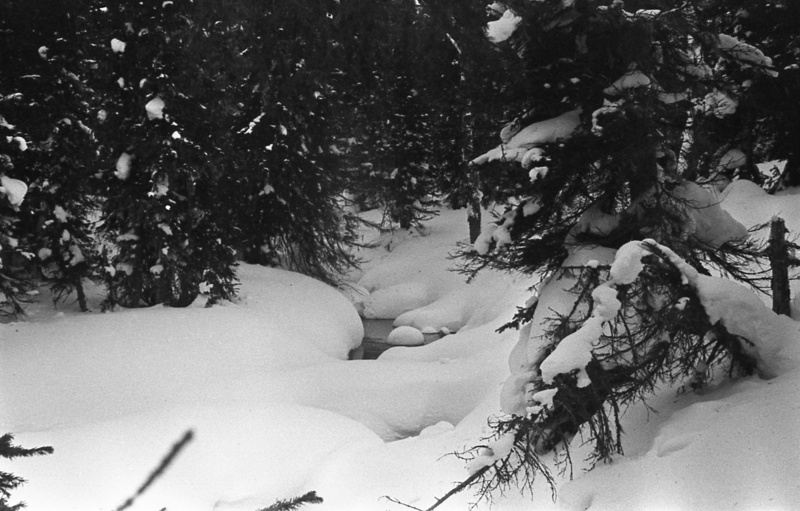 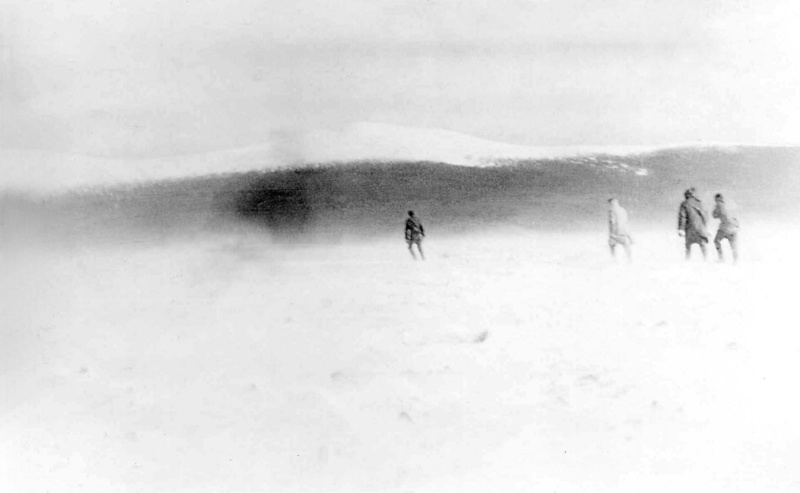 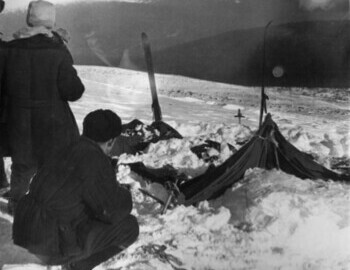 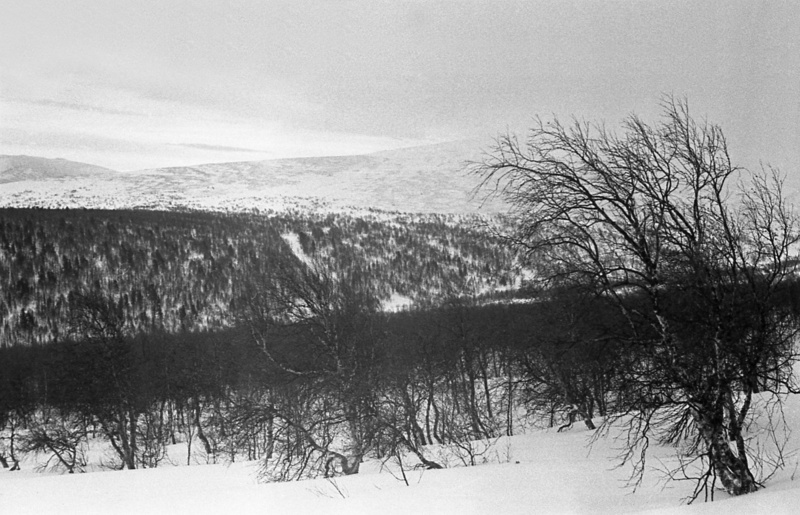 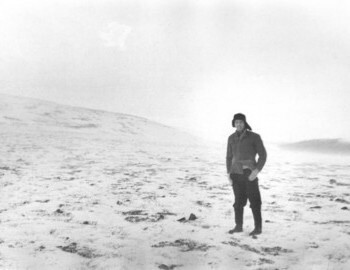 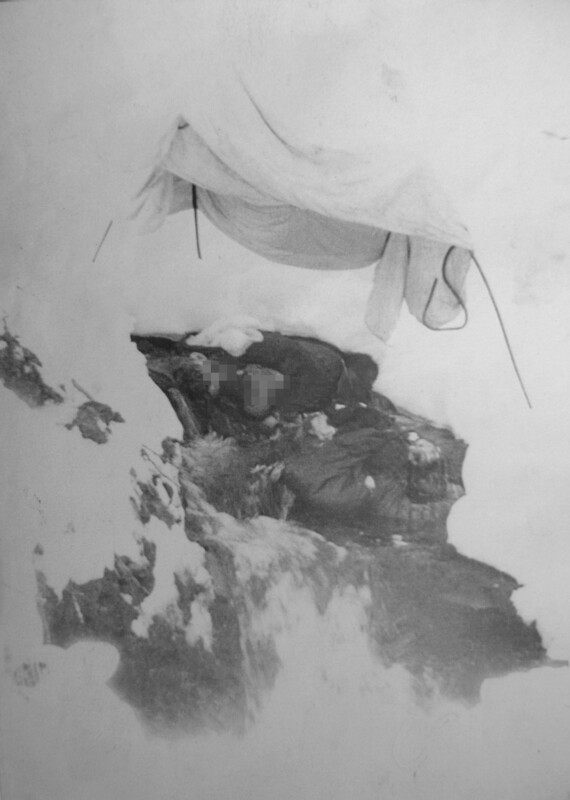 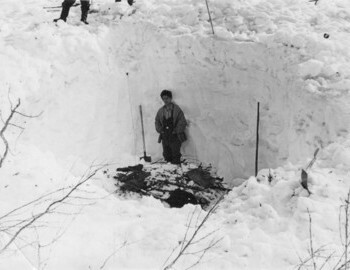 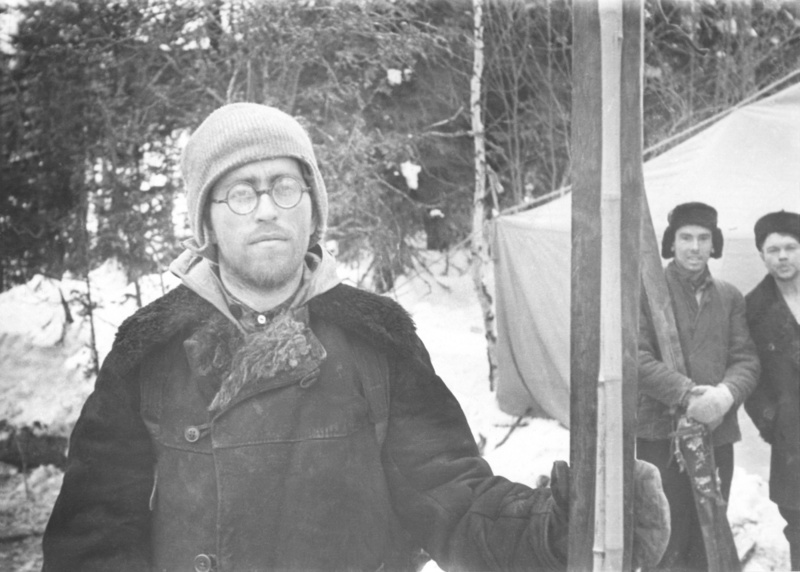 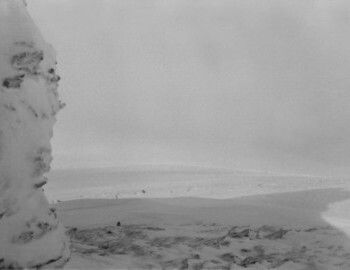 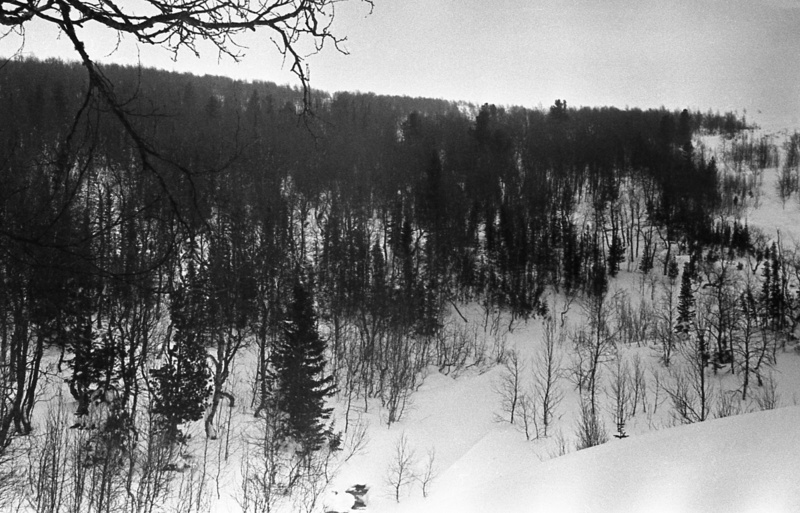 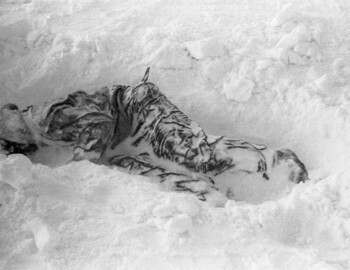 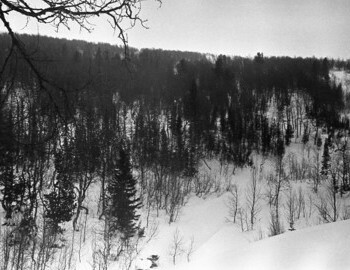 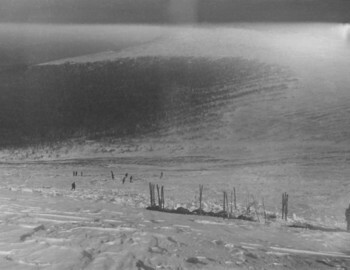 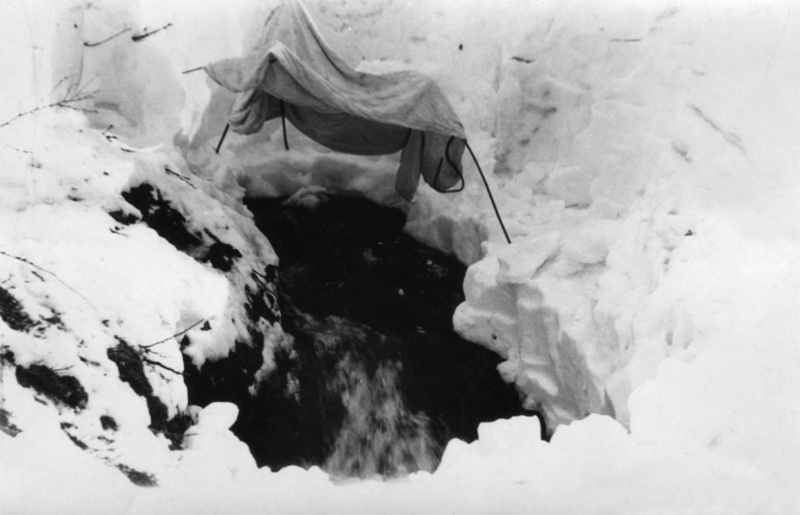 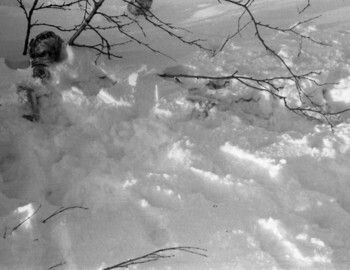 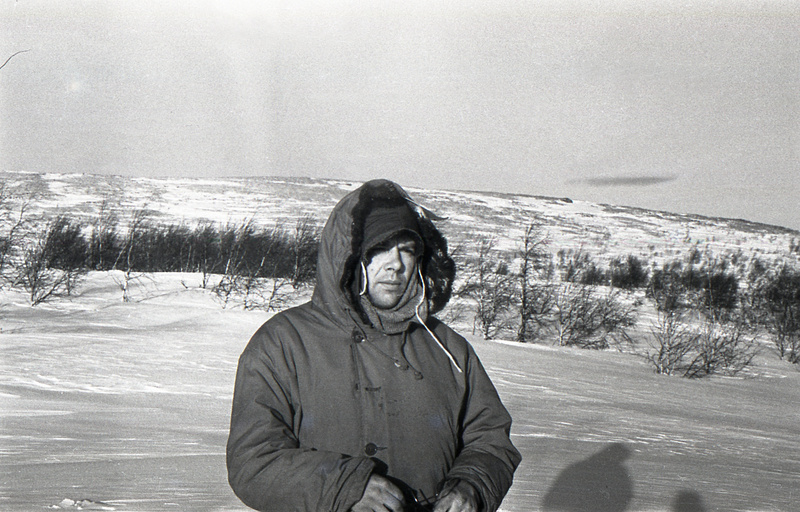 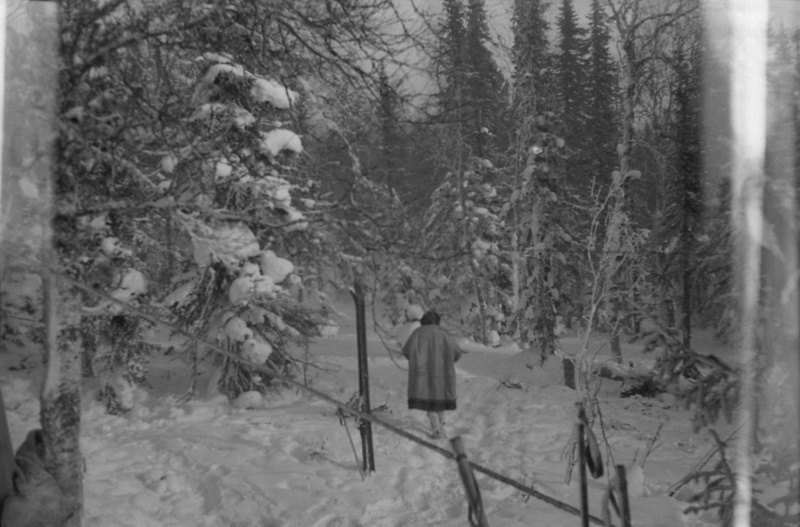 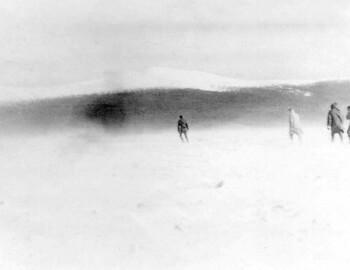 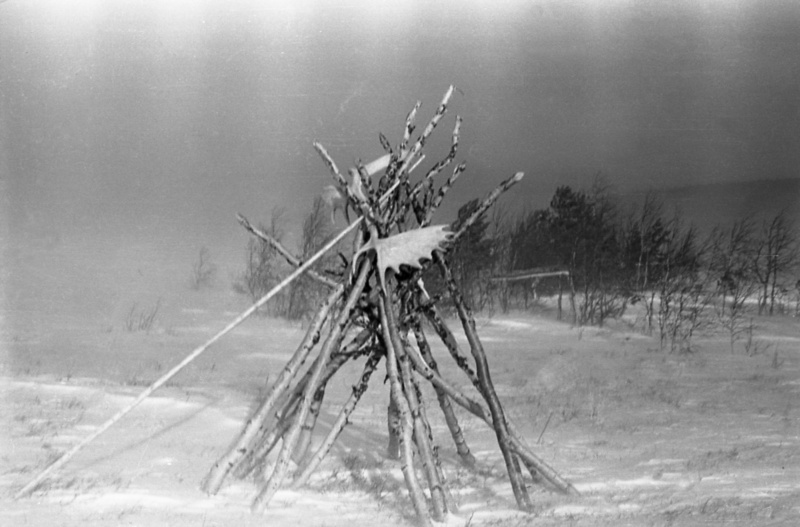 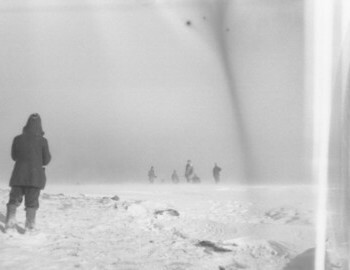 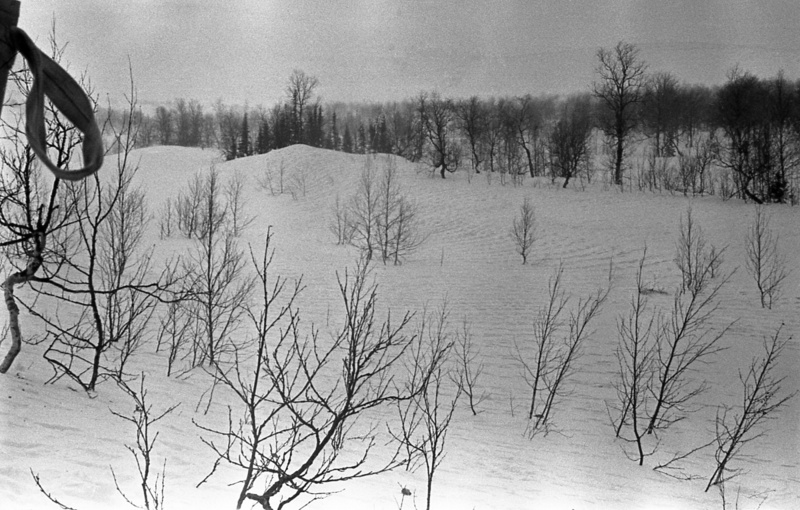 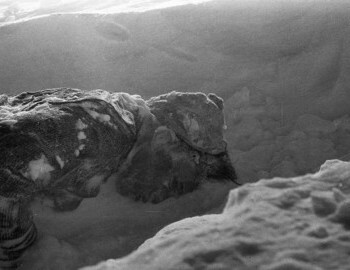 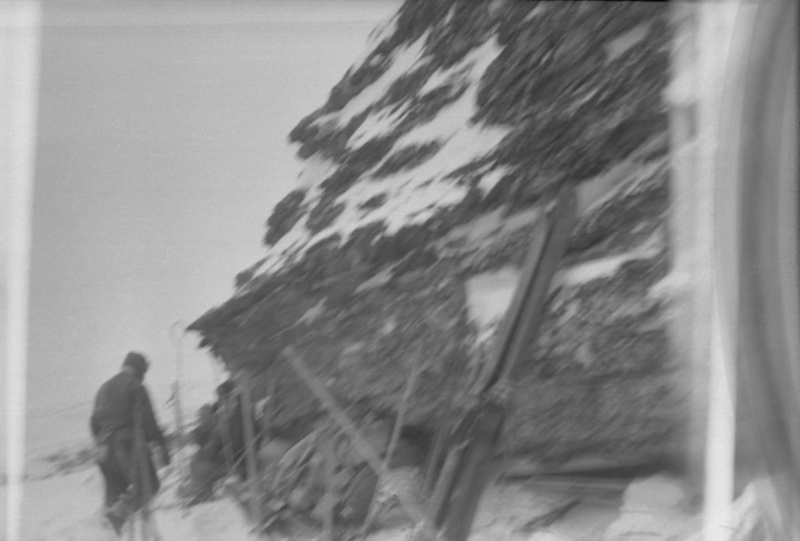 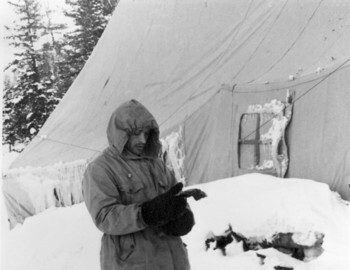 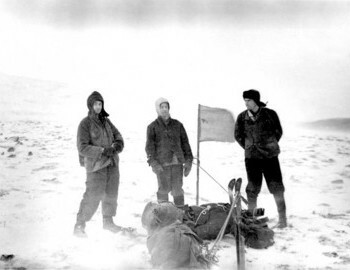 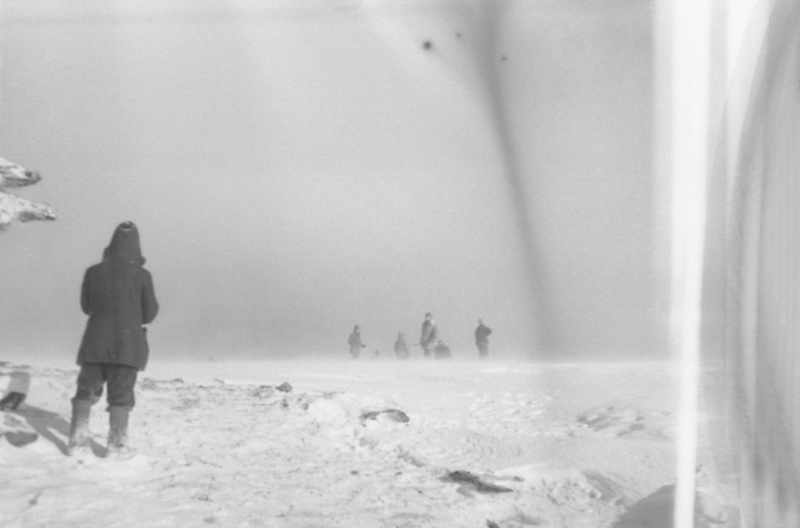 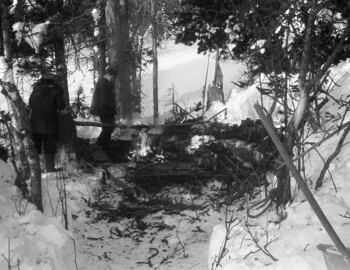 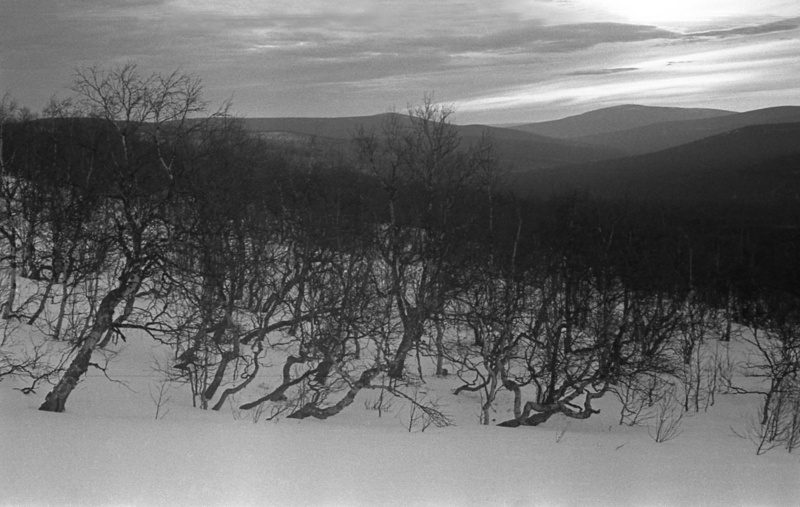 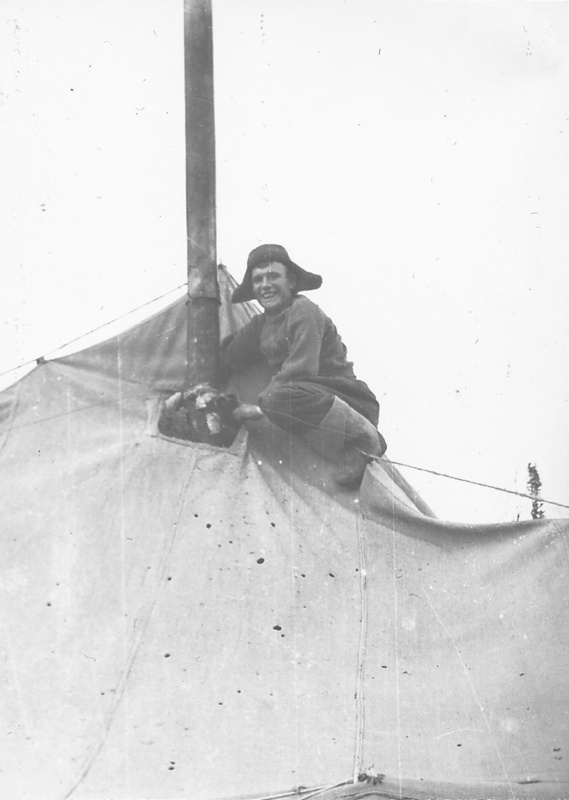 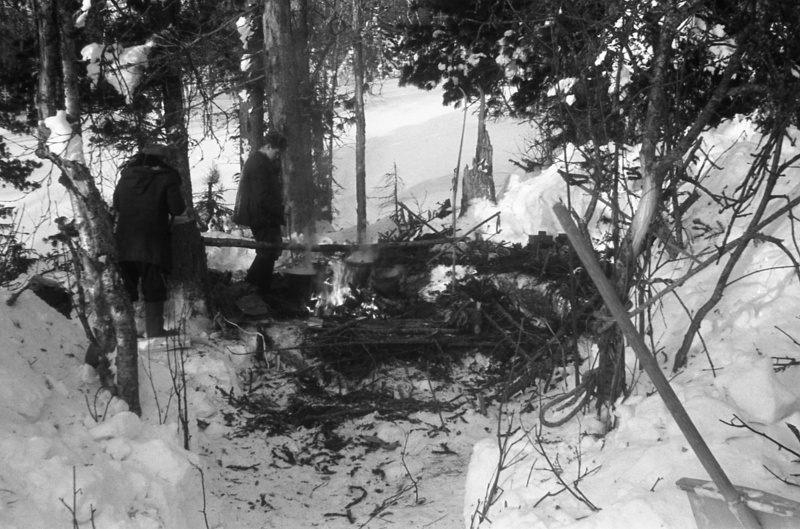 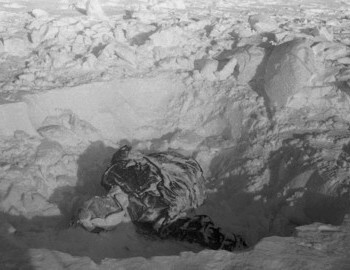 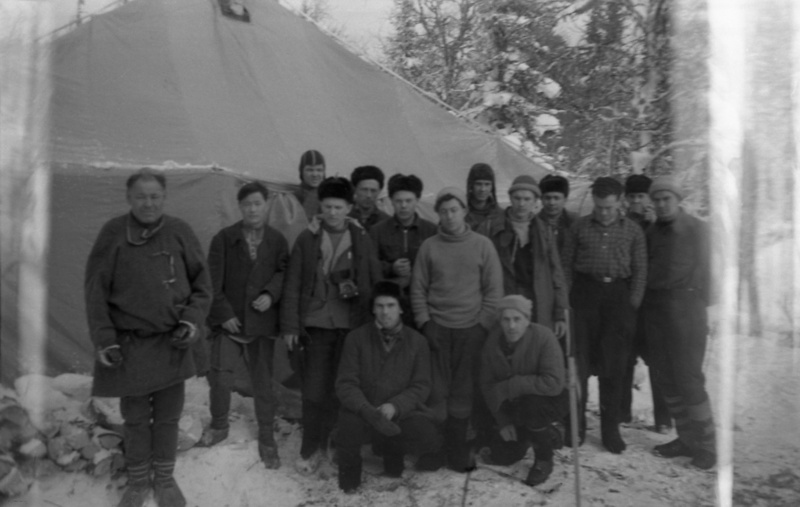 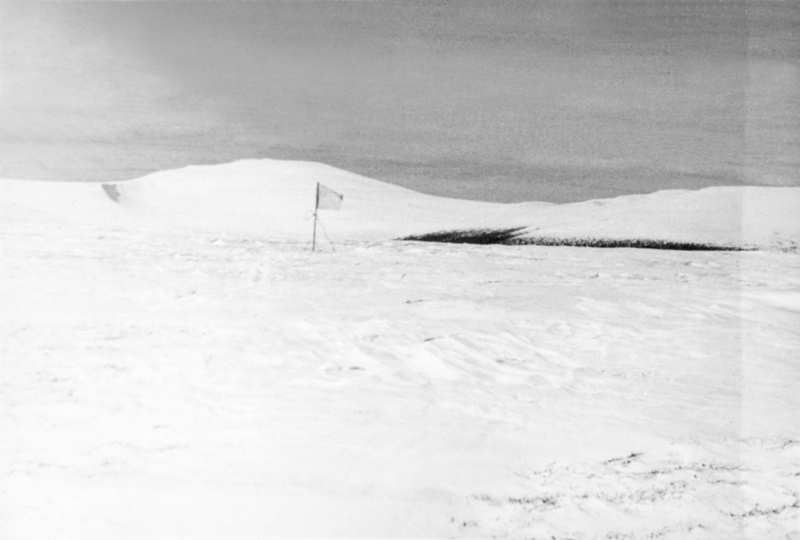 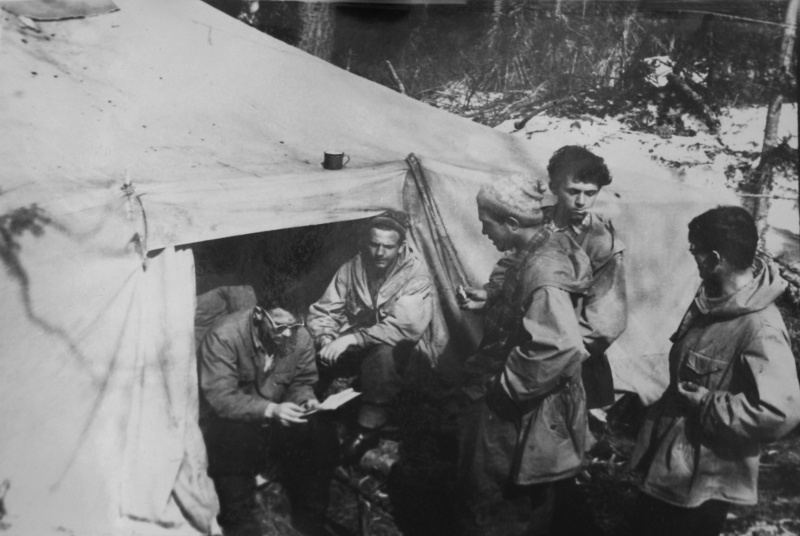 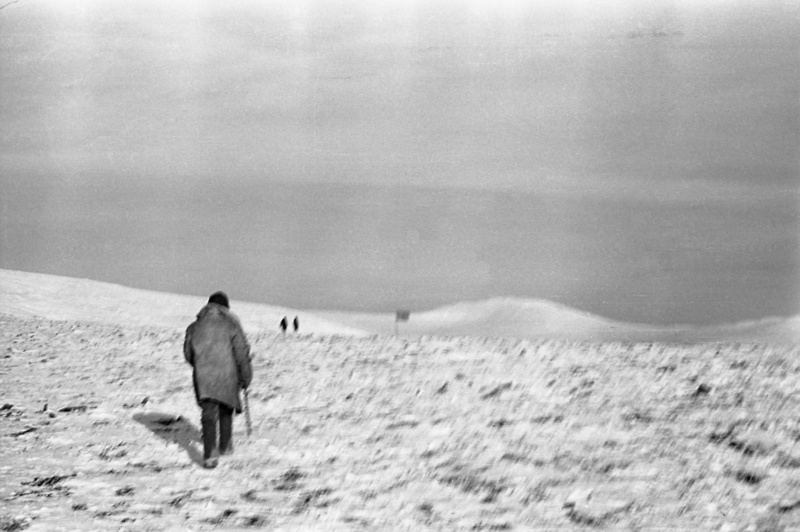 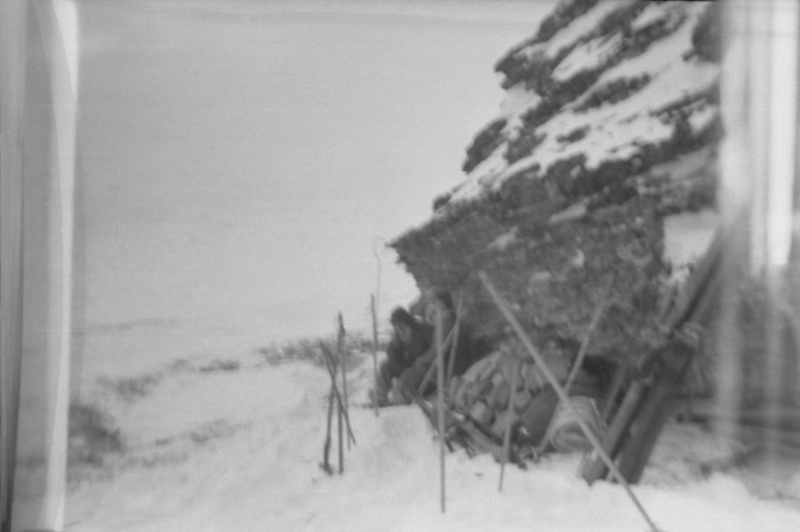 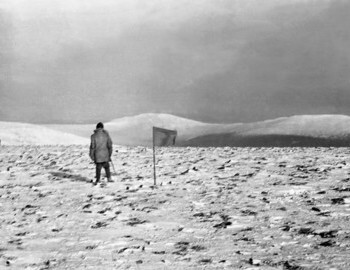 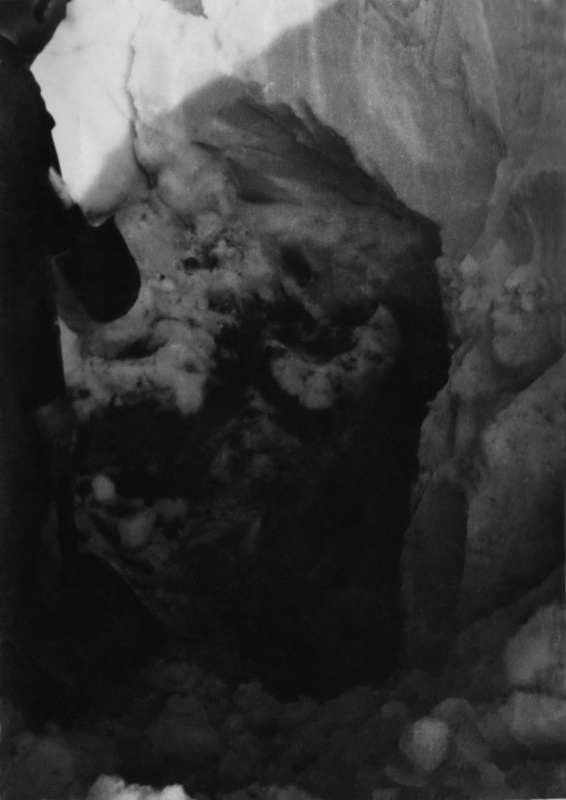 The next day on February 26th they discovered the tent on the slope of Kholat Syakhl in the Dyatlov Pass. 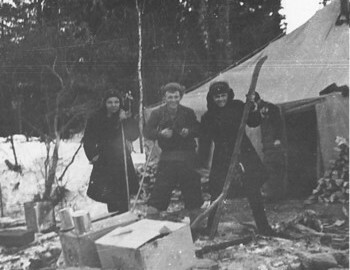 Ironically Slobtzov was among those who actually helped to construct the tent three years earlier from two tents, making it longer and larger. 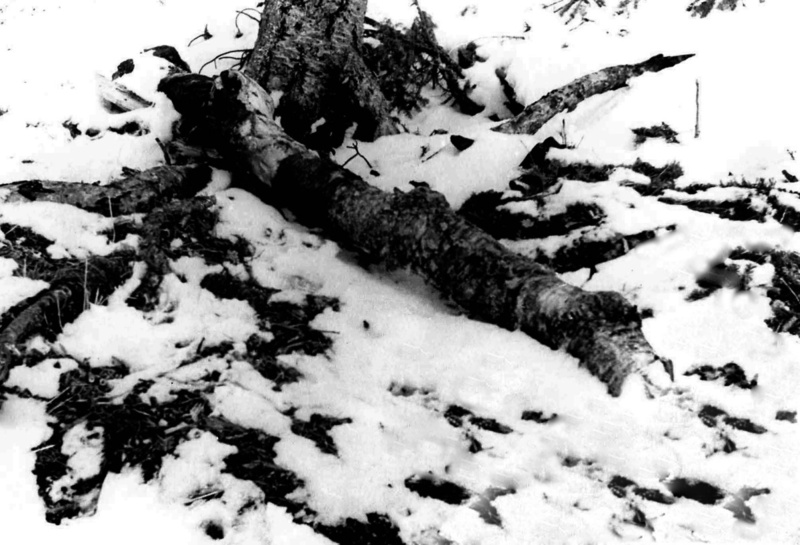 He recognized it immediately. 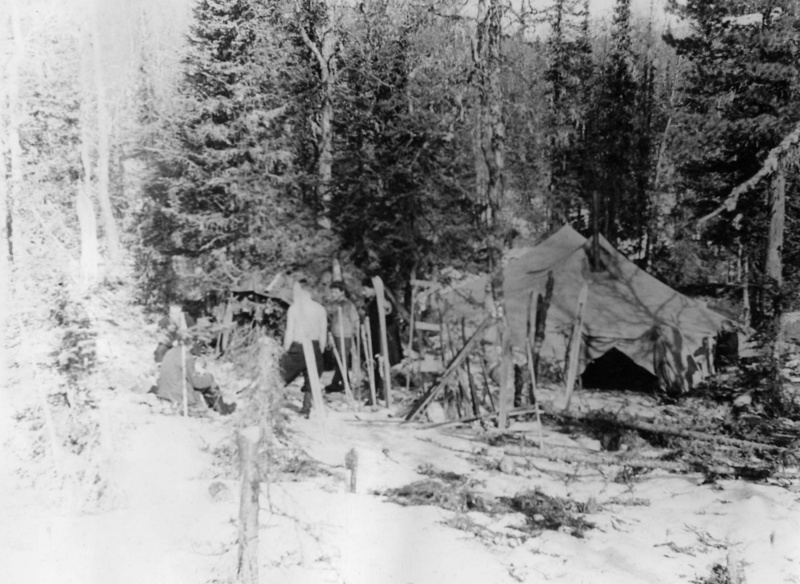 Understanding what happened at the tent is a very important node in the chain of events. 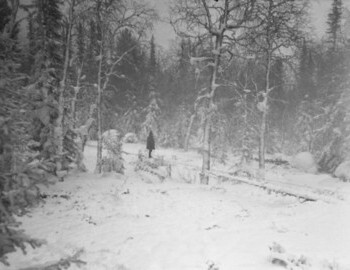 This is where the tragedy started to unfold. 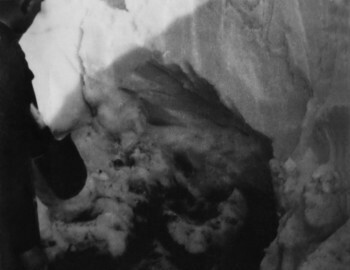 For reasons that were never answered, the sides of the tent were cut from inside and it looks like the hikers chose this strange exit for leaving the tent completely ignoring the entrance, or did they? 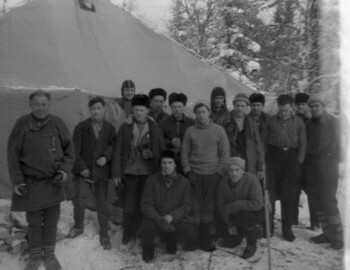 The tent hung in the largest room in Ivdel Department of Internal Affairs to be photographed. 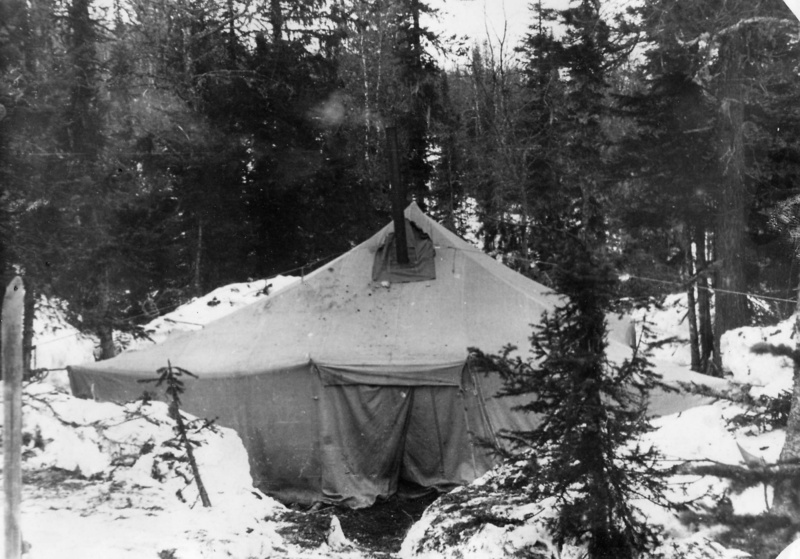 The prevailing opinion was that some vandals surprised and attacked the hikers cutting the tent in the process. 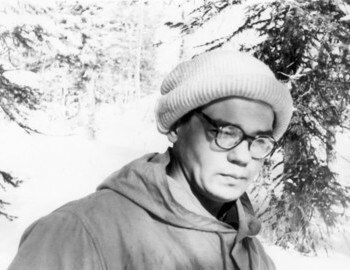 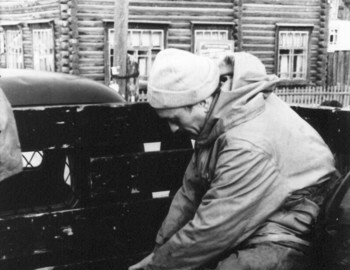 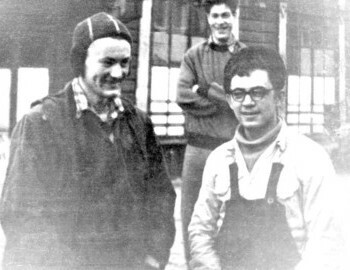 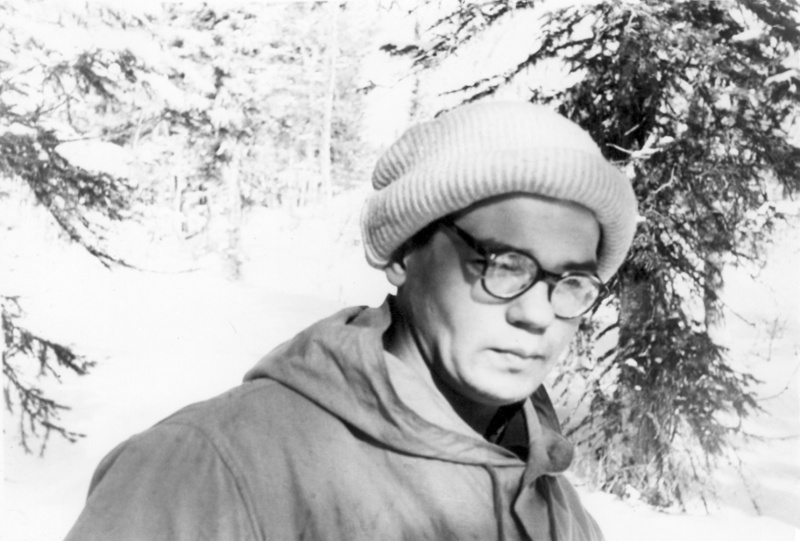 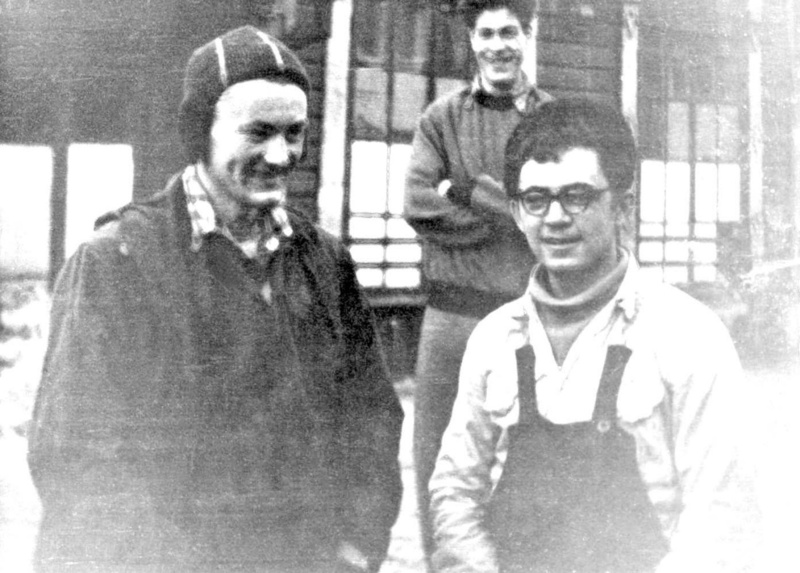 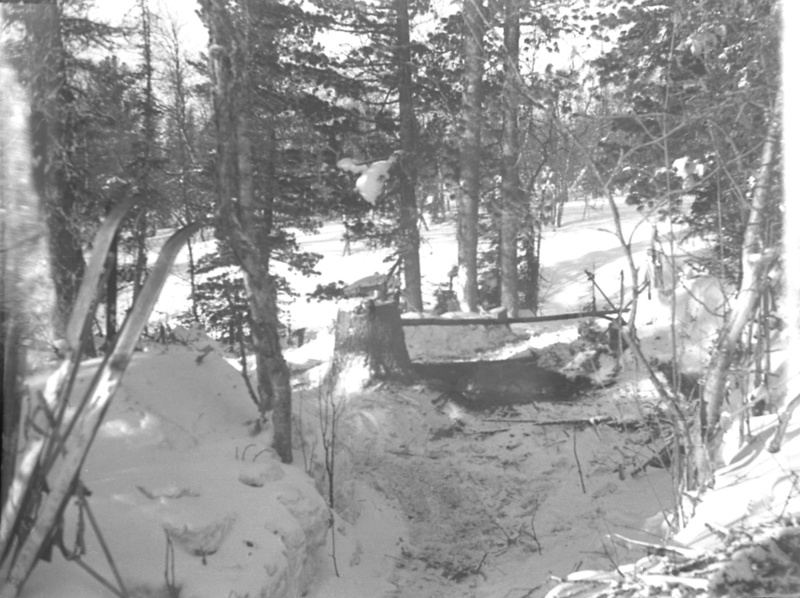 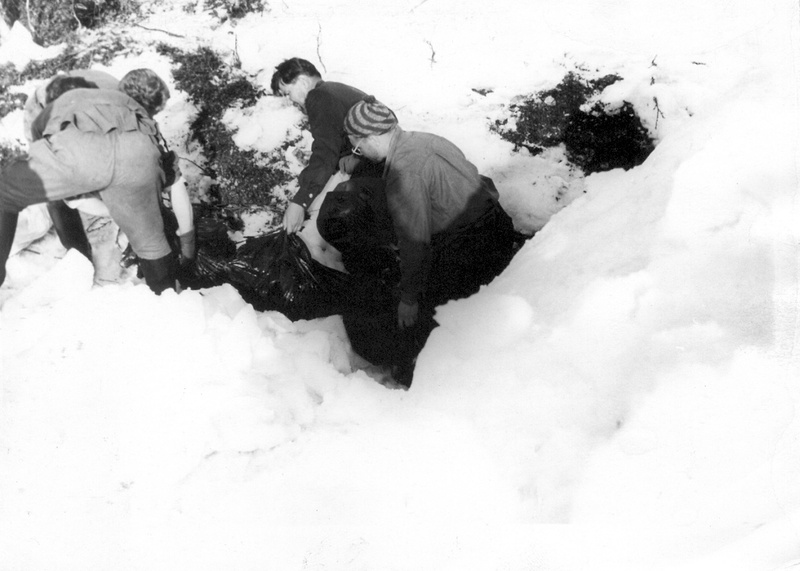 Vladimir Korotaev, who in 1959 was young investigator, recalling the events of that time, said that major break in the case was made almost by accident. 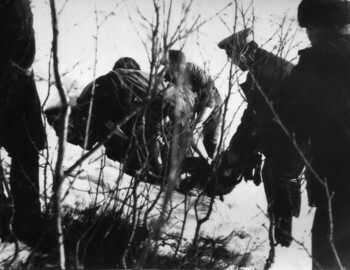 A woman was called to help mending his uniform. 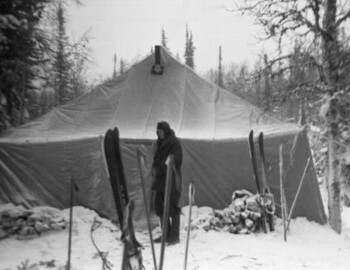 She took one look at the tent and spoke with confidence that the cuts were made from inside. 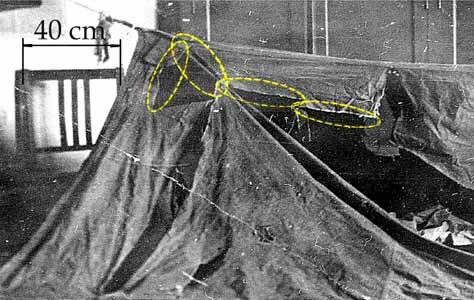 This changed the course of the investigation entirely. 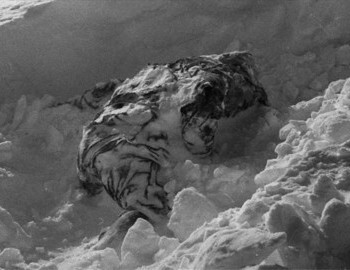 Forensic analysis confirmed the cuts were indeed made from inside. 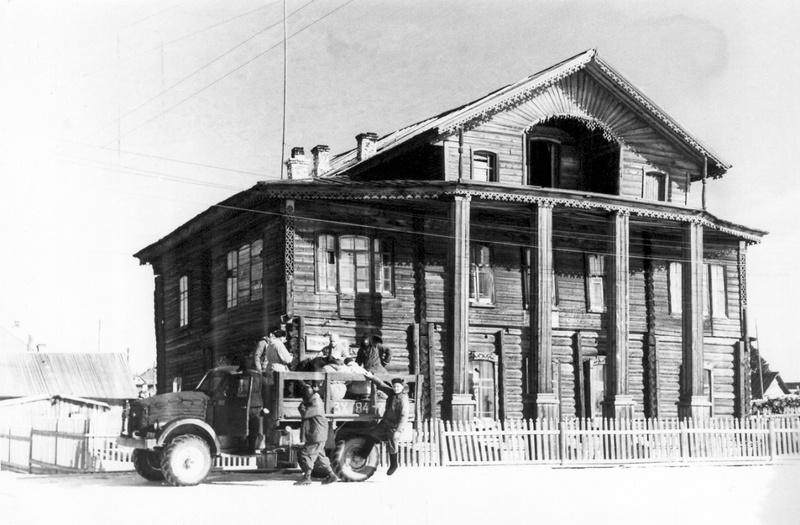 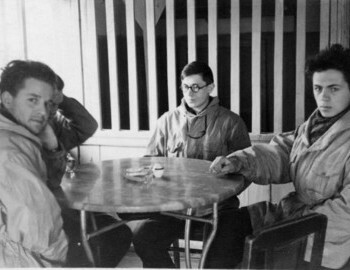 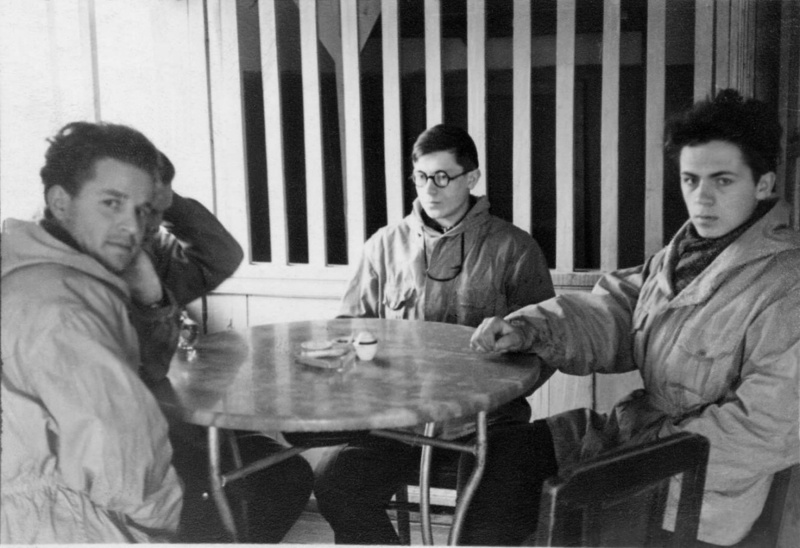 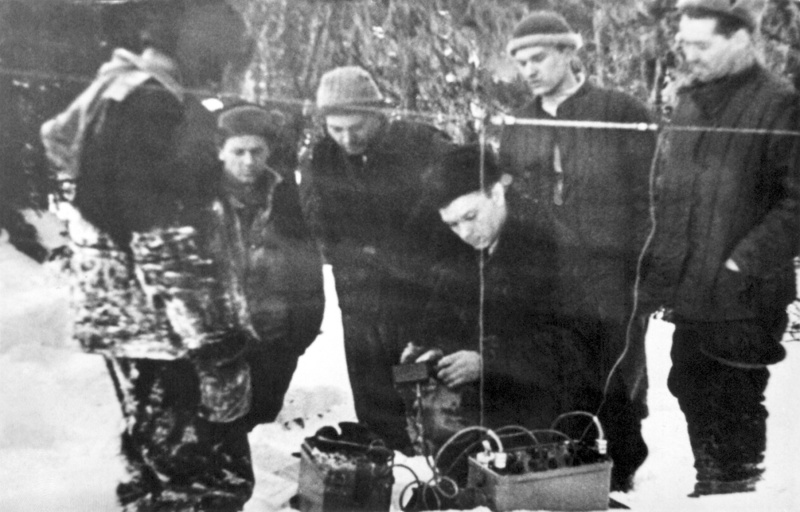 The examination was conducted in Sverdlovsk Forensic Laboratory 3-16 April 1959 by senior forensic expert Henrietta Eliseevna Churkina. 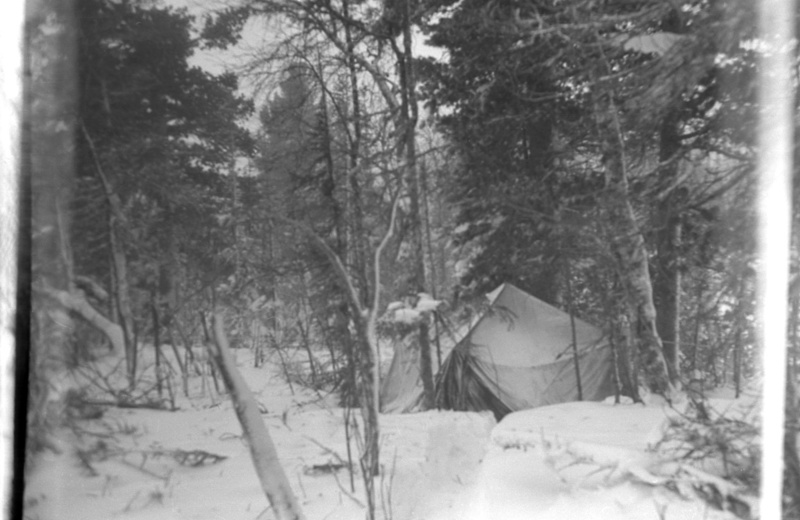 Camp site is located on the northeast slope of mountain 1079 (Kholat Syakhl, red) at the source of river Auspiya. 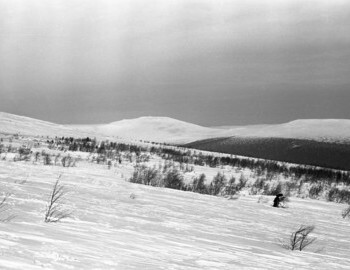 Camp site is located 300 meters from the top of the mountain 1079 on a slope of 30°. 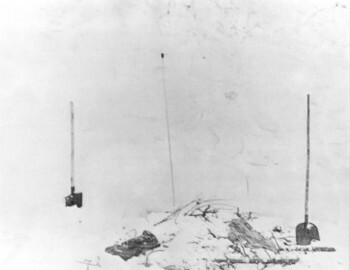 Camp site consists of a pad of flattened snow, on the bottom are stacked 8 pairs of skis (for tent support and insulation, red). 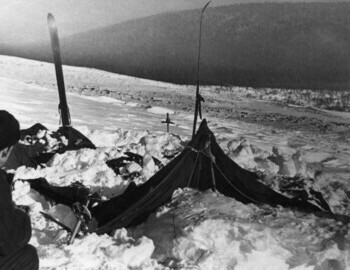 Tent is stretched on poles and fixed with ropes, at the bottom of the tent 9 backpacks were discovered with various personal items, jackets, rain coats, 9 pairs of shoes. 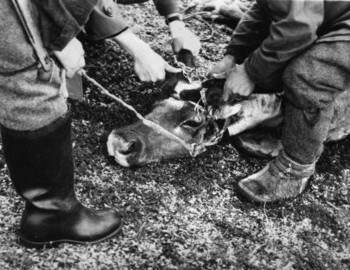 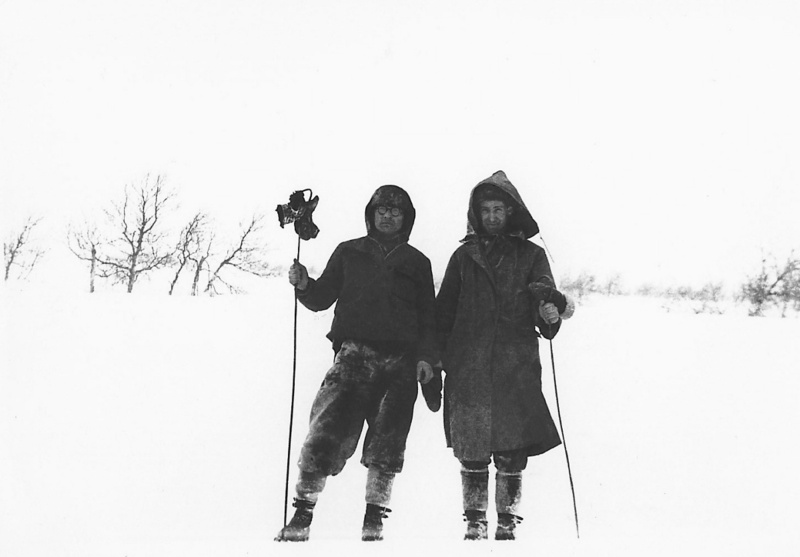 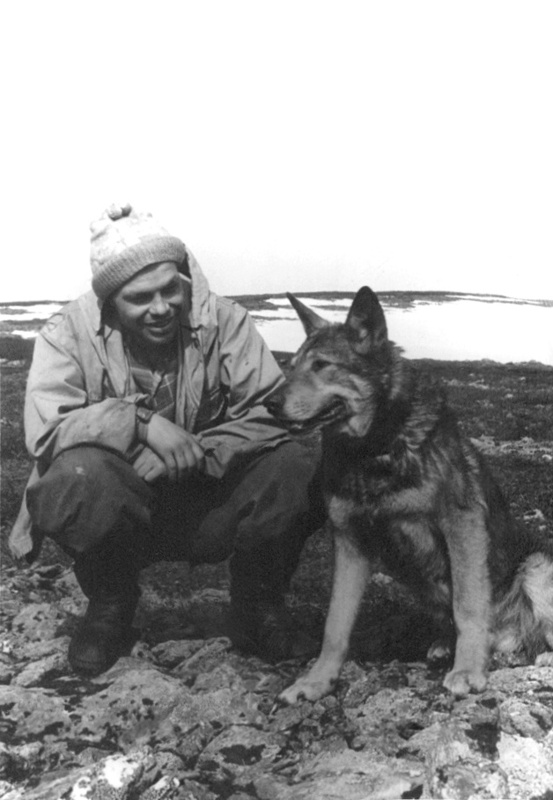 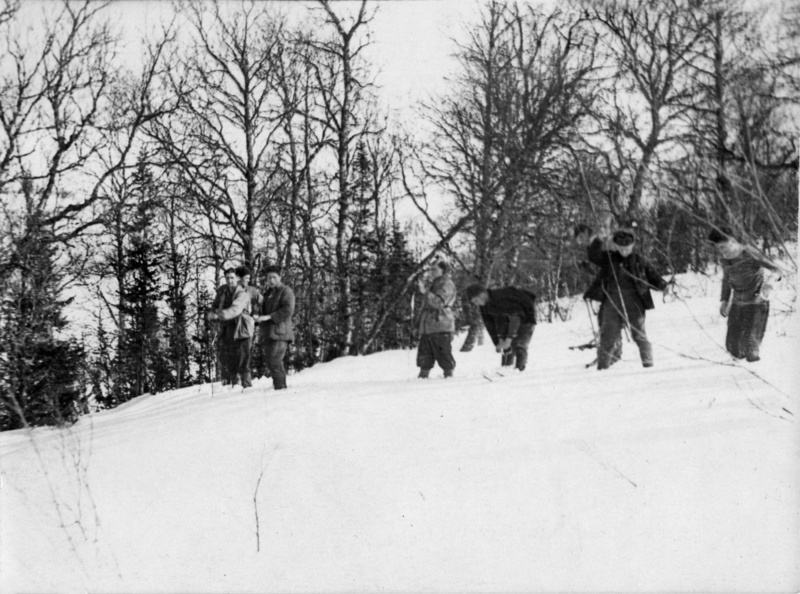 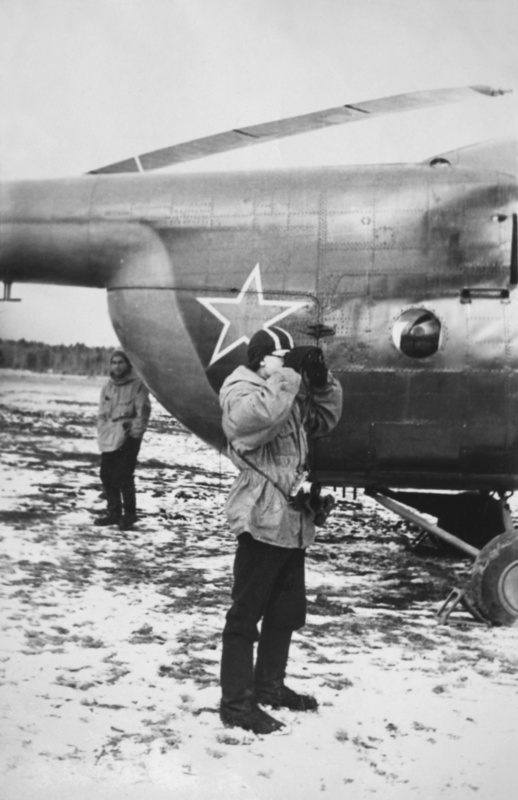 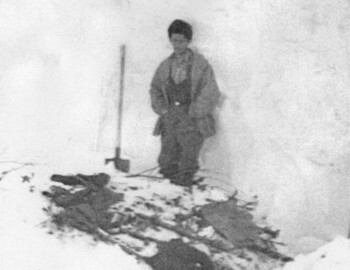 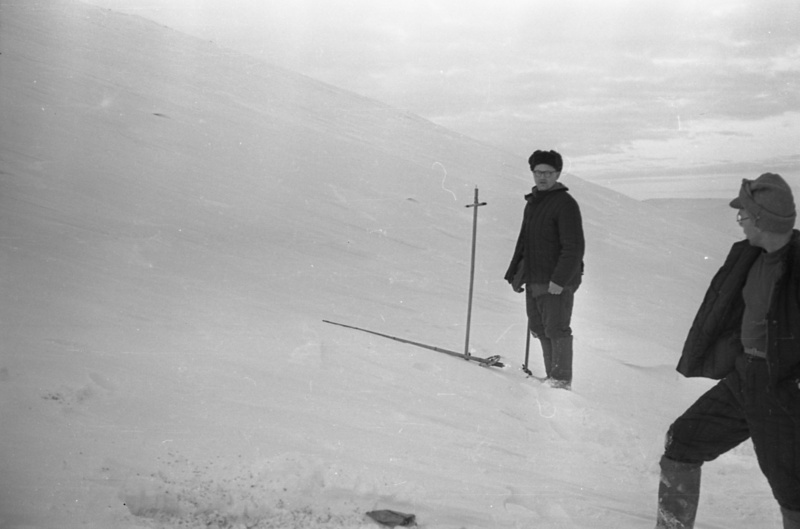 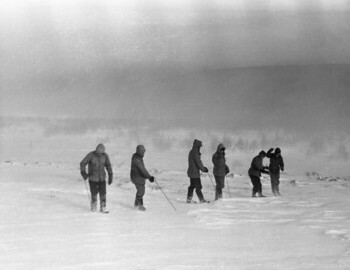 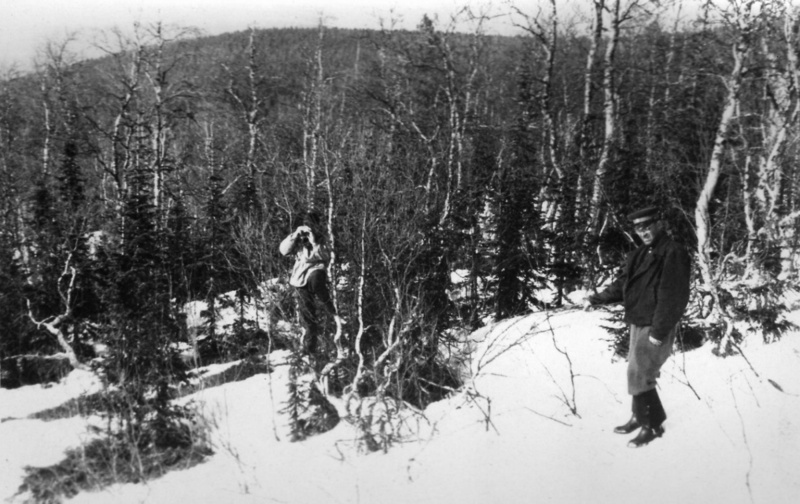 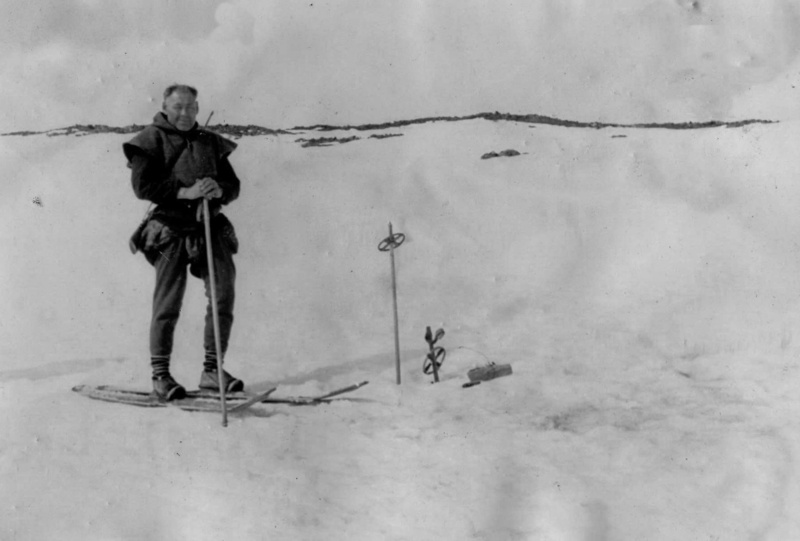 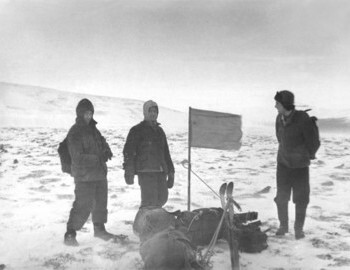 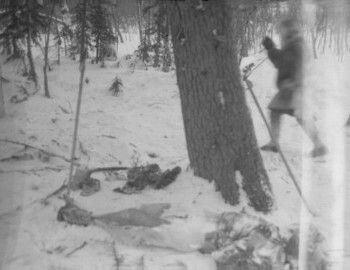 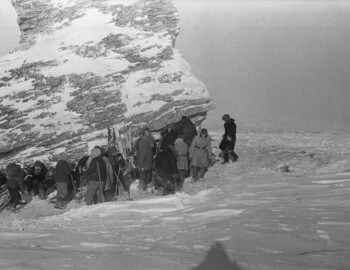 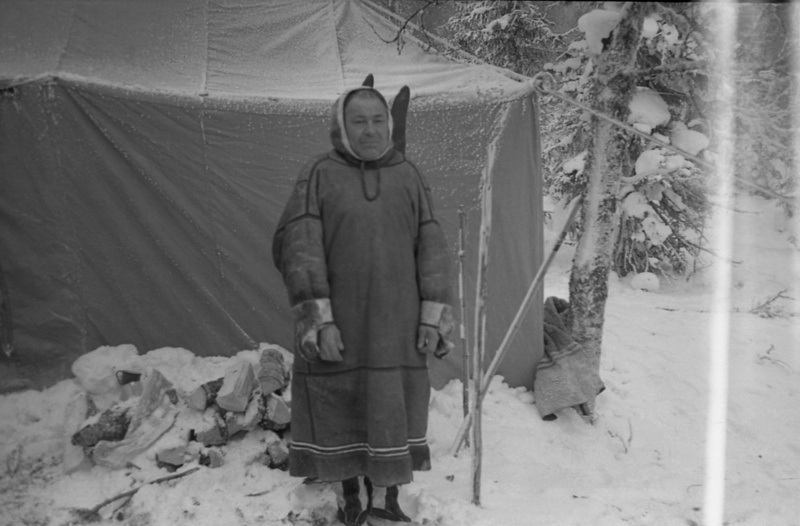 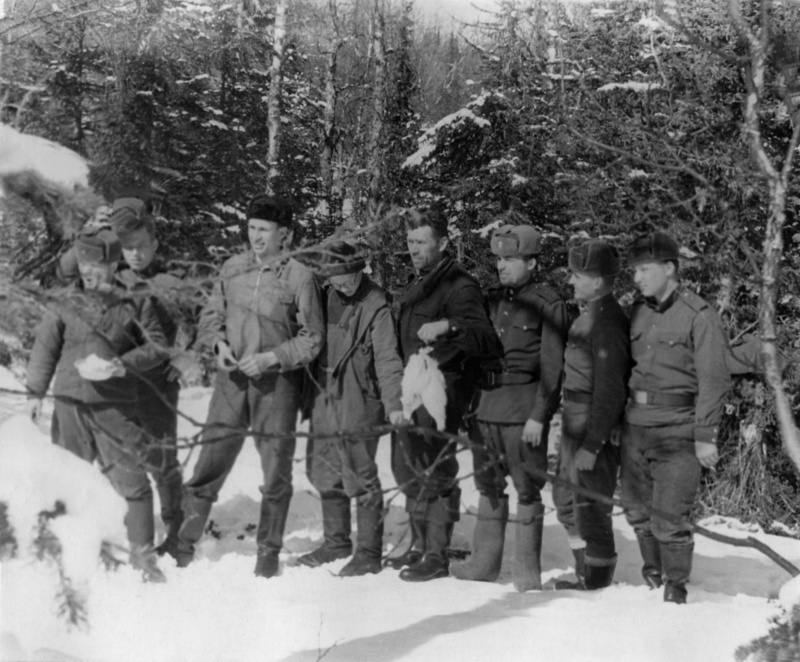 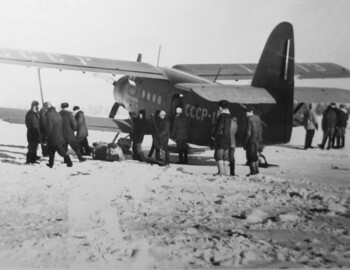 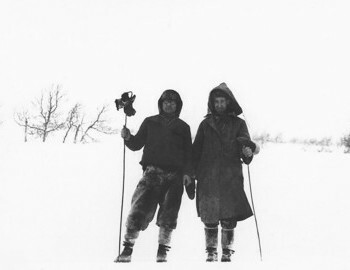 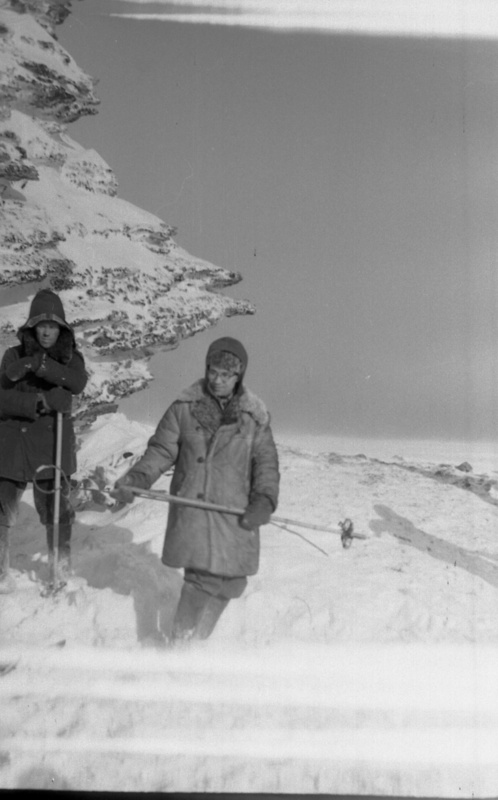 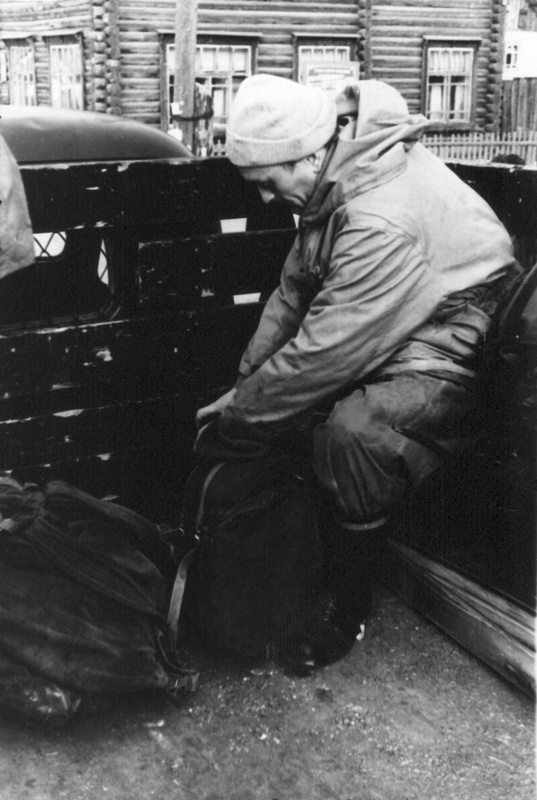 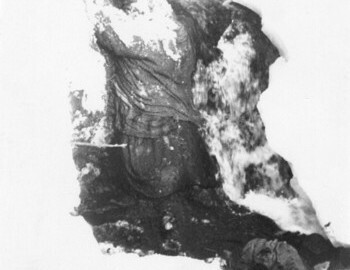 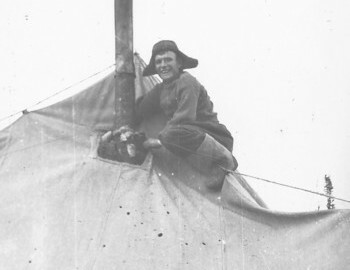 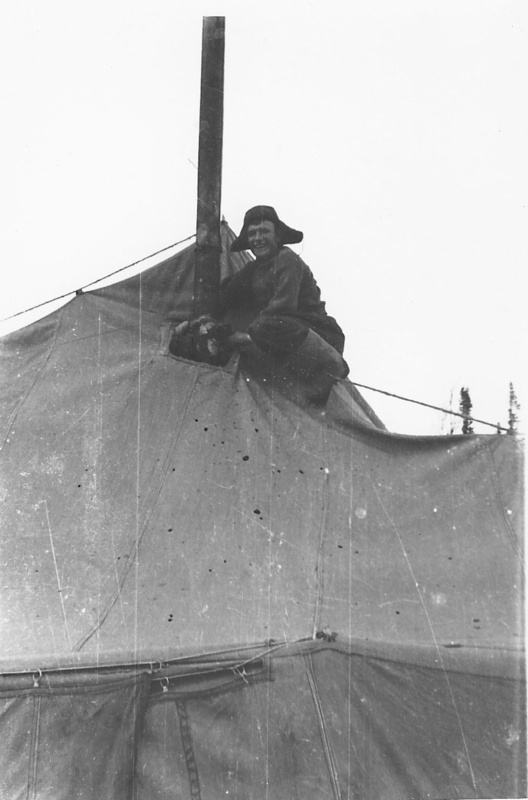 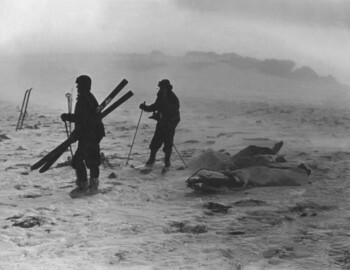 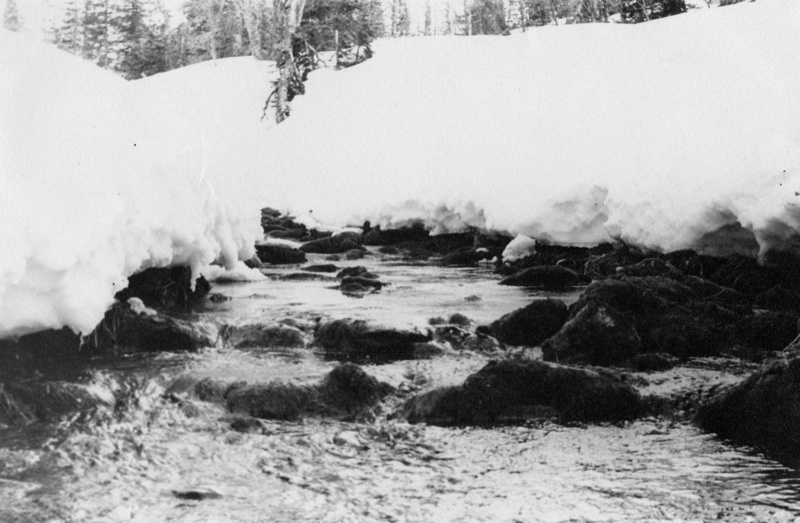 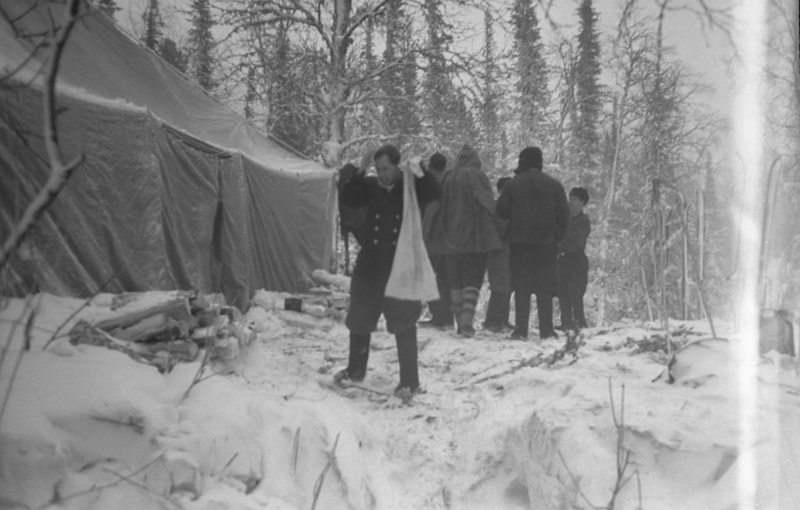 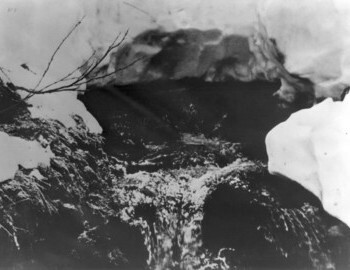 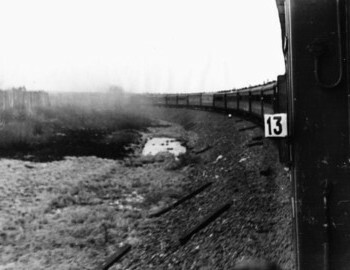 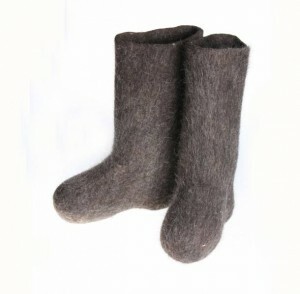 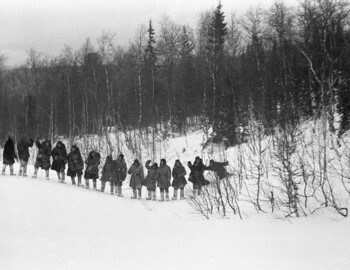 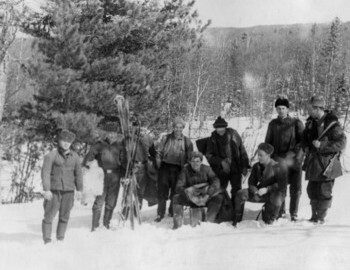 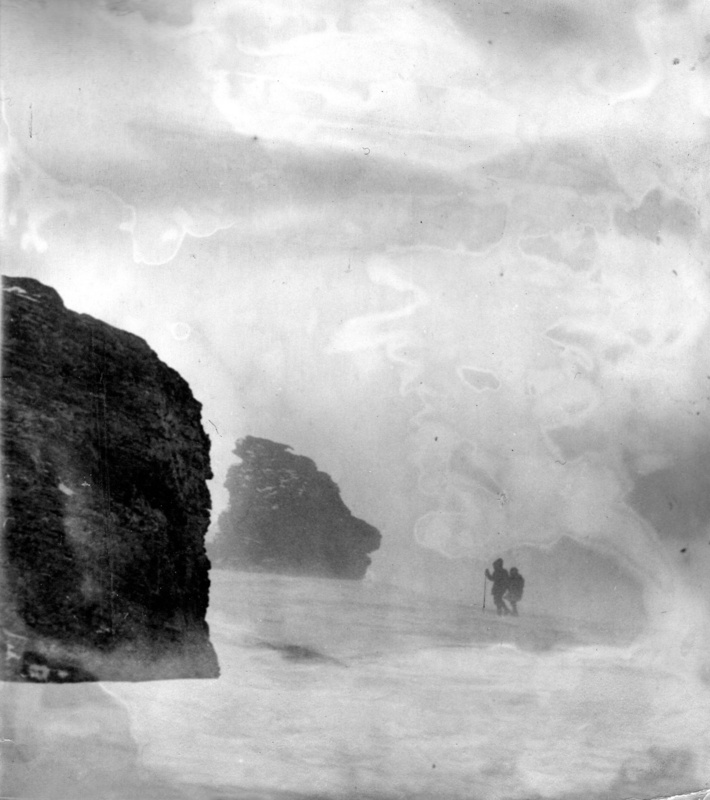 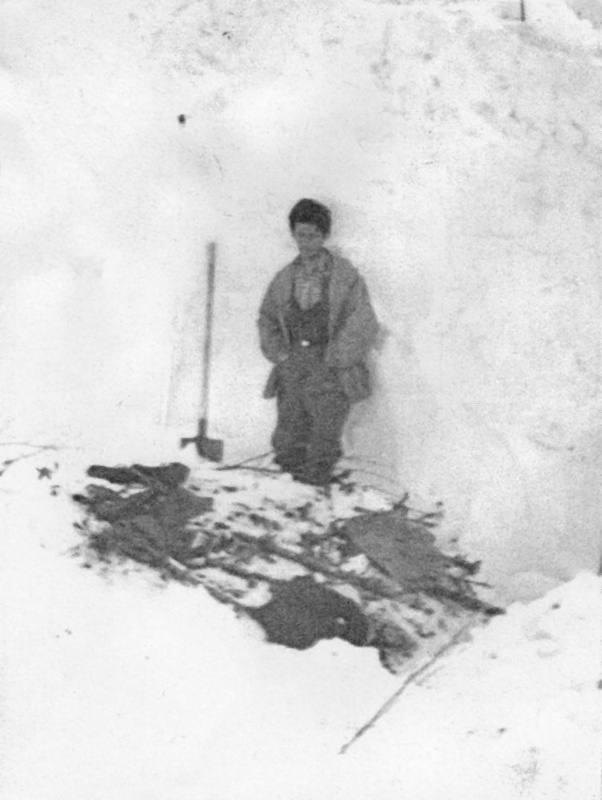 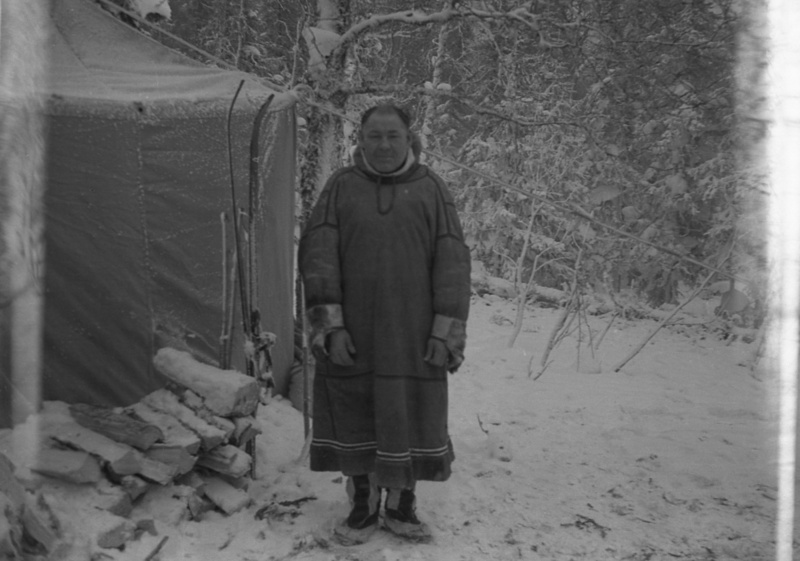 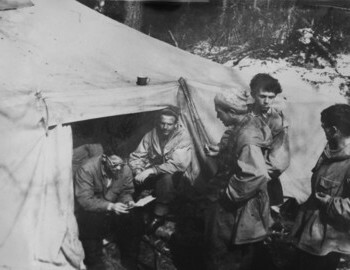 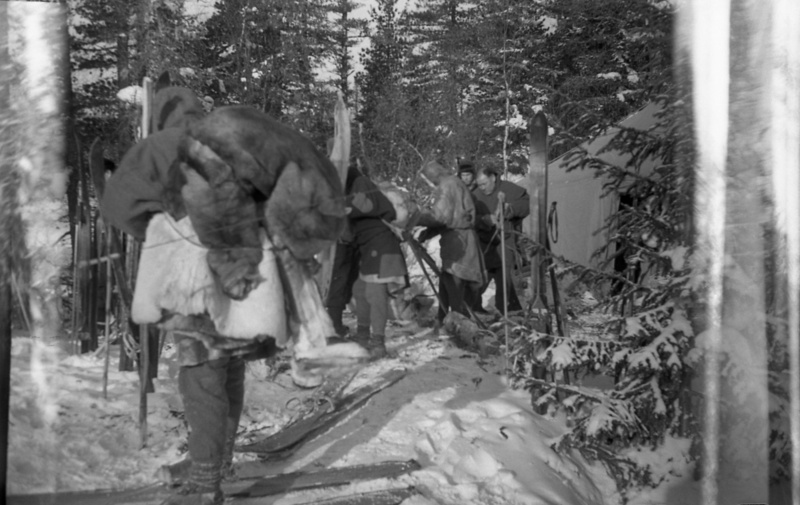 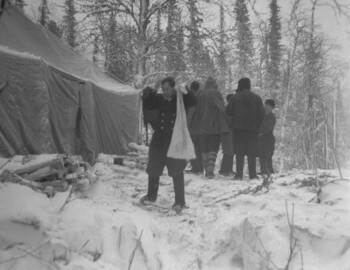 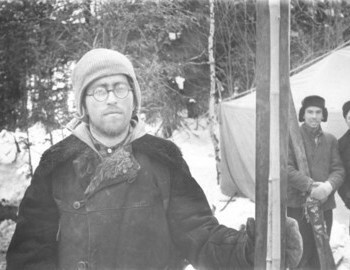 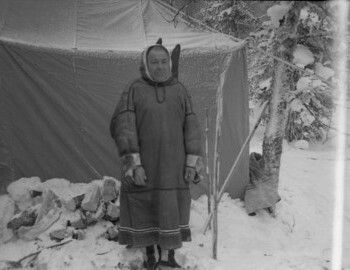 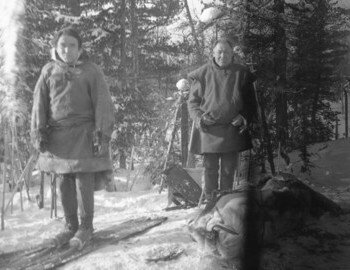 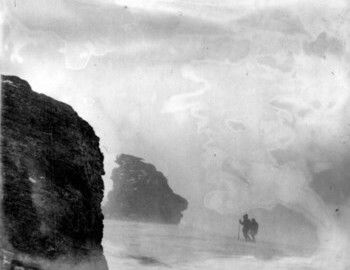 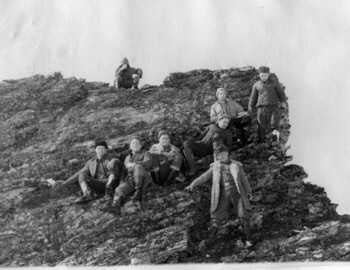 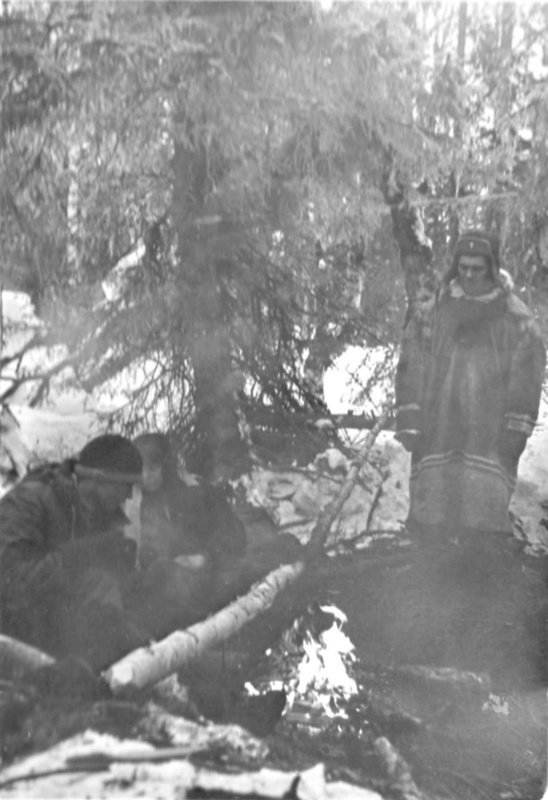 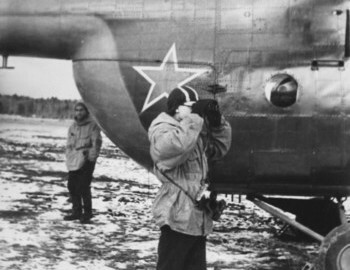 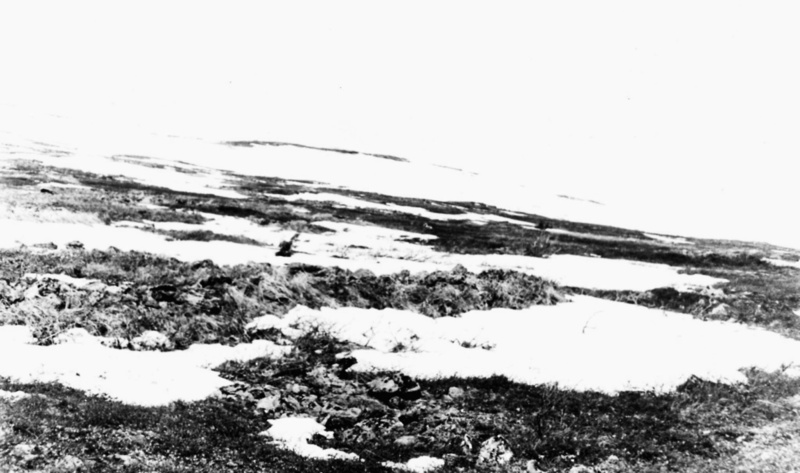 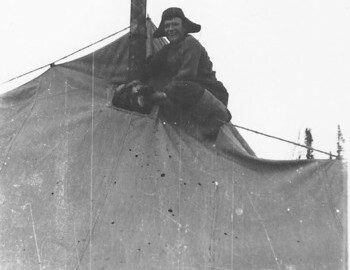 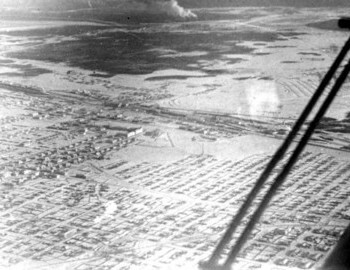 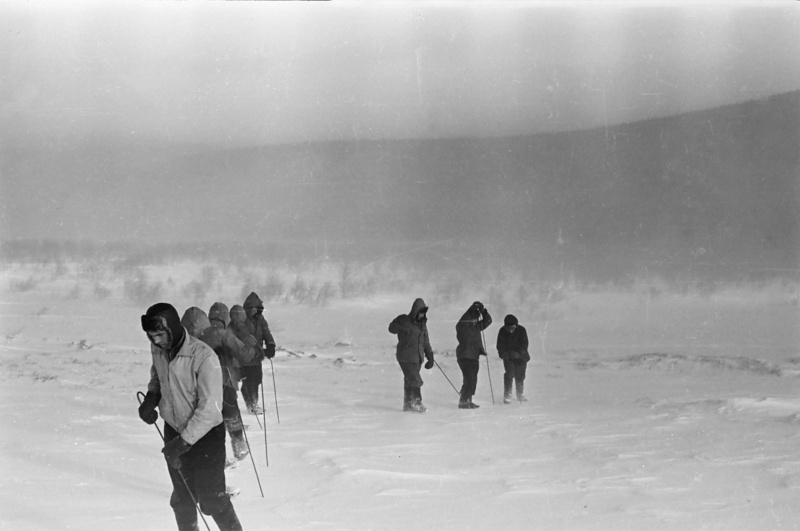 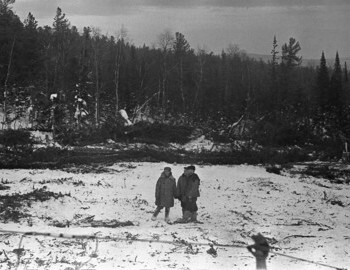 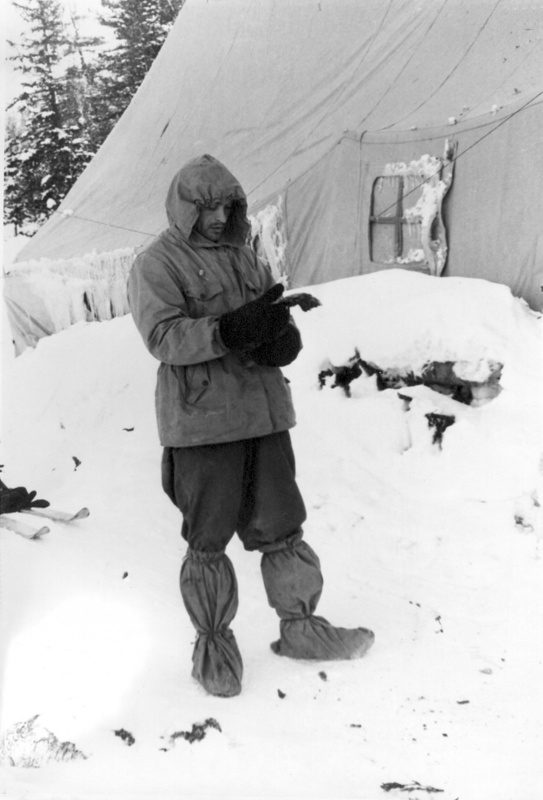 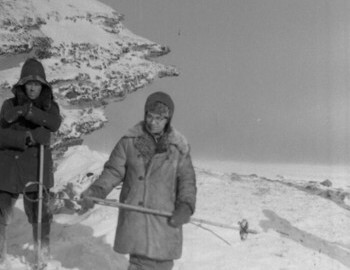 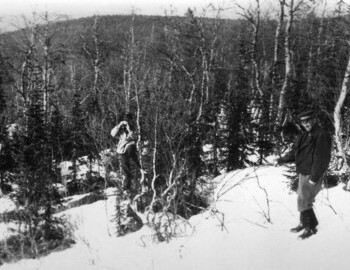 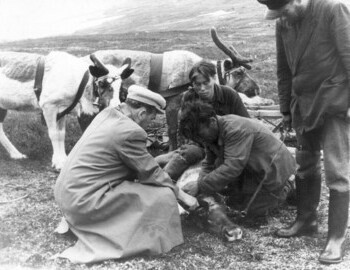 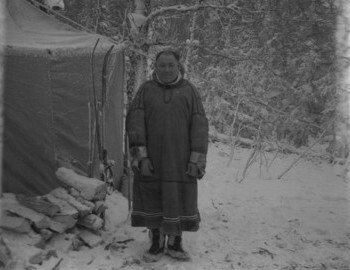 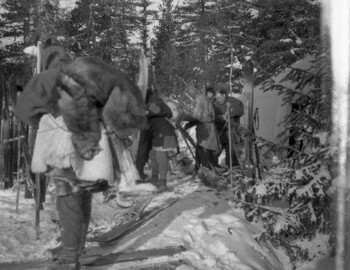 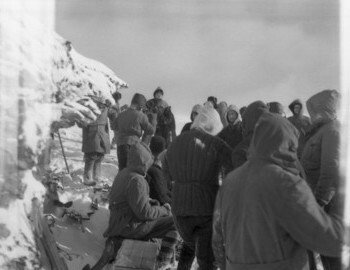 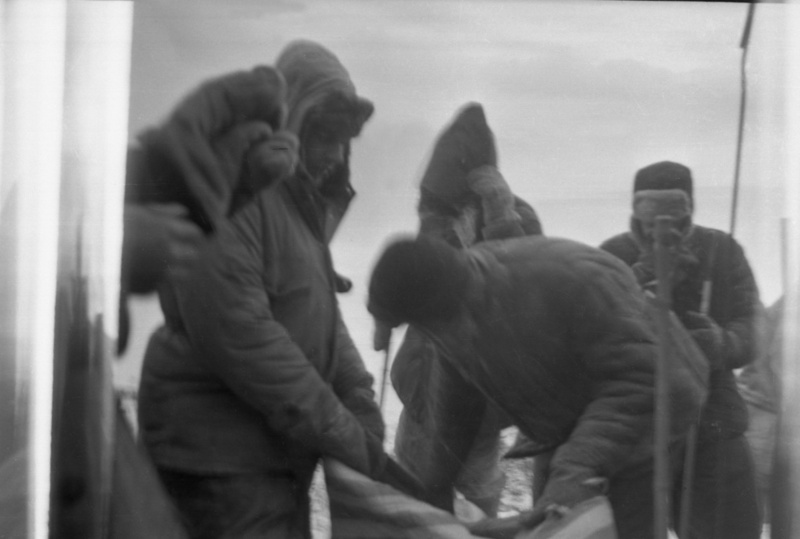 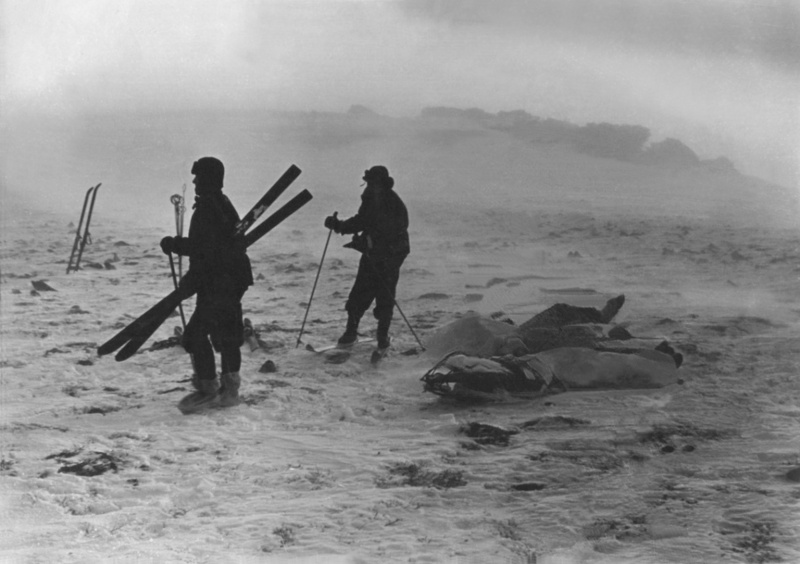 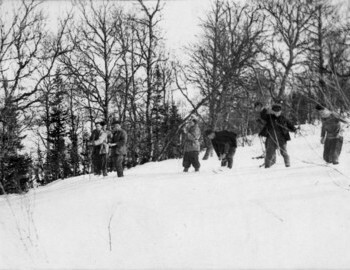 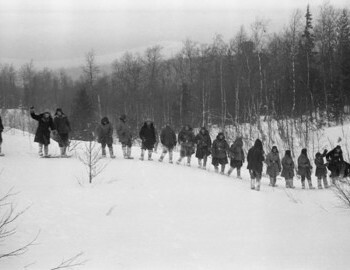 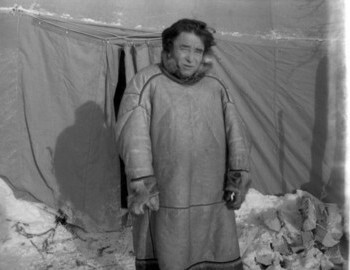 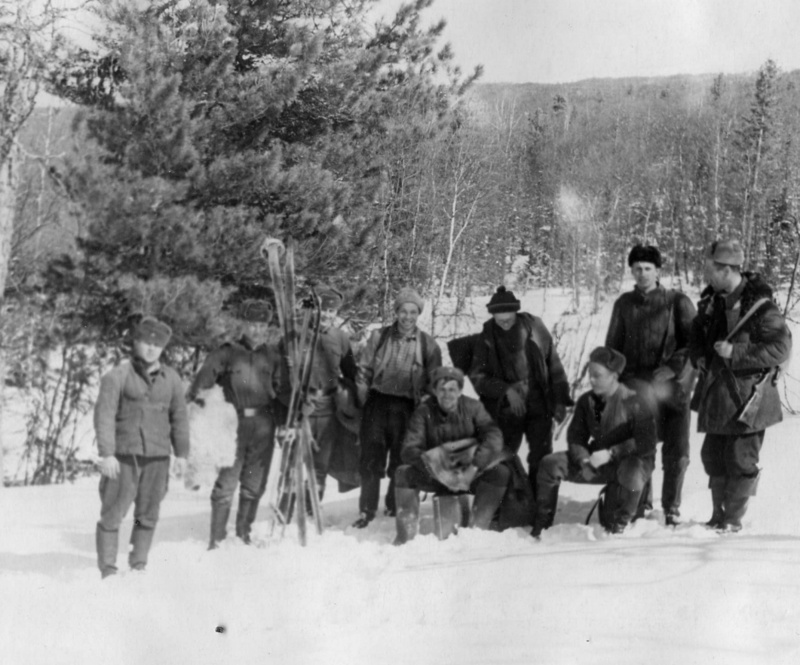 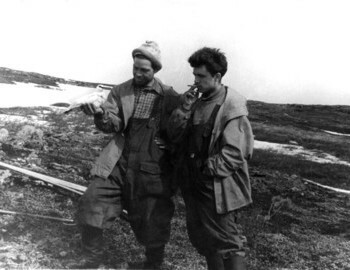 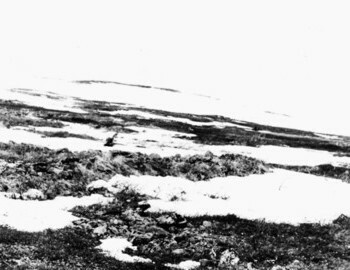 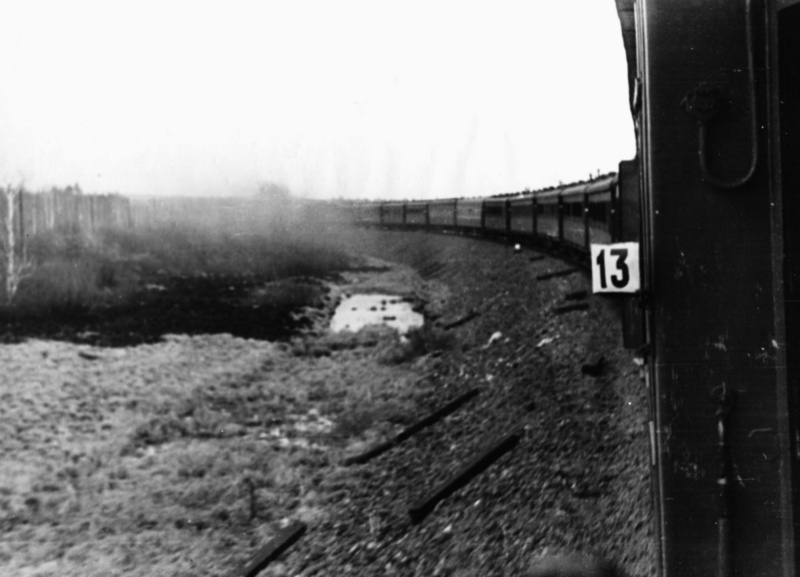 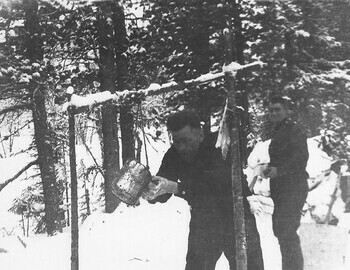 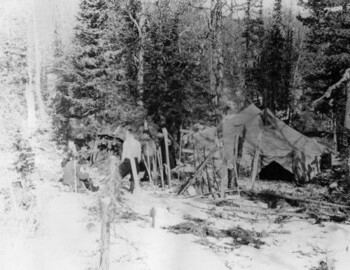 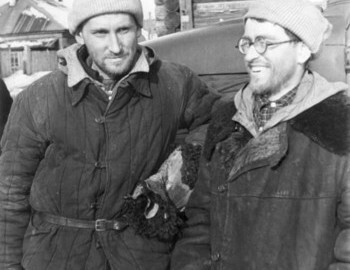 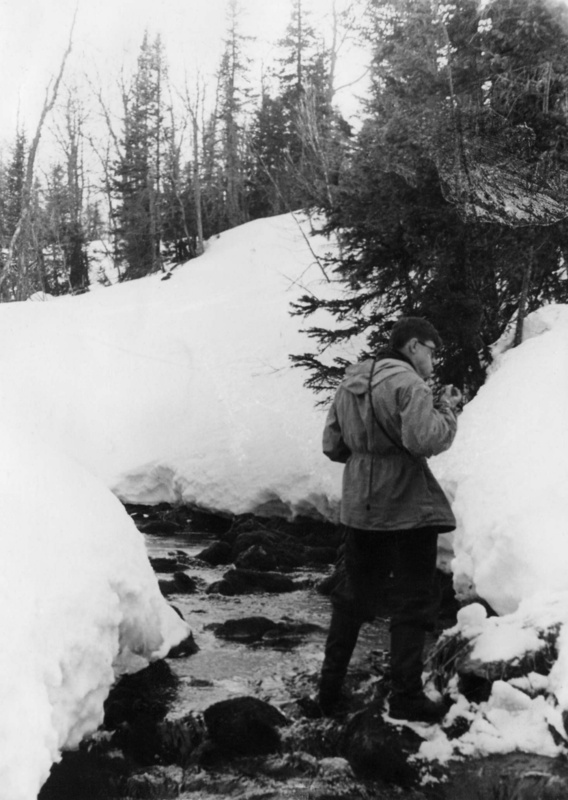 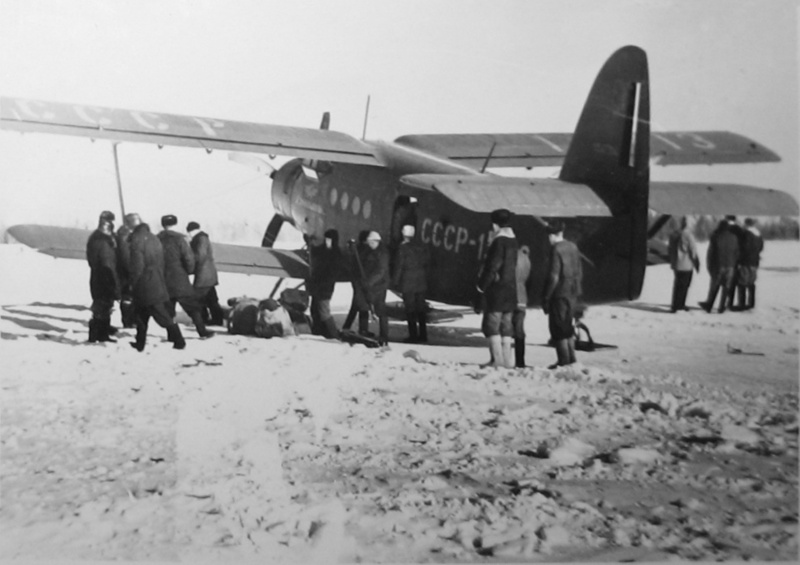 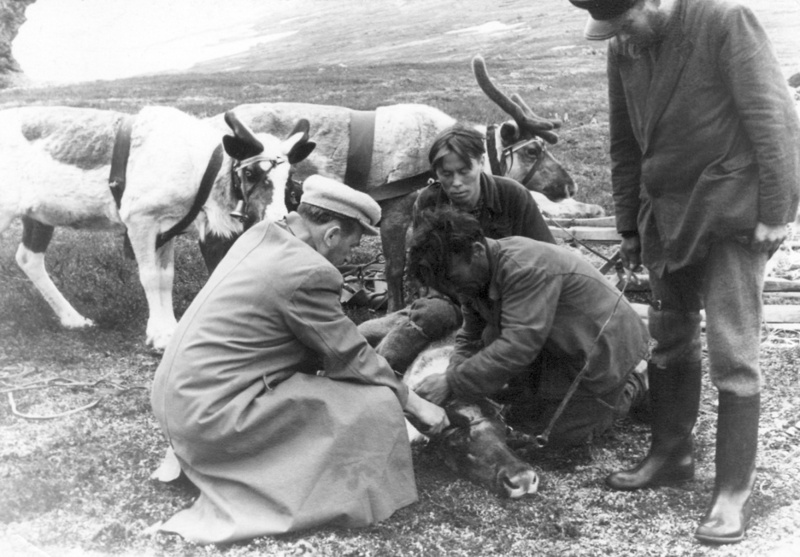 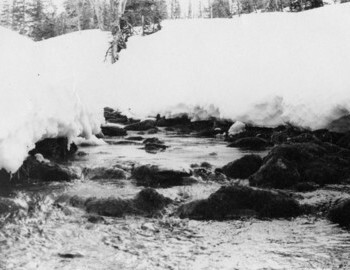 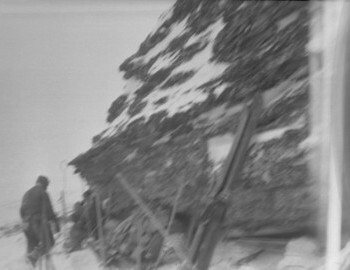 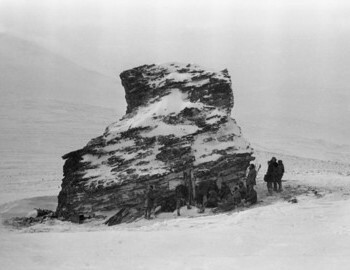 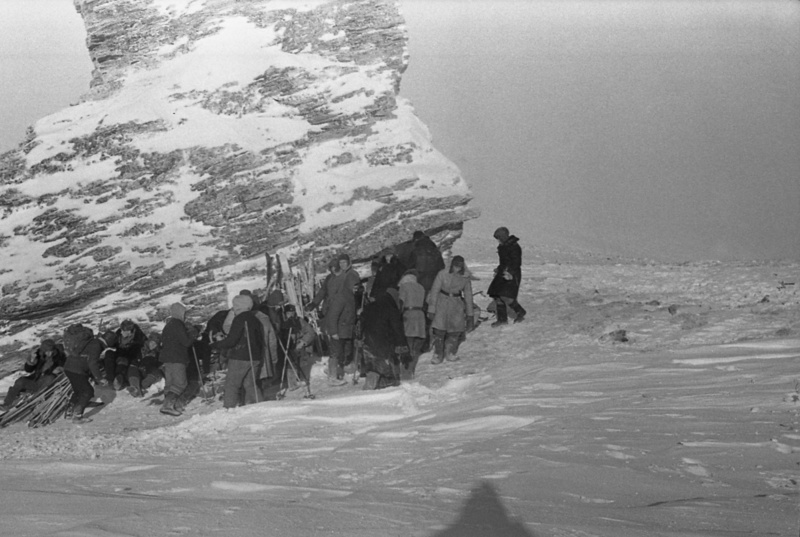 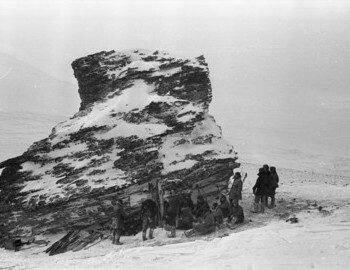 There were also found men's pants, and three pairs of boots, warm fur coats, socks, hat, ski caps, utensils, buckets, stove, ax, saw, blankets, food: biscuits in two bags, condensed milk, sugar, concentrates, notebooks, itinerary and many other small items and documents, camera and accessories to a camera. 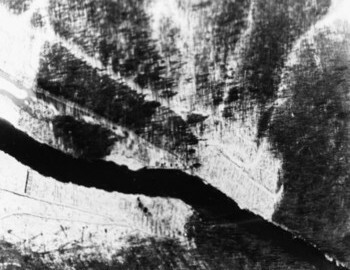 The nature and form of all (...) cuts suggest that they were formed by contact with the canvas inside of the tent with the blade of some weapon (presumably a knife). 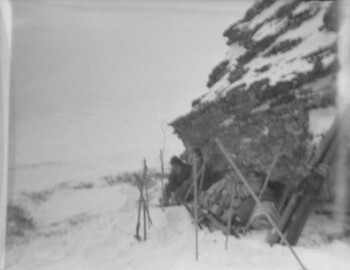 The side of the tent facing uphill is not photographed. 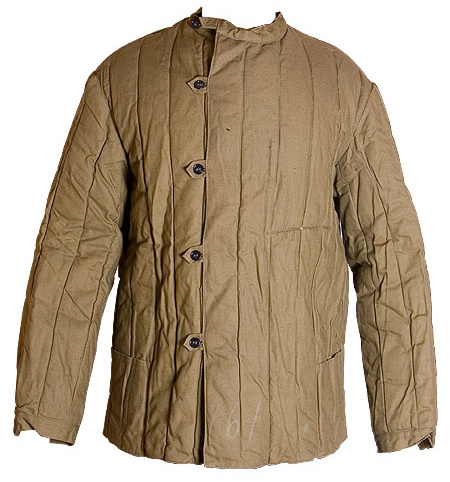 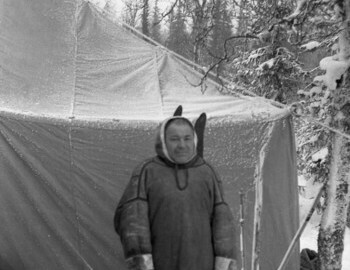 We know there was at least one hole in the tent and Dyatlov jacket was found tucked in it. 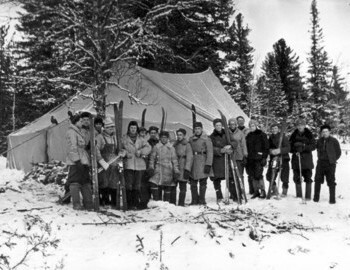 The far right end of the tent is left out of the photos. 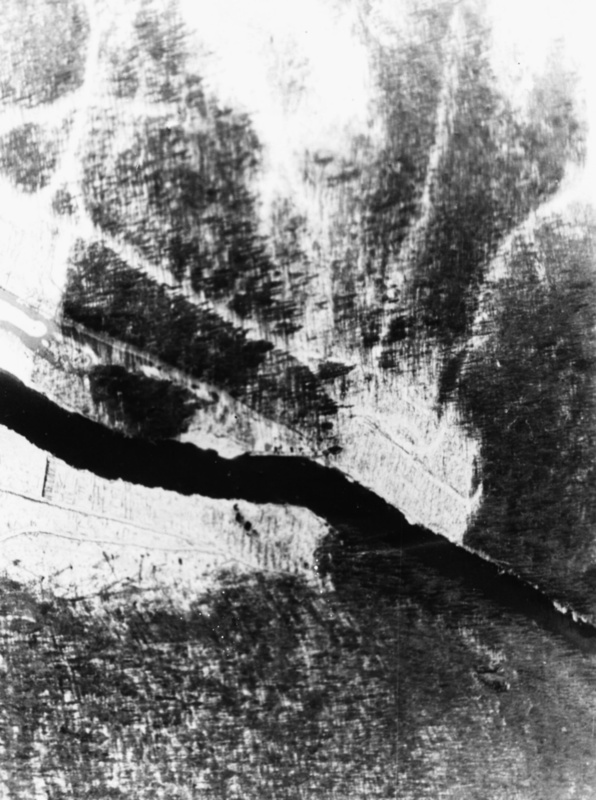 Part of the torn material on right side is covering a hole that is not measured. 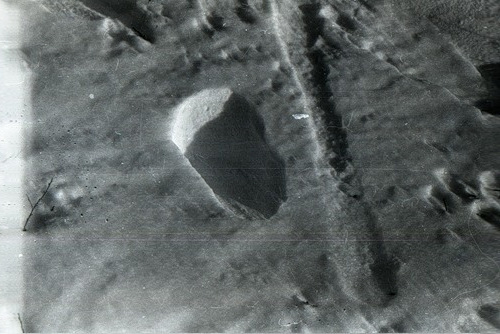 The sizes of the holes are not precise but approximate. 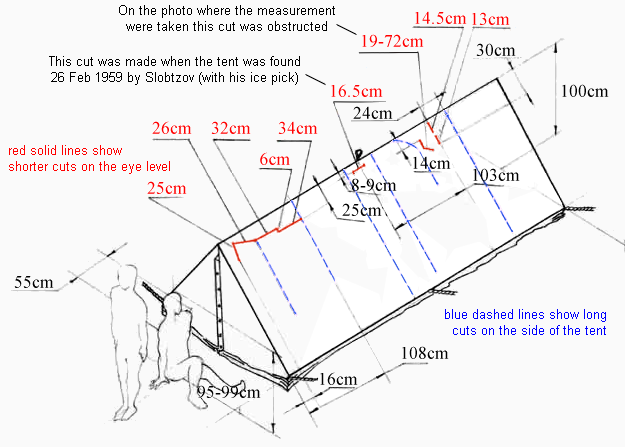 Why couldn't they be measured with precision? 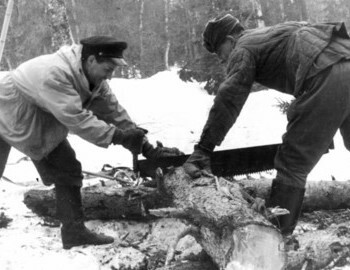 How did Churkina decide which cuts were important and worth mentioning, measuring and showing on her scheme? 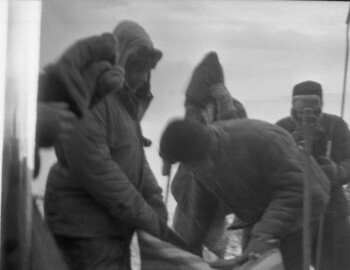 On the photos there is no ruler or something else to be used for a scale to measure the cuts. 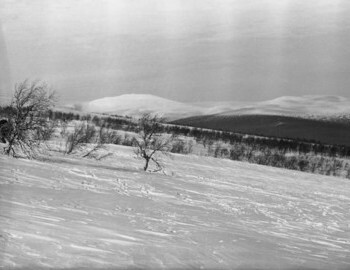 Rakitin found out what model is the chair that is in the left photo my chance, and made his measurements comparing with the size of the back 40 cm. 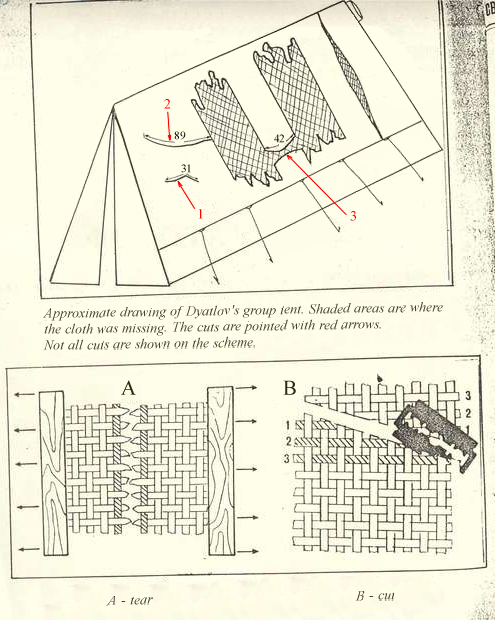 Churkina's drawing is not only overly schematic but also the positioning, sizes and number of cuts are not accurate. 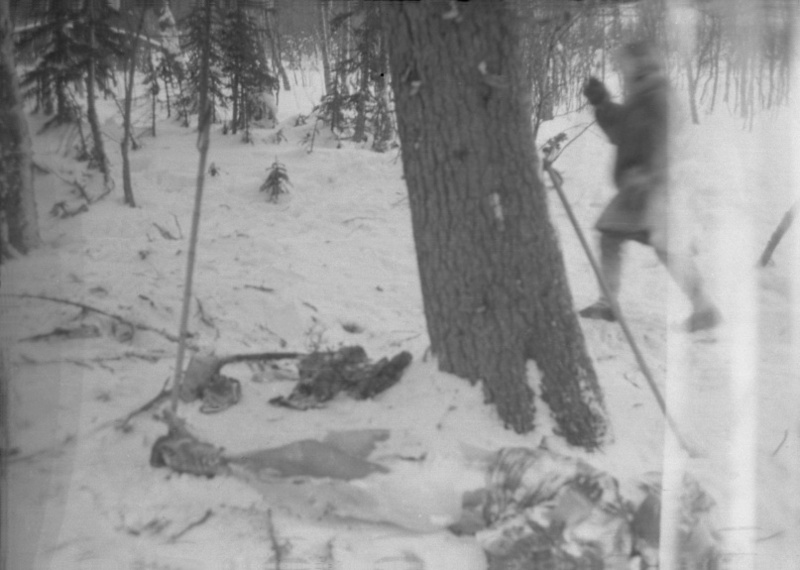 Some of the cuts from inside didn't make it all the way through. 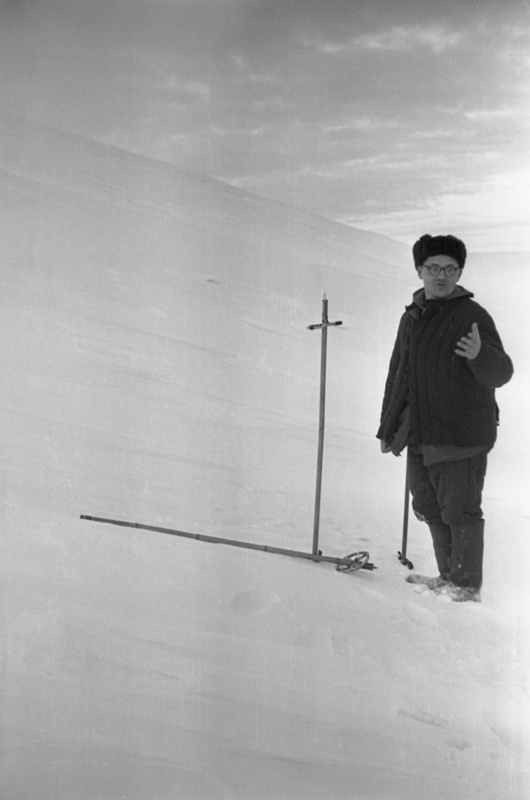 The back of the chair is used as a measurement ruler. 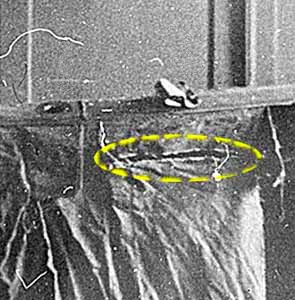 The piece of the tent material is covering at least one big hole that can not be measured. 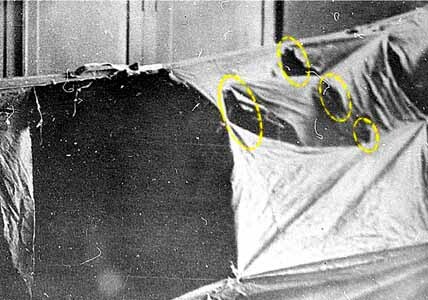 This is how Henrietta Churkina saw the tent. 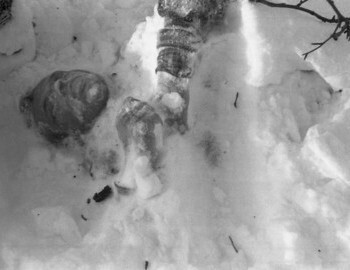 This drawing is part of the case files. 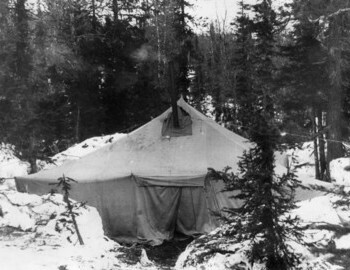 Reconstruction of the general form of the tent with the stuff inside on their places the way they were found. 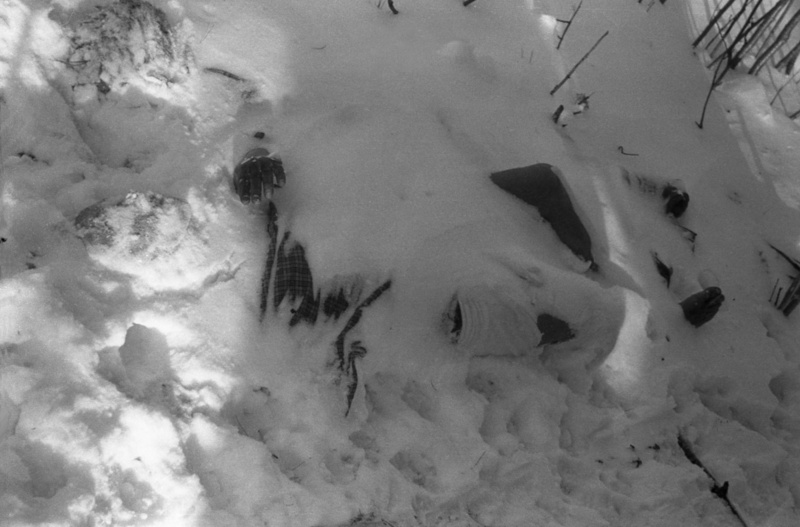 Not to clutter the scheme are omitted hikers 9 backpacks lying on the floor, 9 blankets (2 spread and 7 crumpled) and jackets. 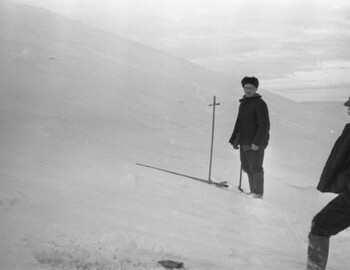 For a scale is shown a man with the size of Yuri Doroshenko (height - 180 cm, shoulders - 55 cm). 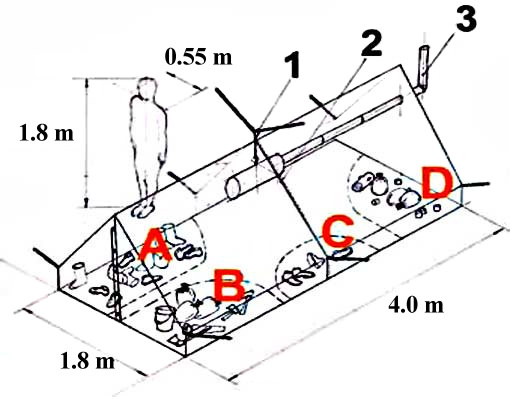 This scheme depicts the state of the groups last minutes quiet routine. 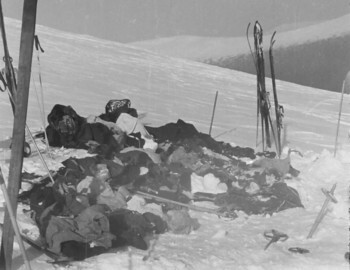 Everything seems orderly and normal except the pile of shoes in area A. 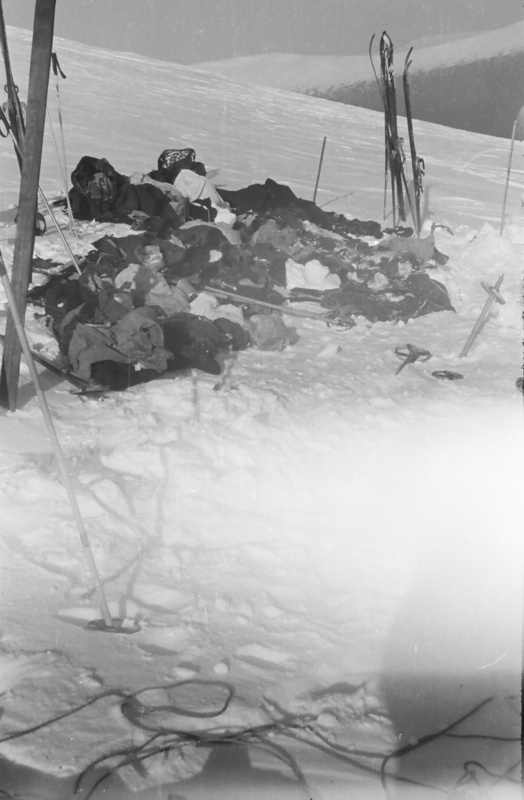 Even if there some shoes there left for the night the chaos of the footwear piled on top is uncharacteristic for the scene. 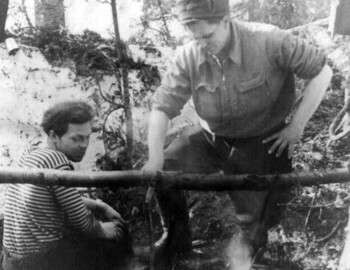 Igor Dyatlov created this suspended stove, on the drawing the chimney is assembled and the stove is showing suspended but the search party found them on the floor of the tent. 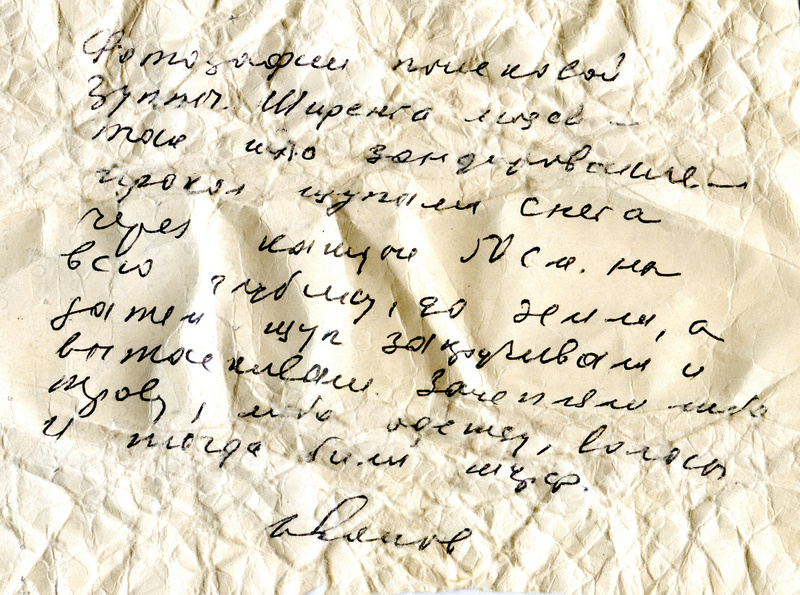 Near the entrance of the tent was found the satirical propaganda leaflet Dyatlov group put together at the night of the incident "Evening Otorten". 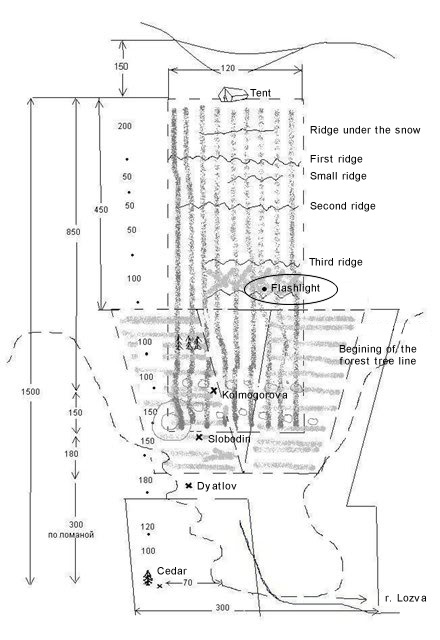 The content of this document is indicative of the mood inside the group and the fact they had the time to write it. 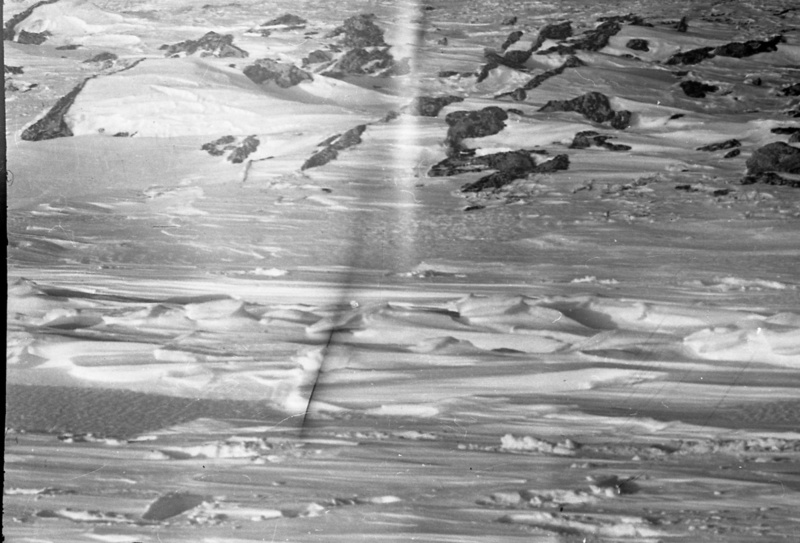 Later on, an innocent reference from this flyer will become the sand grain that grew the pearl of the Yeti theory of their demise. 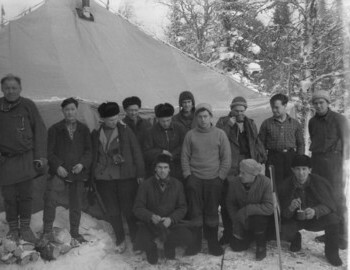 Here is the original and translated Evening Otorten №1. 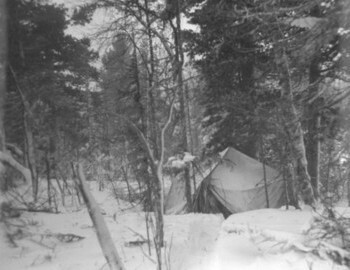 The entrance of the tent was looking south. 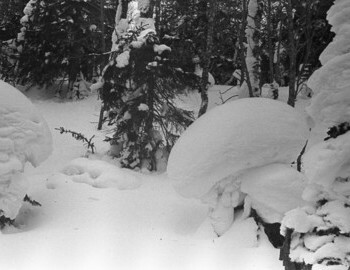 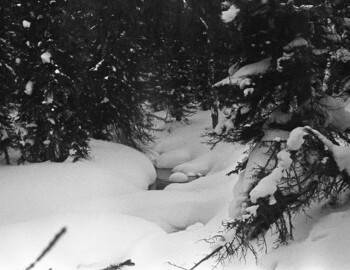 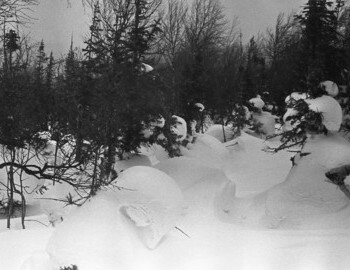 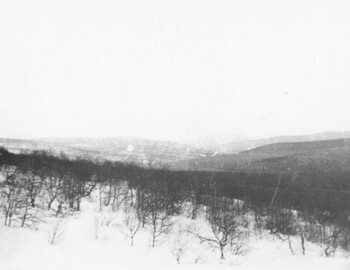 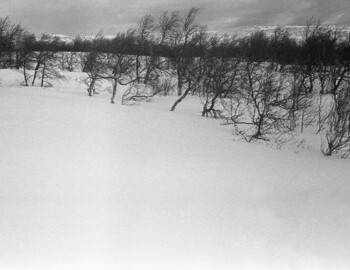 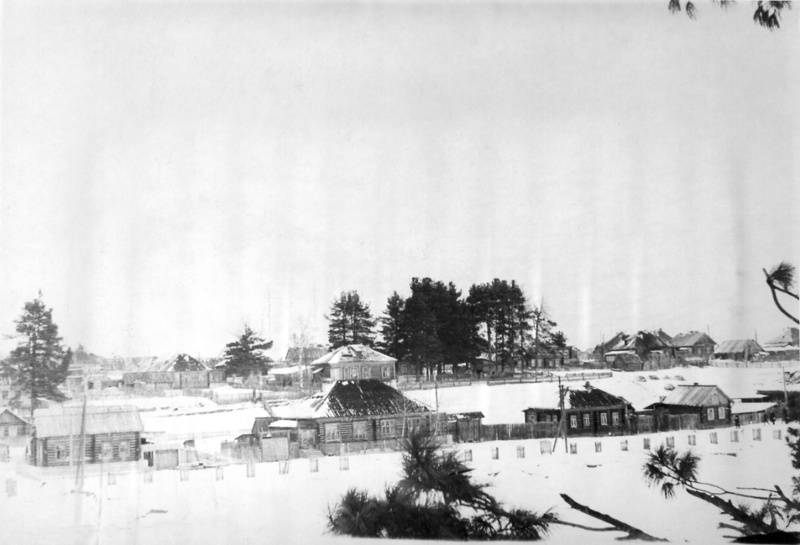 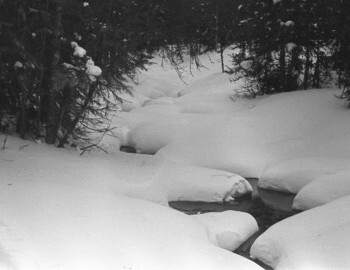 The north part was covered with 15-20 cm of snow. 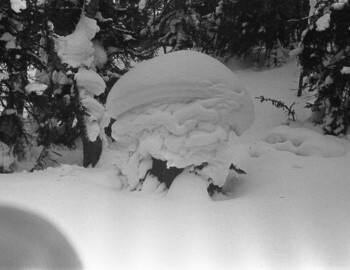 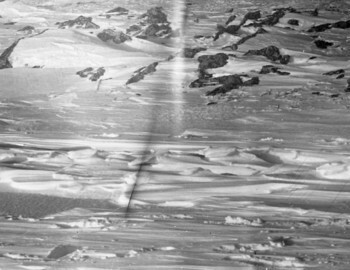 It was concluded from general appearance and density that it was not a result of an avalanche but blown by the wind. 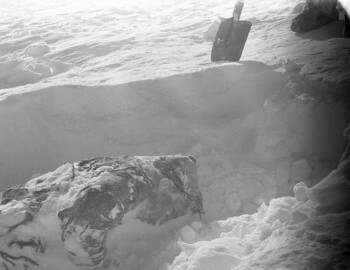 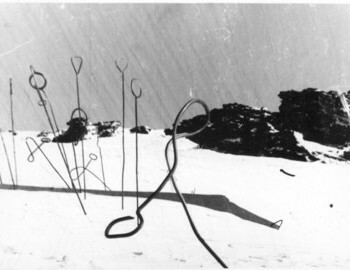 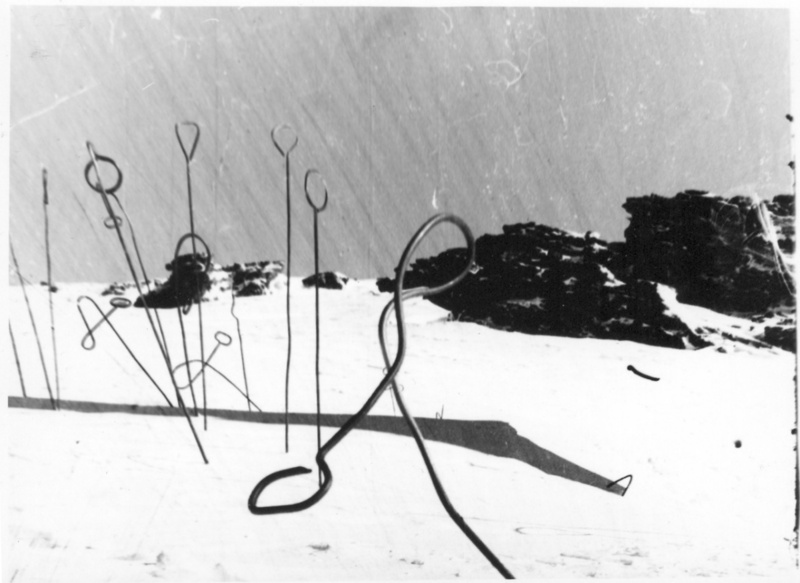 Near the tent, a pair of skis were sticking out from the snow (they couldn't remain like this if there was an avalanche), and at the entrance of the tent in the snow was an ice axe. 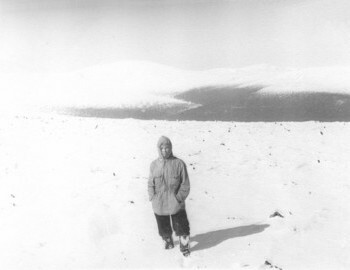 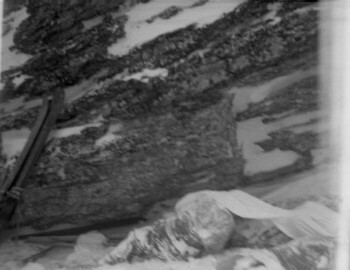 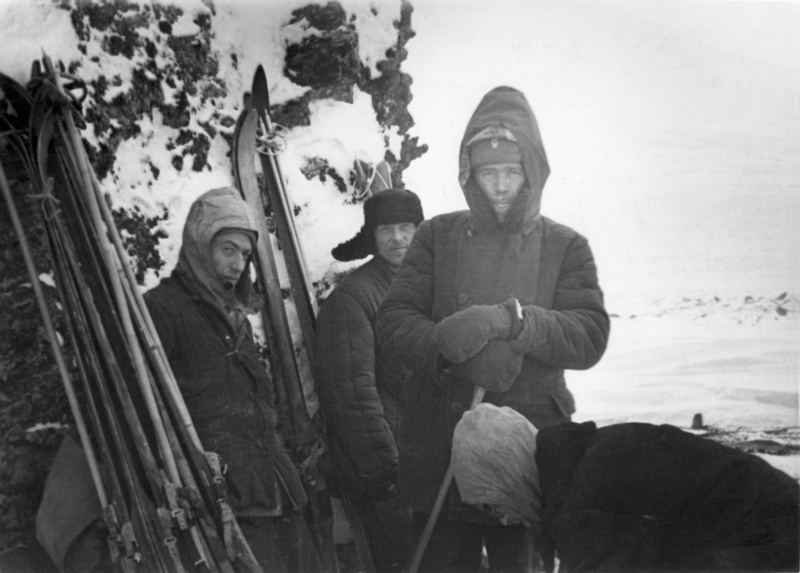 Near the ice axe was lying Dyatlov's jacket. 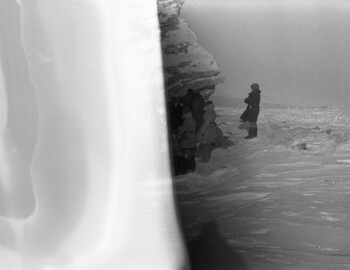 In the pockets was a penknife on a carabiner and a pocketbook with Zina Kolmogorova's photo inside. The objects didn't shed any light about what happened, but it was strange that Dyatlov took off his jacket outside the tent. 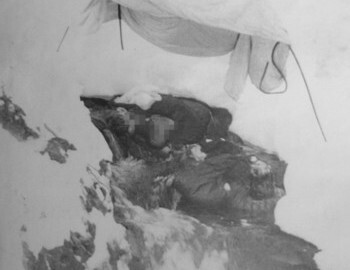 On the side of the tent on top of 10 cm of snow laid Dyatlov's flashlight (made in China). 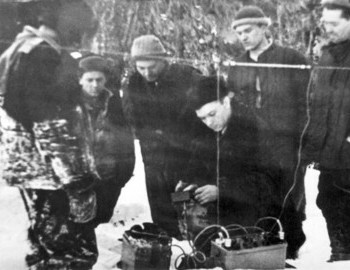 Boris Slobtzov picked it up and turned it on - the flashlight was in working condition. 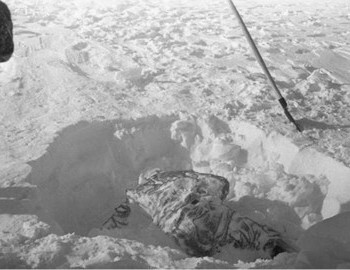 From Slobtsov witness testimony (sheet 299) "we couldn’t understand why the snow under the flashlight was 10 cm thick, yet there wasn’t any on the flashlight itself". 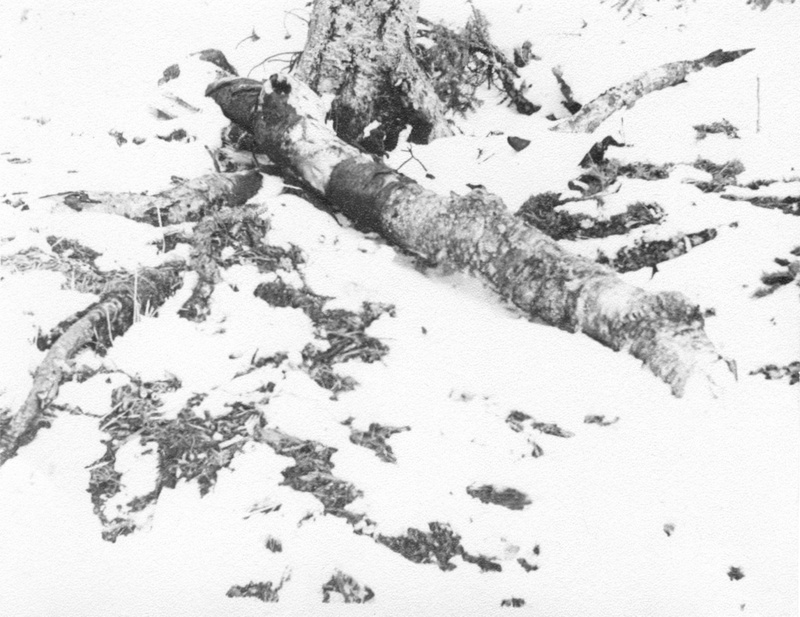 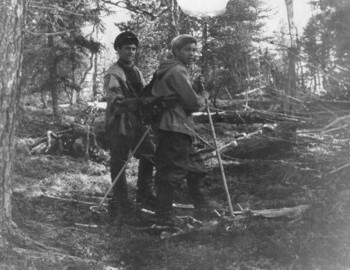 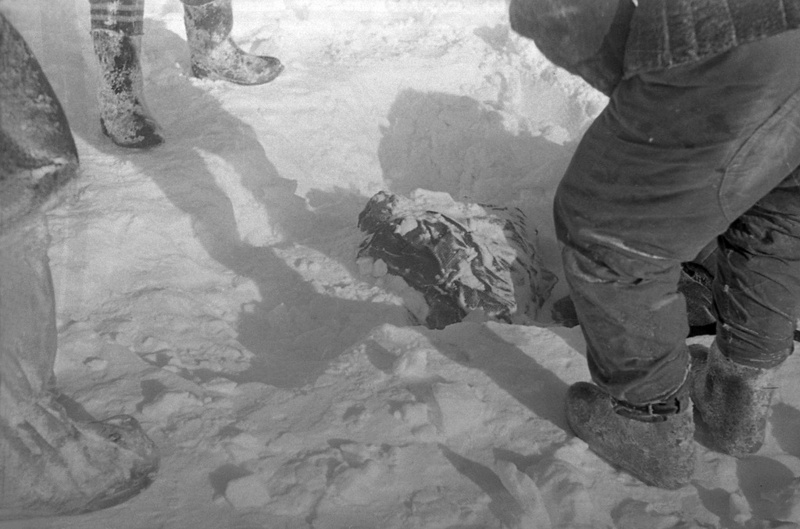 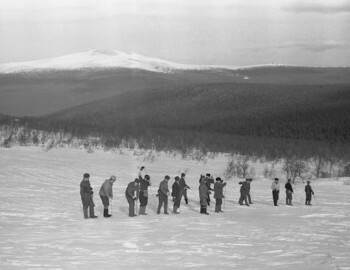 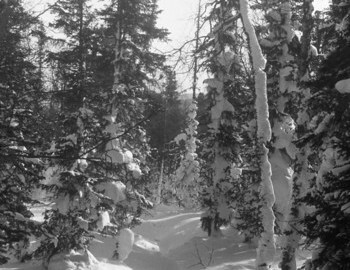 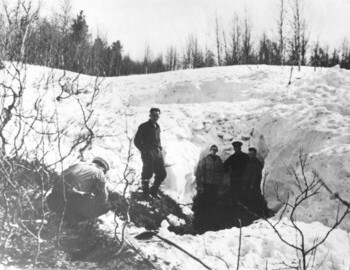 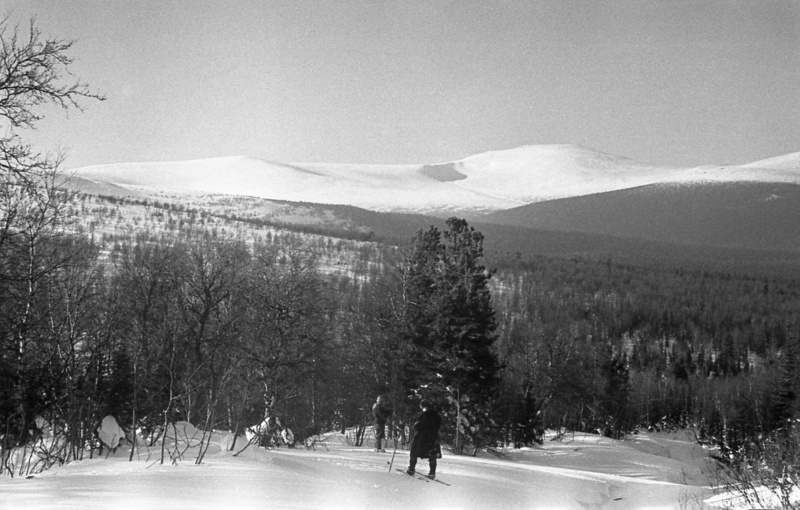 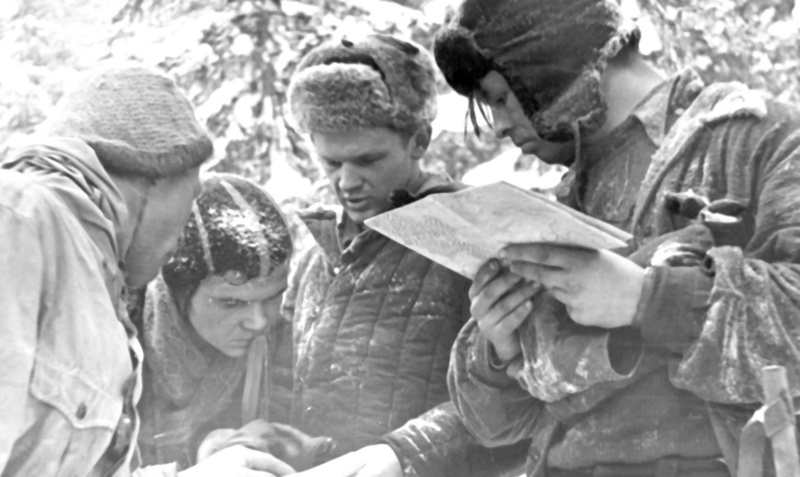 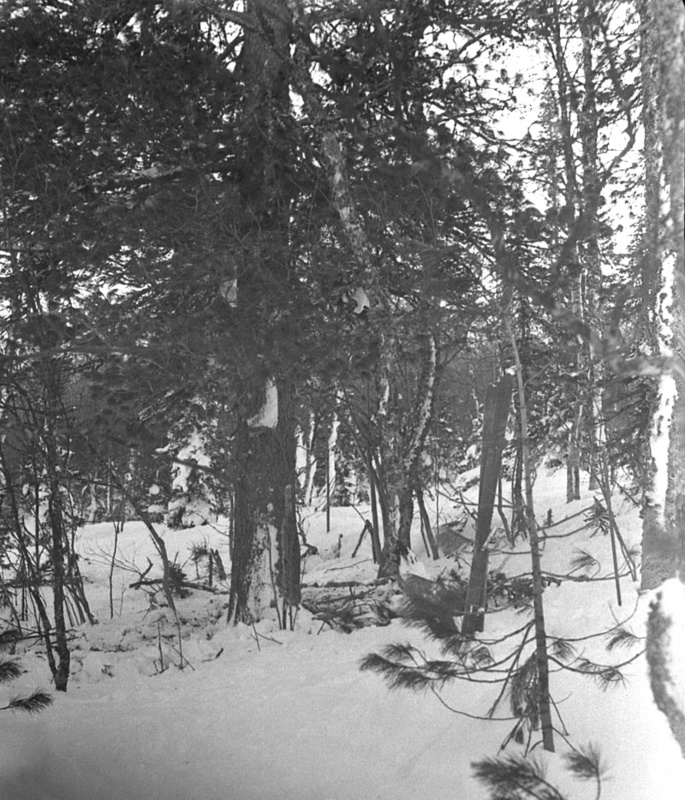 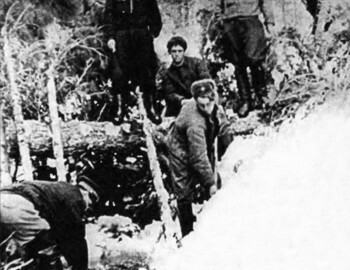 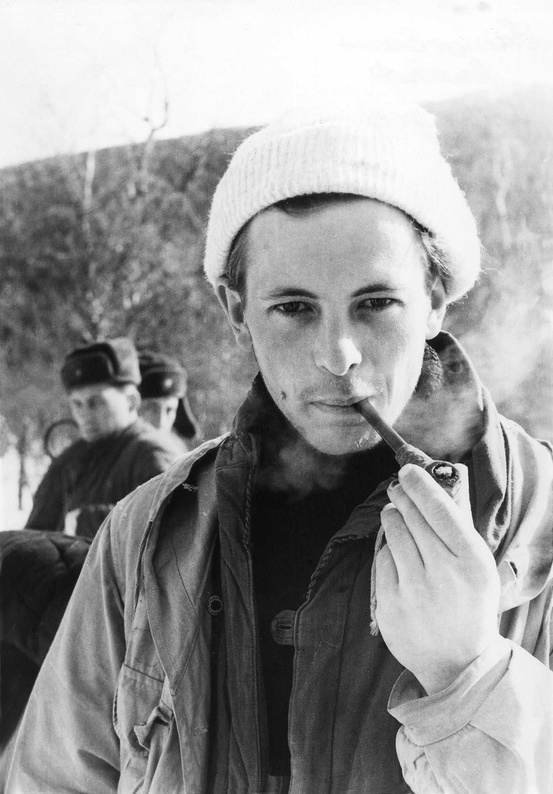 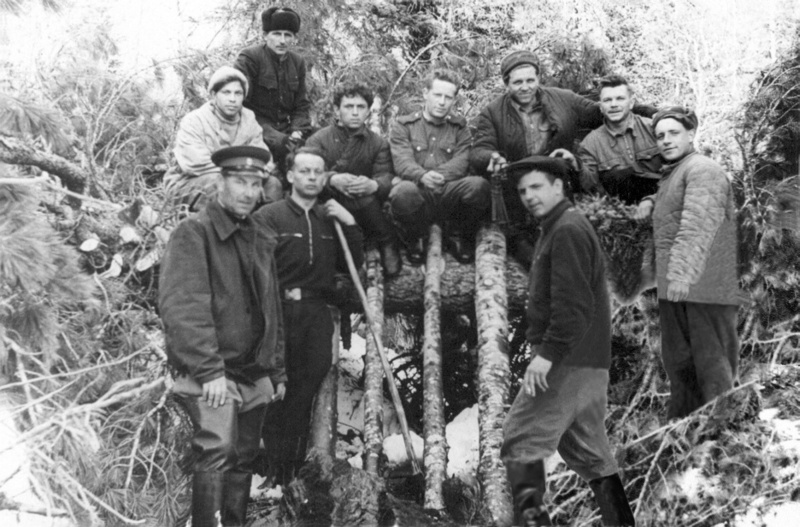 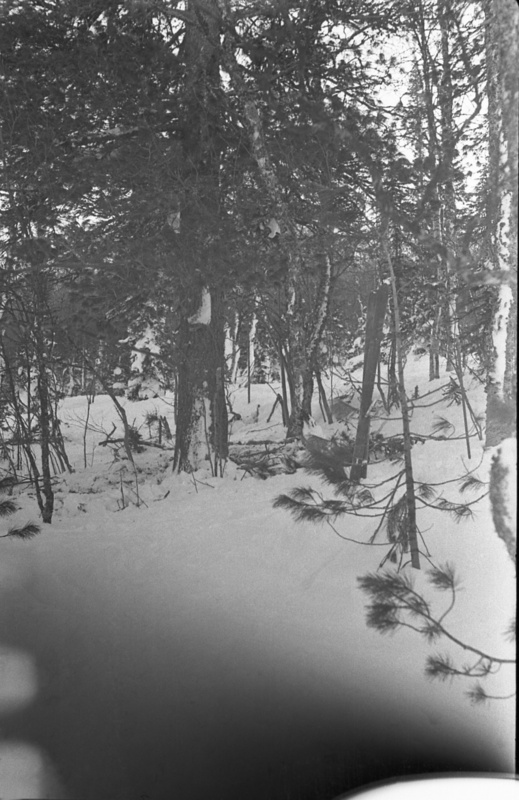 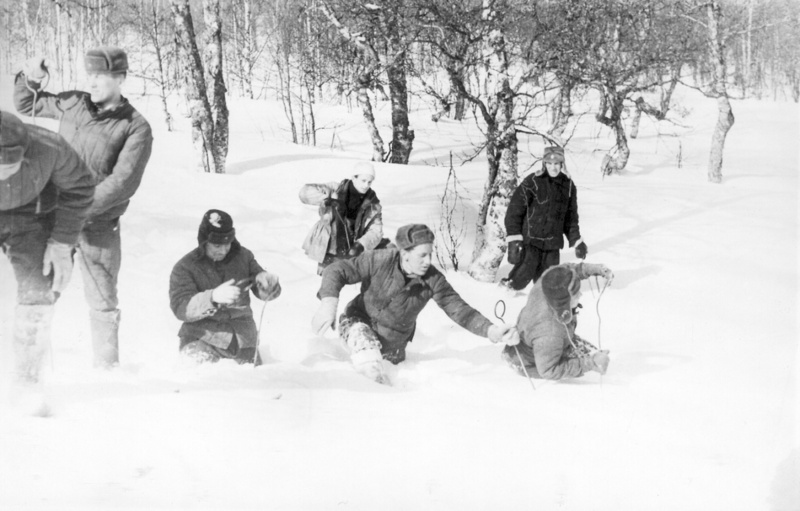 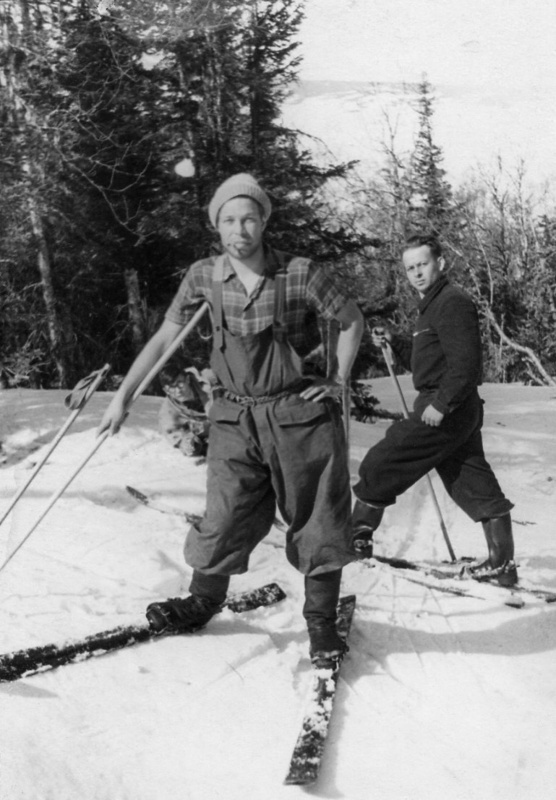 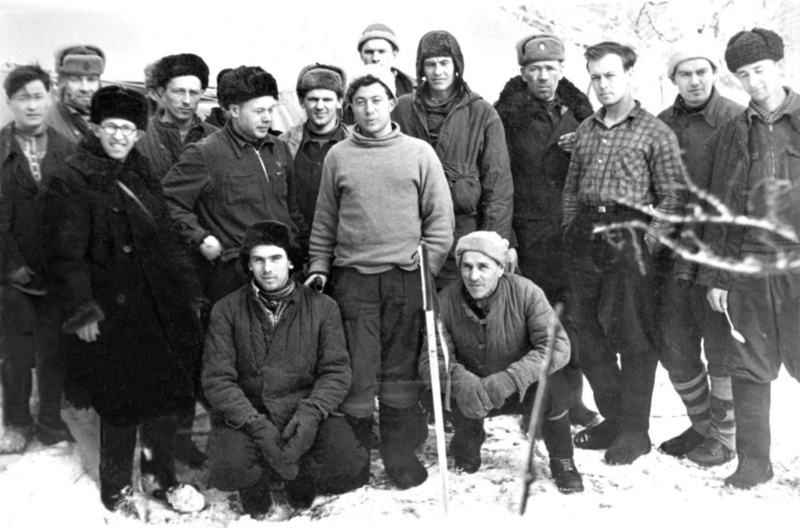 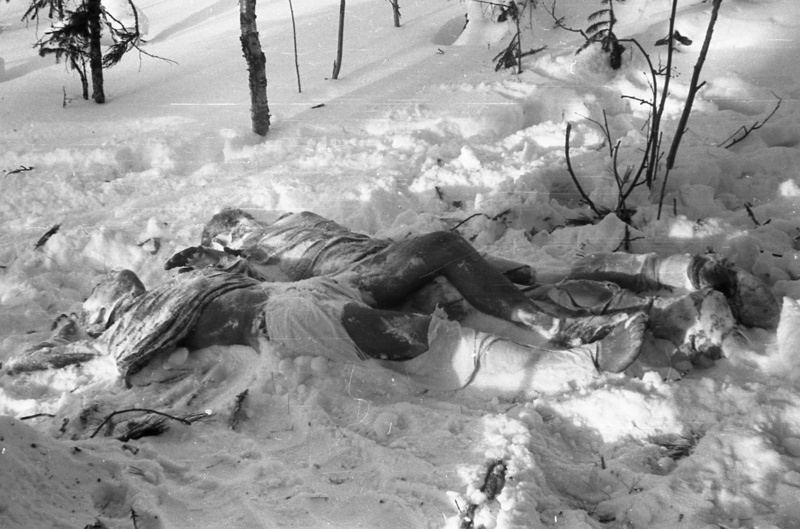 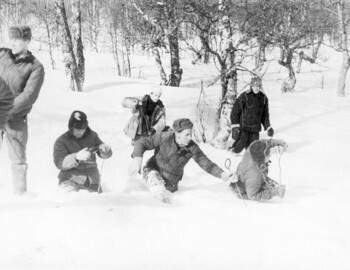 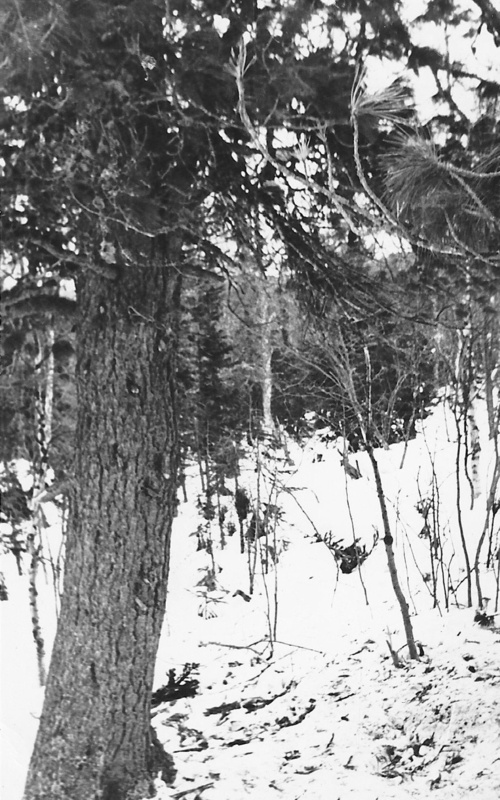 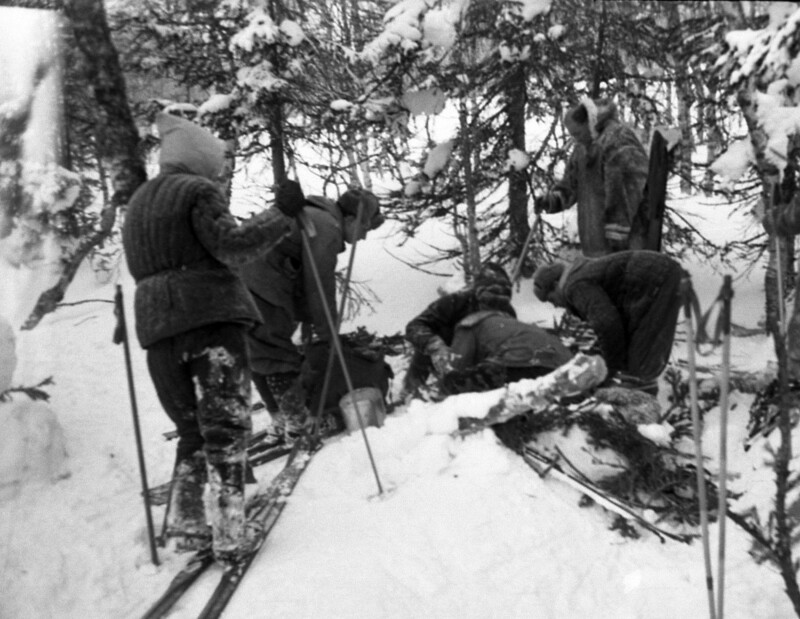 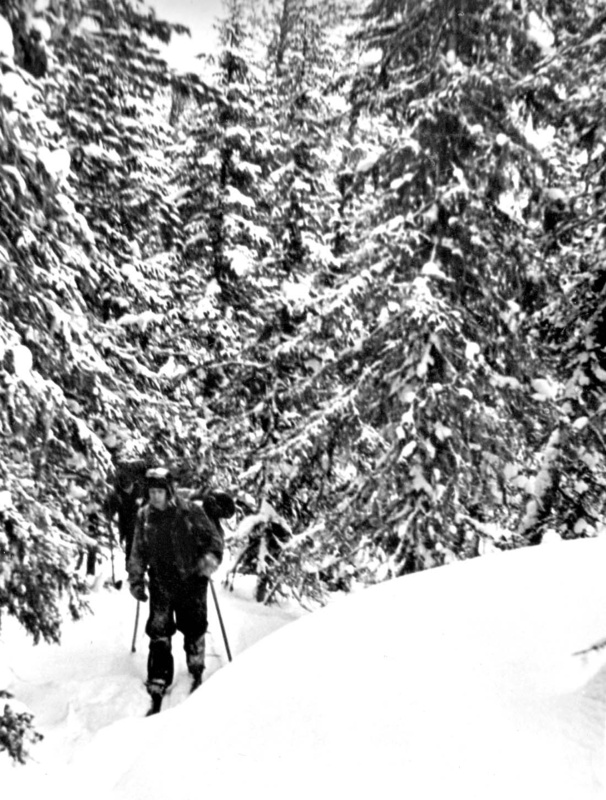 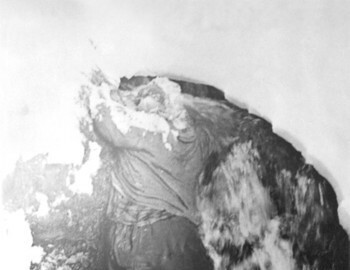 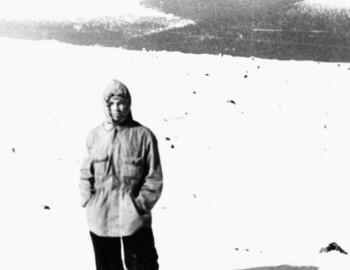 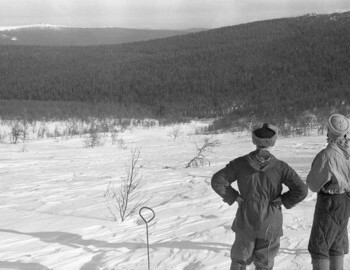 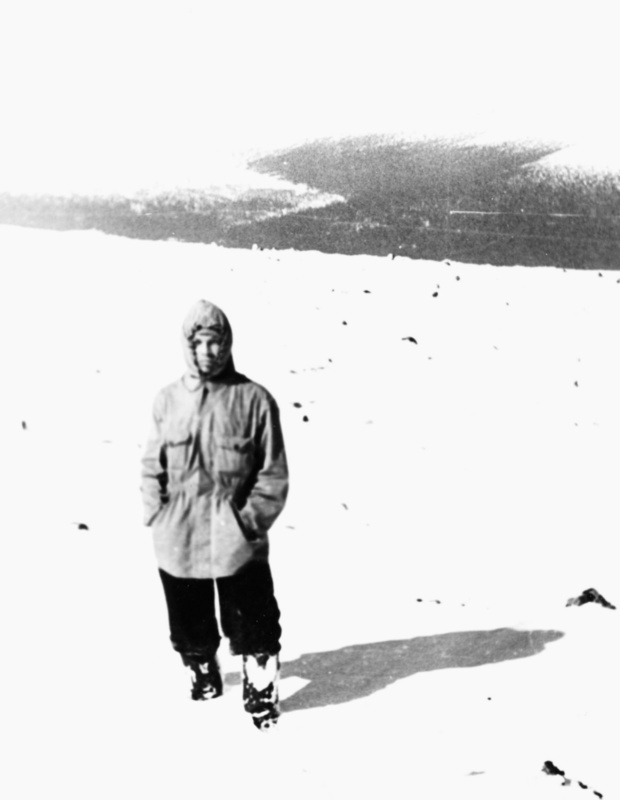 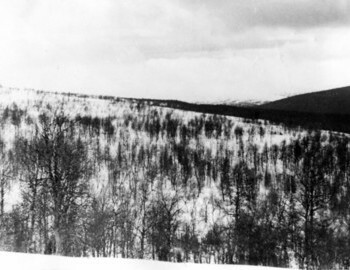 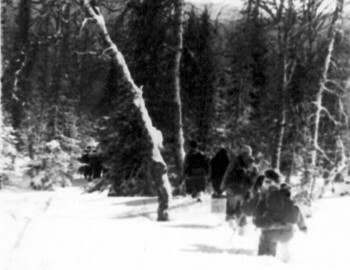 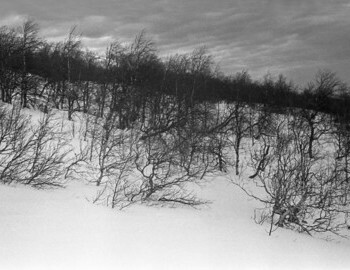 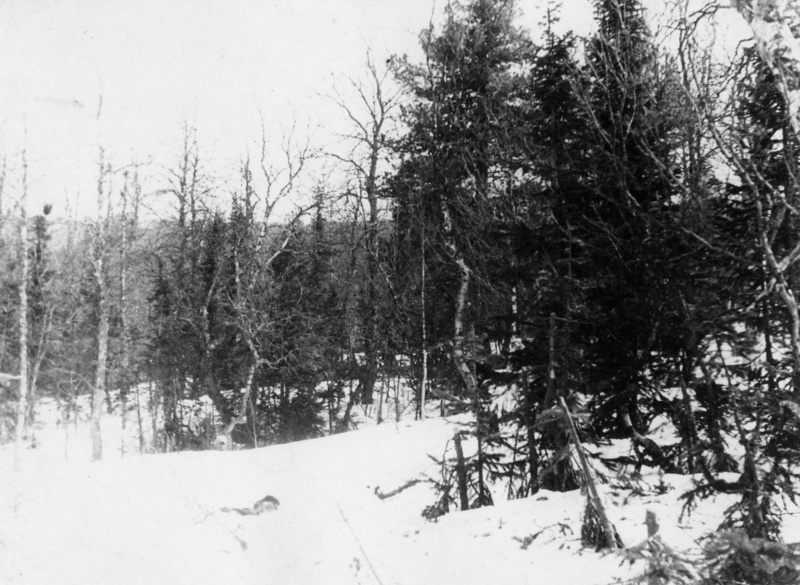 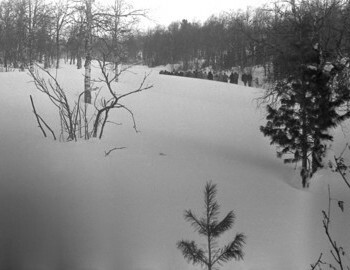 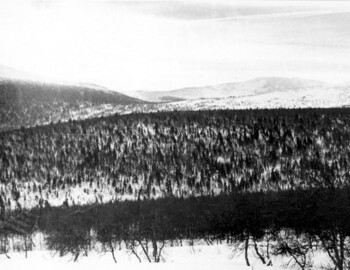 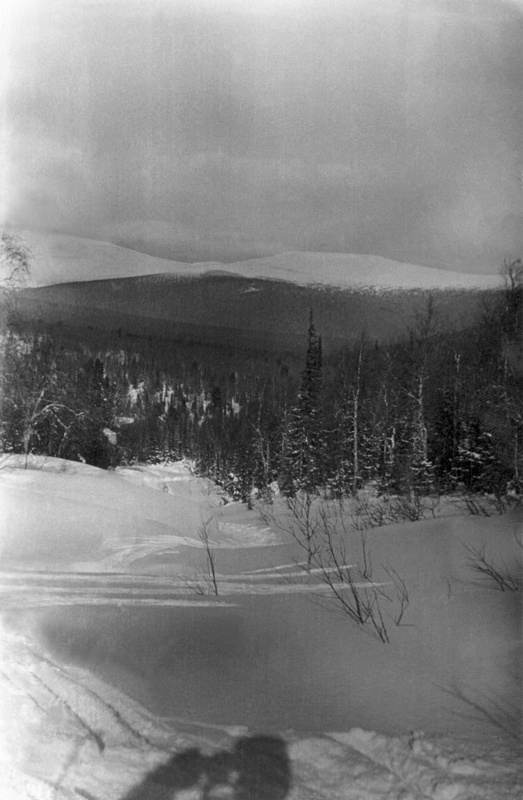 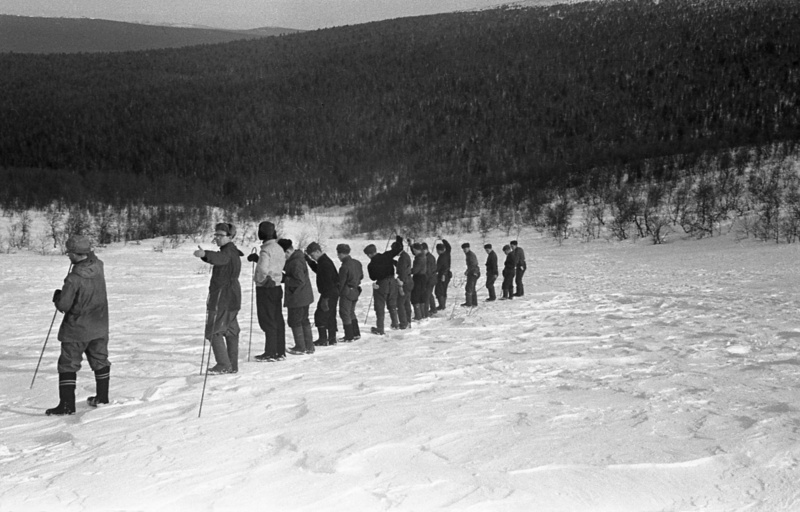 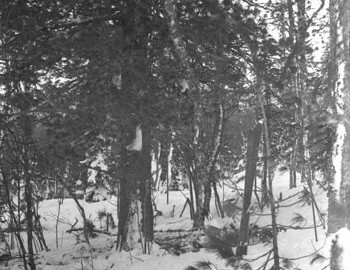 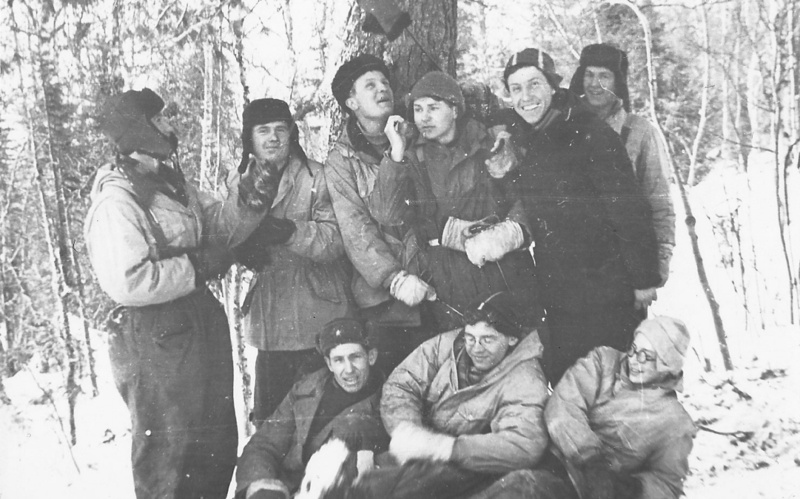 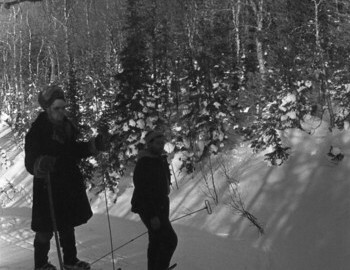 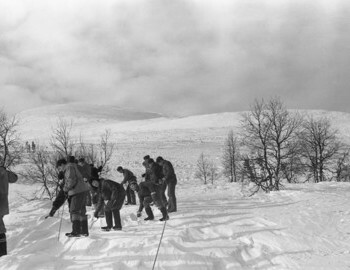 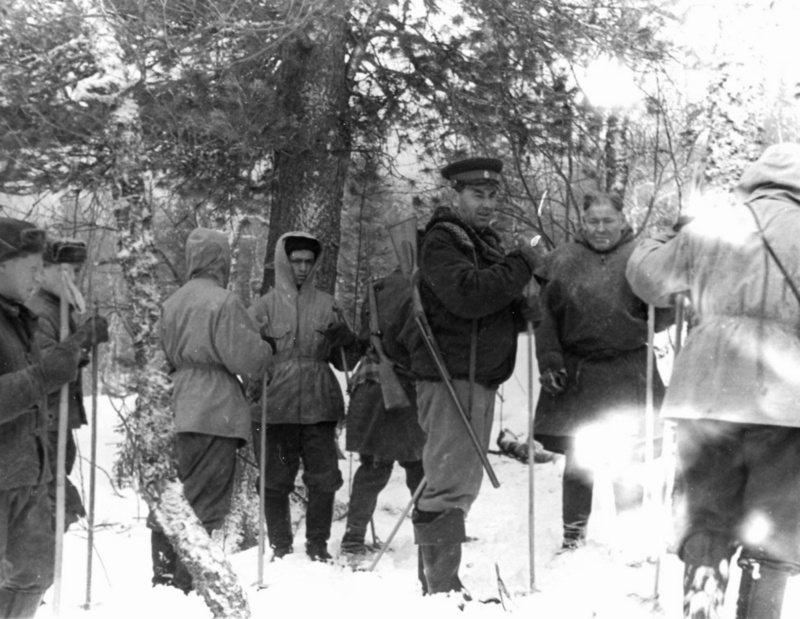 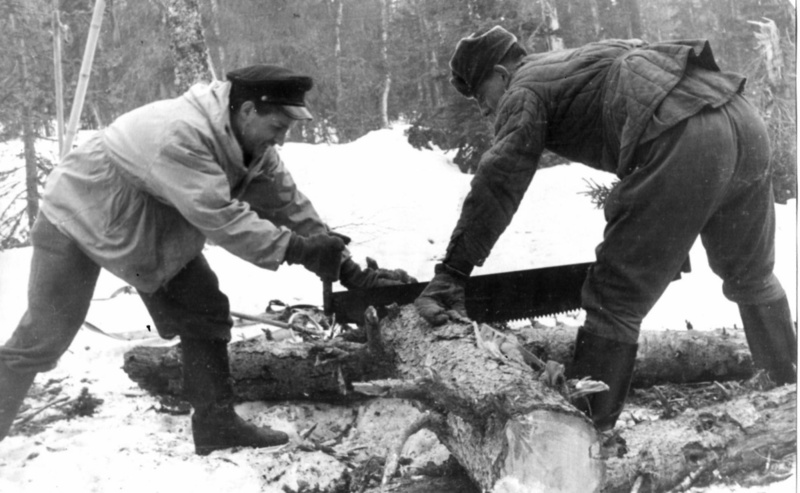 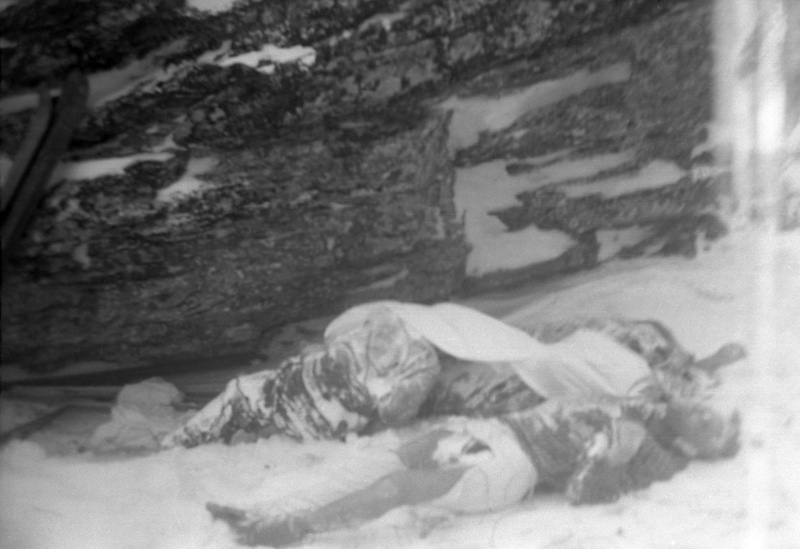 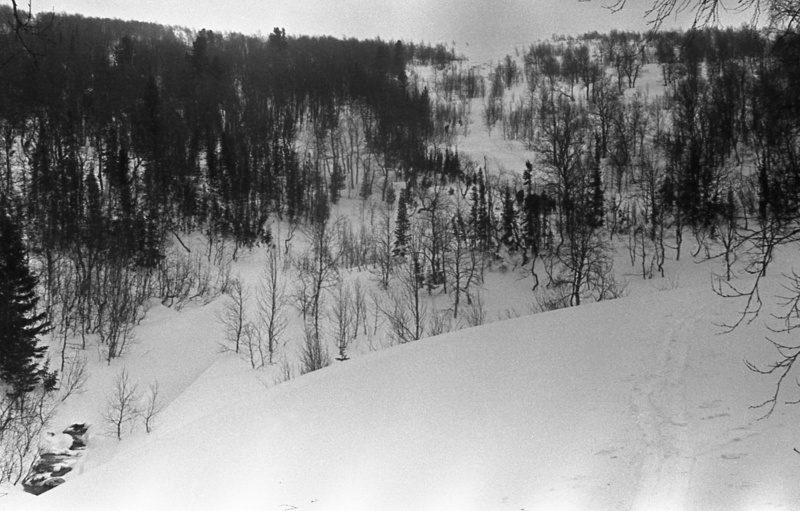 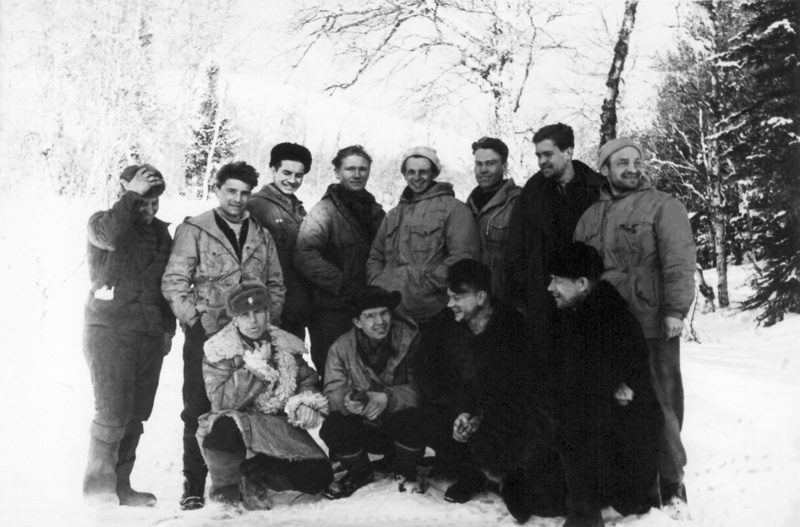 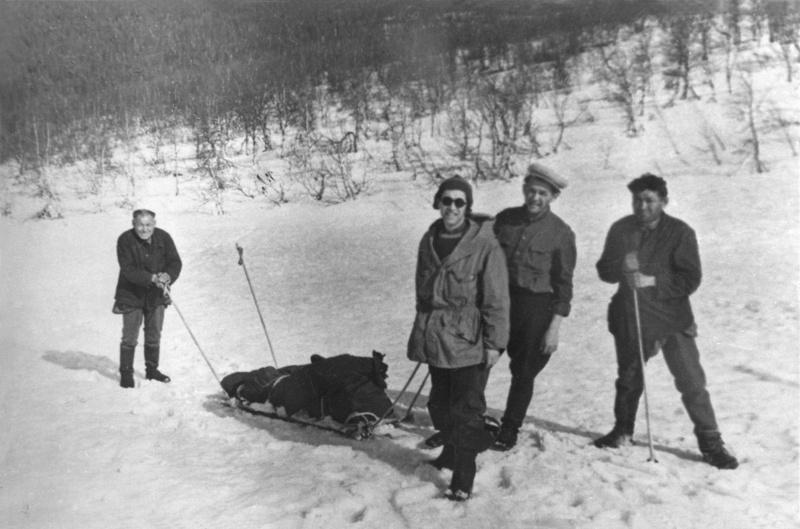 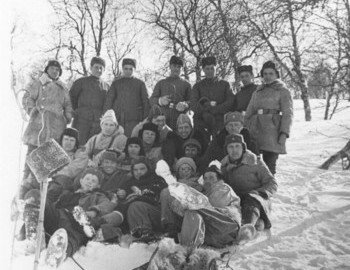 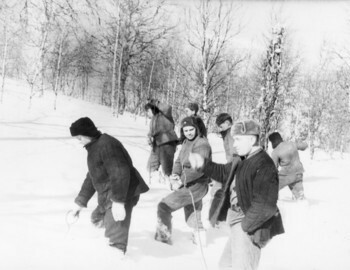 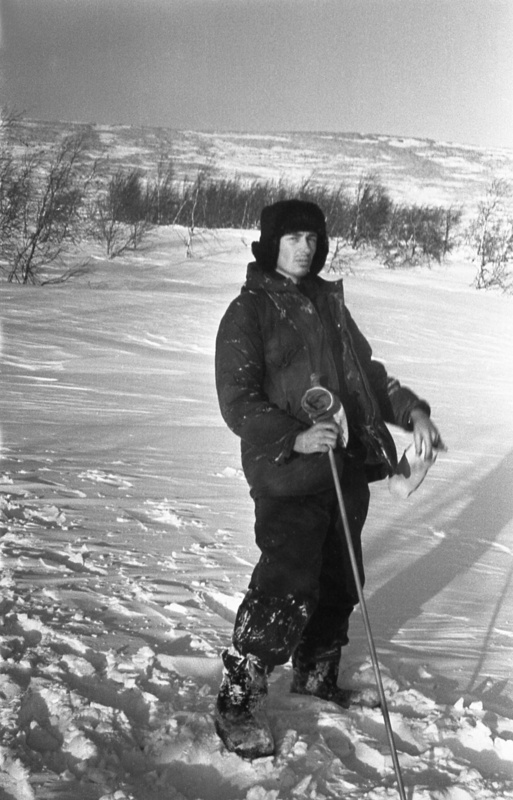 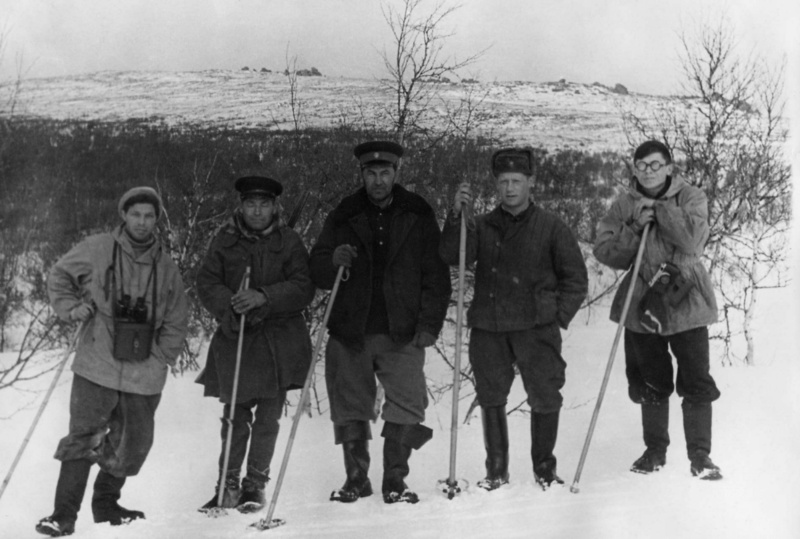 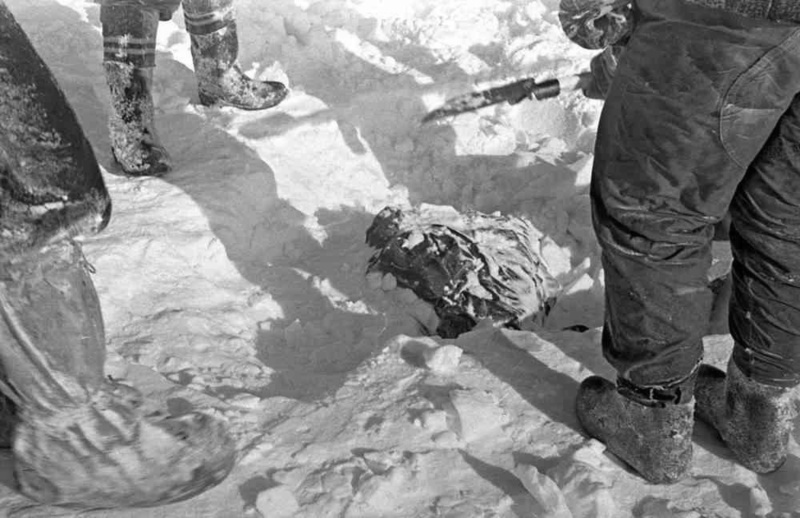 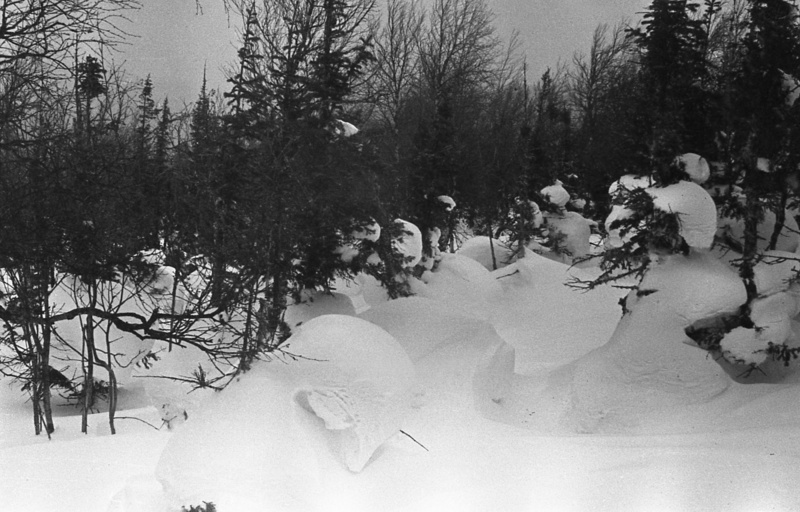 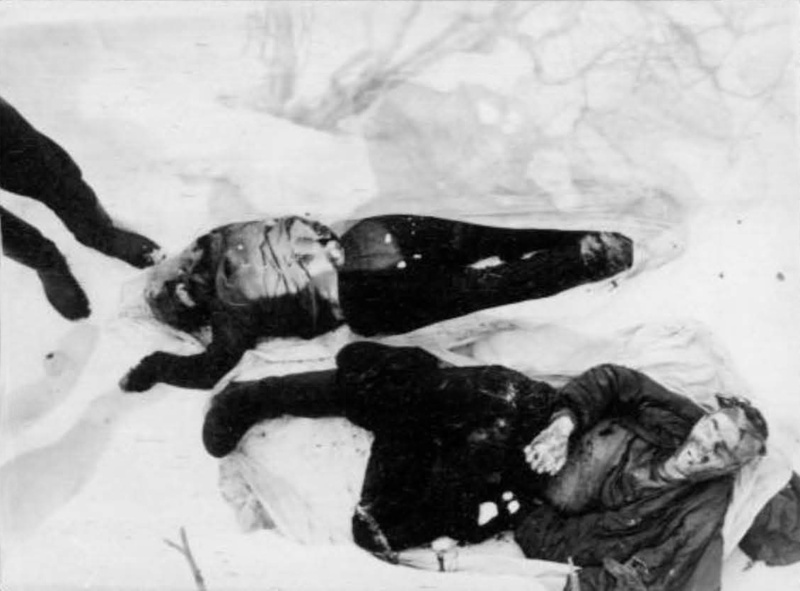 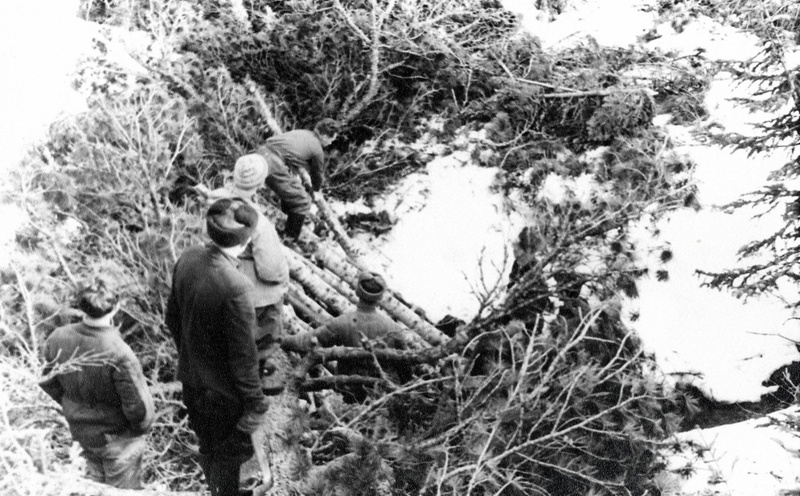 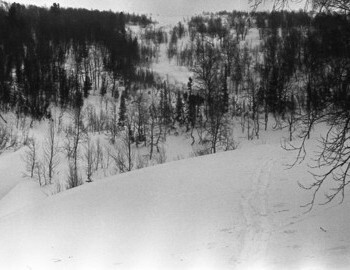 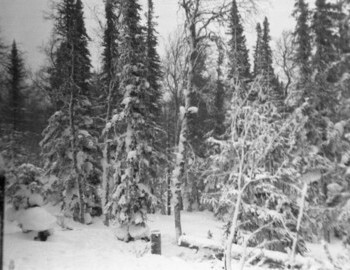 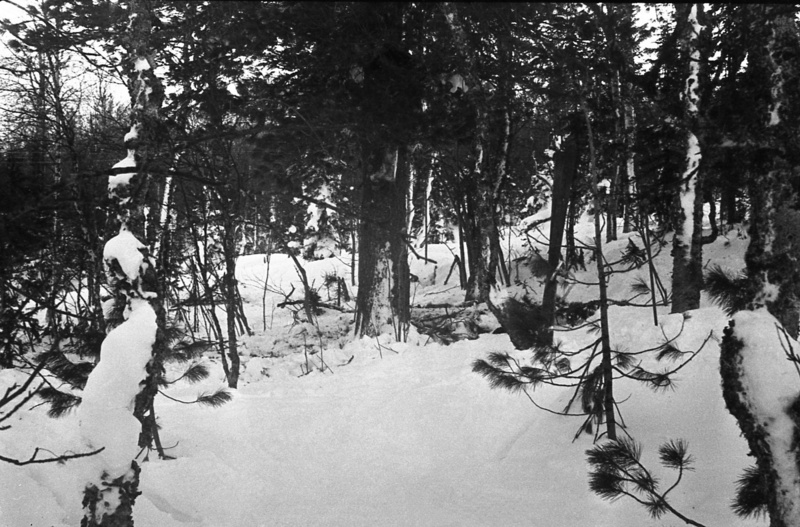 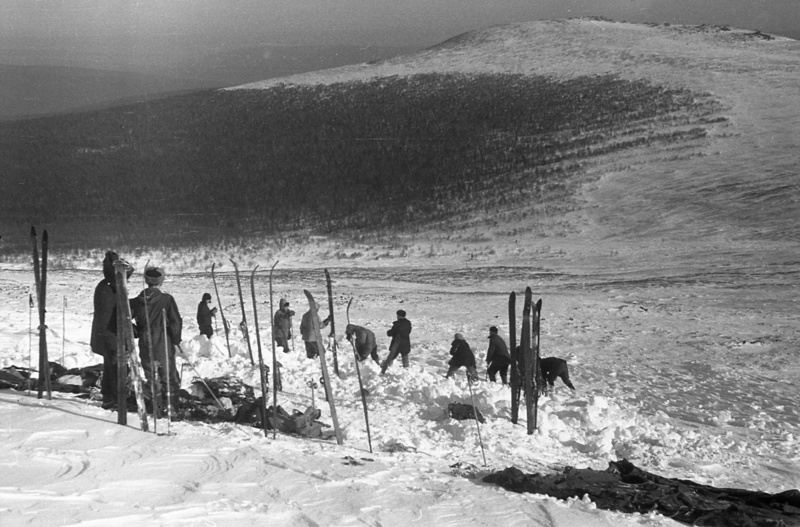 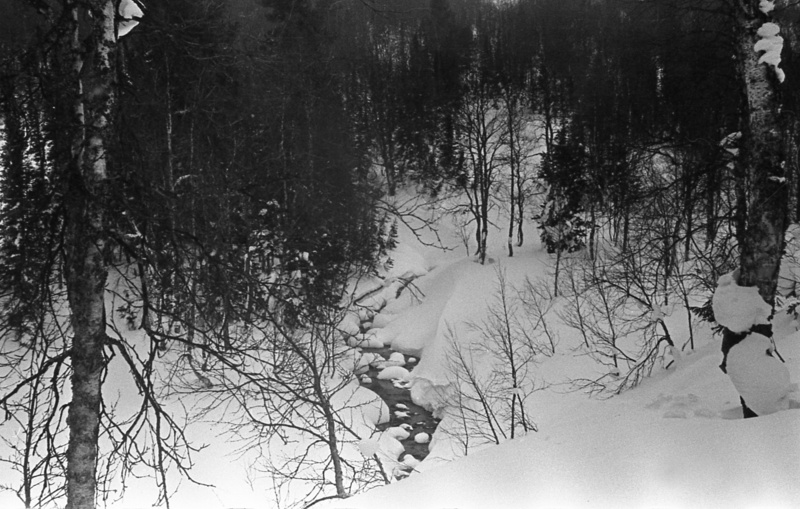 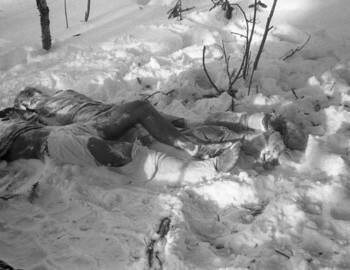 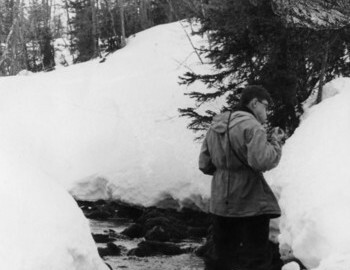 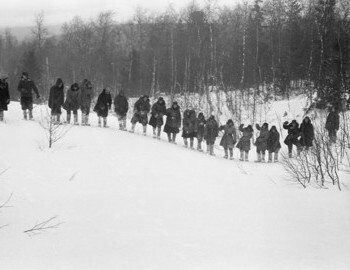 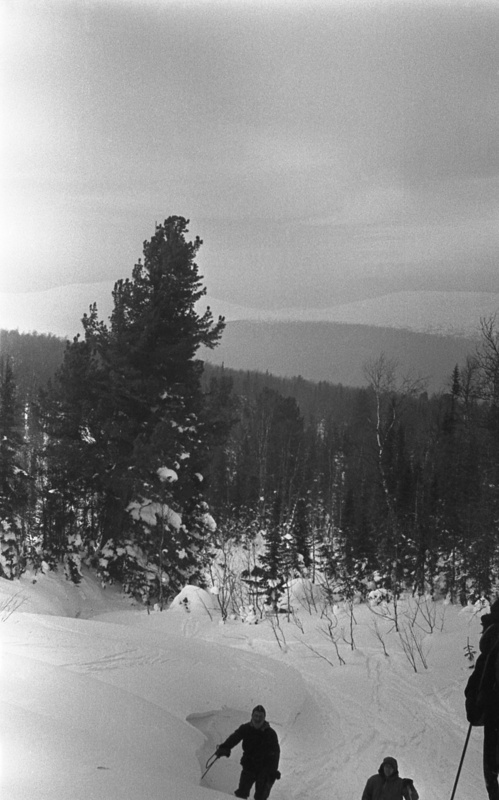 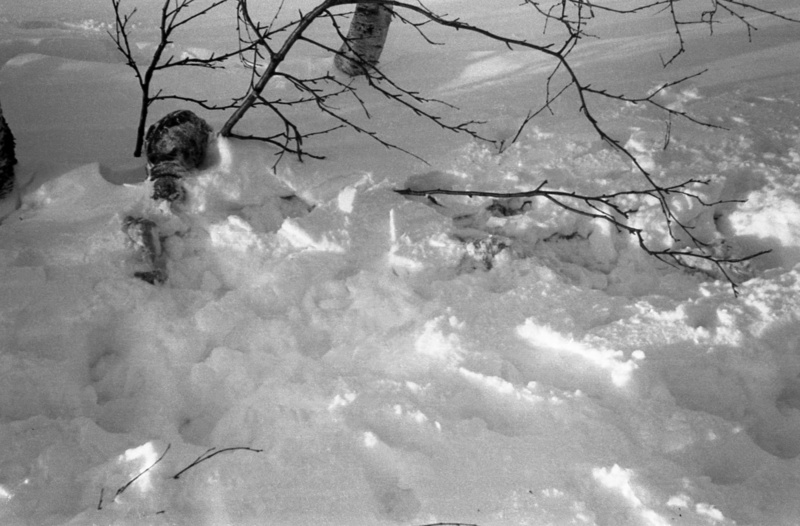 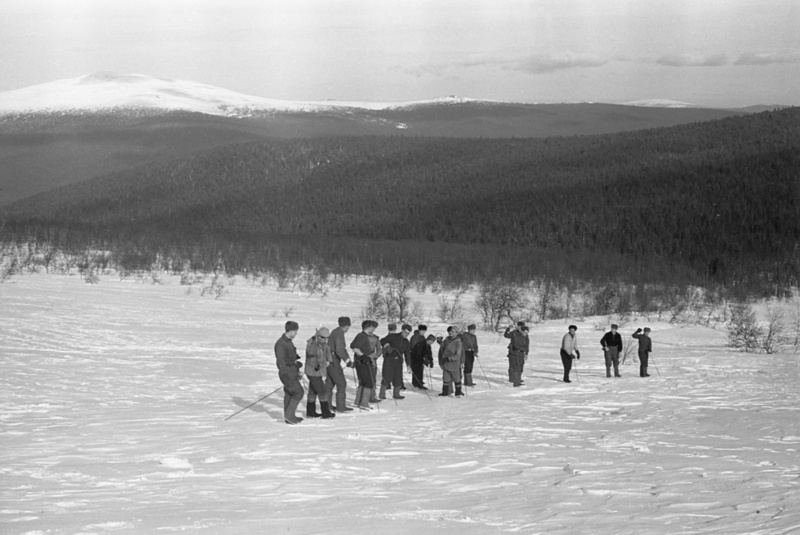 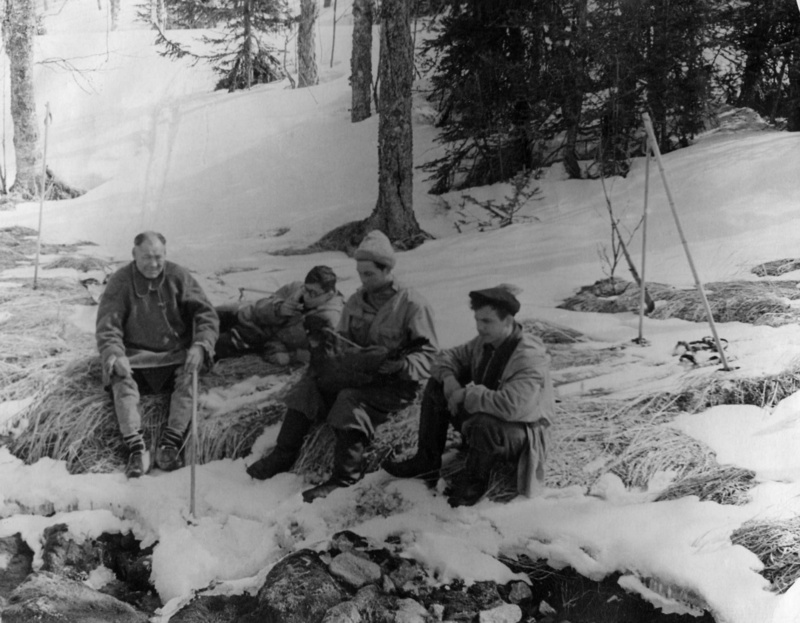 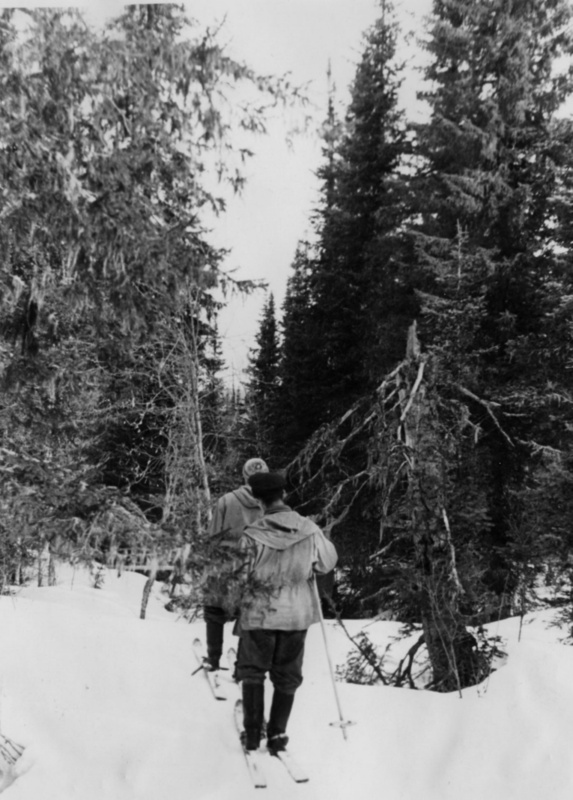 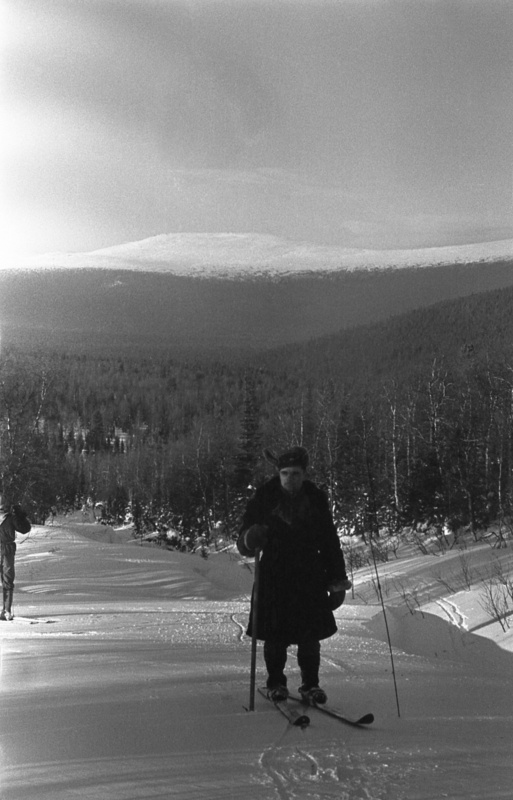 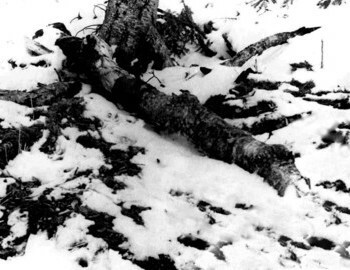 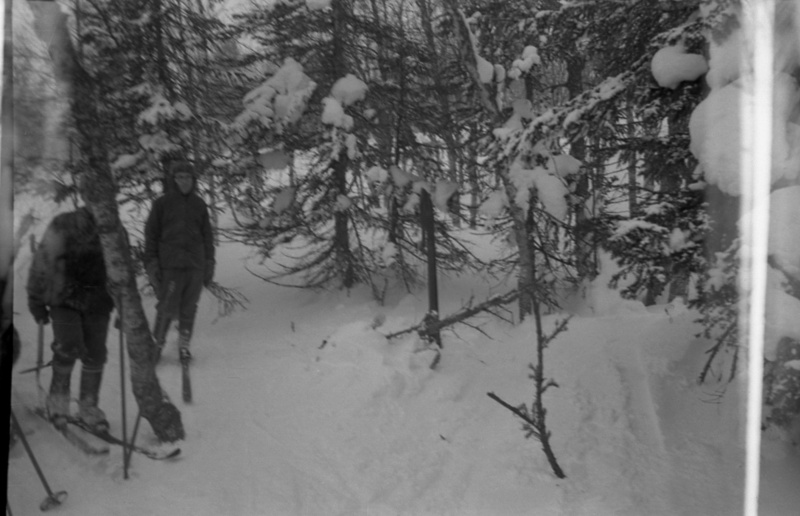 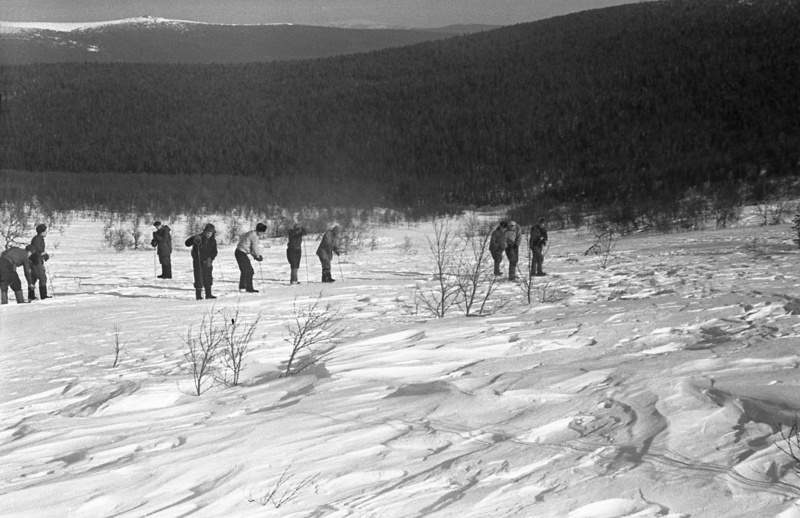 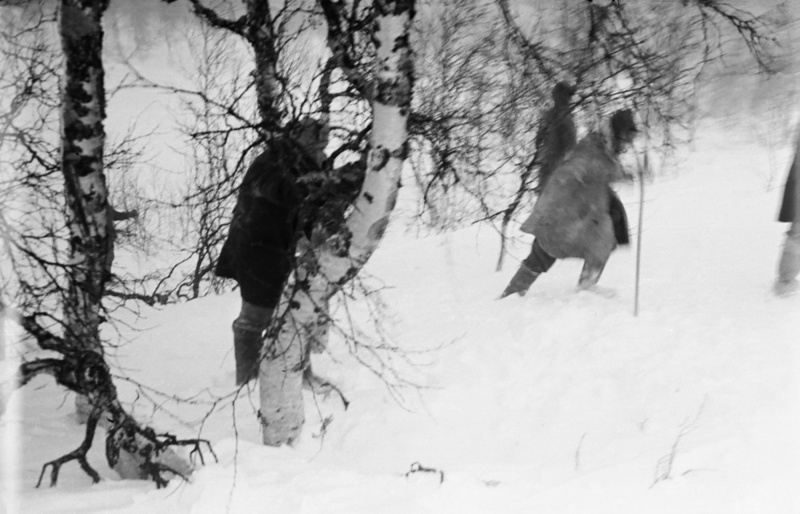 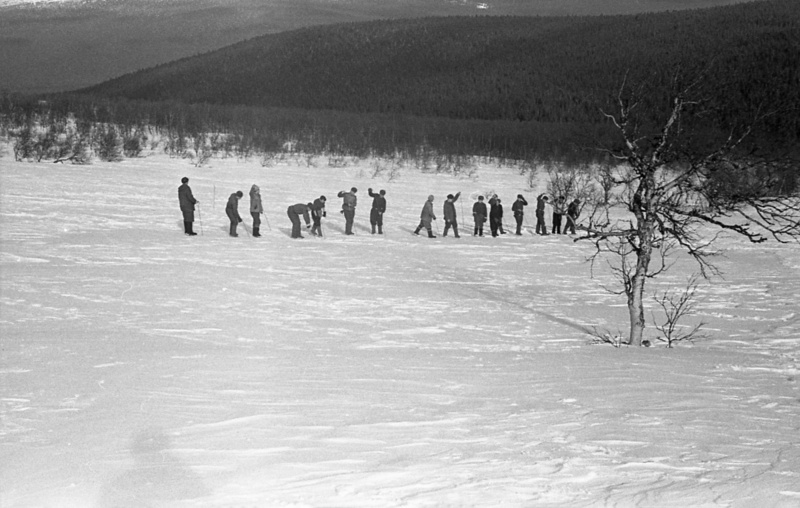 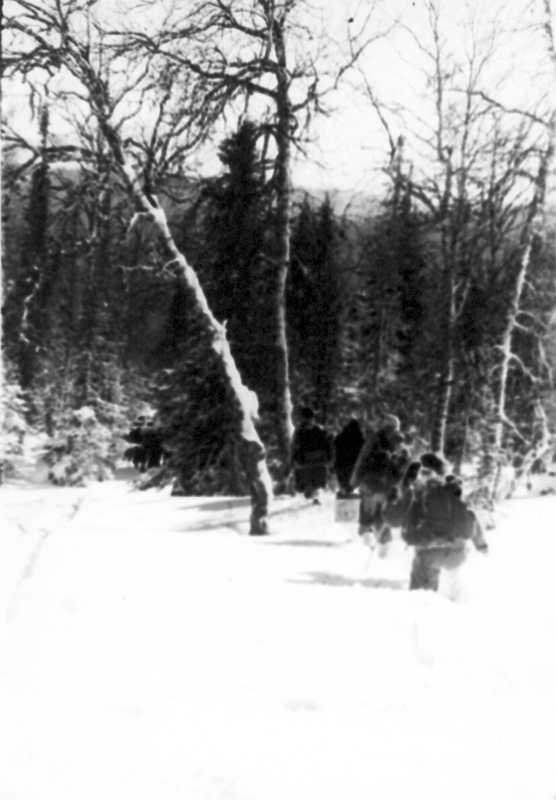 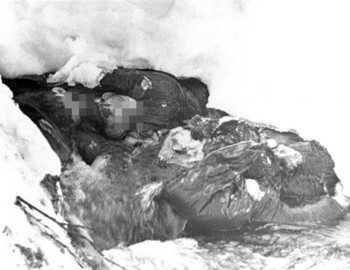 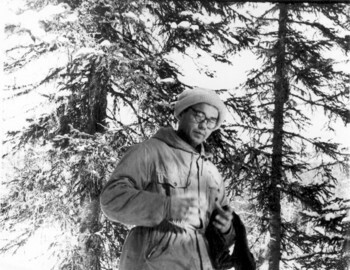 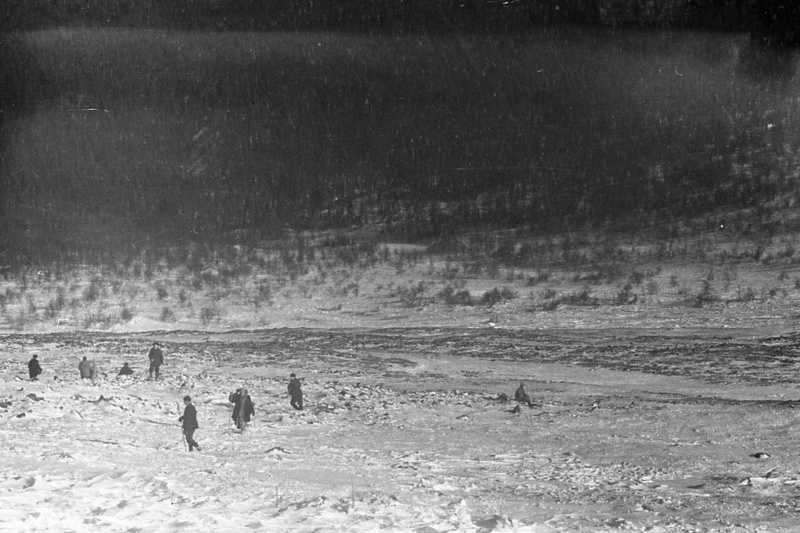 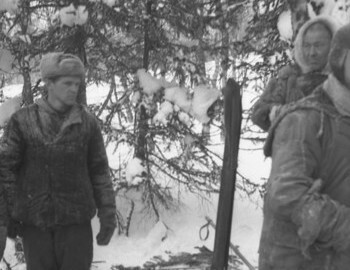 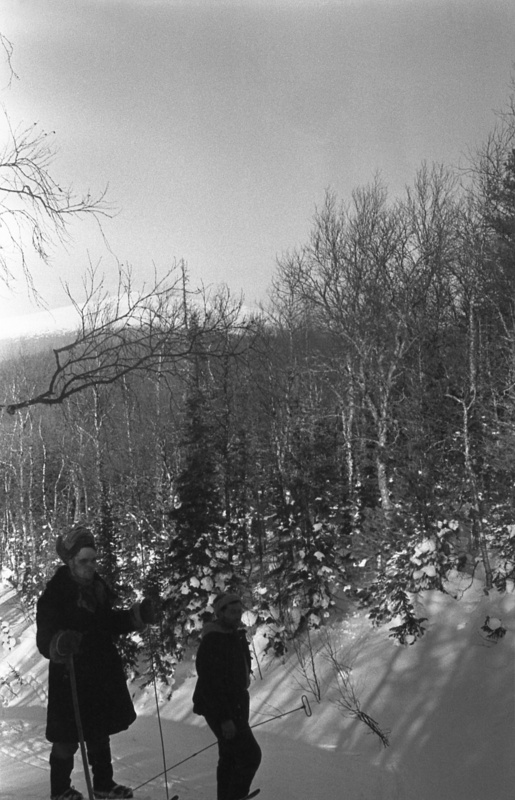 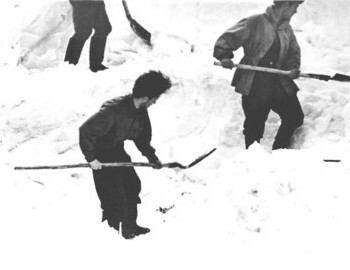 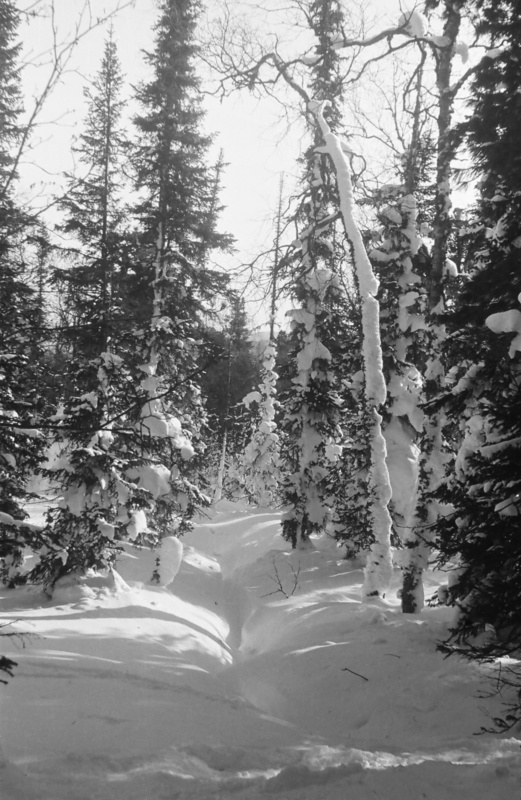 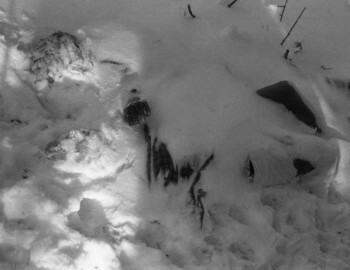 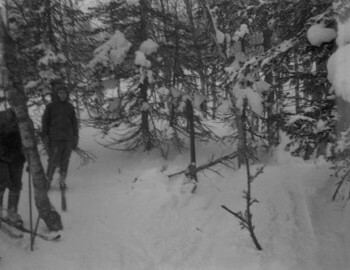 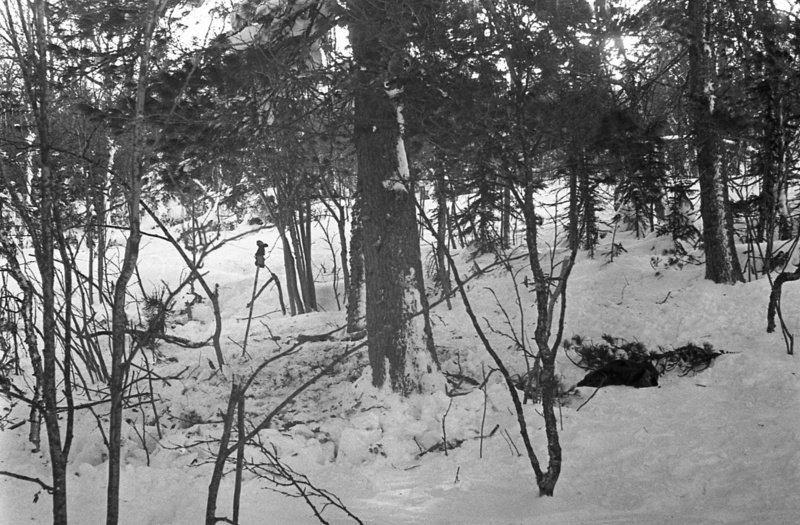 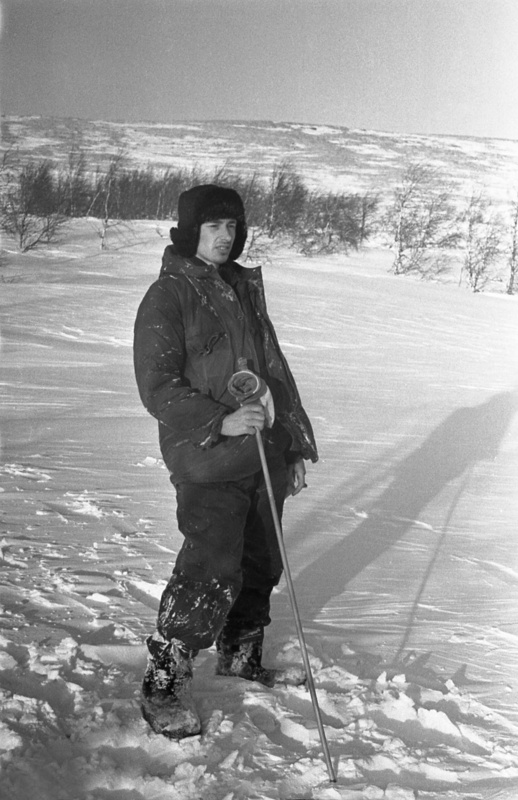 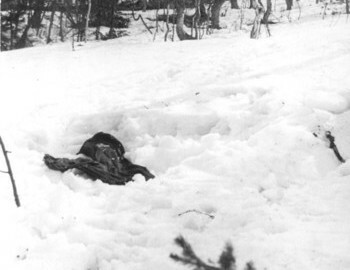 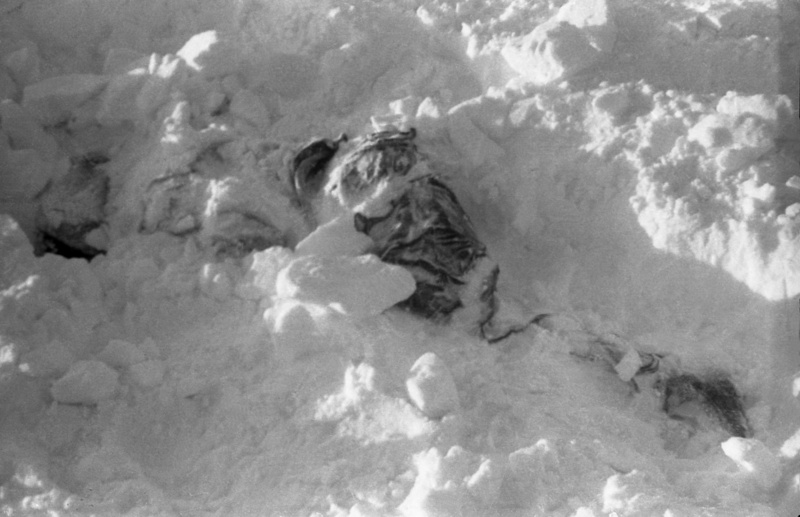 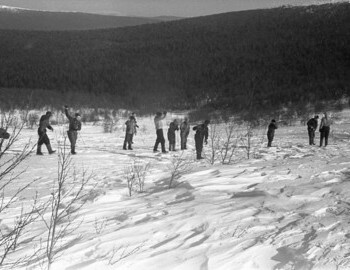 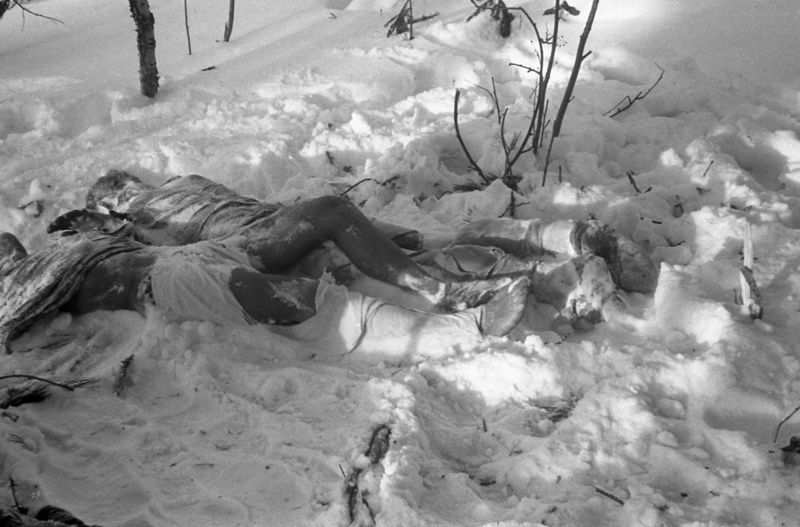 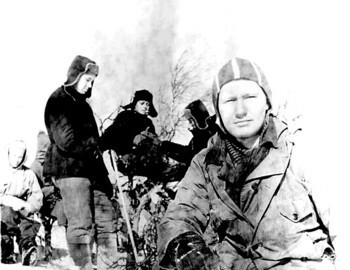 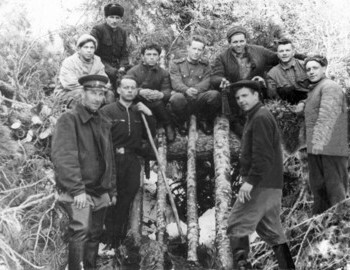 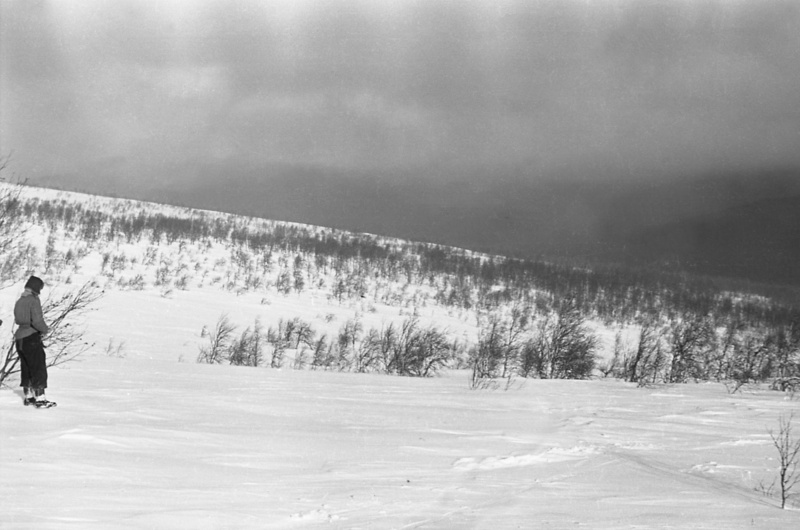 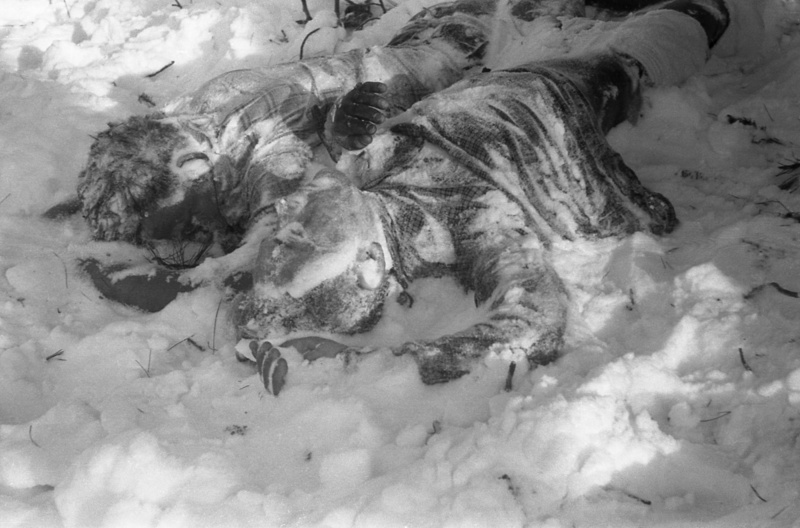 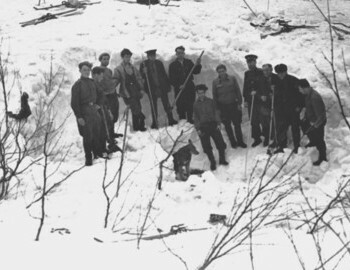 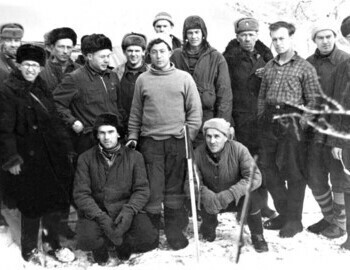 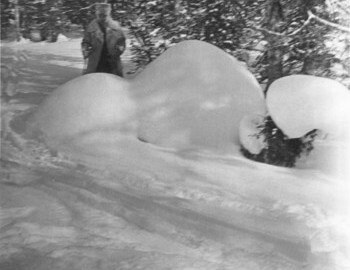 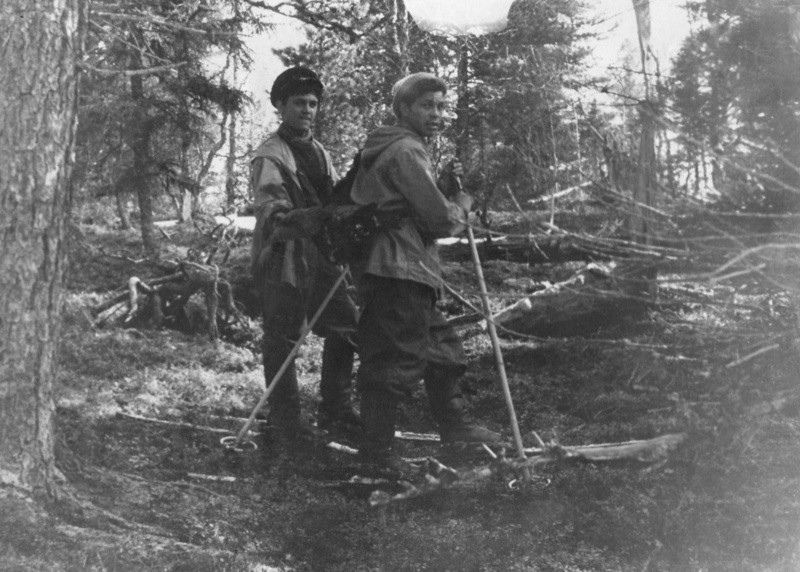 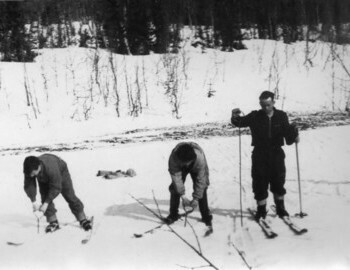 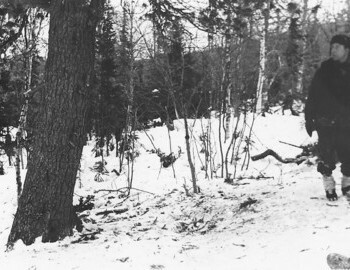 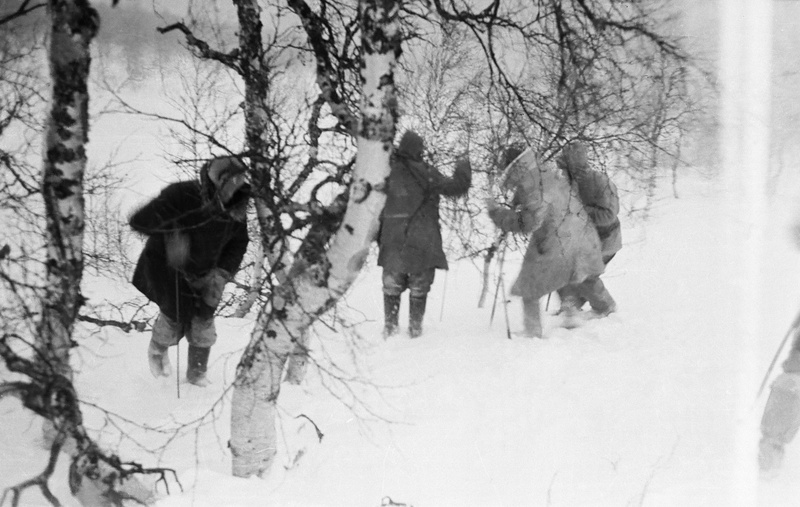 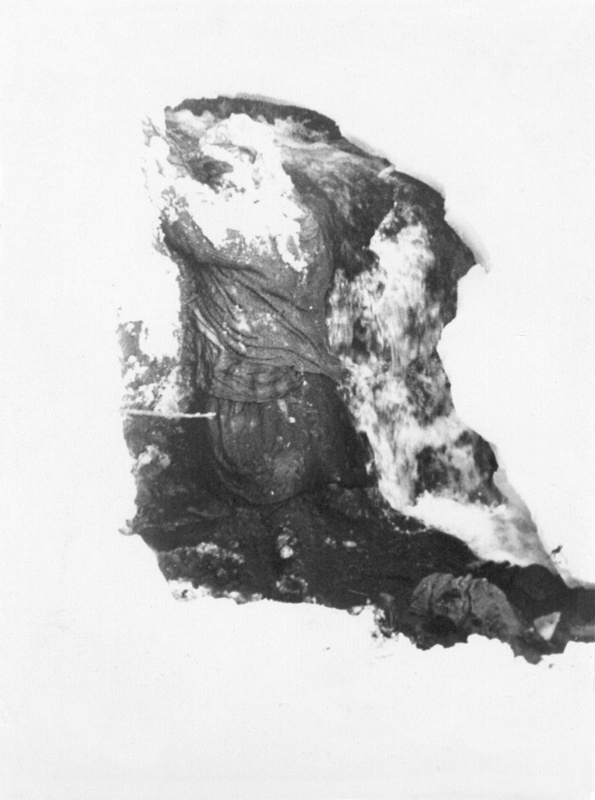 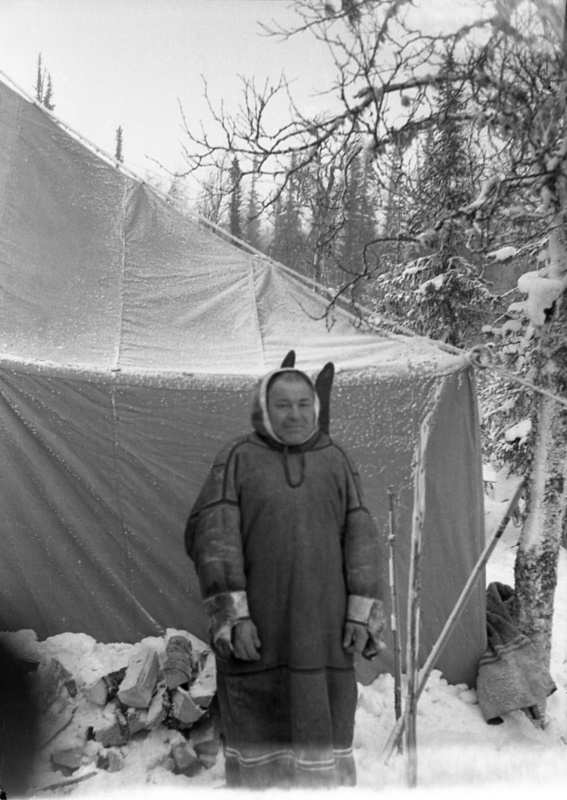 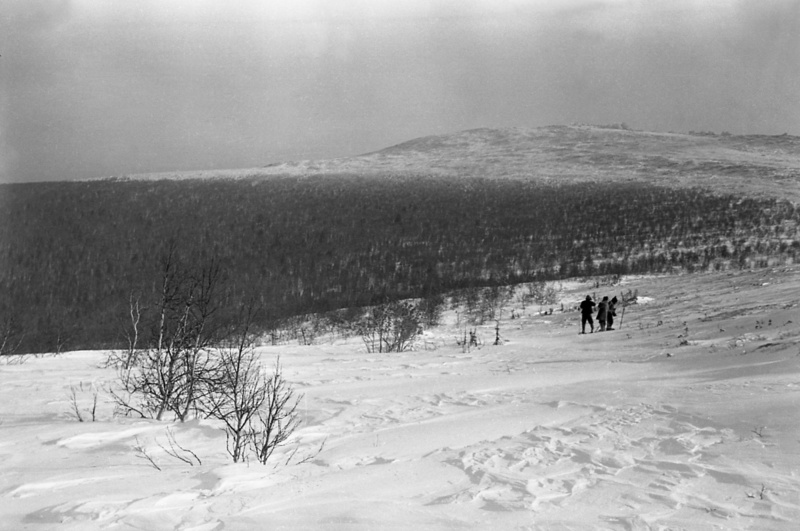 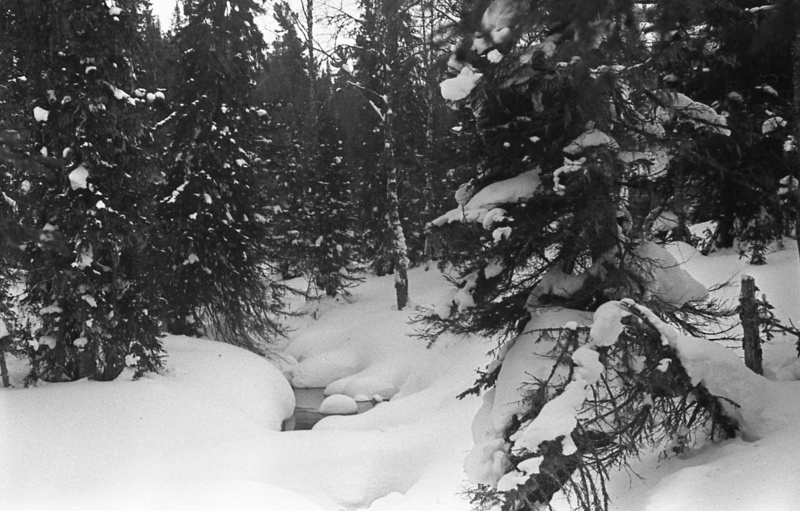 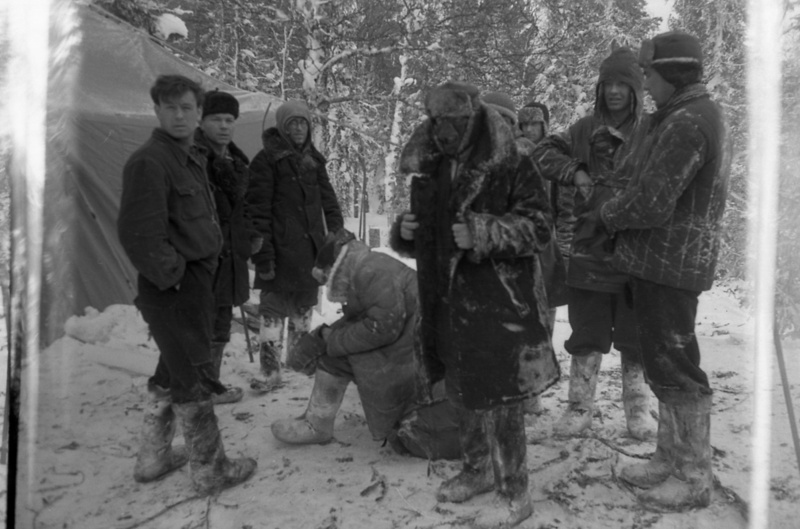 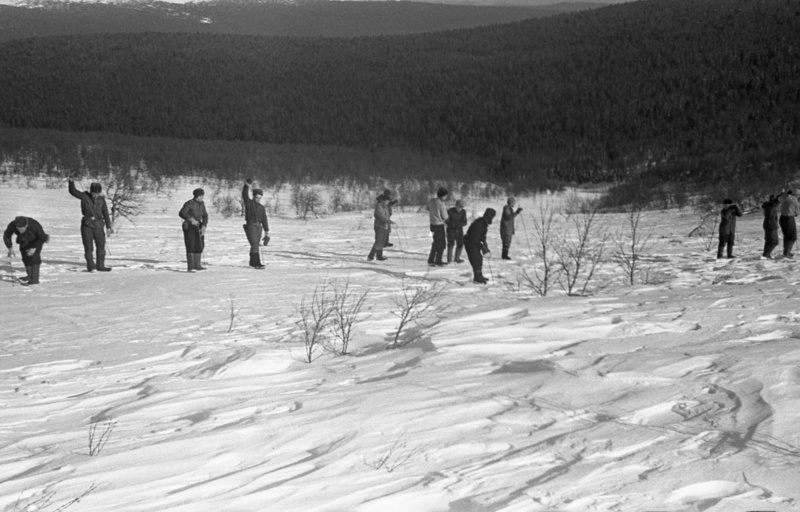 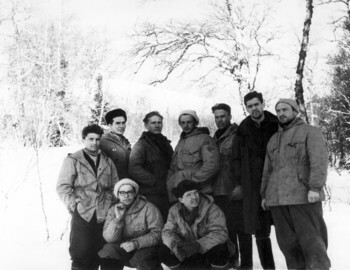 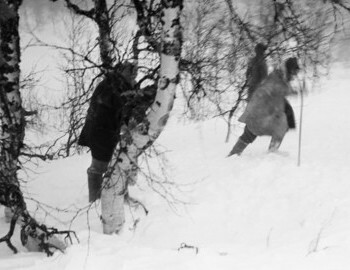 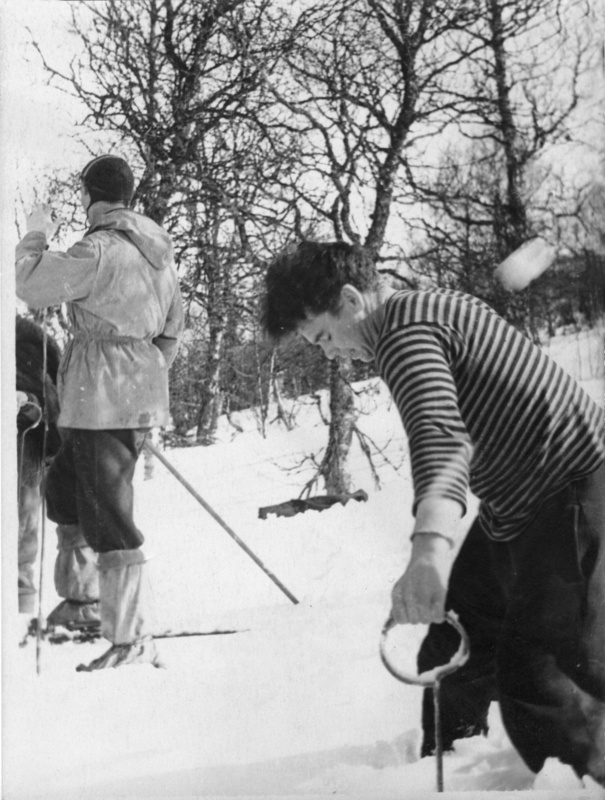 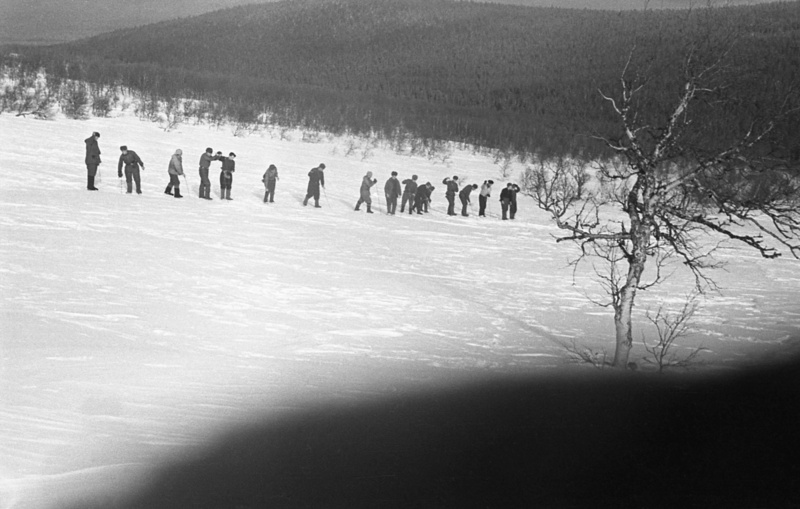 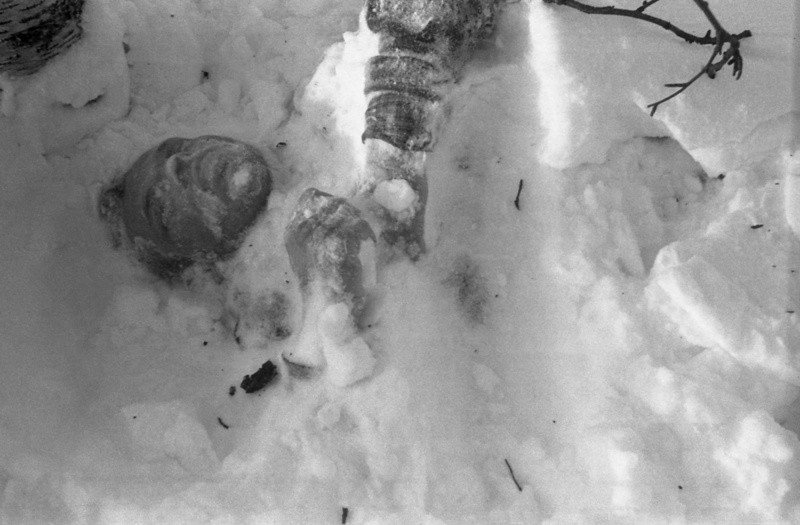 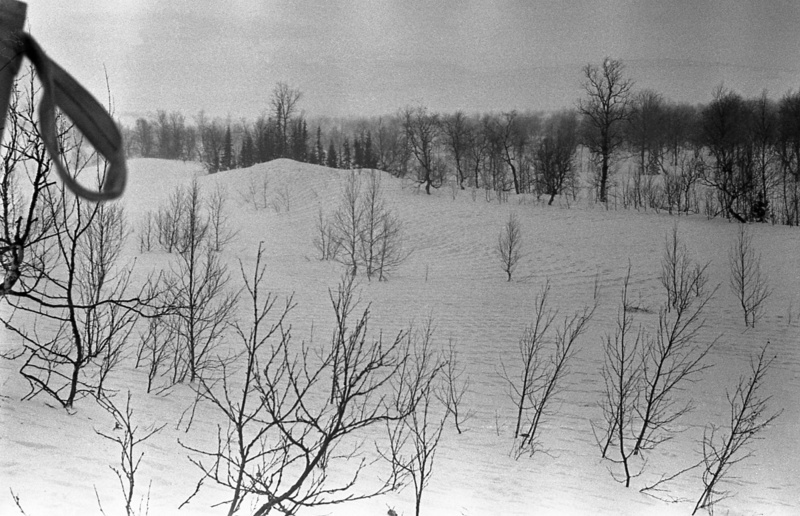 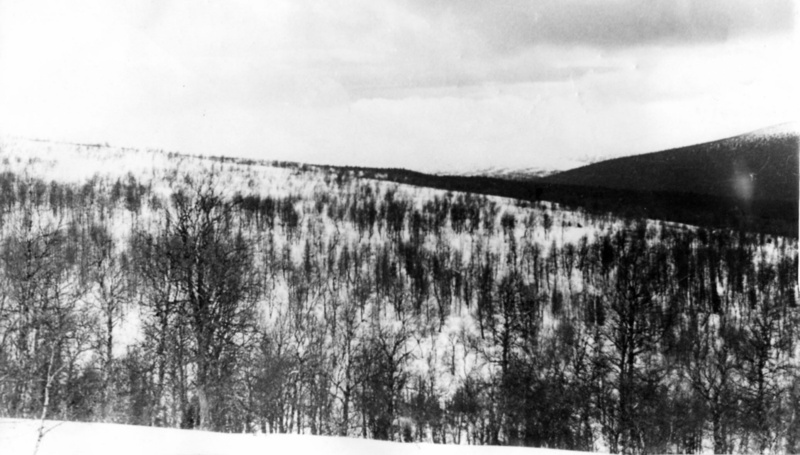 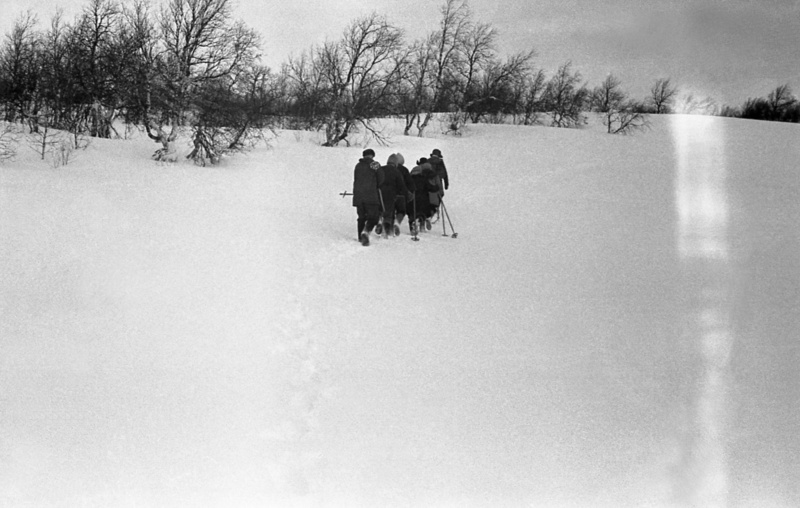 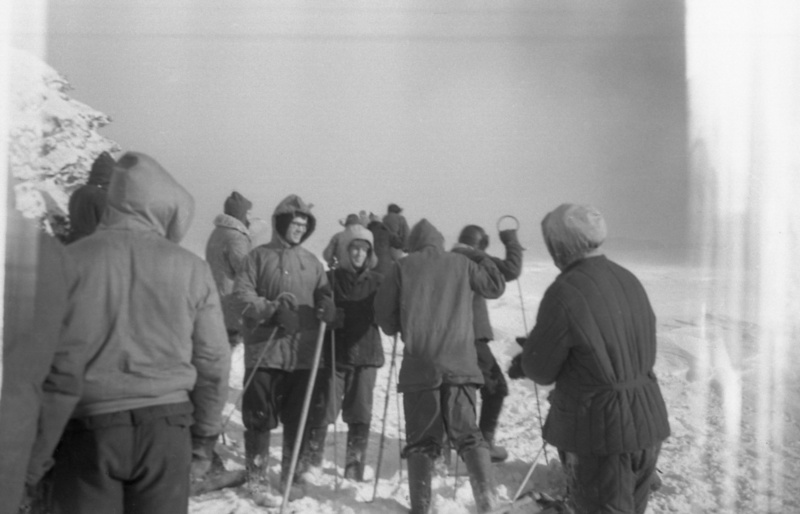 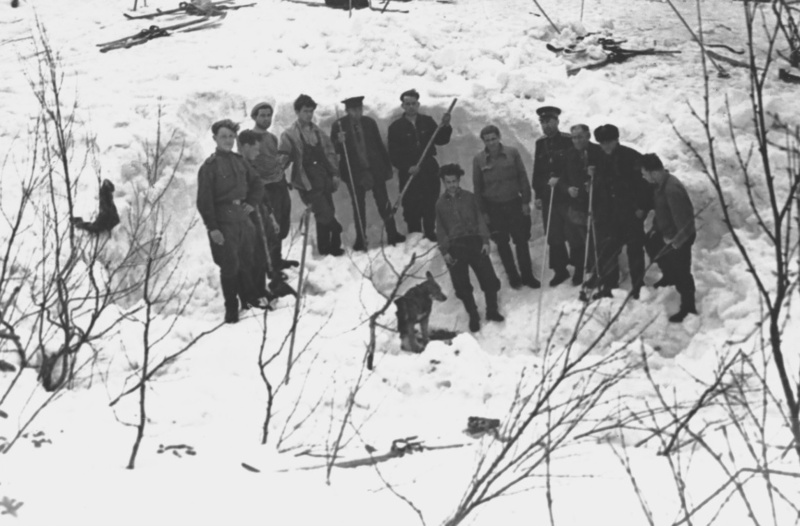 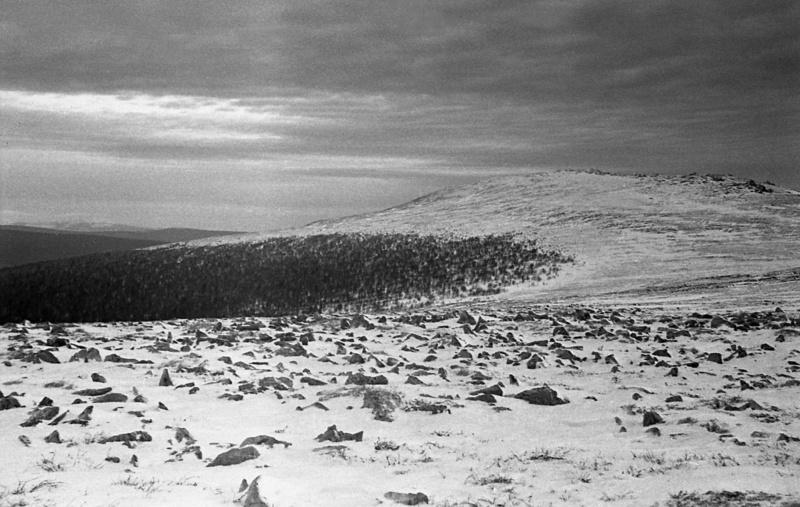 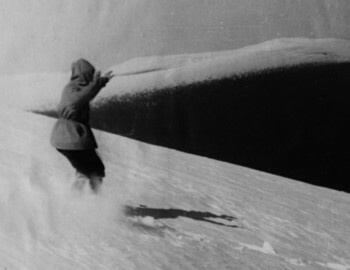 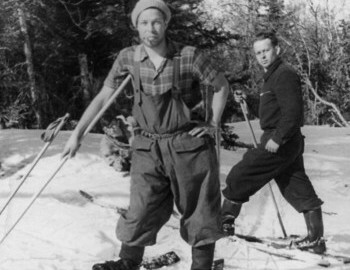 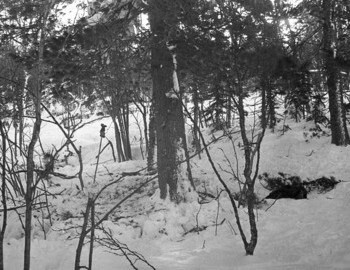 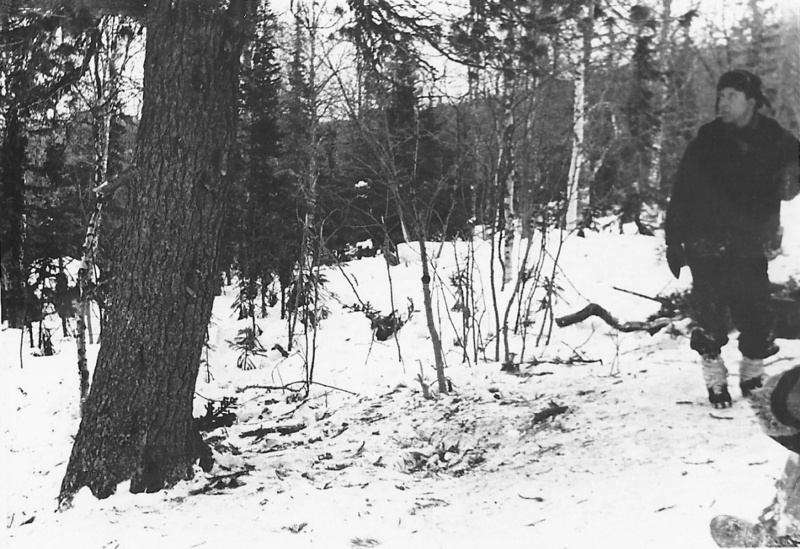 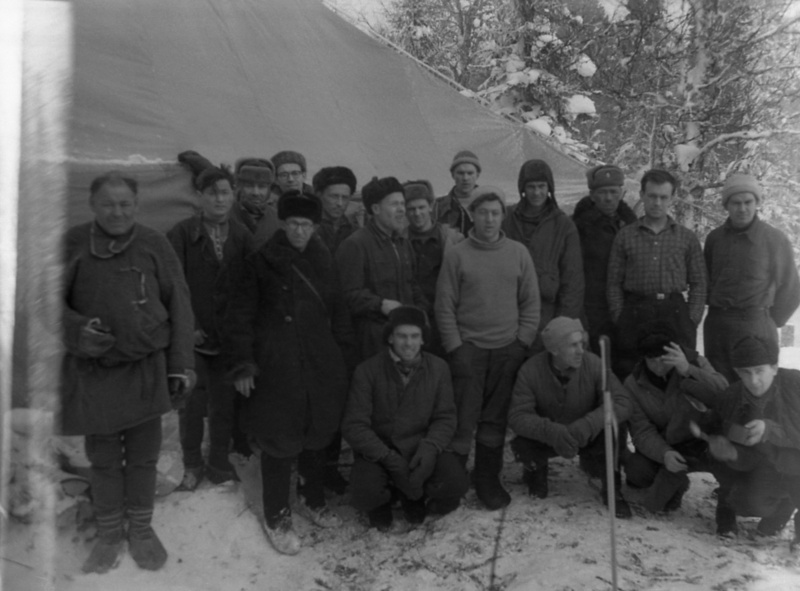 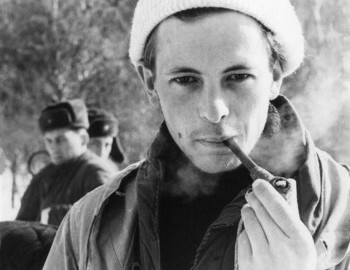 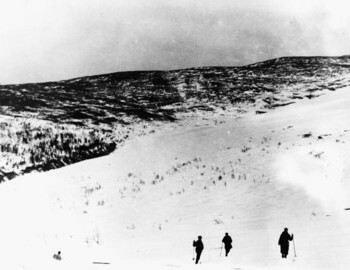 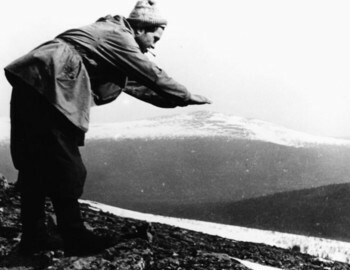 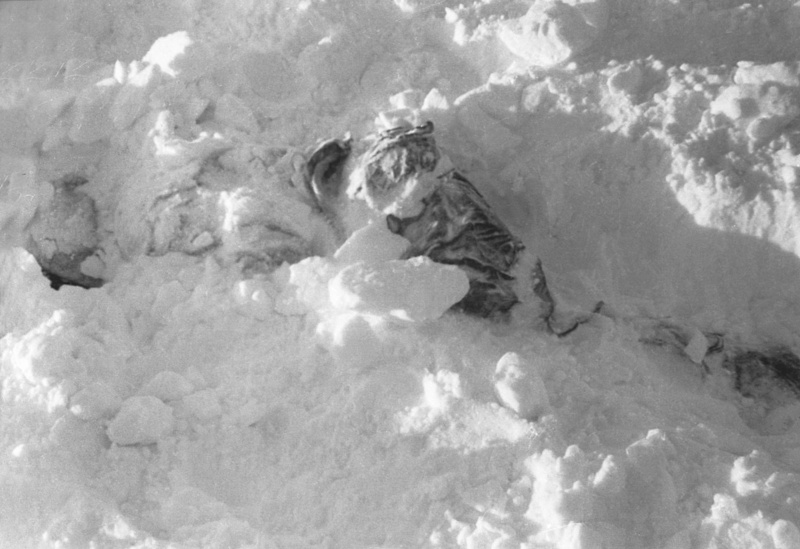 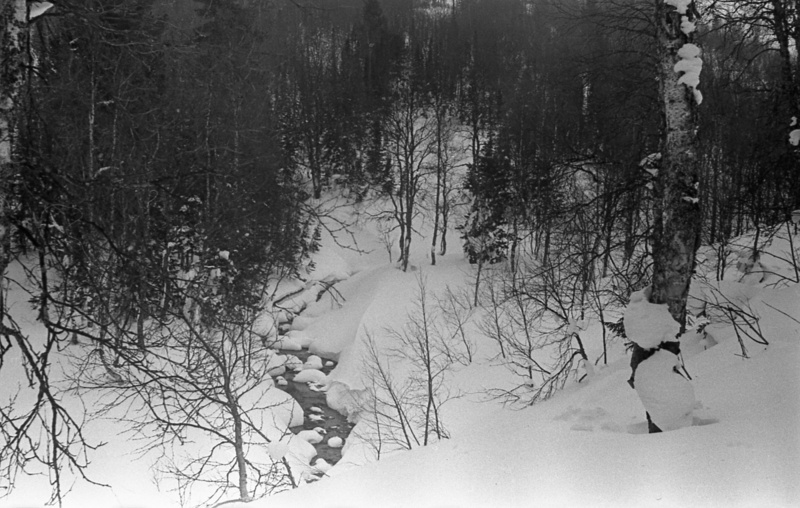 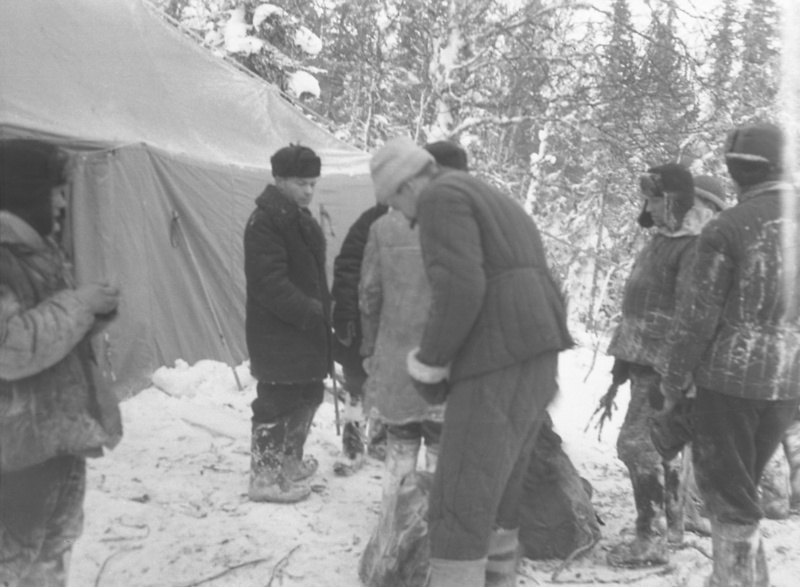 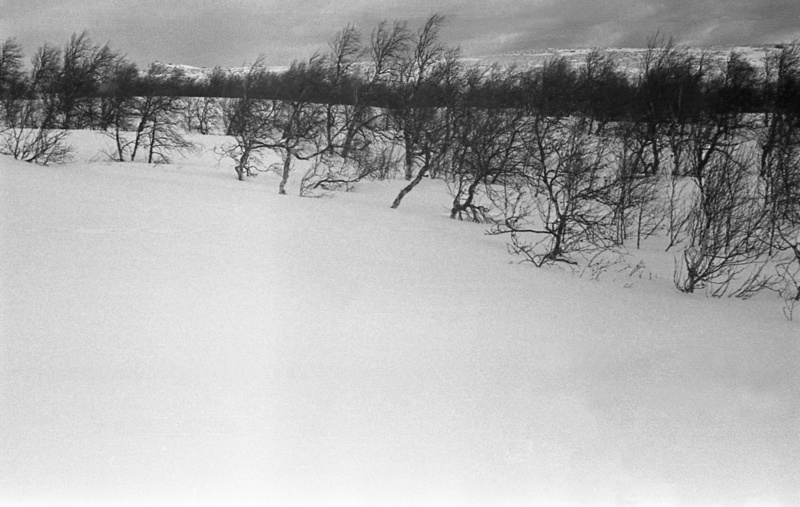 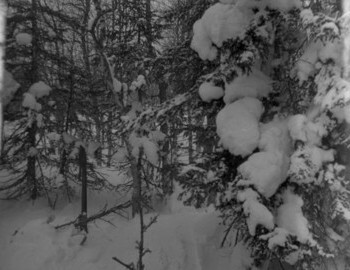 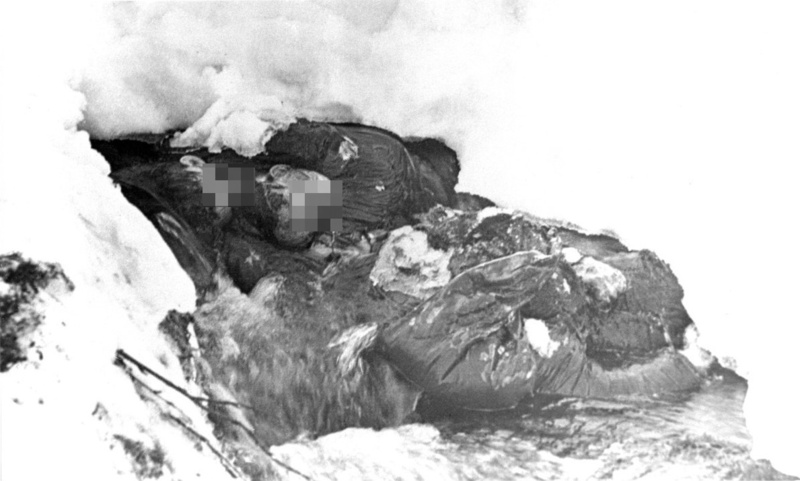 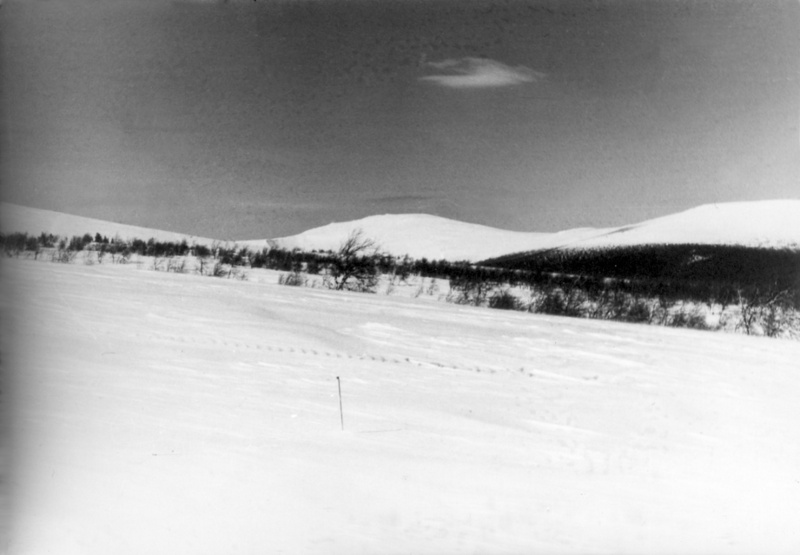 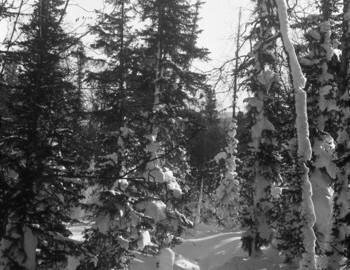 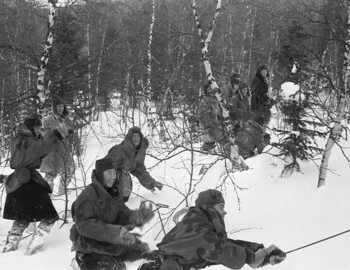 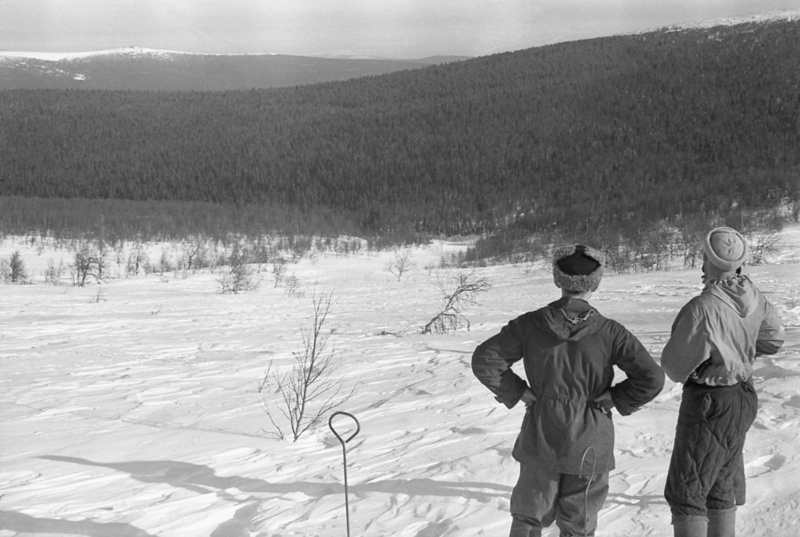 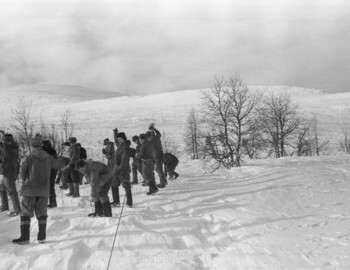 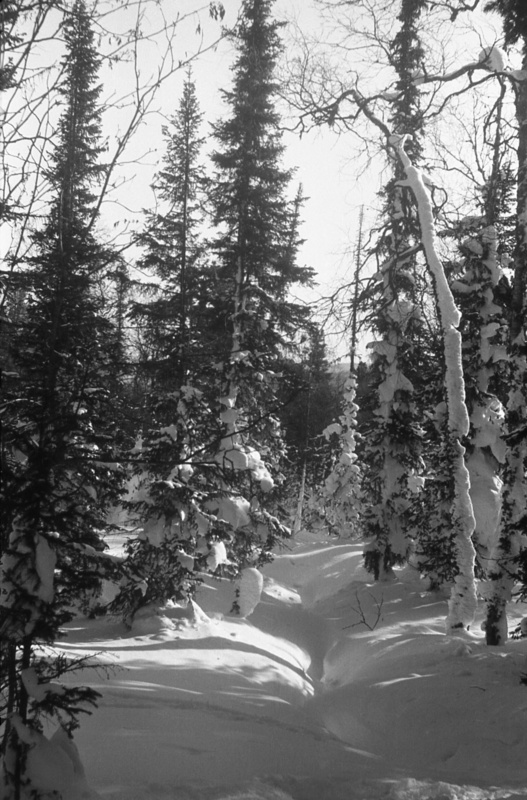 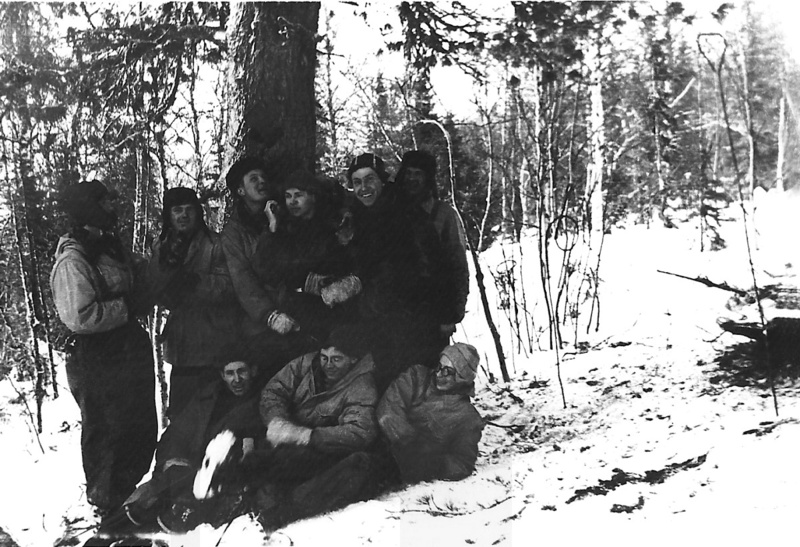 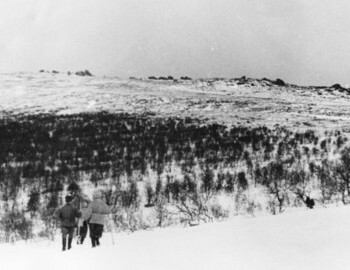 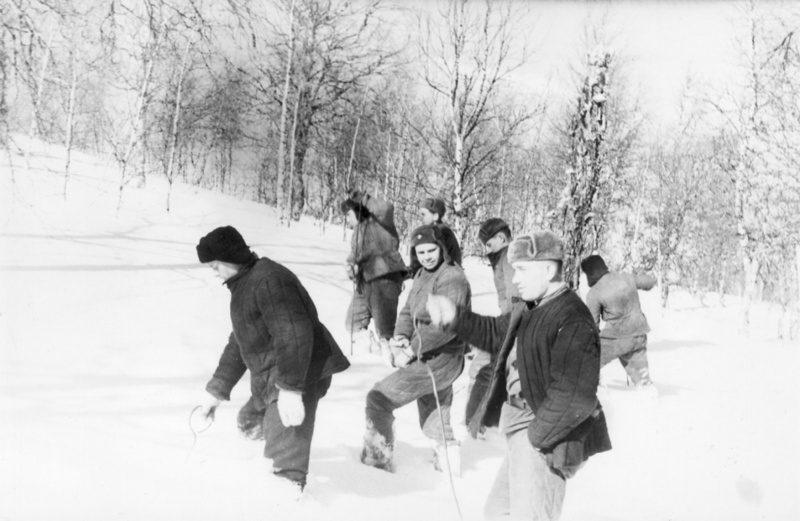 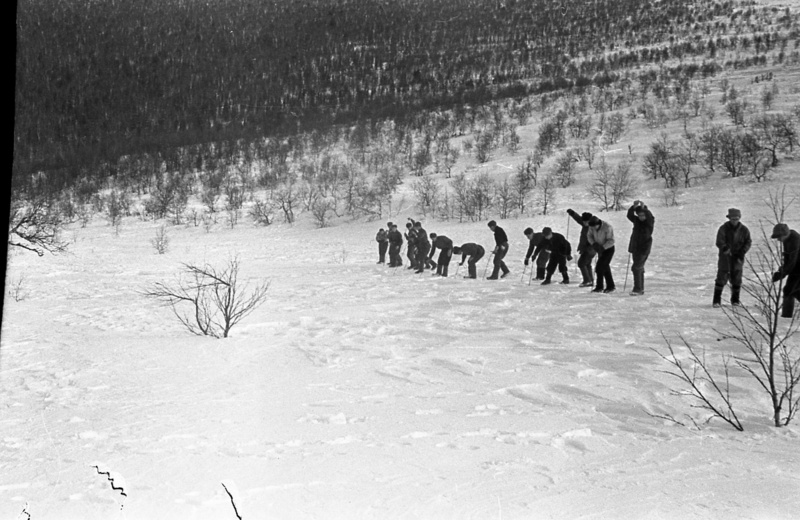 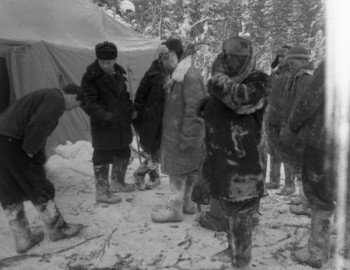 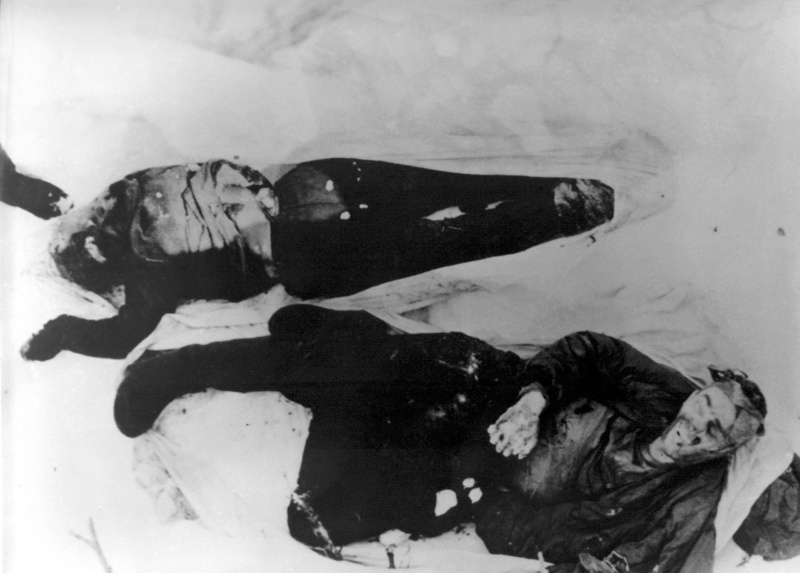 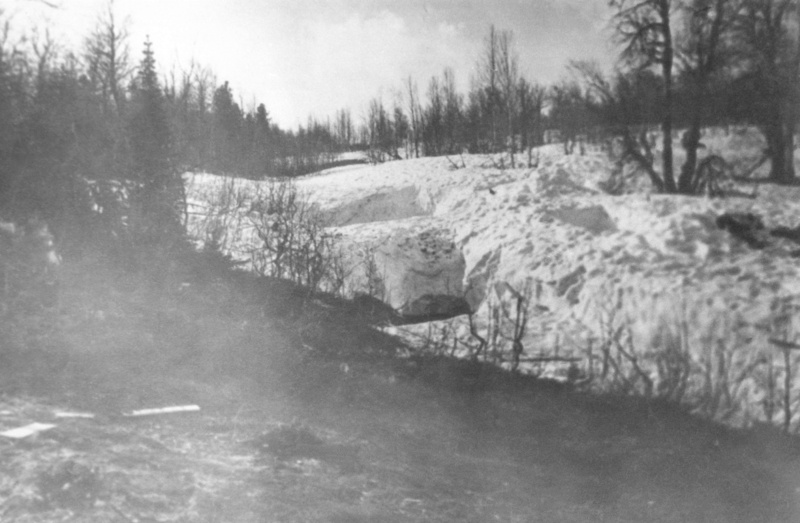 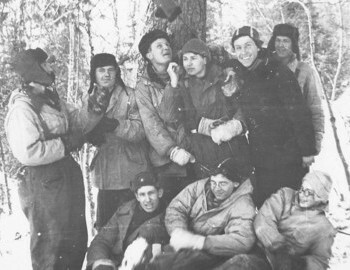 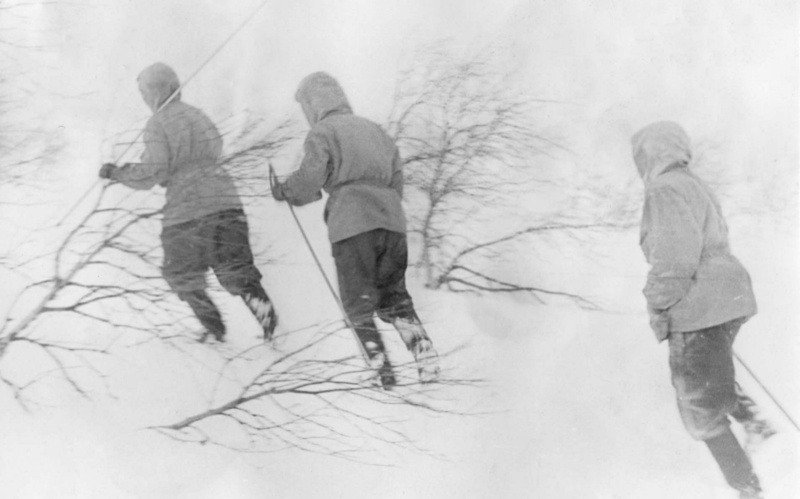 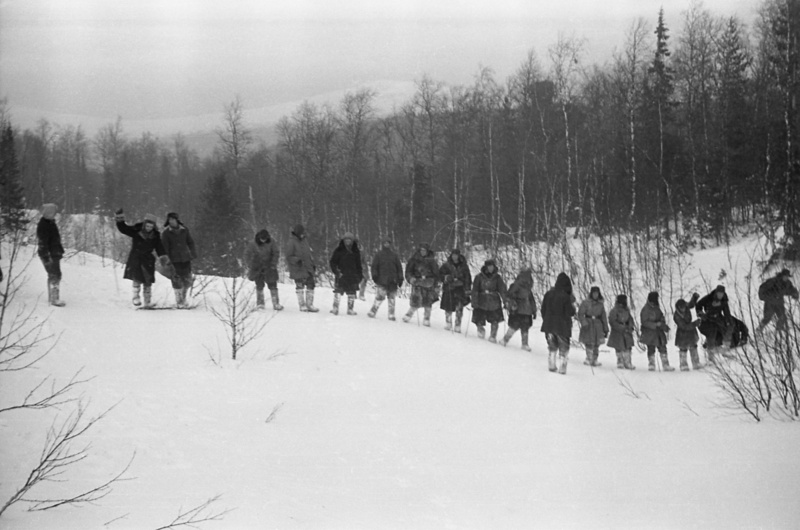 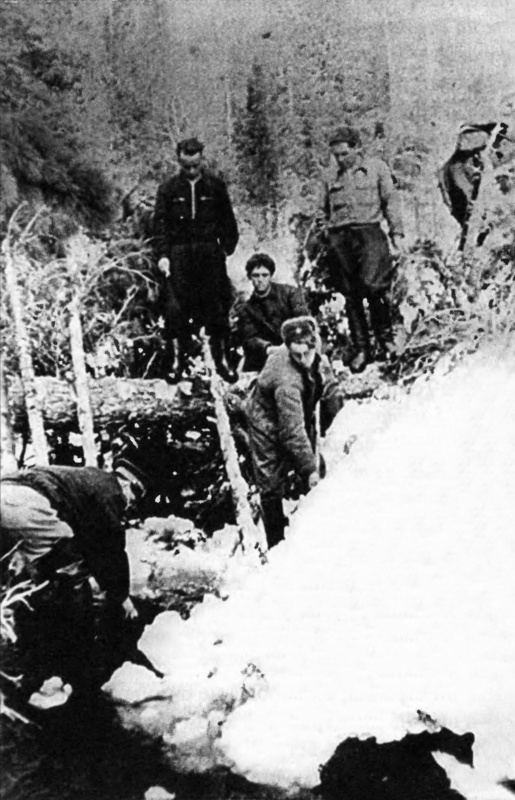 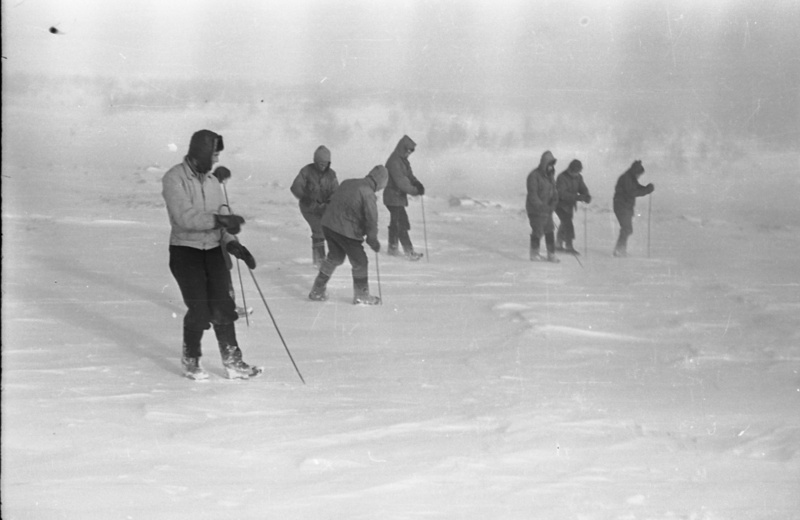 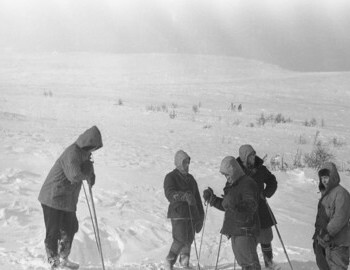 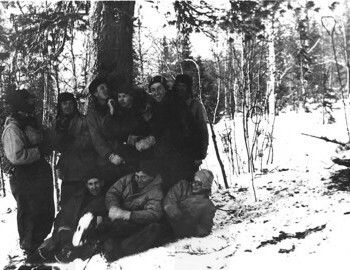 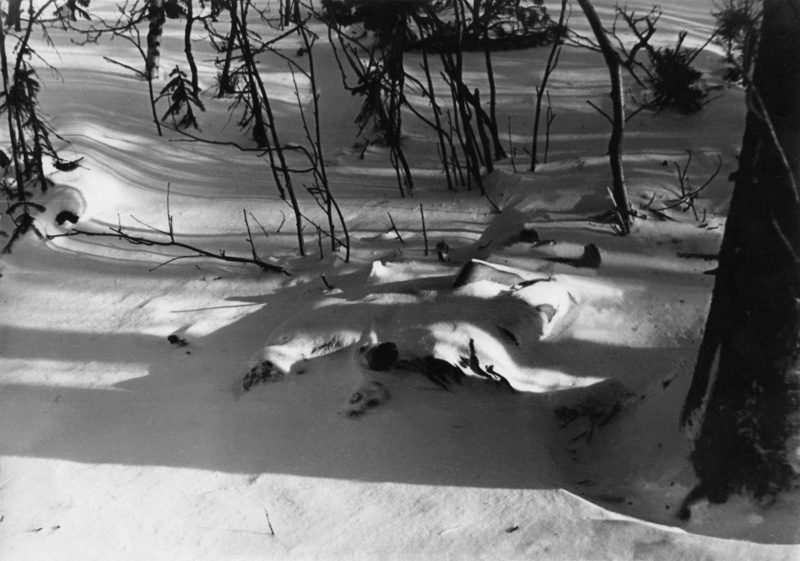 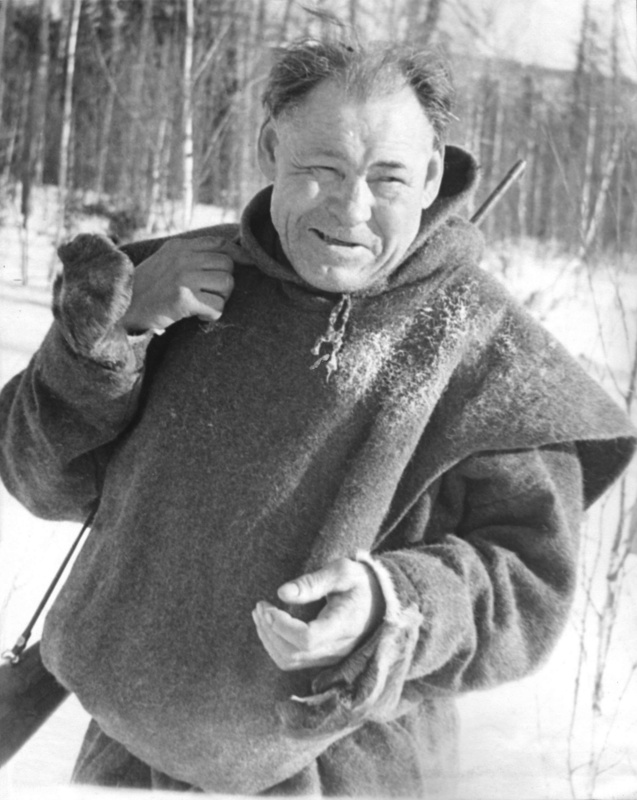 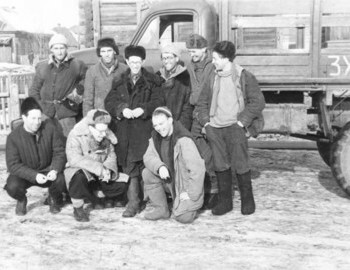 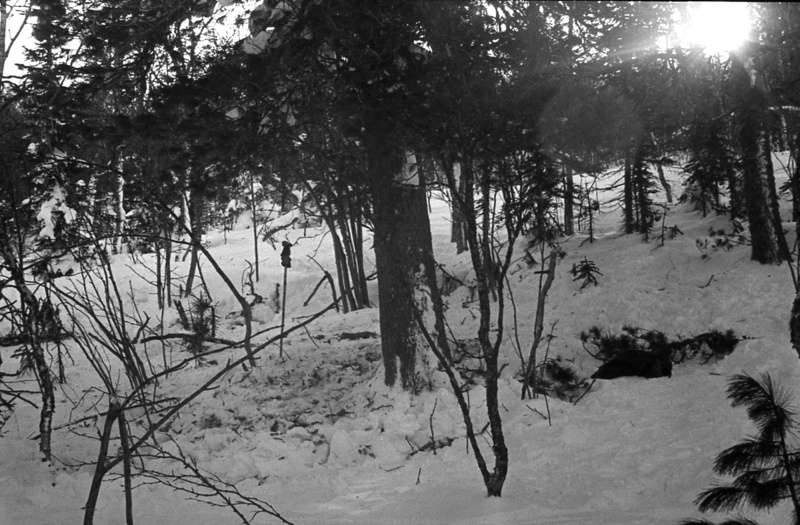 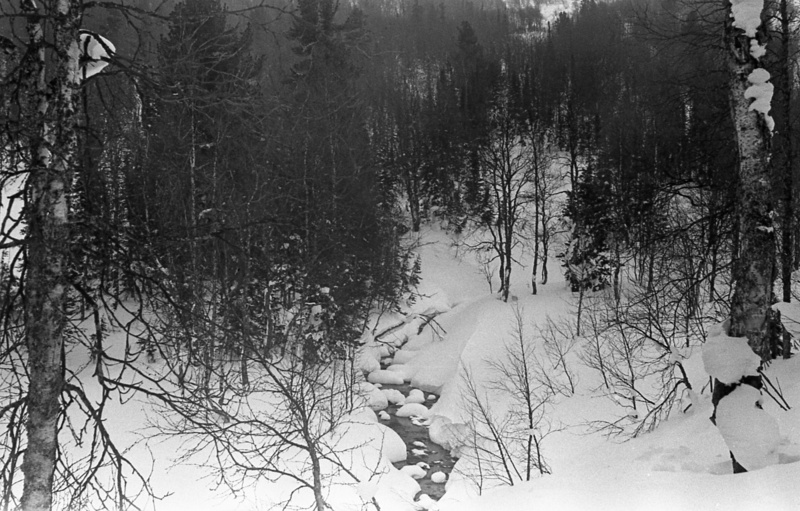 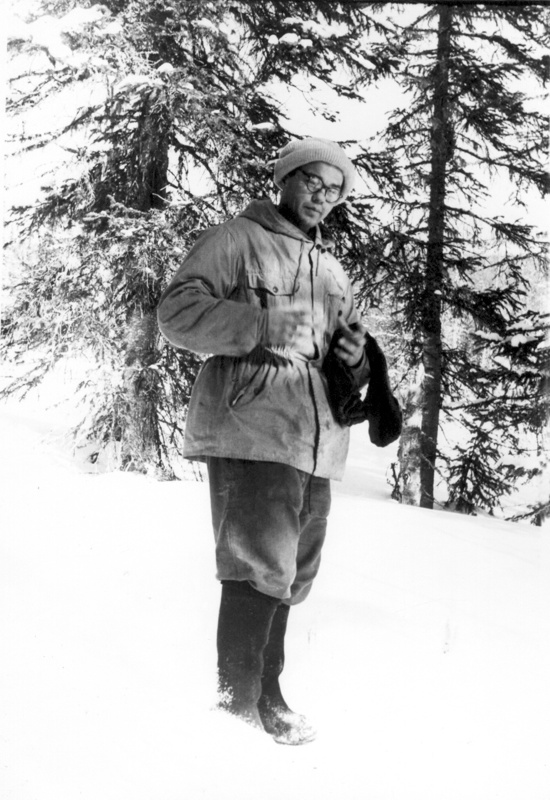 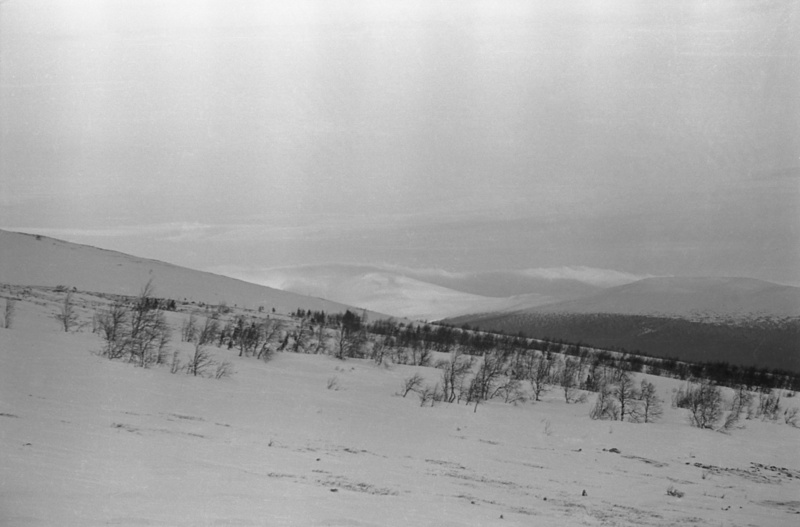 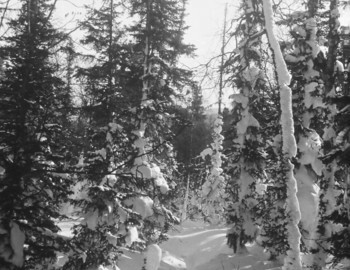 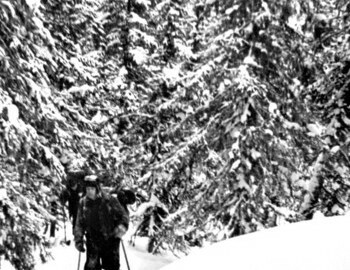 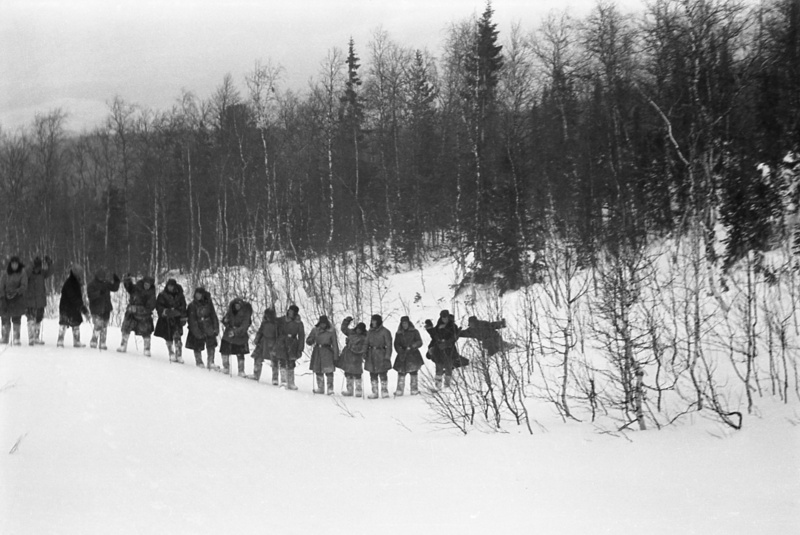 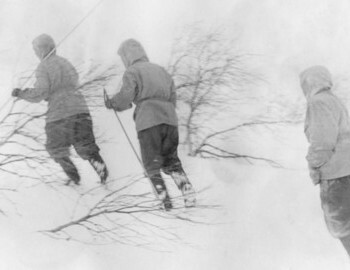 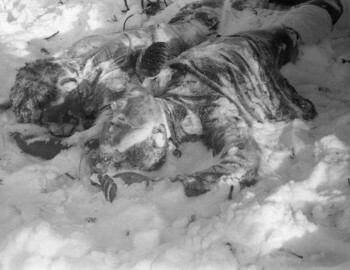 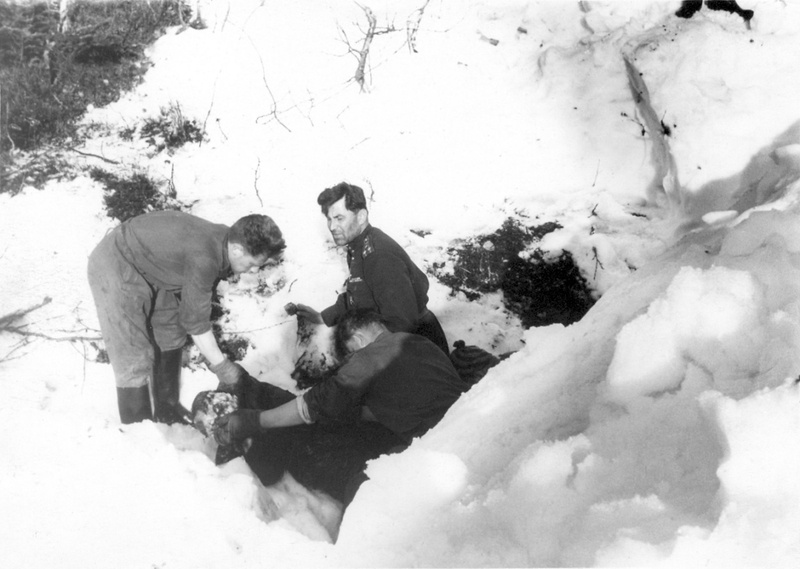 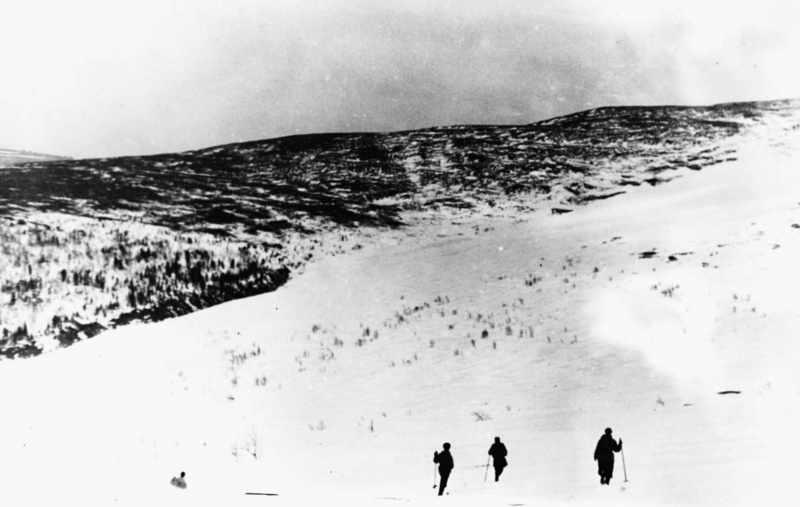 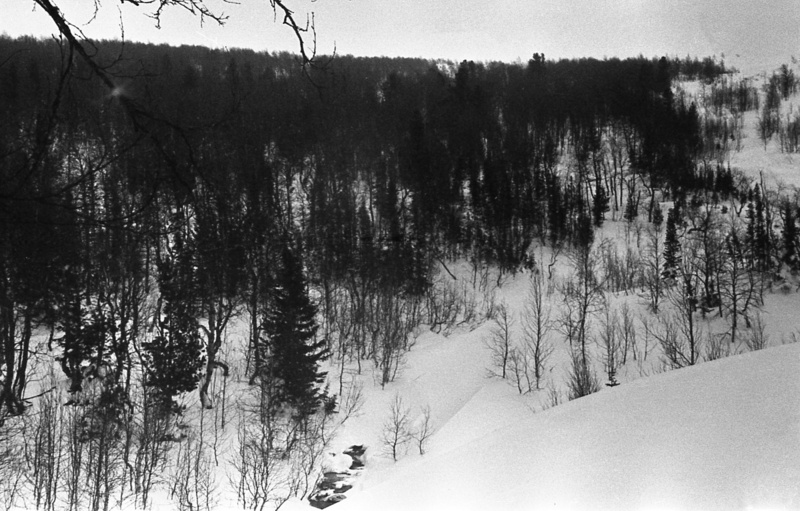 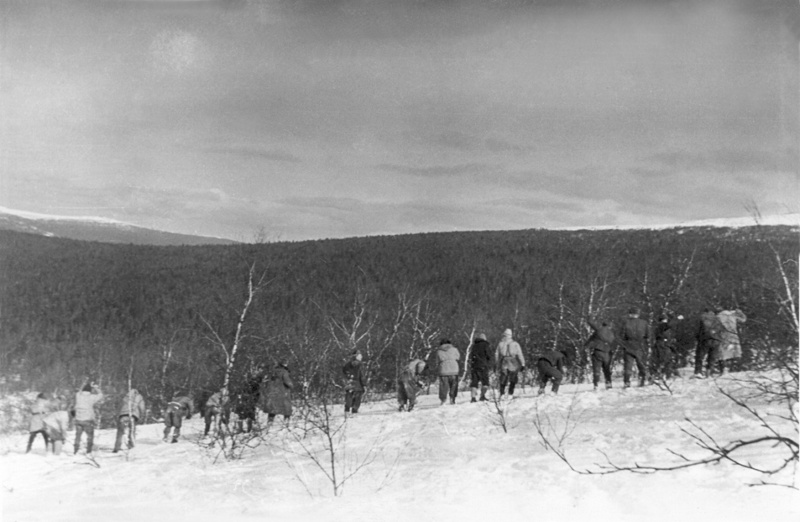 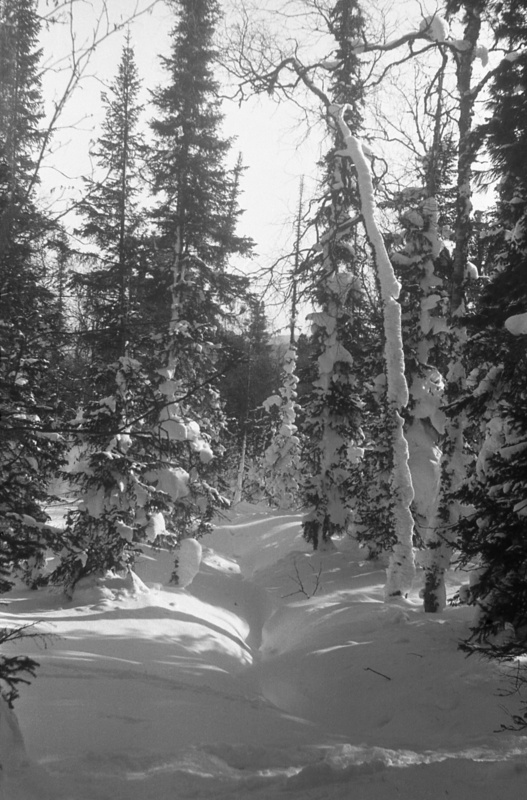 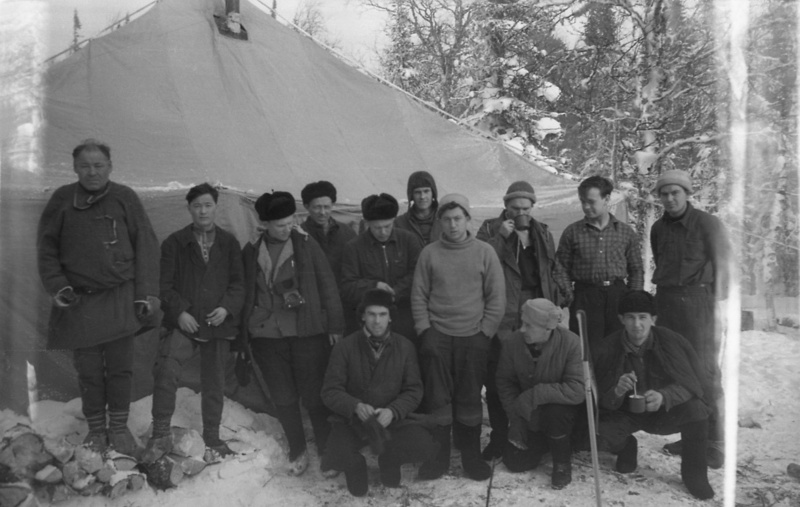 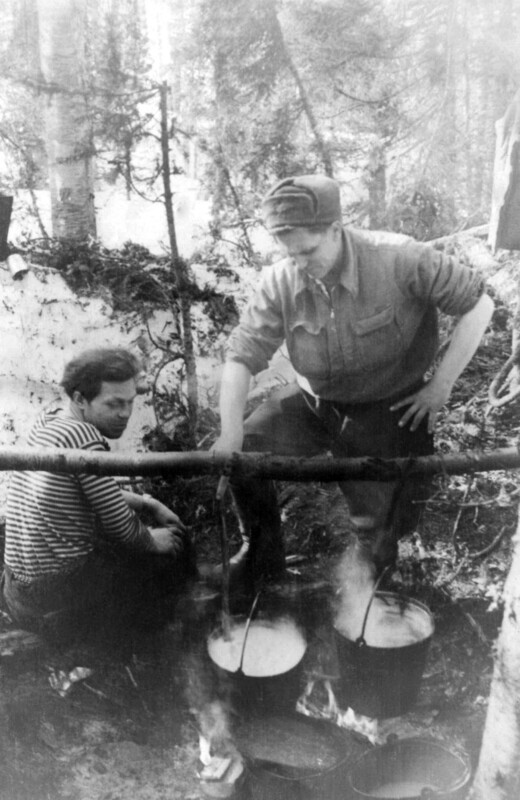 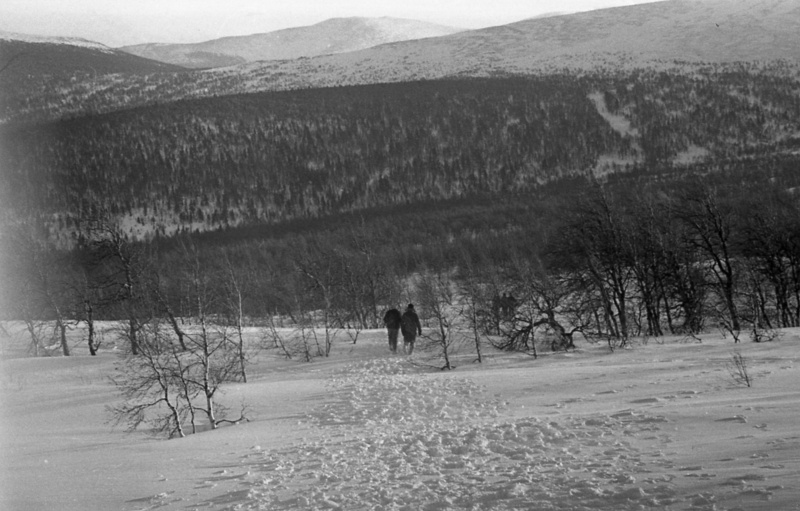 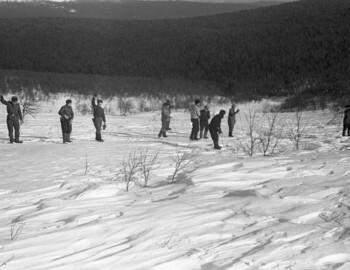 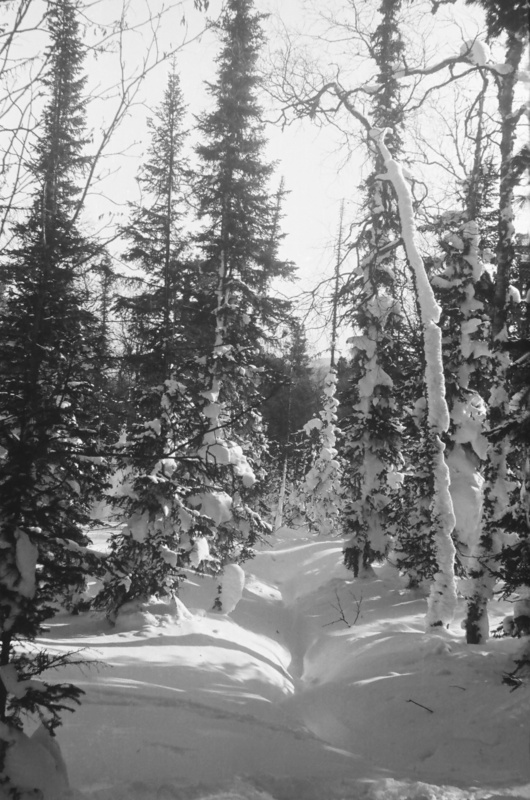 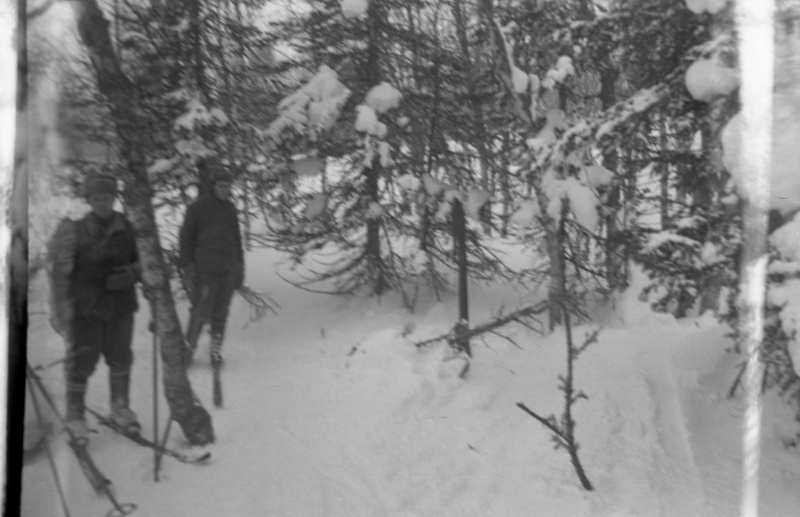 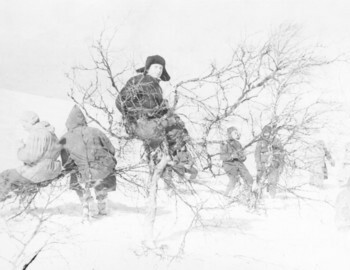 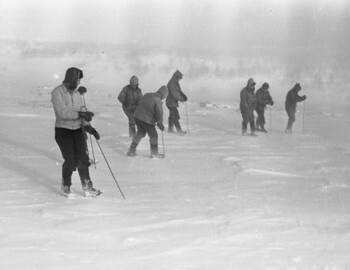 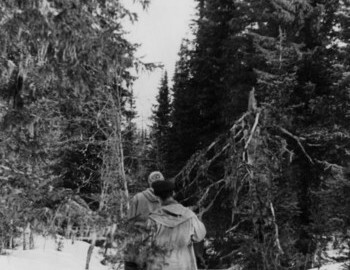 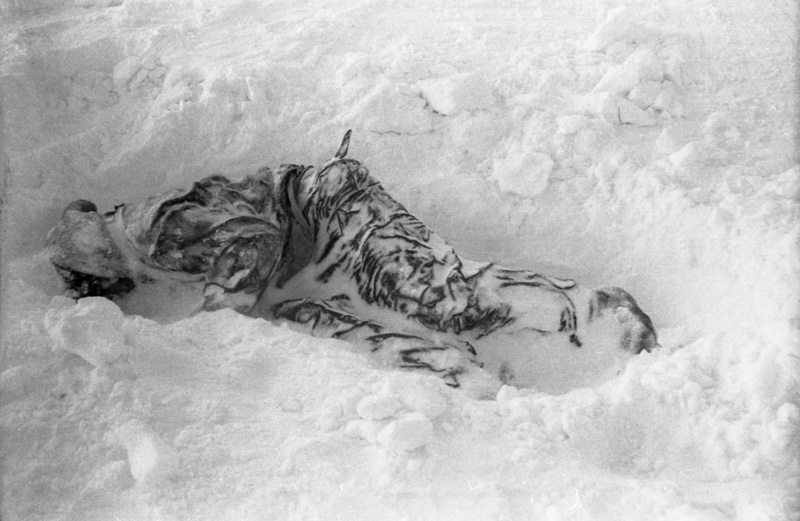 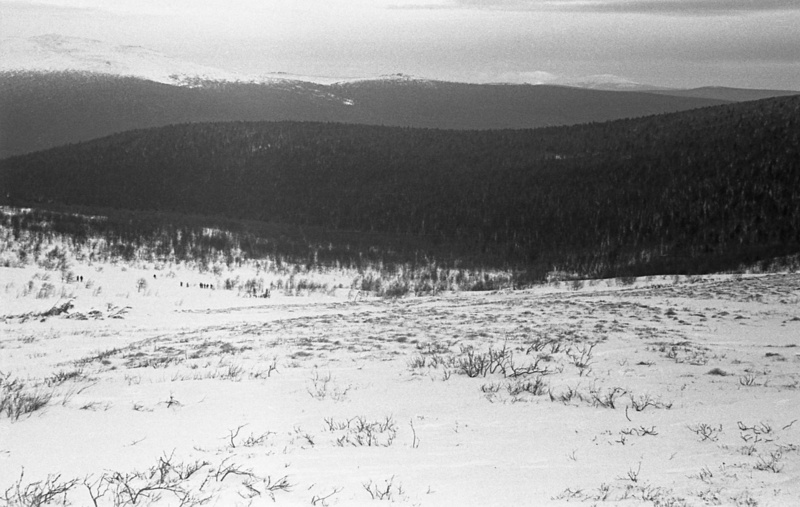 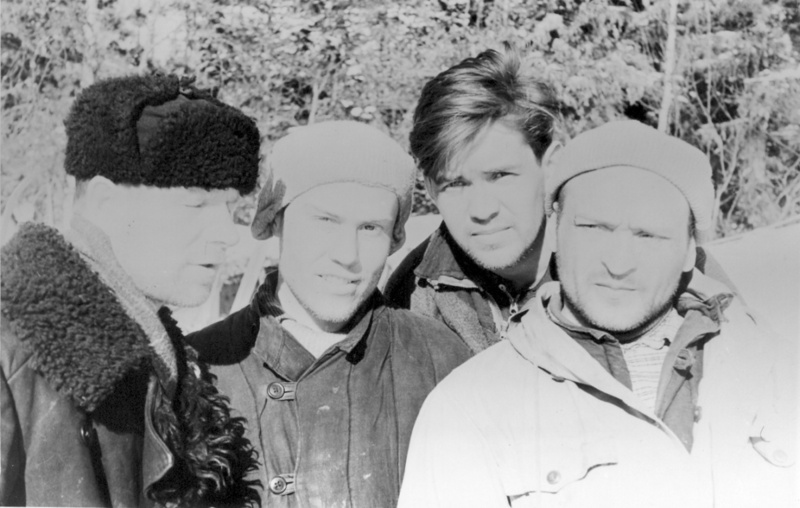 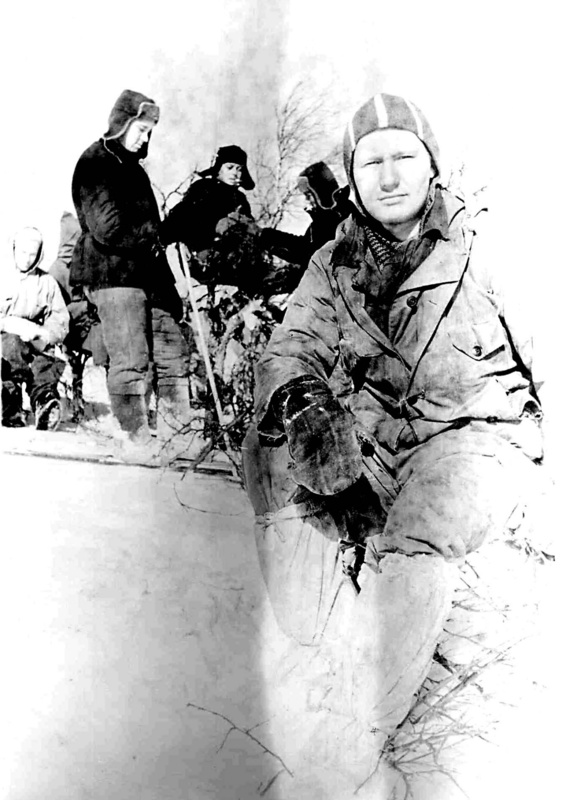 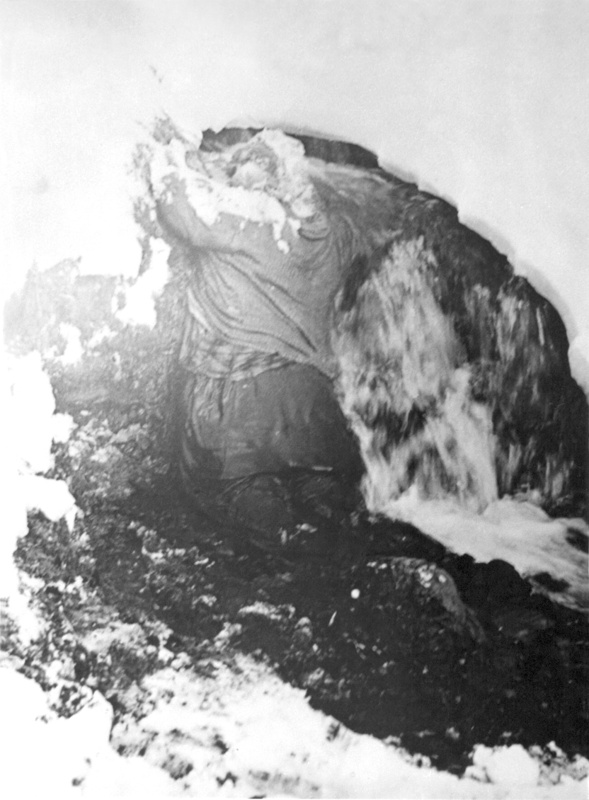 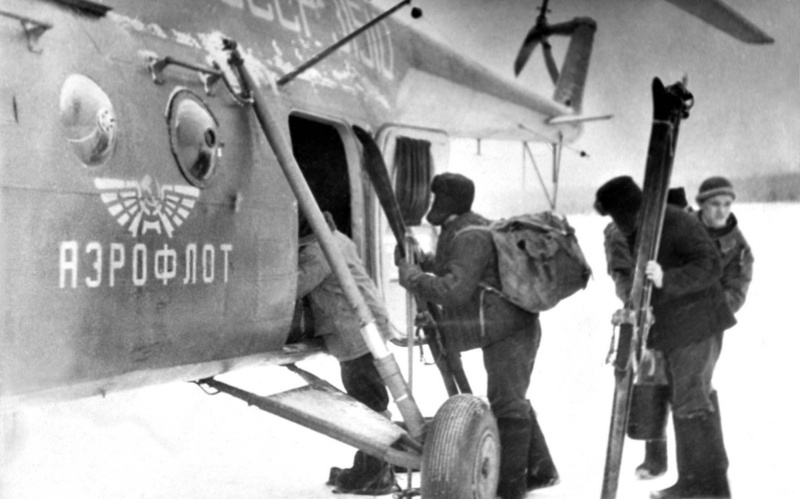 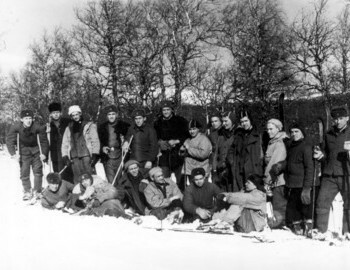 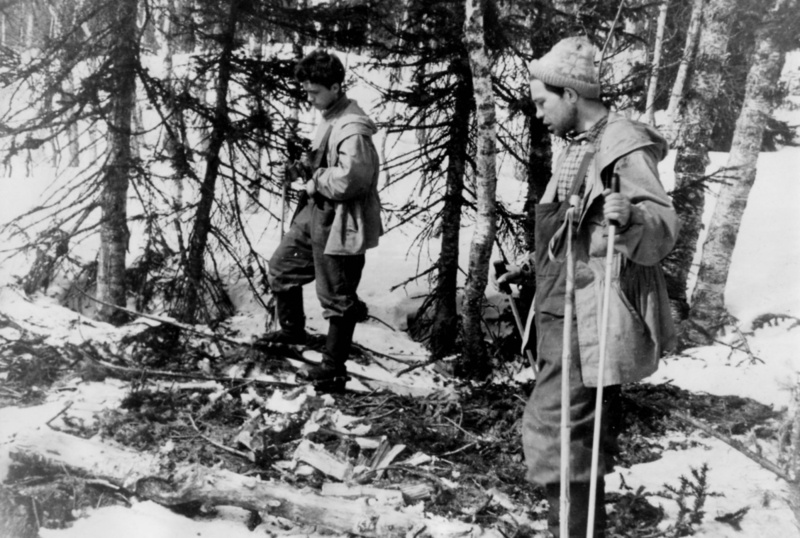 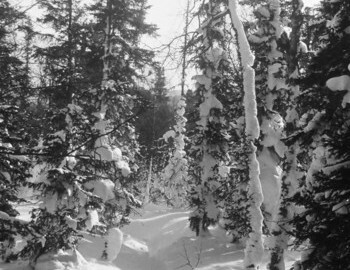 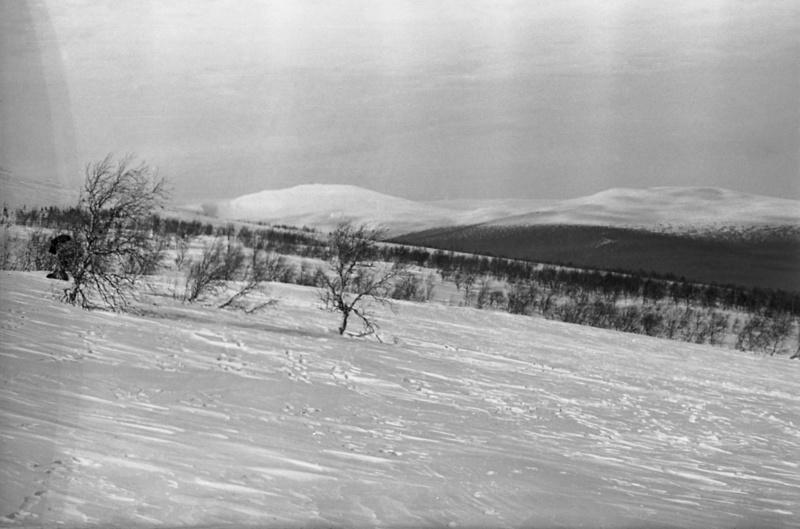 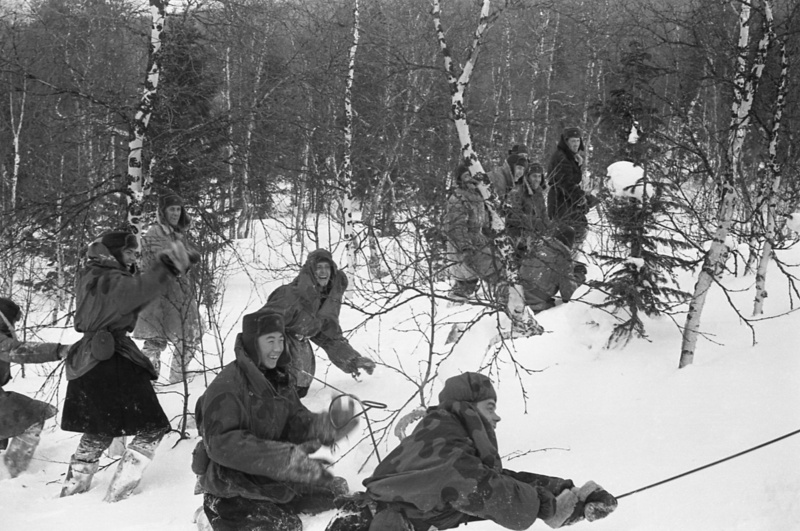 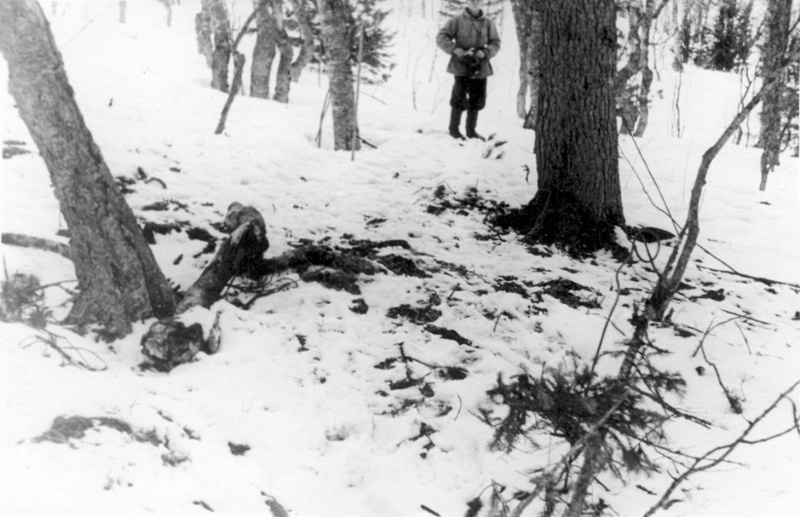 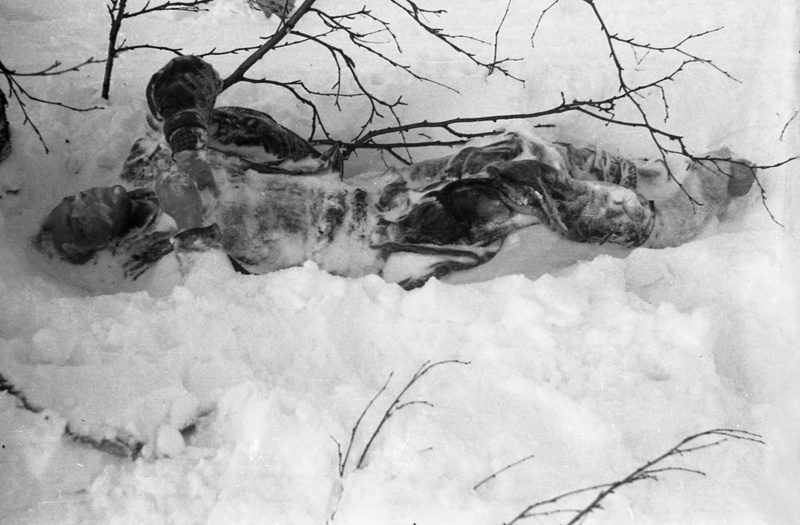 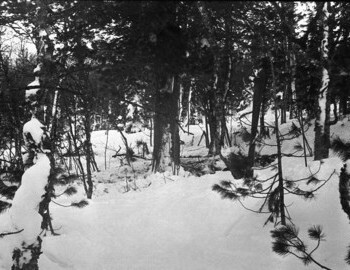 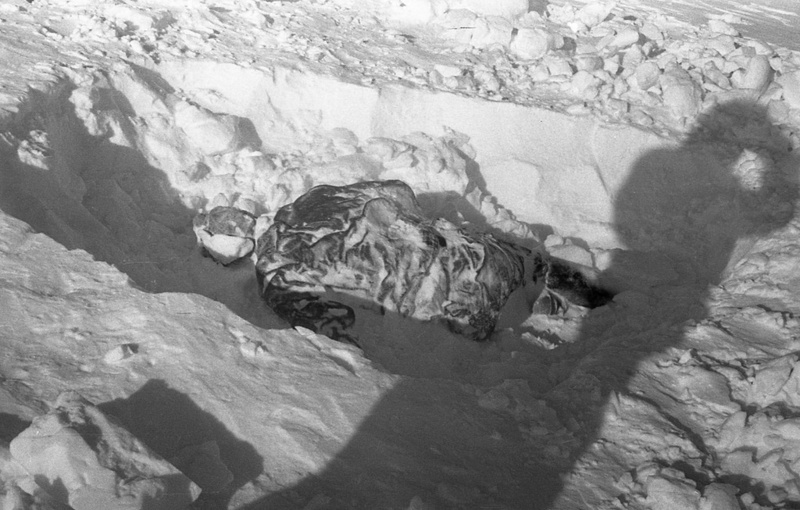 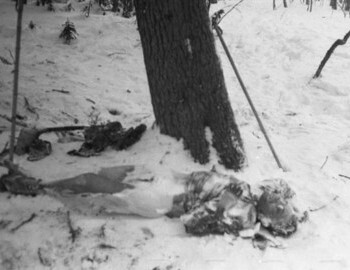 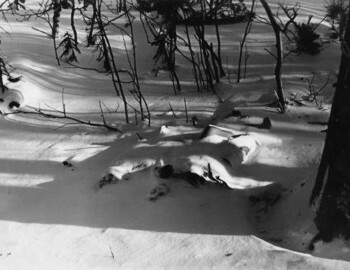 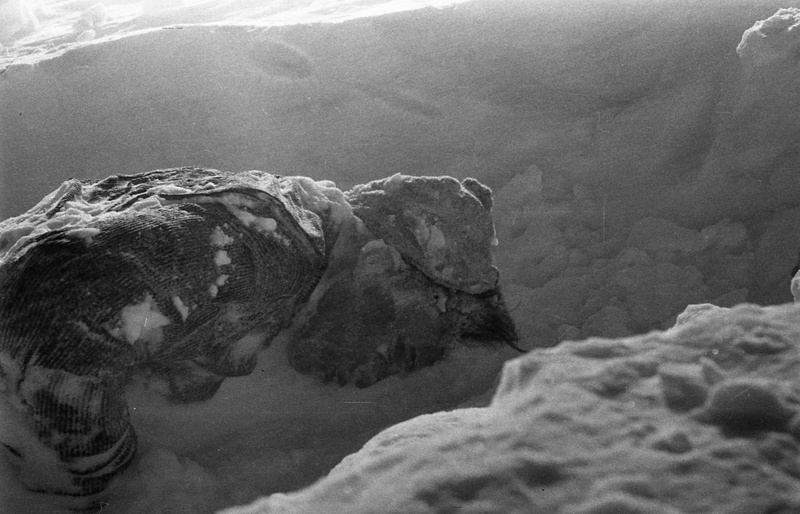 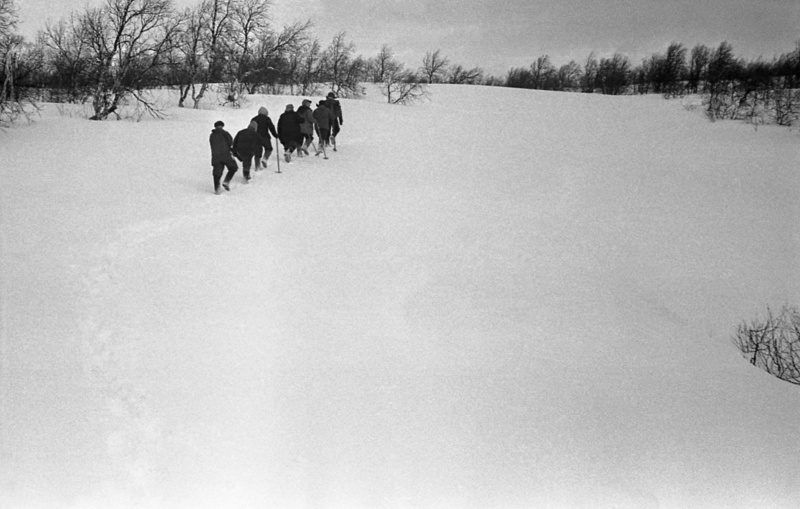 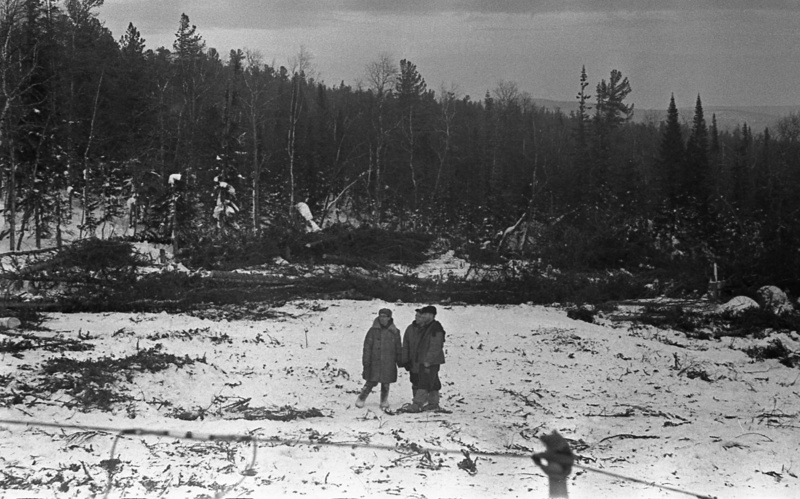 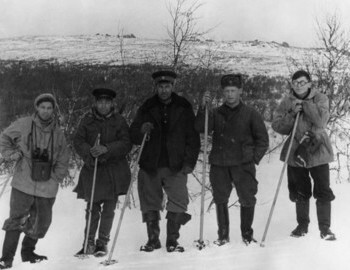 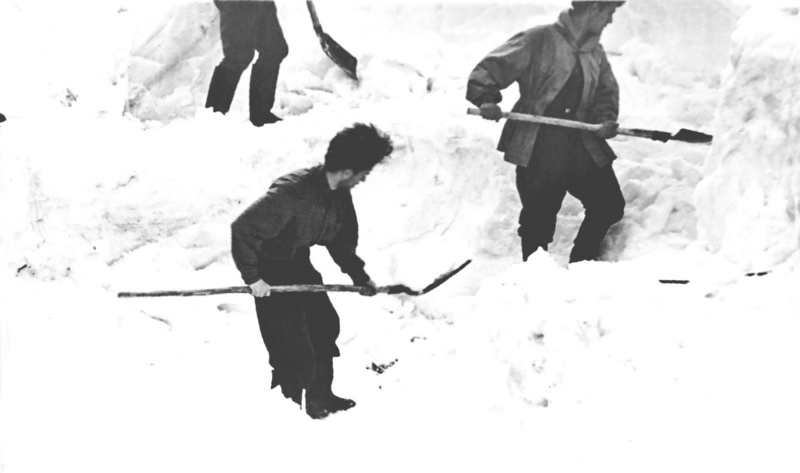 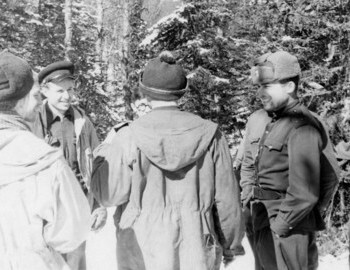 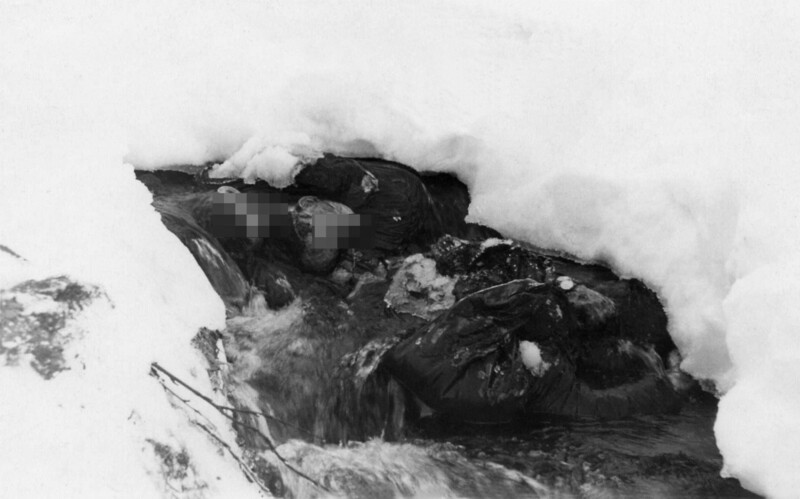 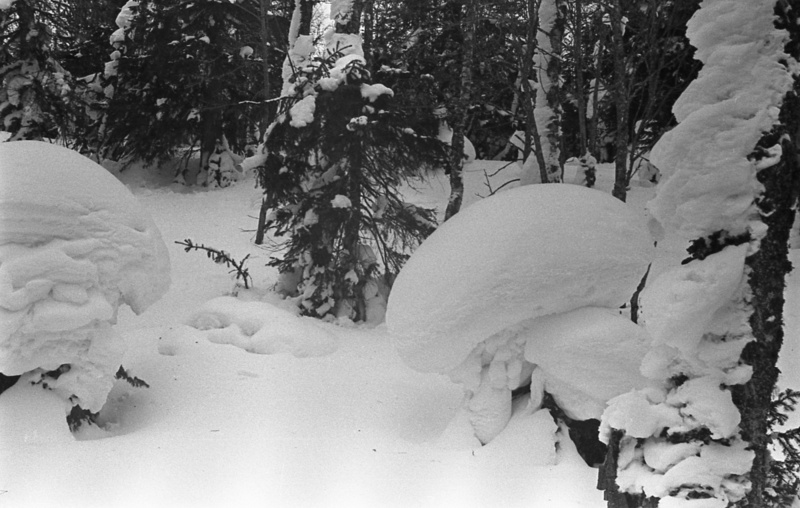 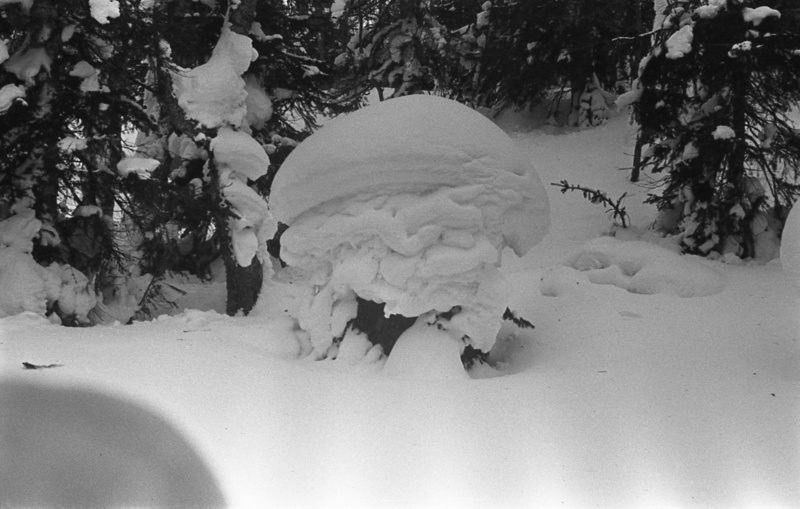 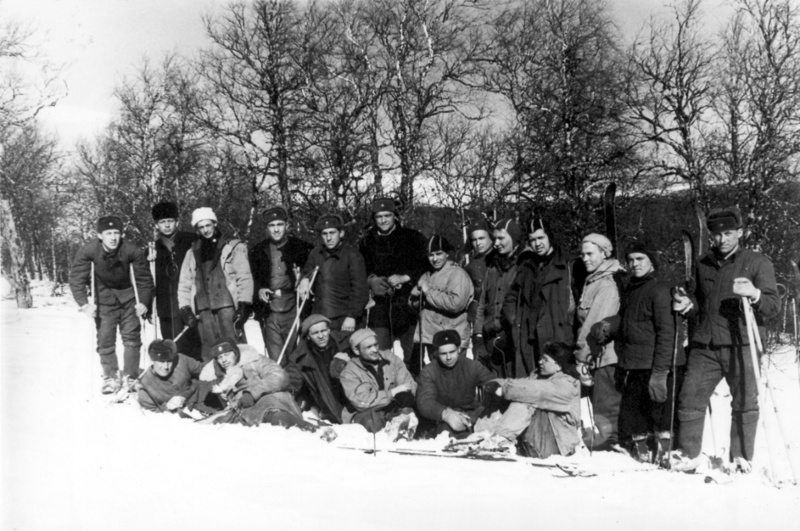 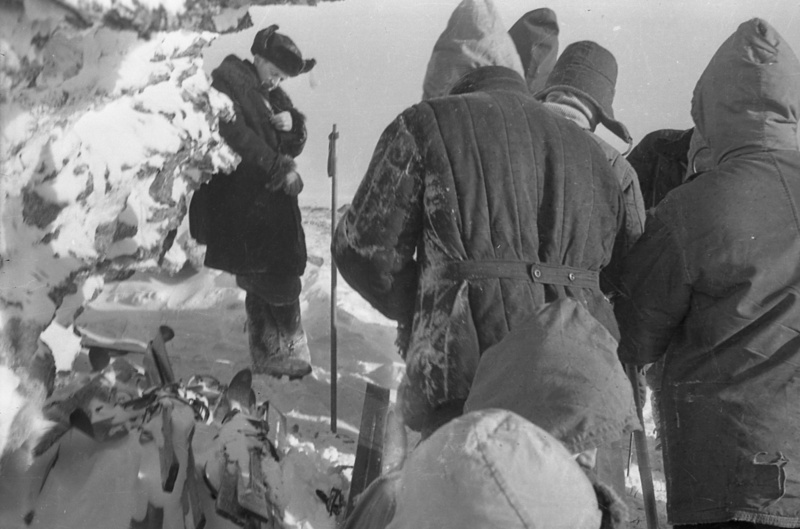 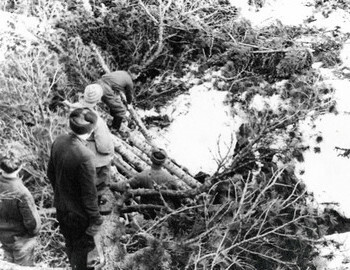 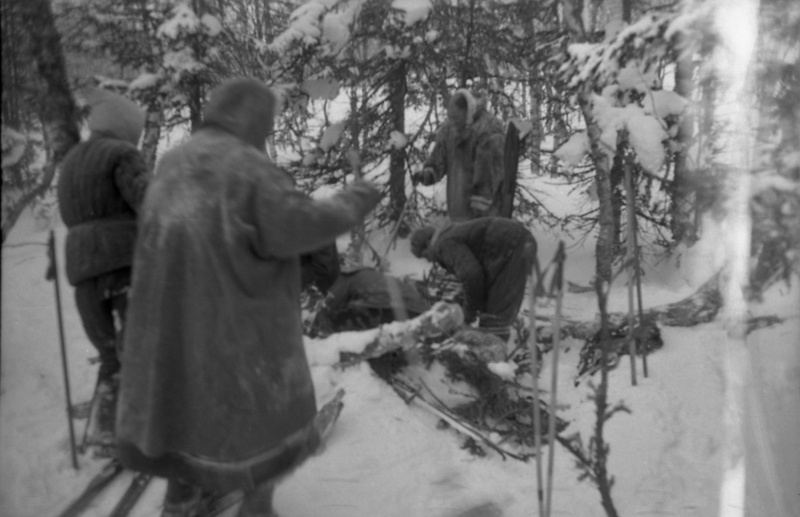 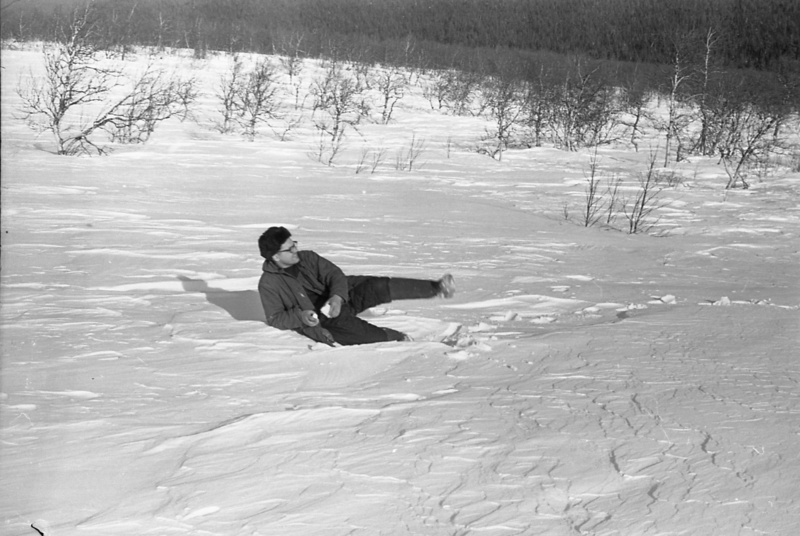 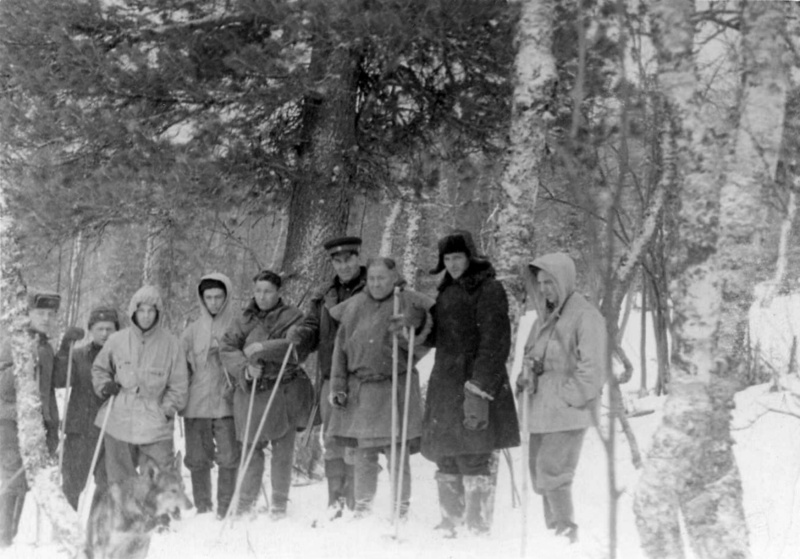 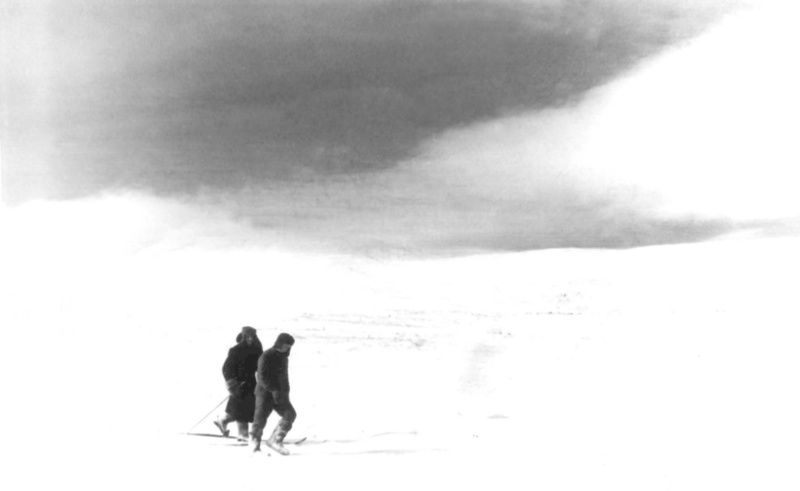 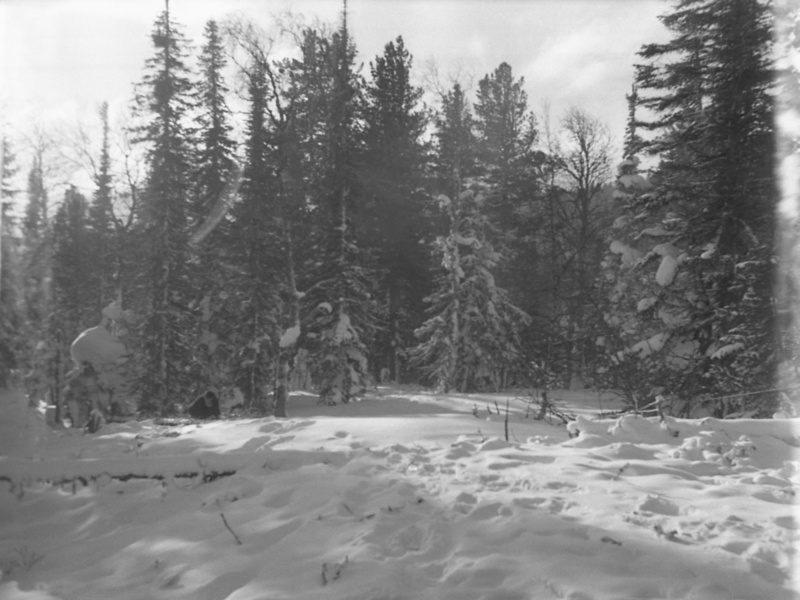 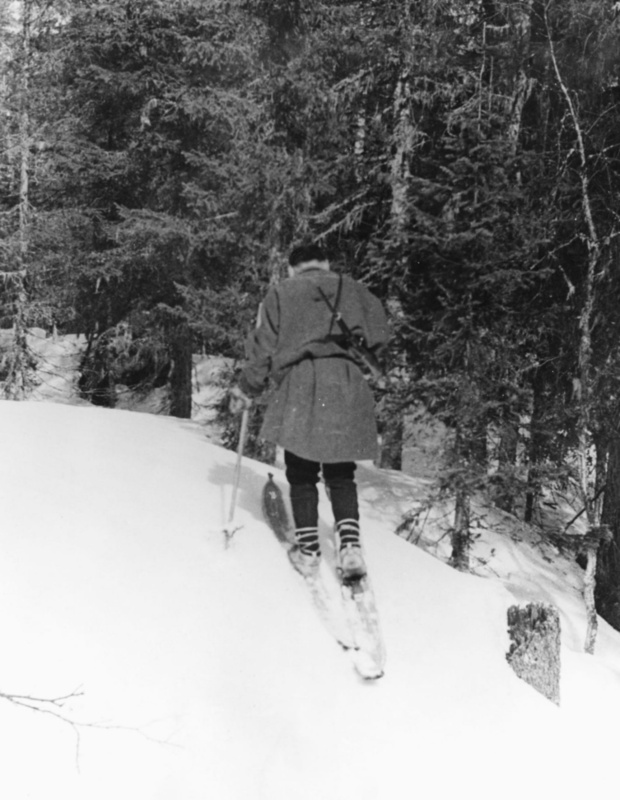 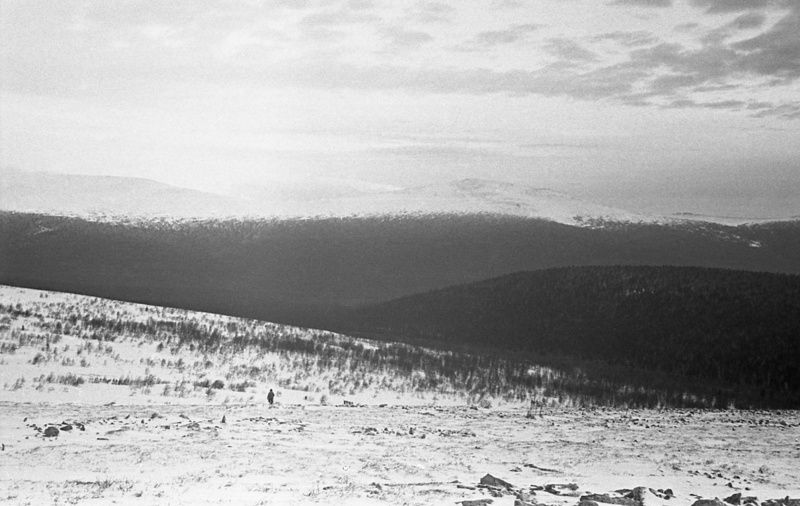 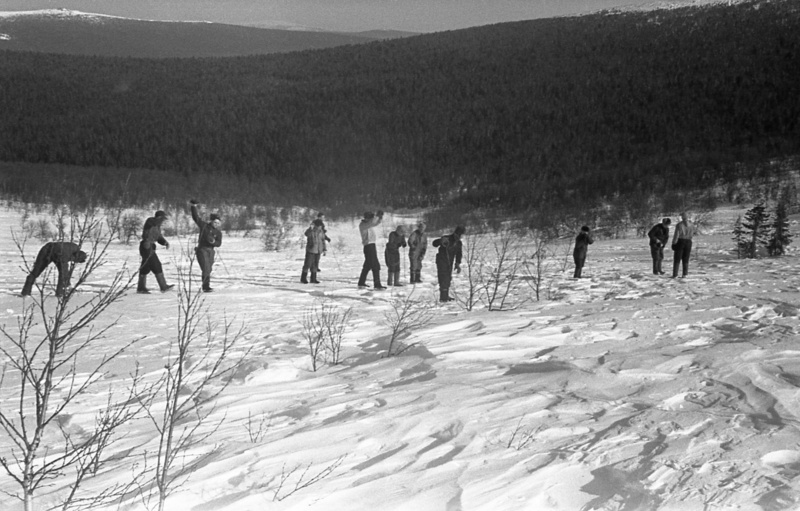 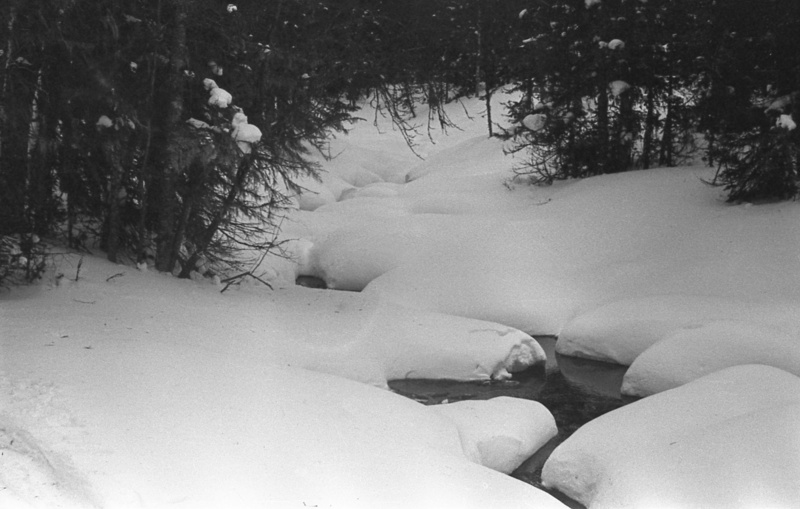 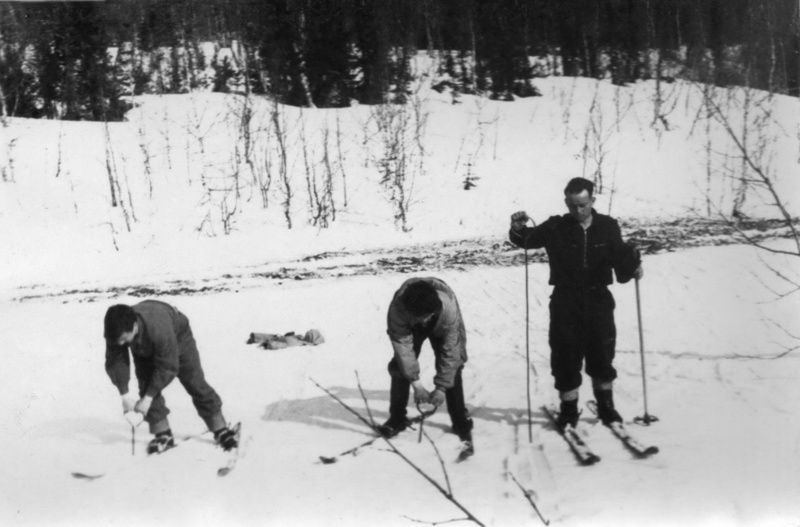 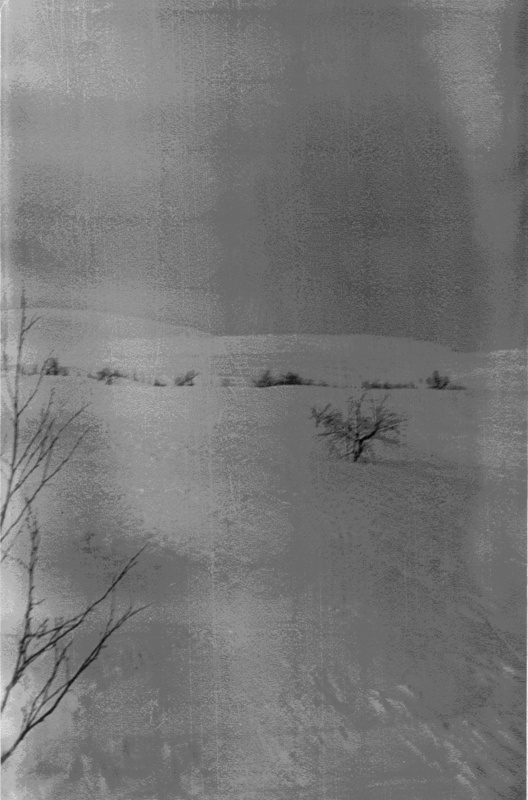 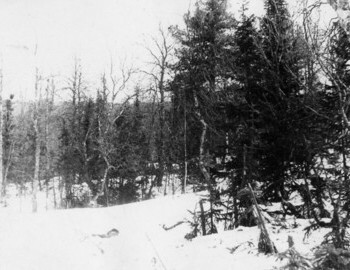 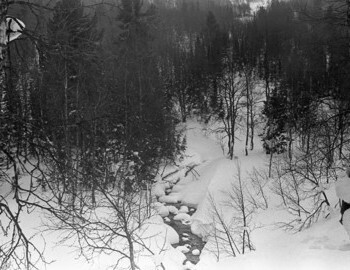 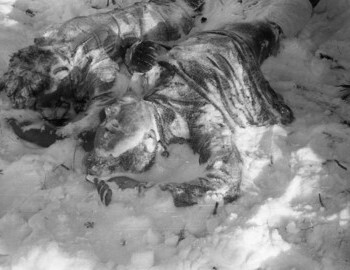 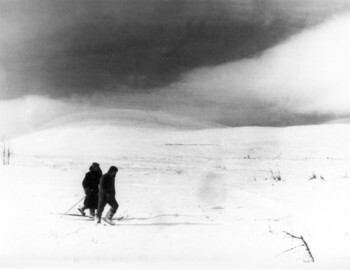 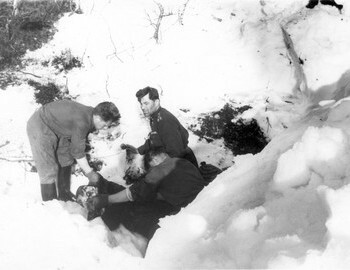 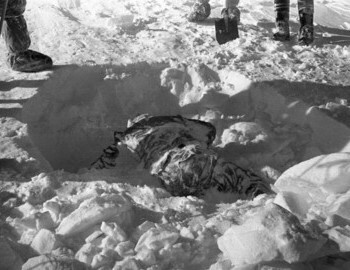 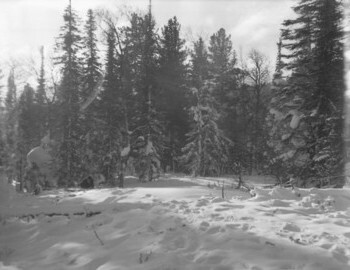 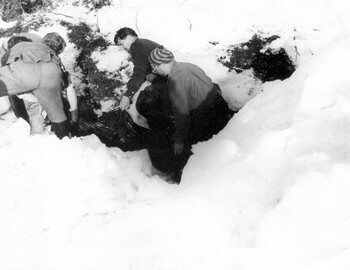 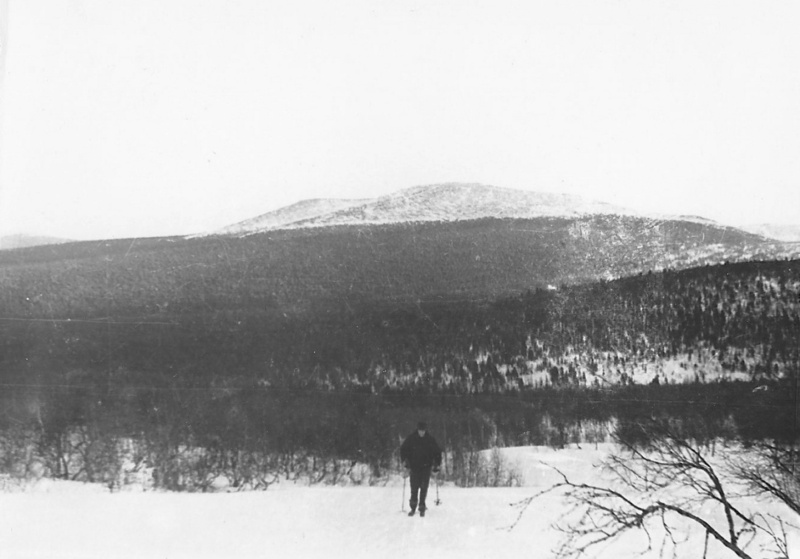 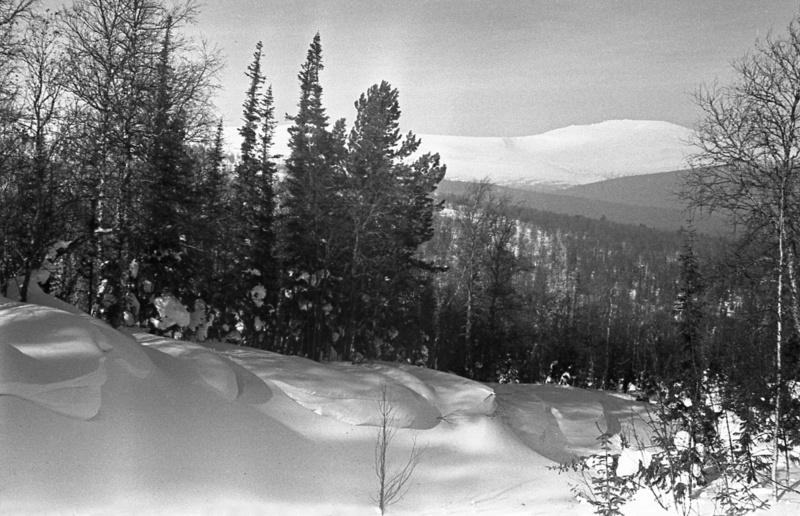 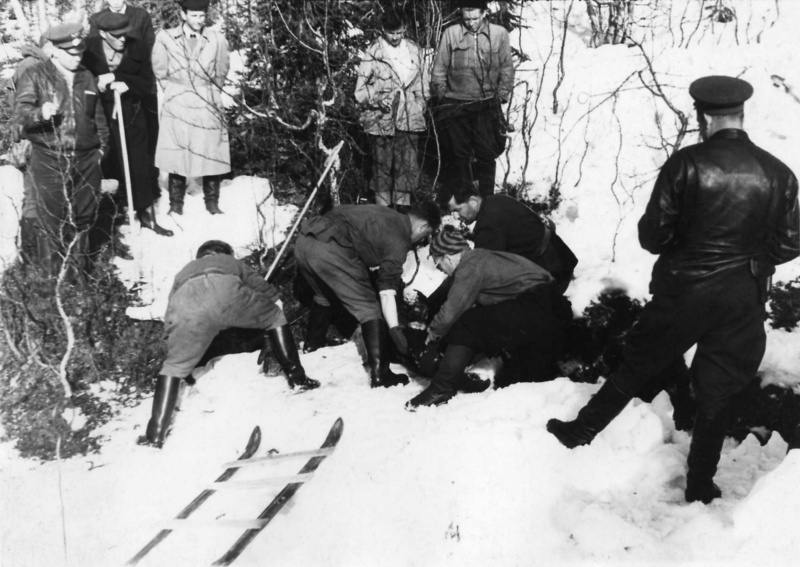 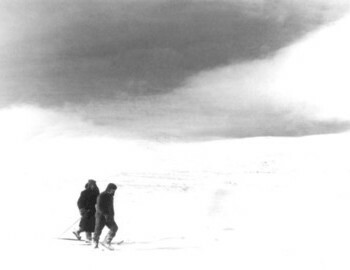 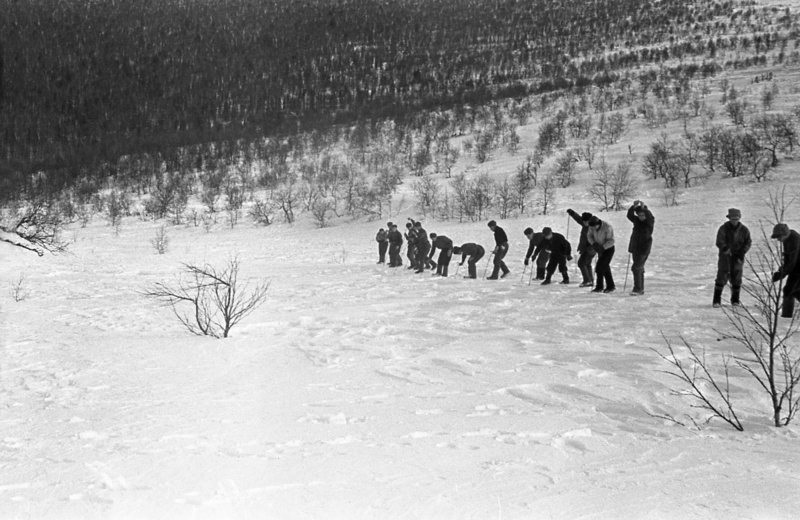 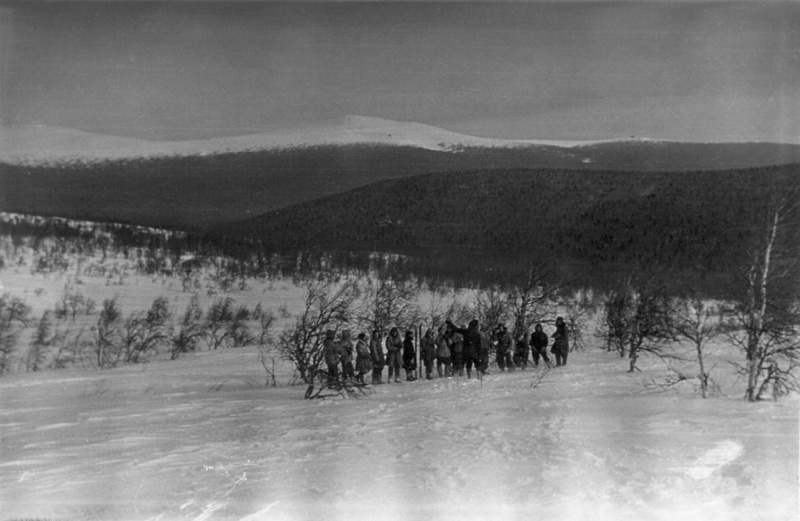 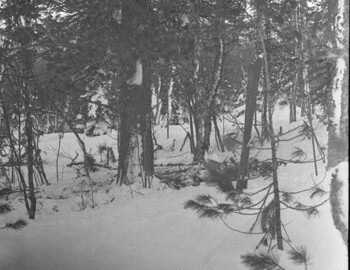 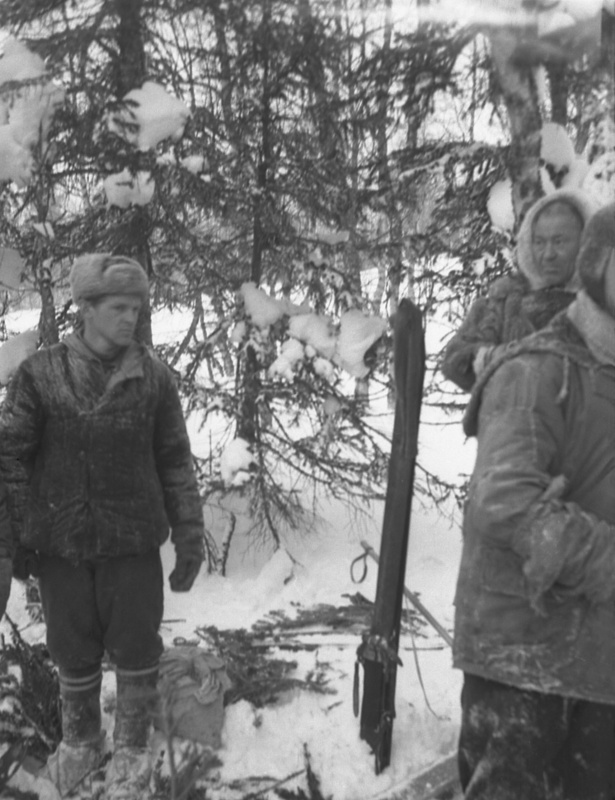 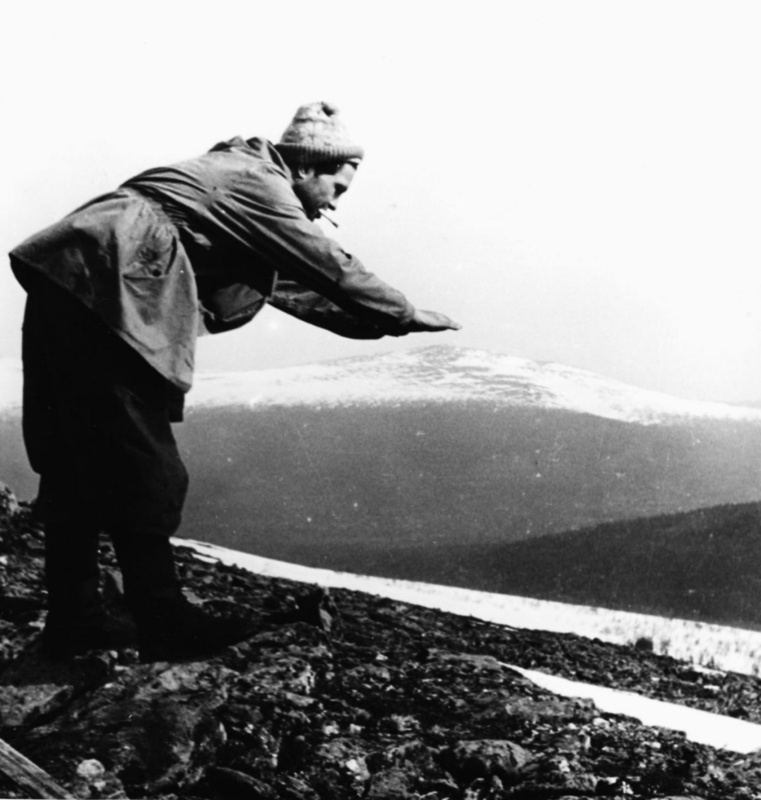 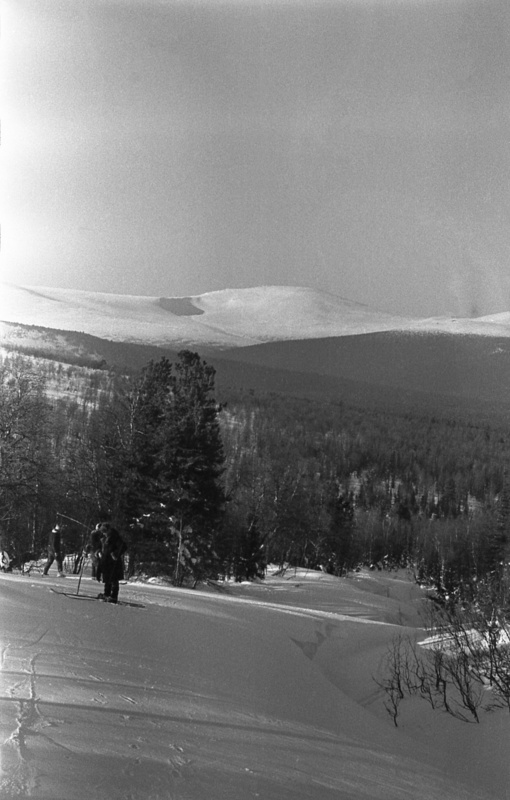 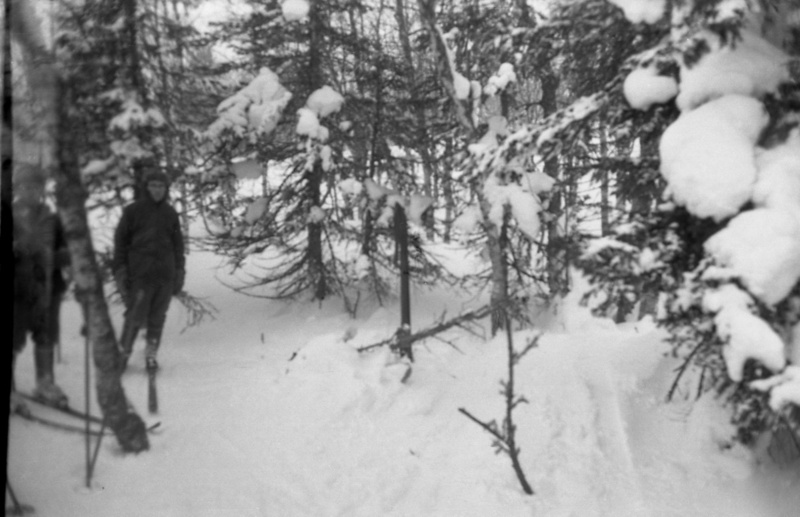 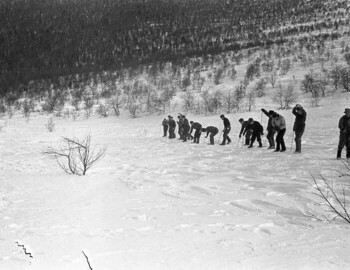 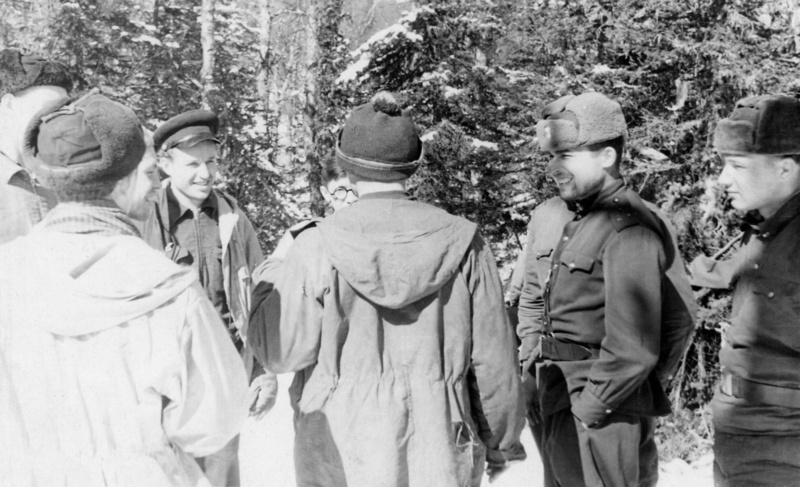 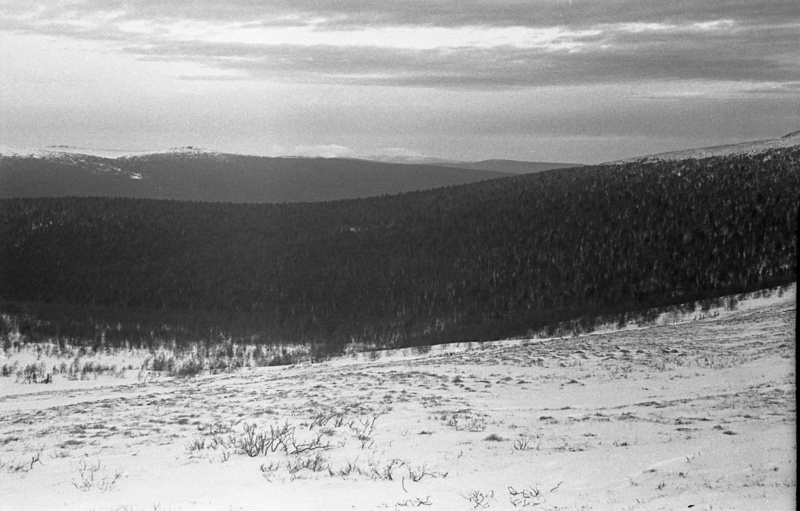 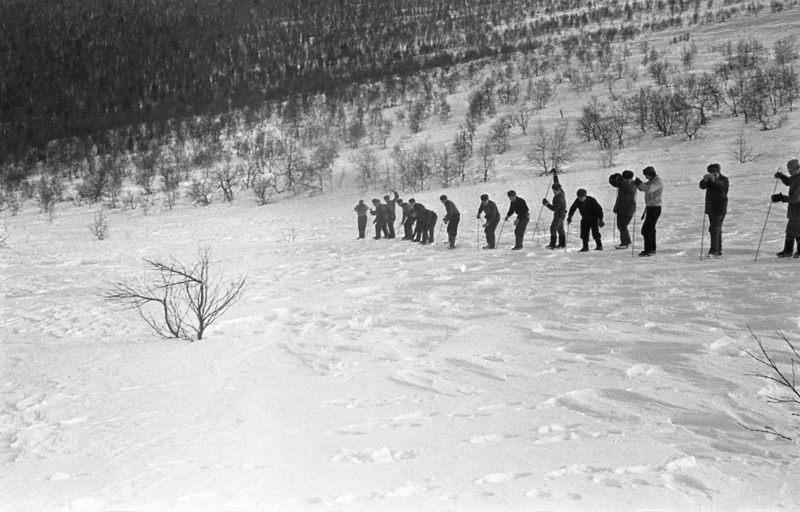 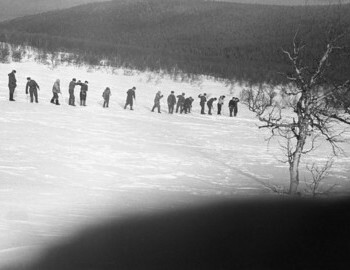 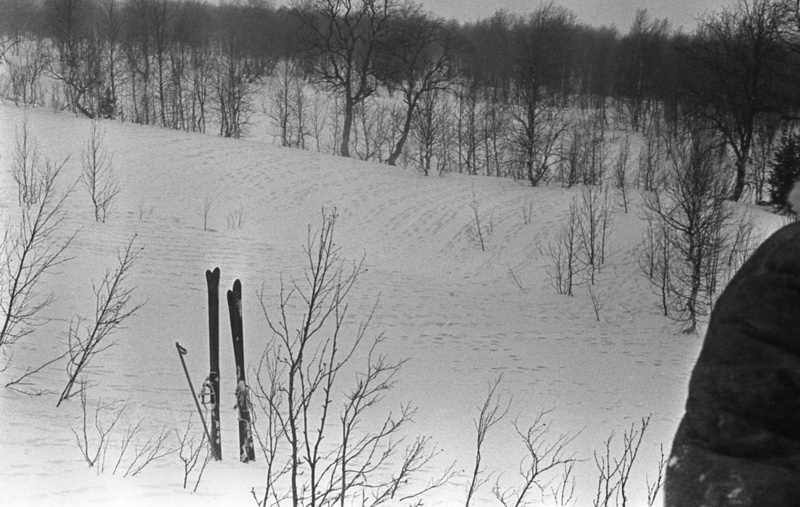 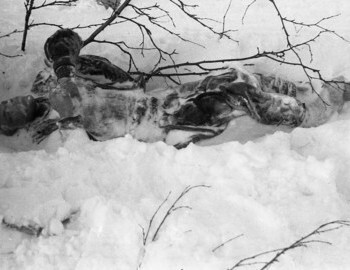 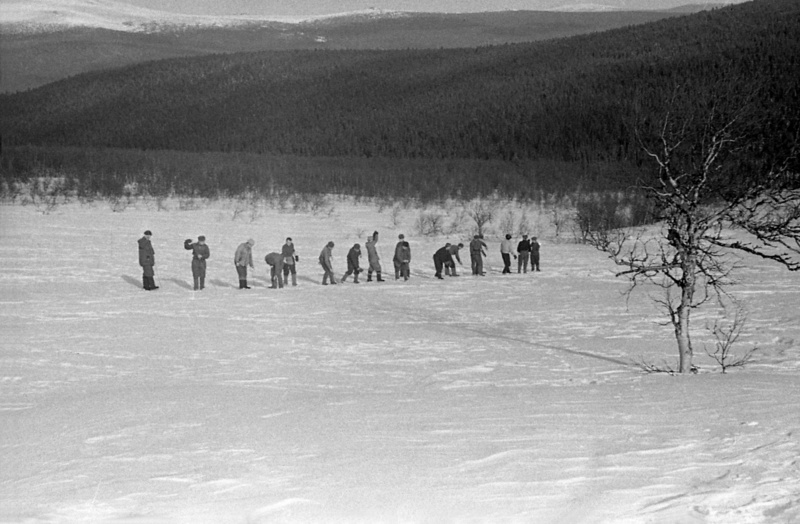 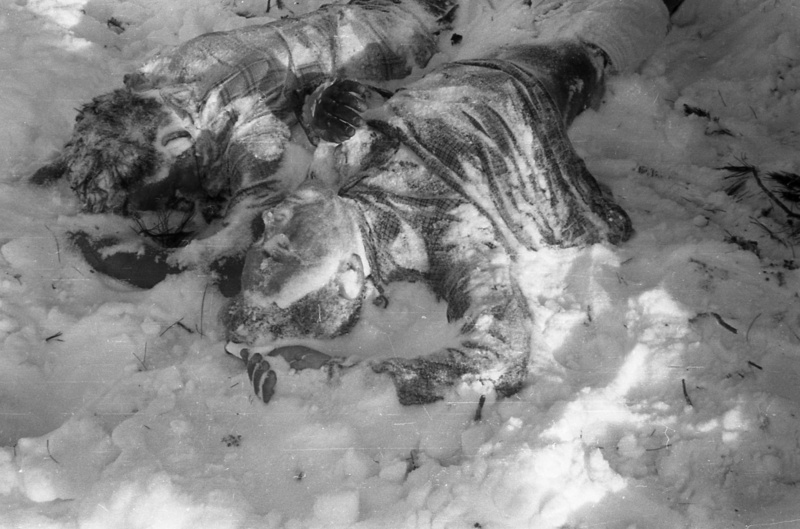 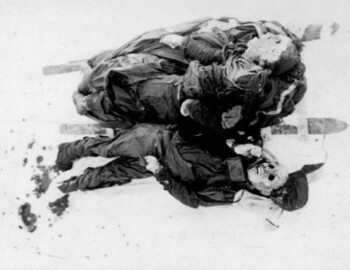 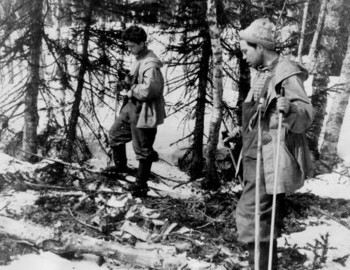 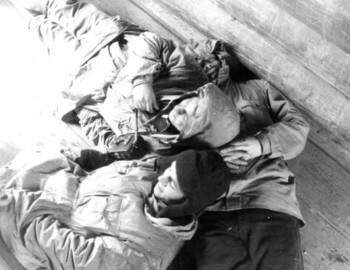 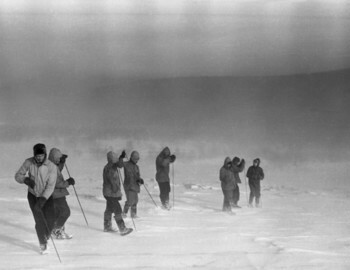 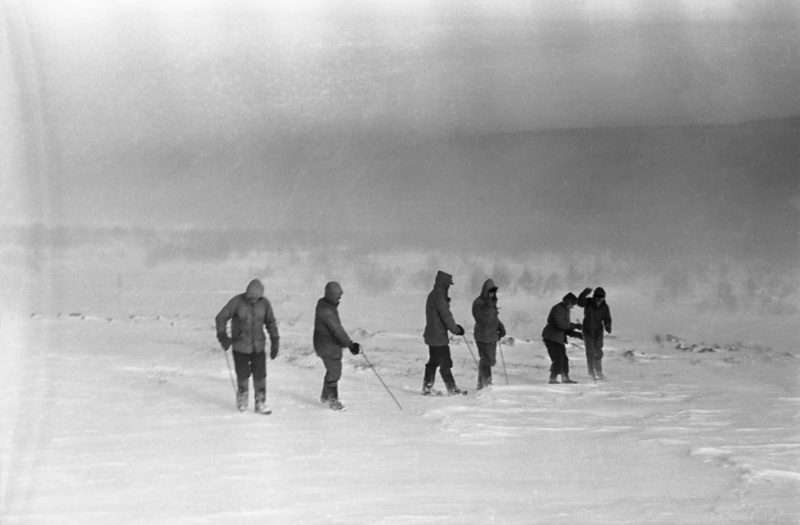 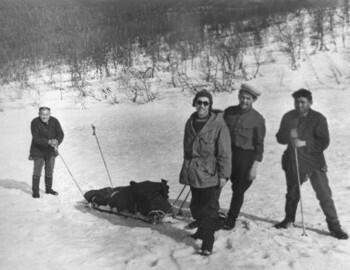 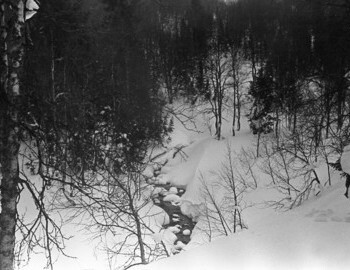 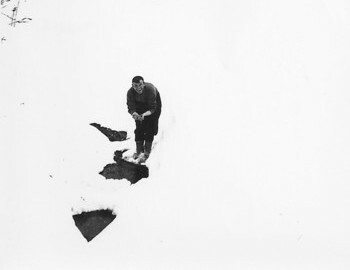 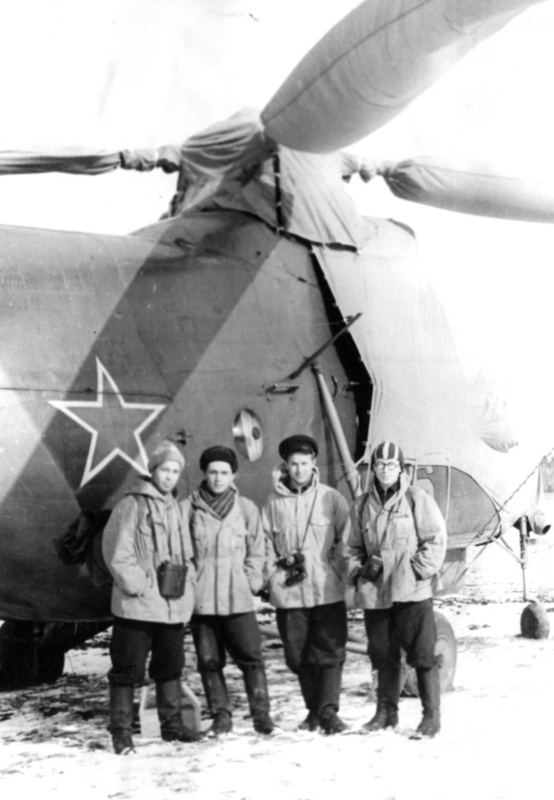 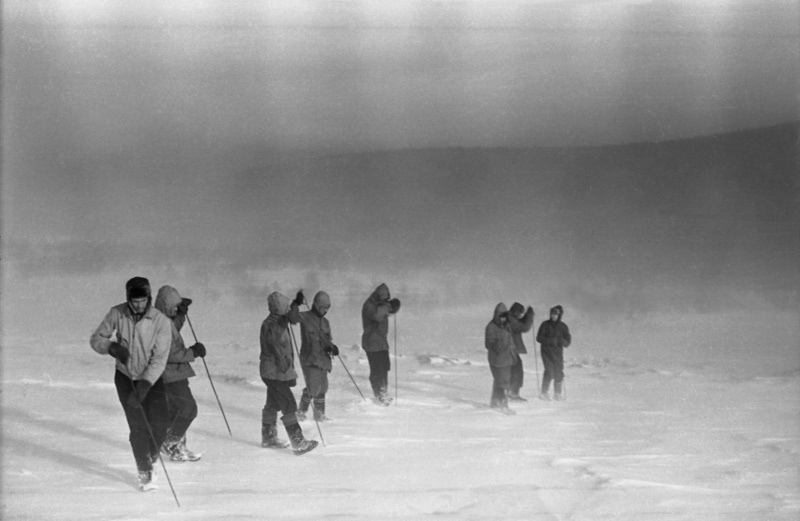 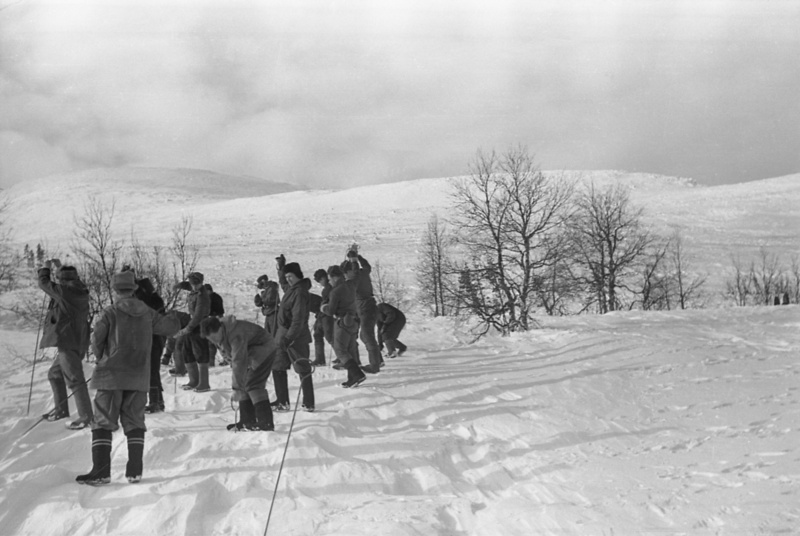 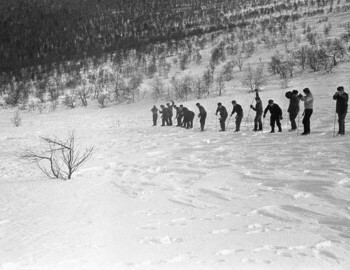 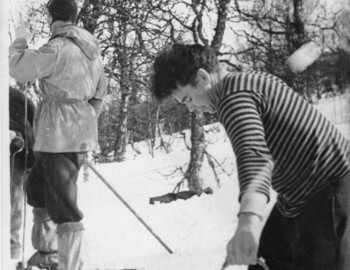 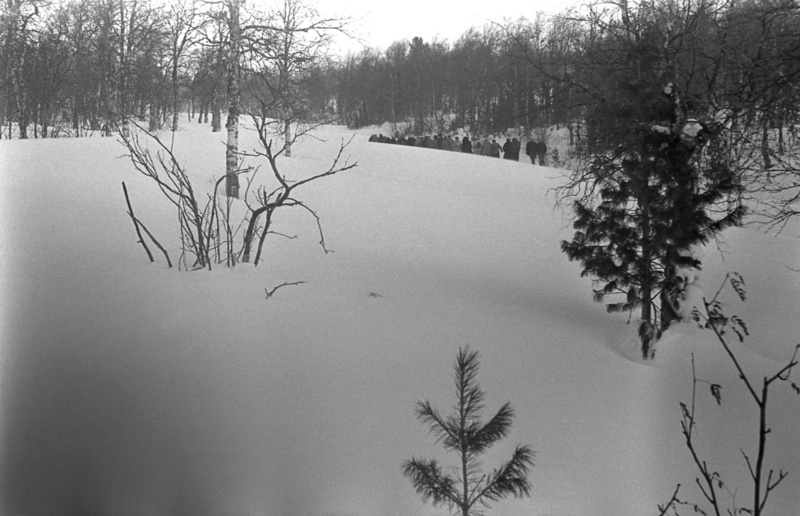 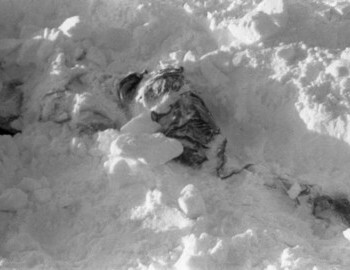 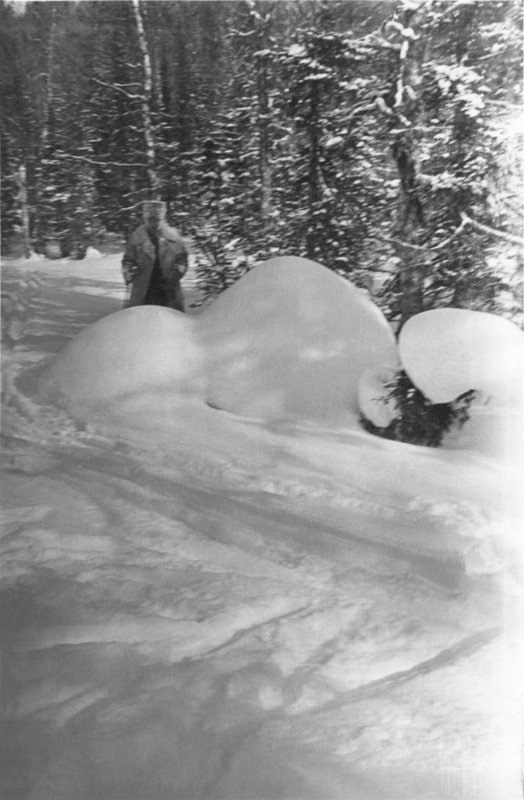 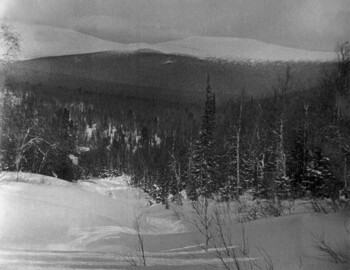 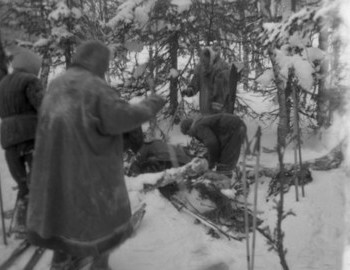 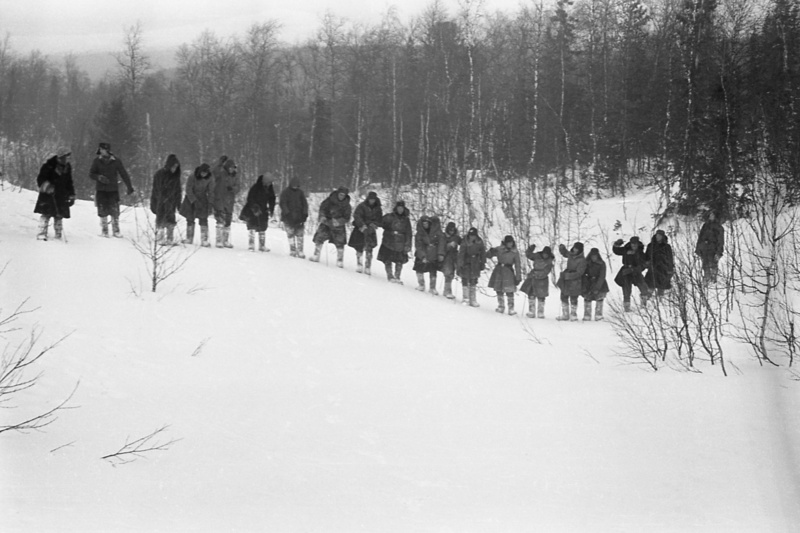 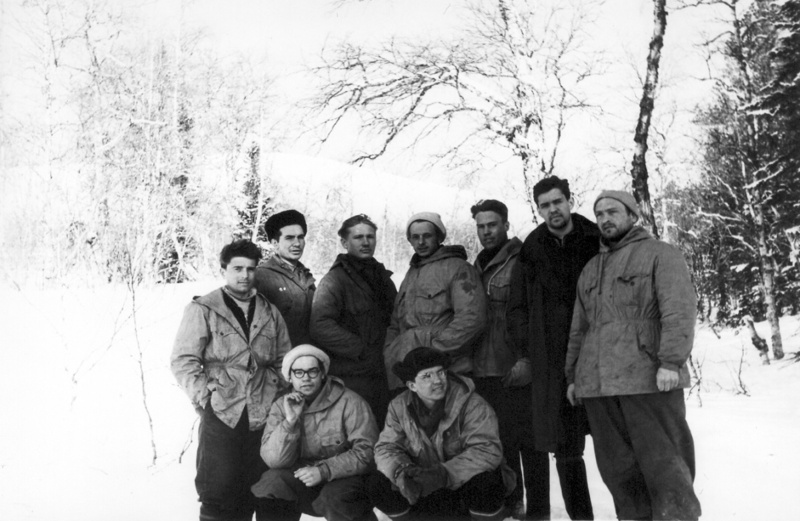 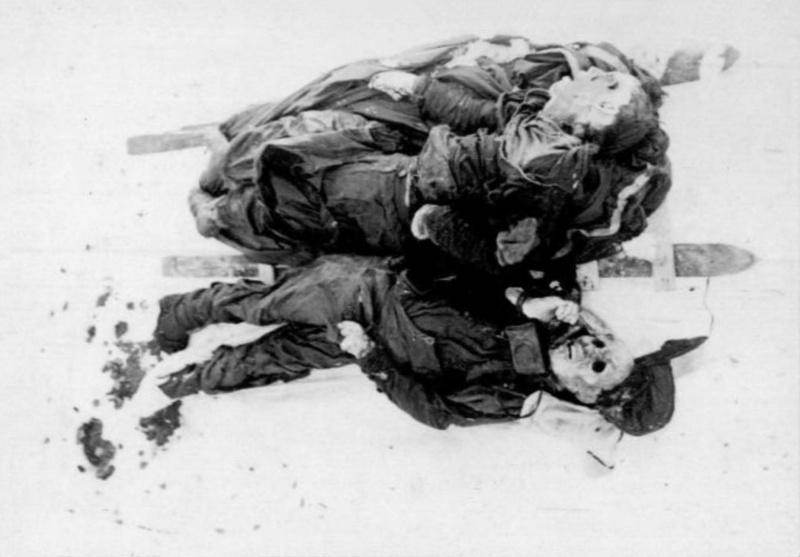 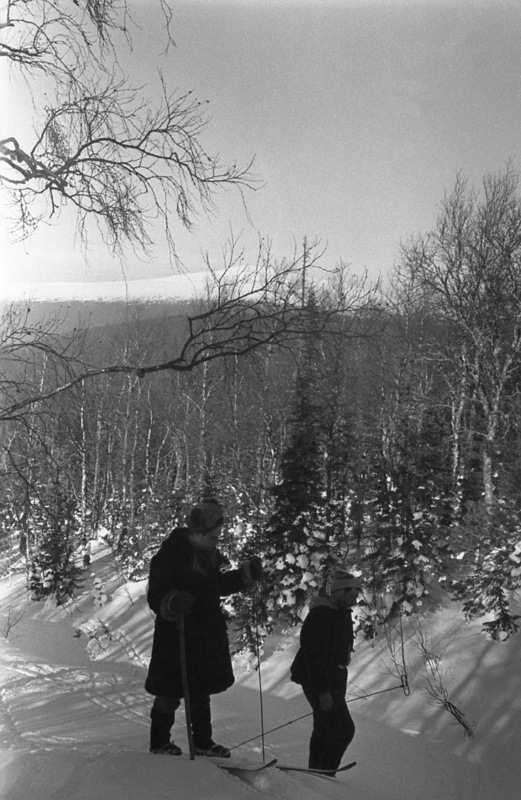 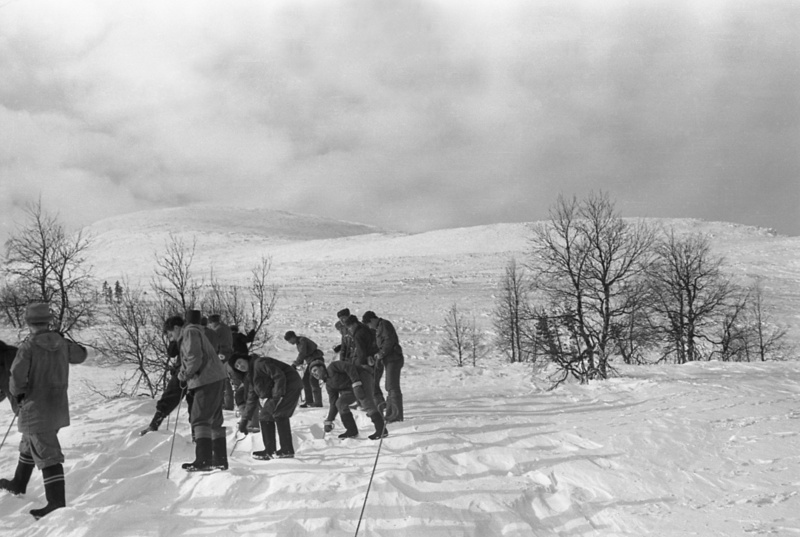 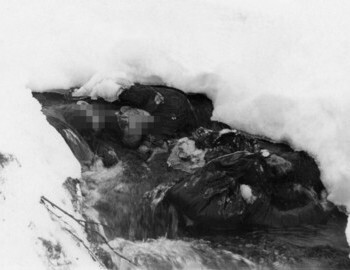 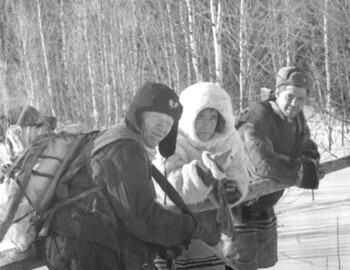 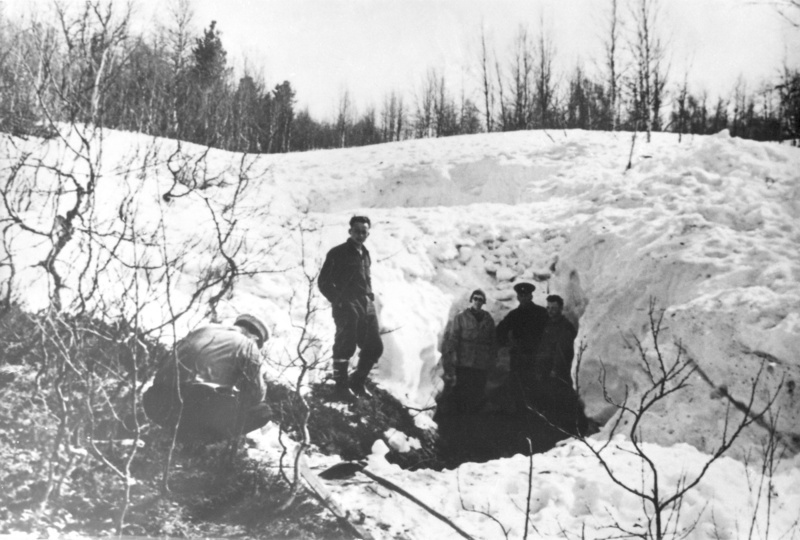 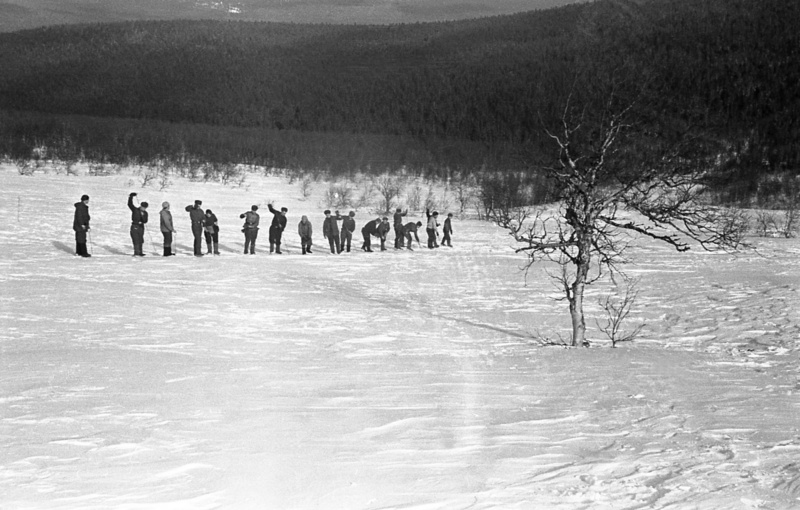 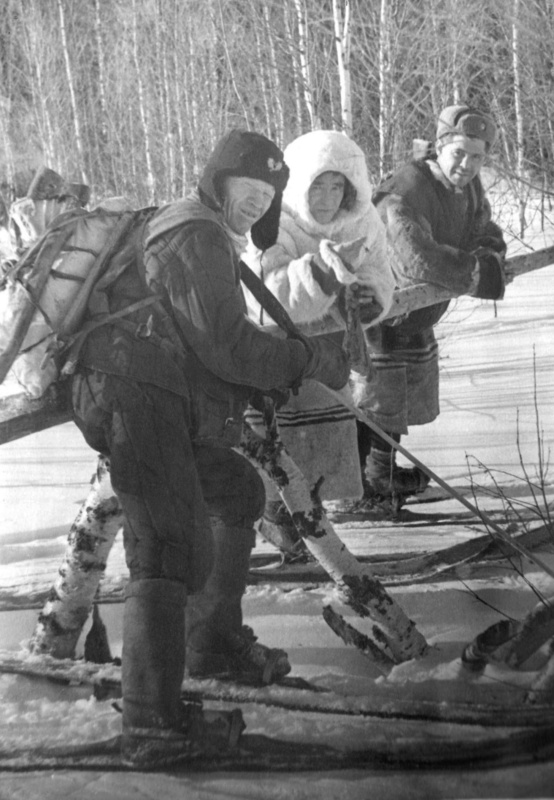 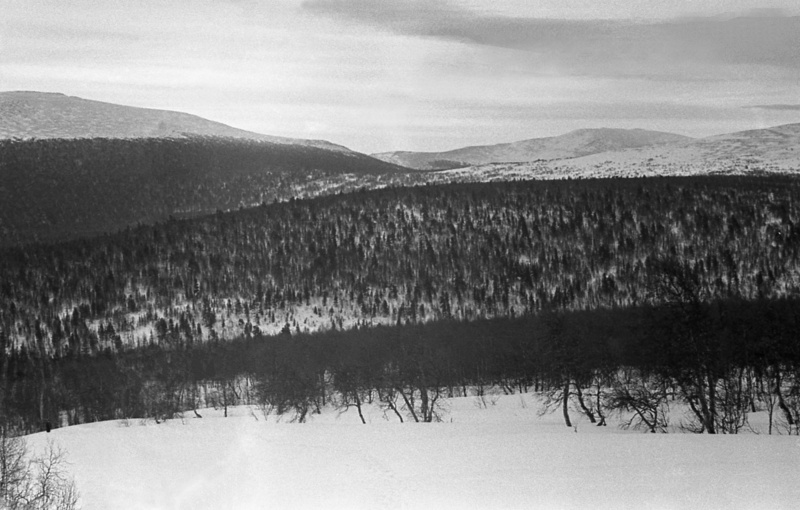 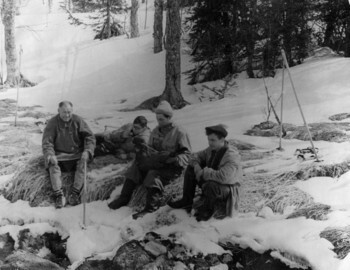 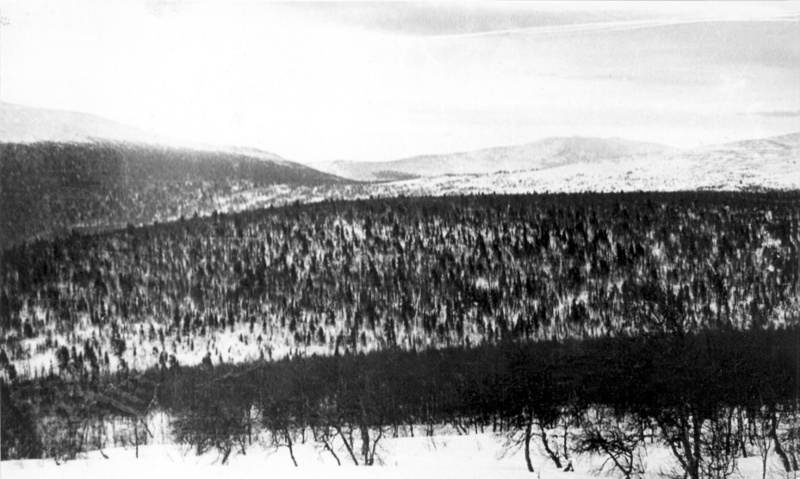 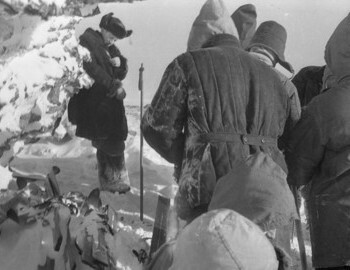 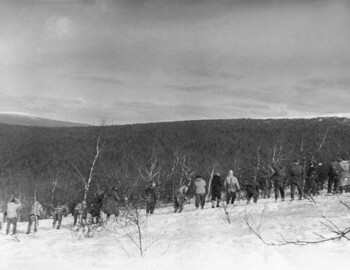 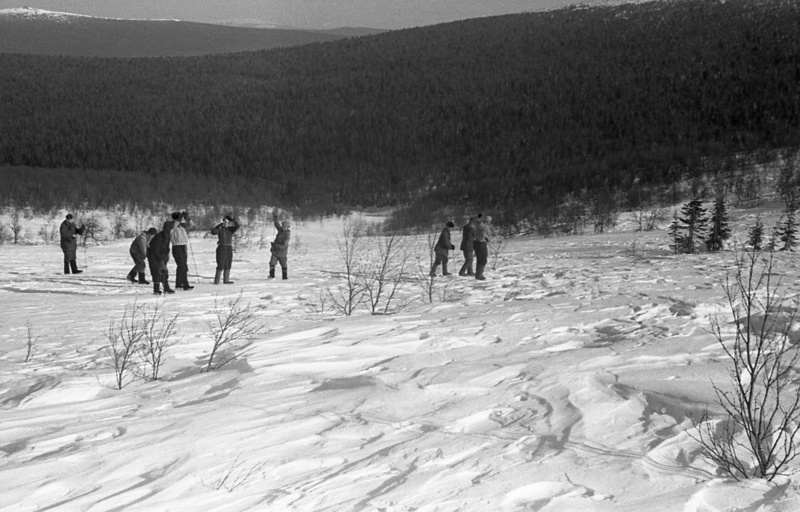 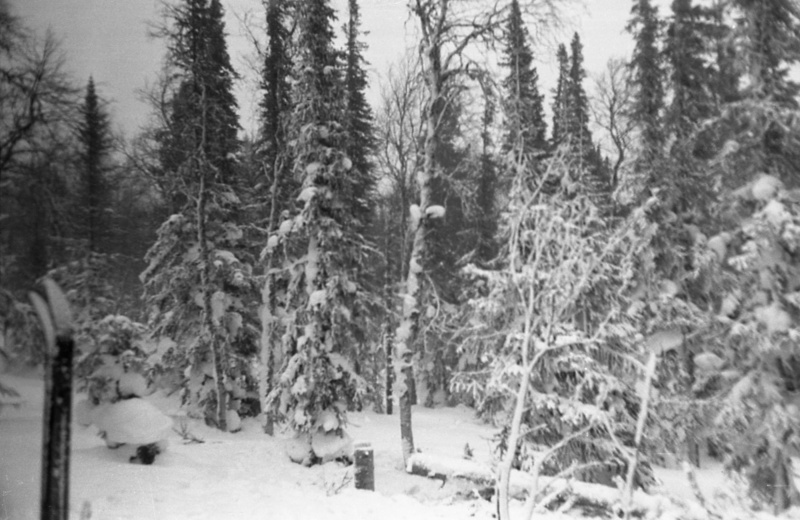 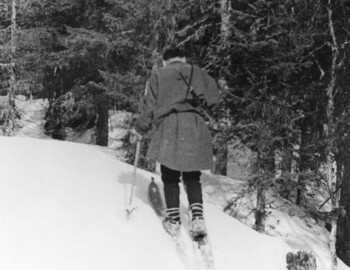 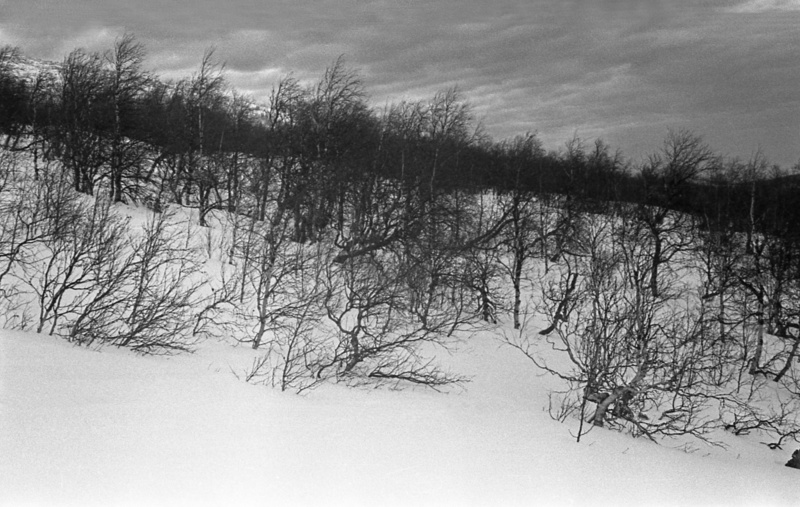 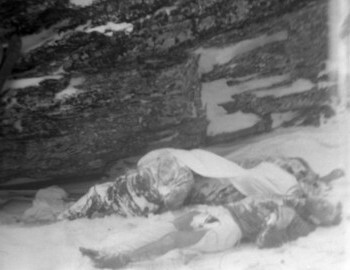 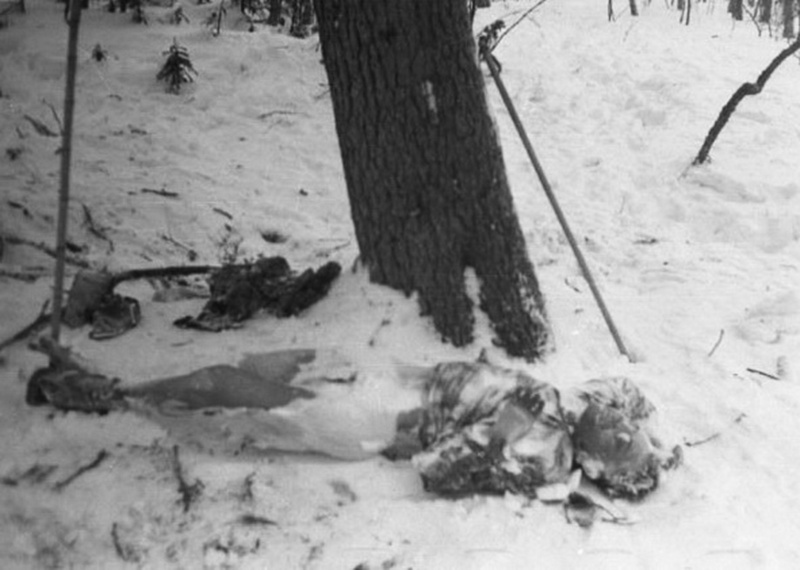 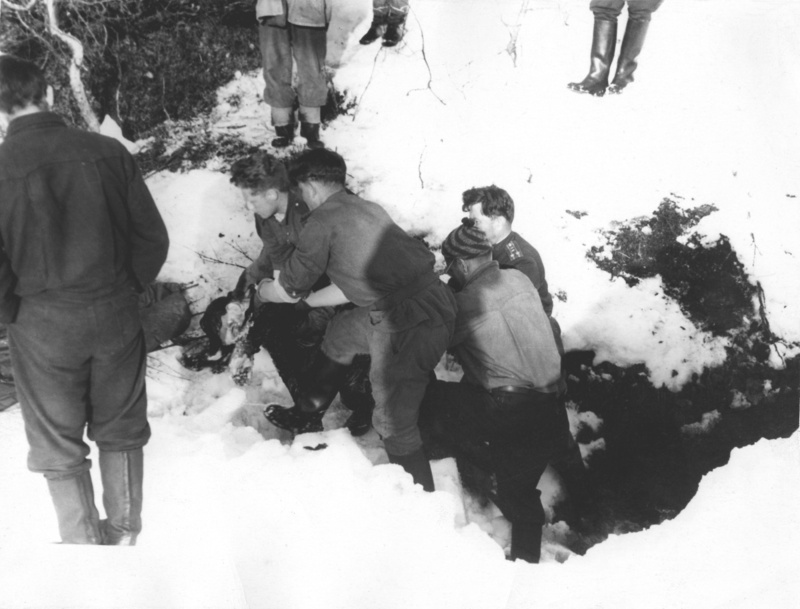 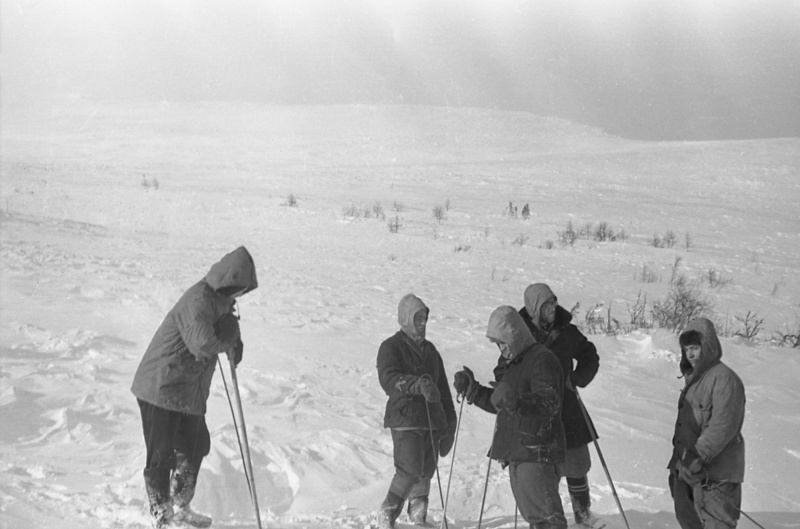 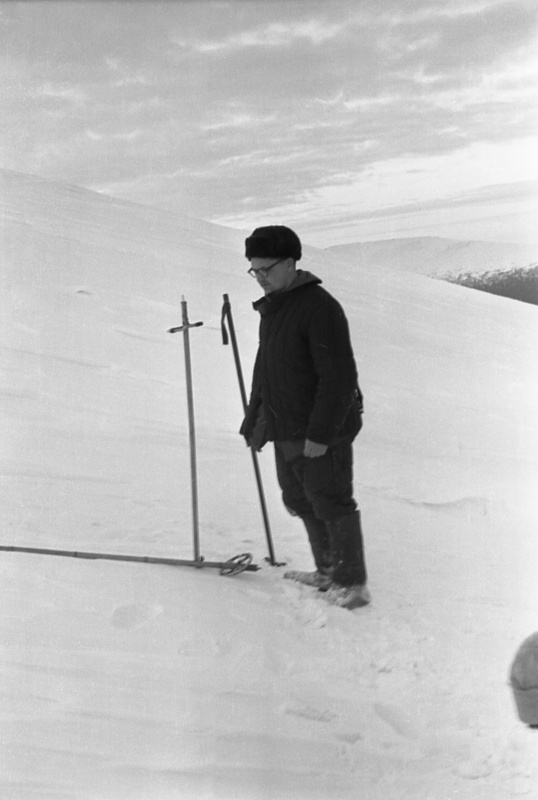 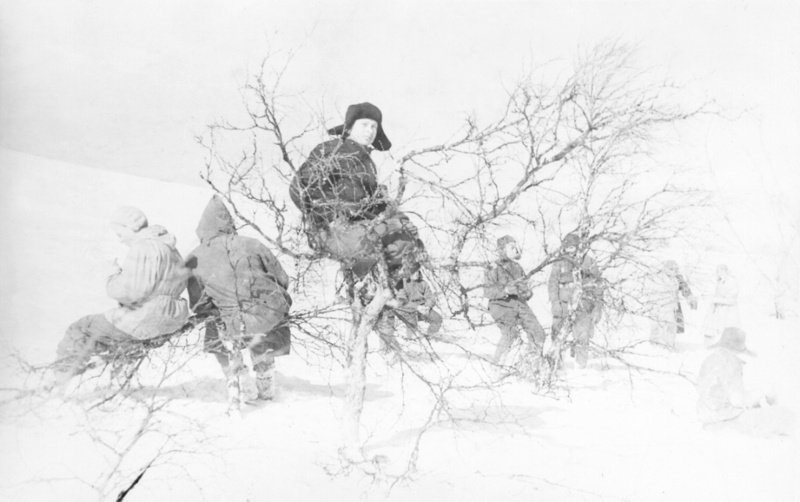 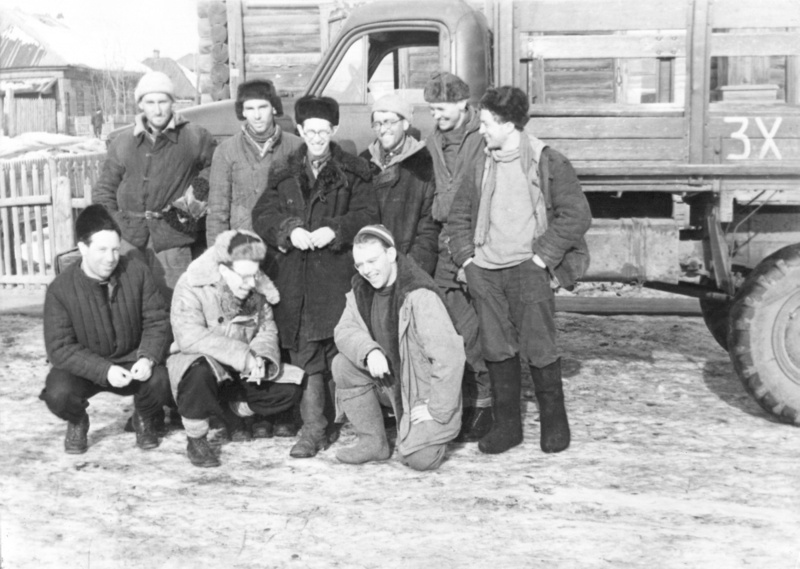 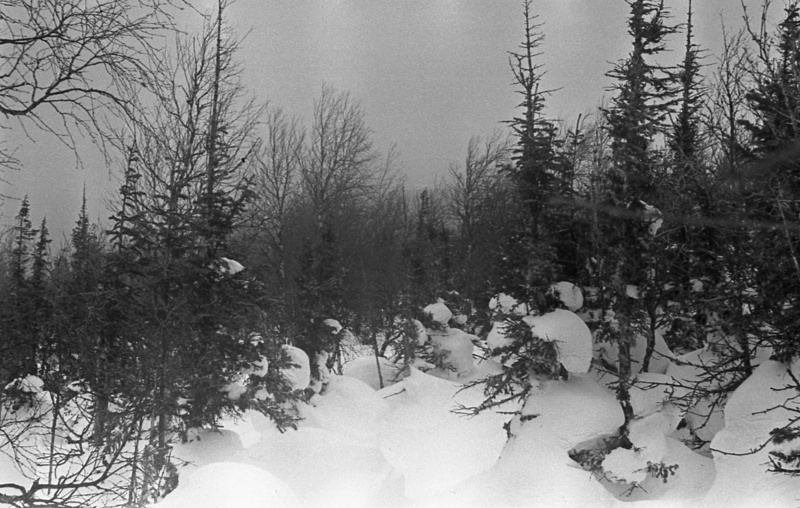 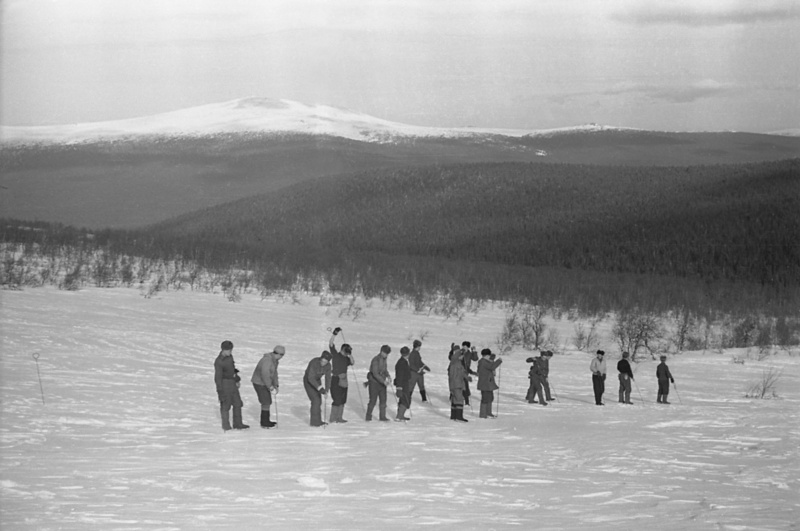 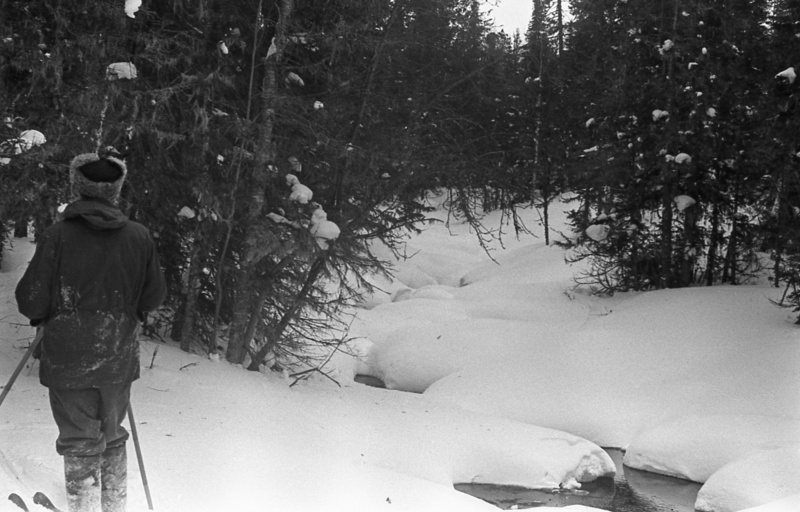 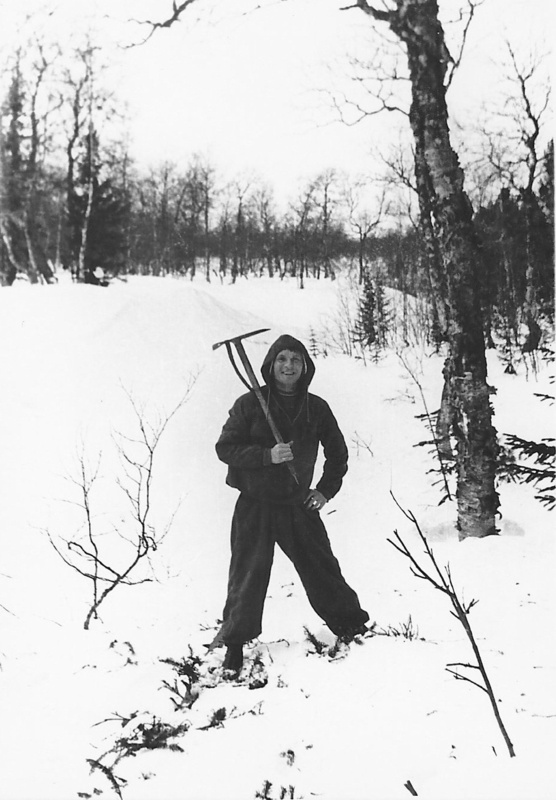 Unfortunately no one expected to find the hikers dead so there was no attempt to preserve or record the footprints of people around the Dyatlov Pass. 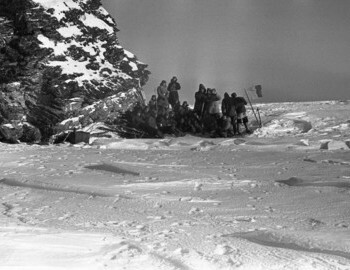 To this day there has been a discussion of exactly how many people were in this pass on that fateful day. 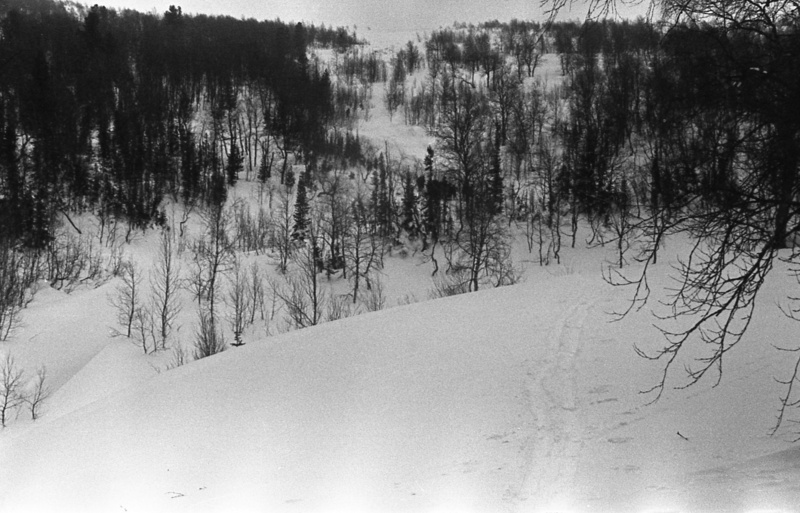 However judging by words of the people involved in the search and who took the lower right picture there were definitely 8-9 tracks of footprints left by hikers who wore almost no footwear. 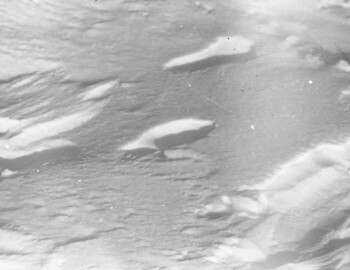 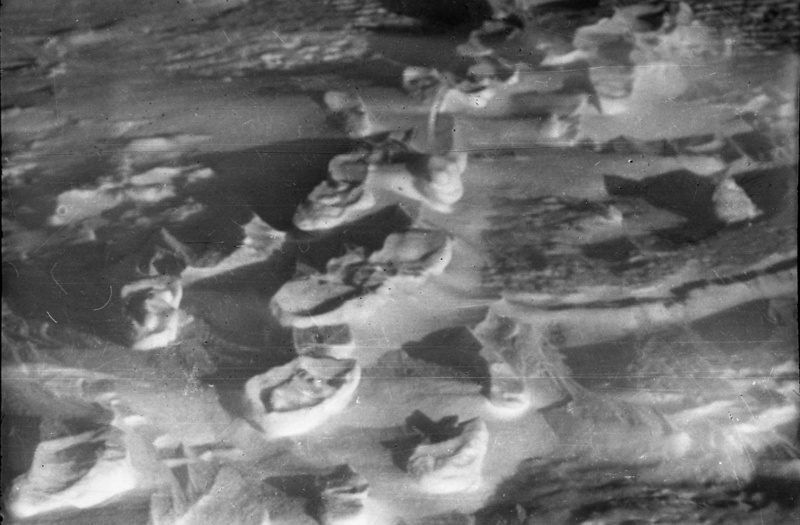 Their feet pressed the snow and this left a characteristic "columns" of pressed snow with a footprint on top. 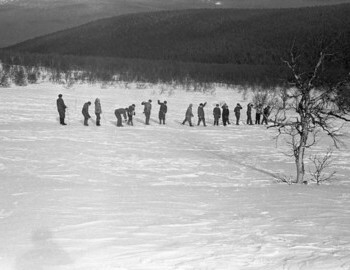 Members of the group walked in a single file with a tall men walking in the back. 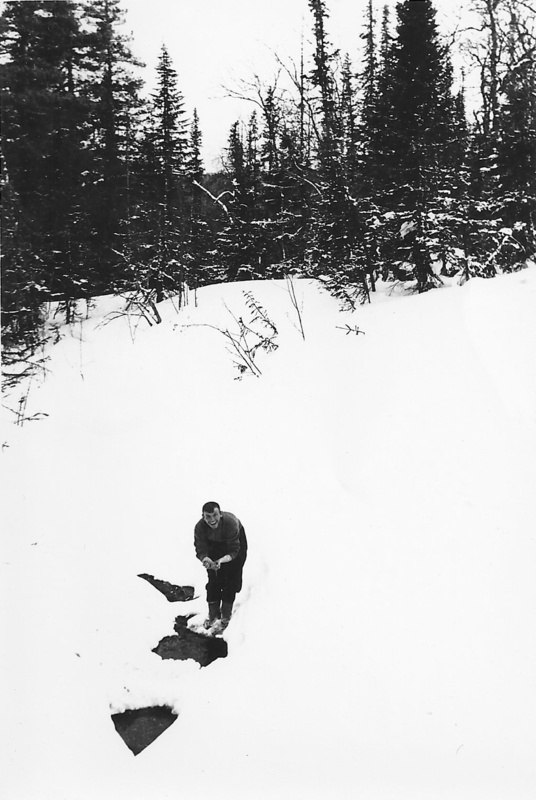 His footprints partially covered the footprints of his friends who walked in front of him. 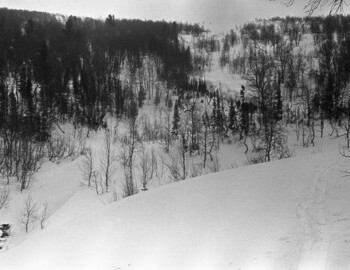 Overall the path gave an impression of organized and uneventful descent down the slope of the mountain. 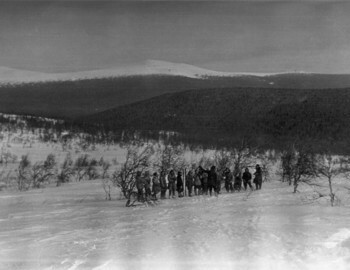 Several trails would deviate from the general direction, but then rejoin the group. 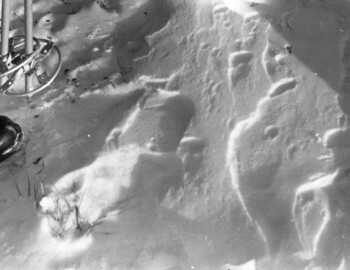 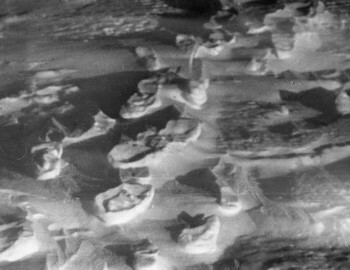 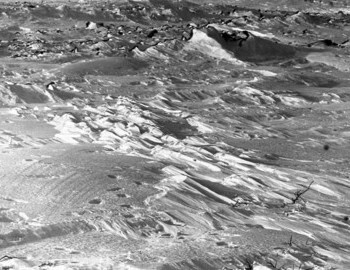 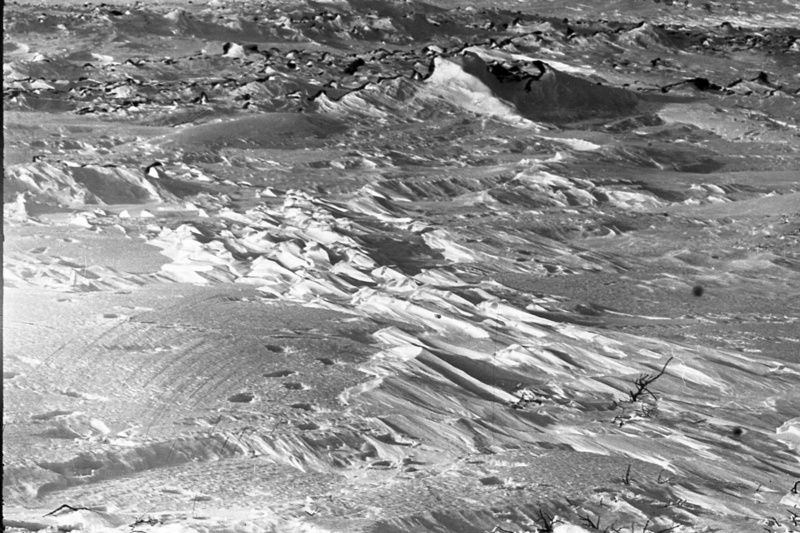 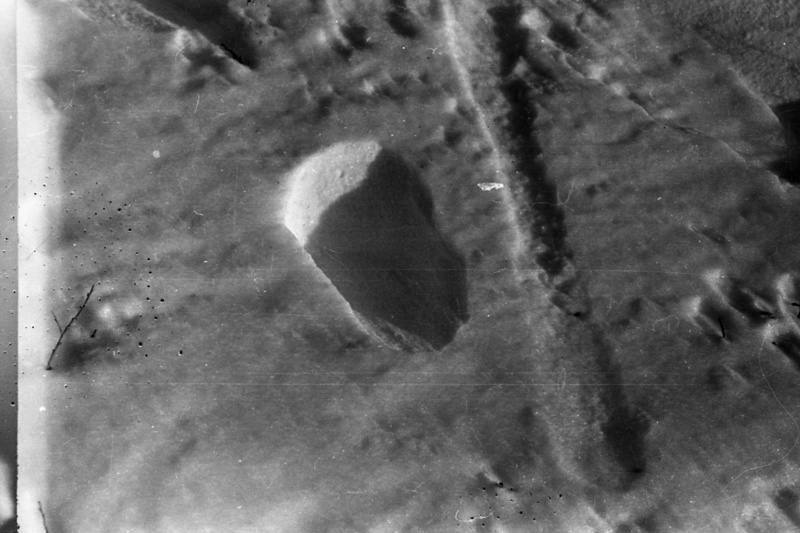 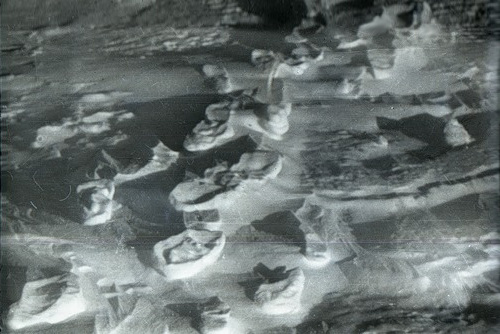 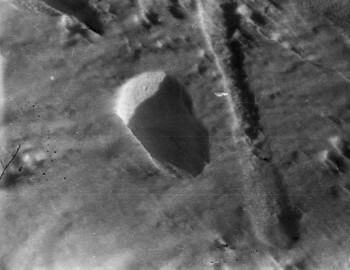 Other footprints were also discovered and photographed. 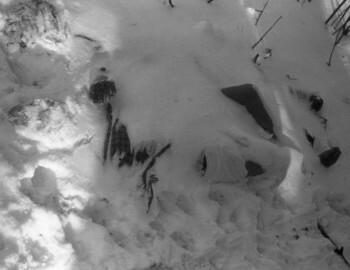 It is hard to say if these were left by someone else or rescuers themselves. 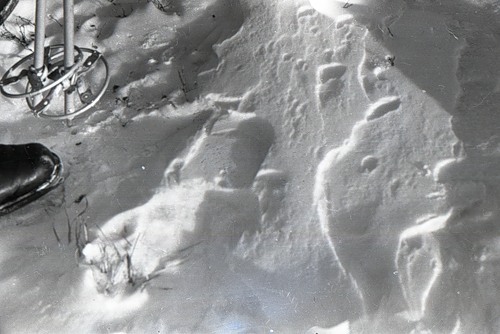 (1) male footprints with not very big steps (2) small female footprints (3) two overlapping male footprints, and (4) larger male footprints that go on same track as the girl's as if this person was covering or walking behind the group. 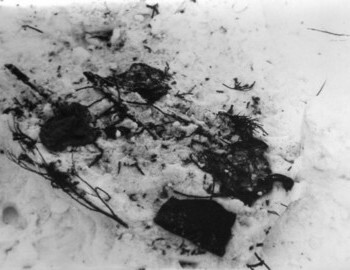 The only footprint of a boot, you can clearly see the heel of a shoe. 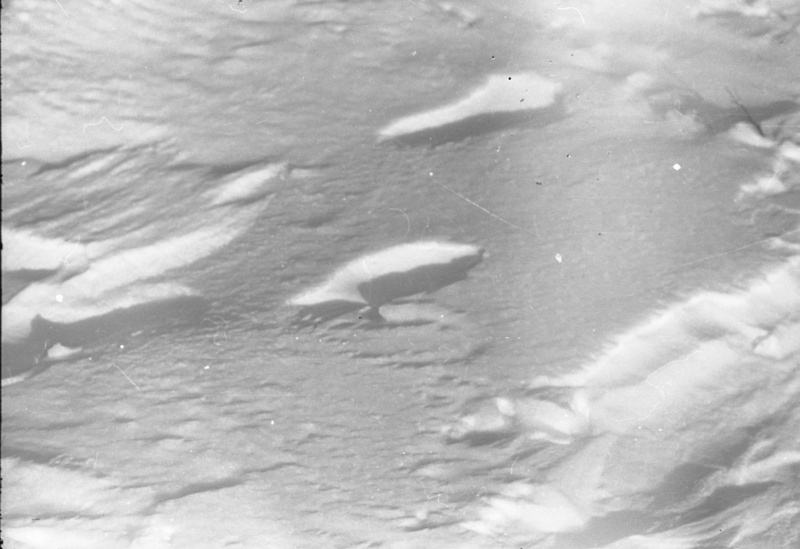 The imprint is not complete, the heel is deeper, the sole - to the middle, this is how a footprint looks like when a person is going downhill putting most of his weight on the heels. 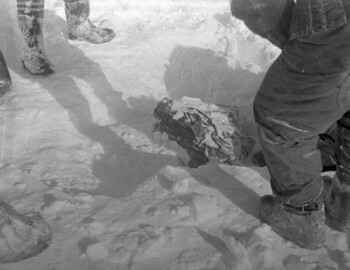 Some members of the rescue team claimed these footprints started from right outside the tent, and others that they started a little to the side of the tent. 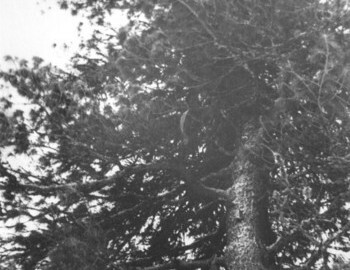 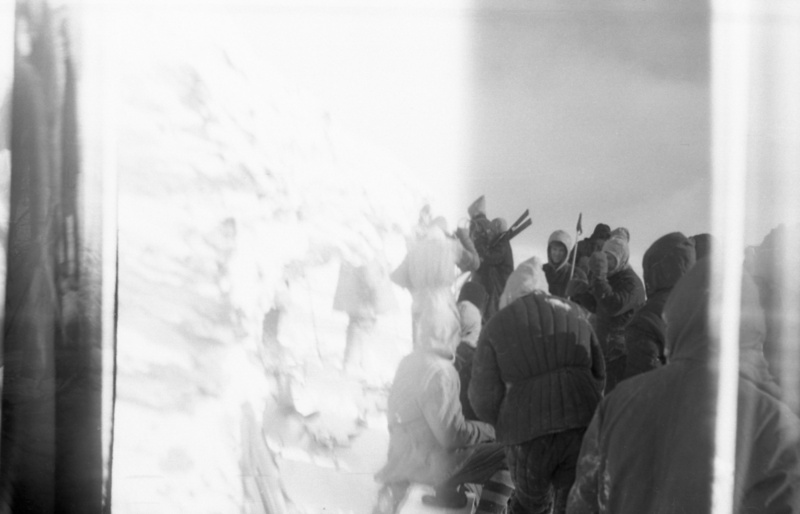 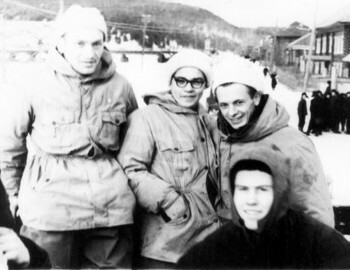 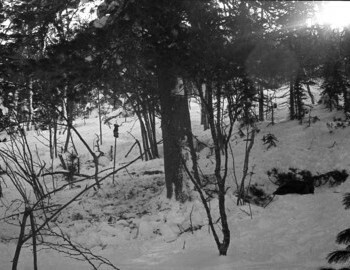 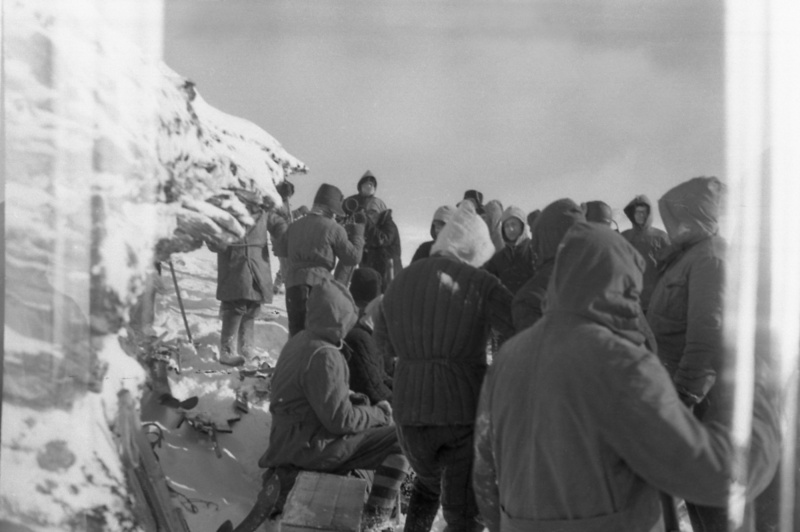 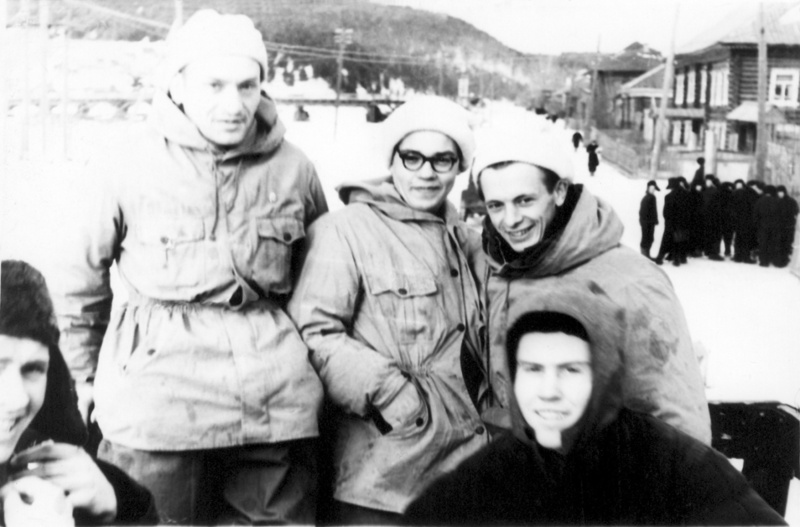 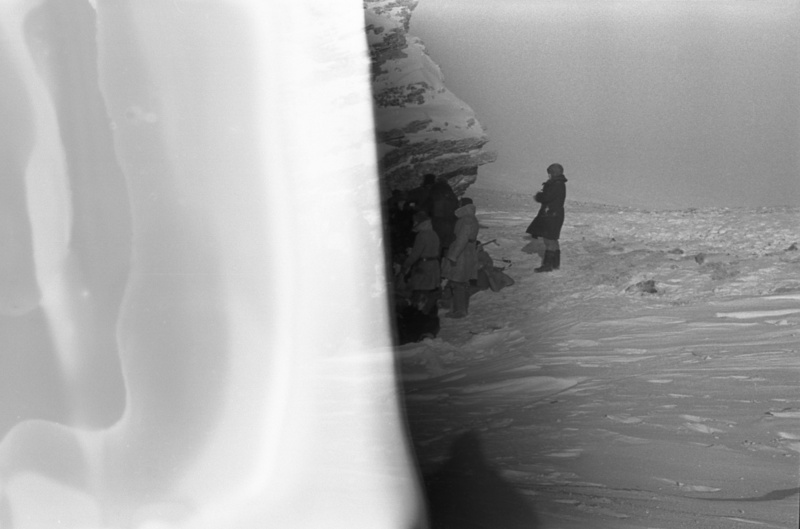 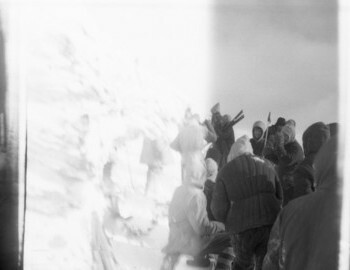 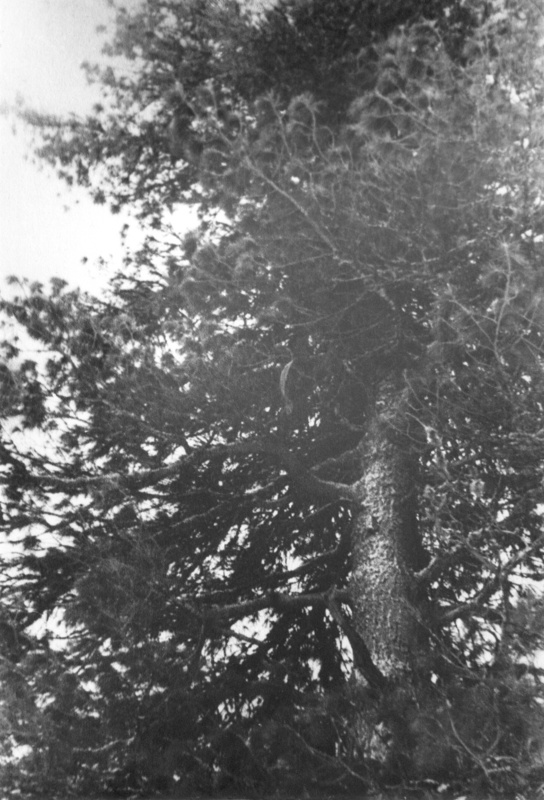 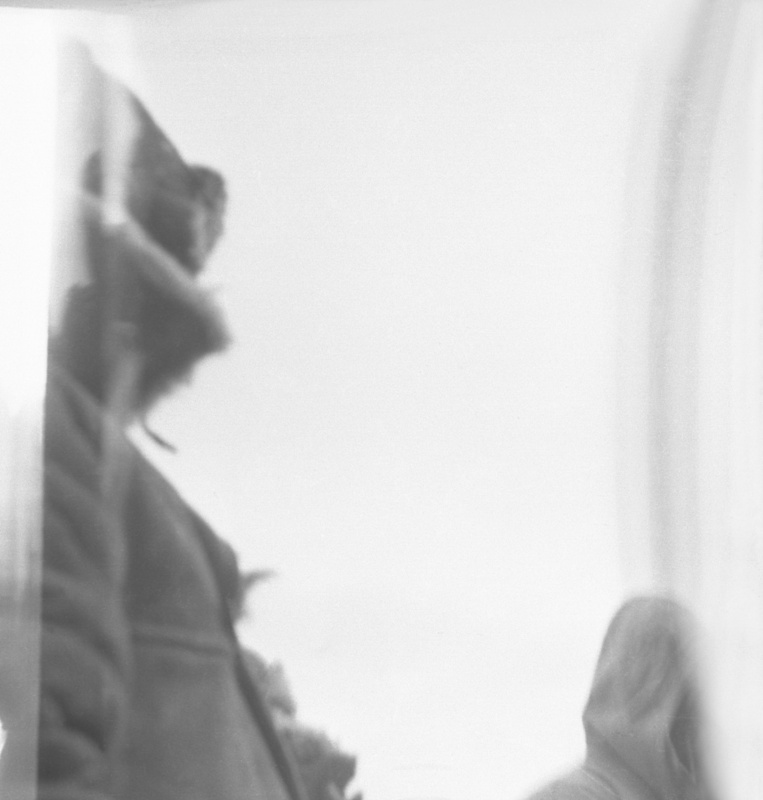 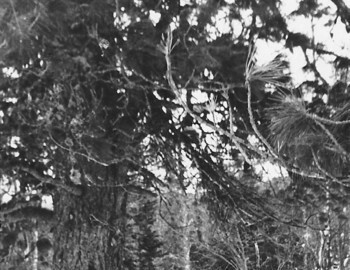 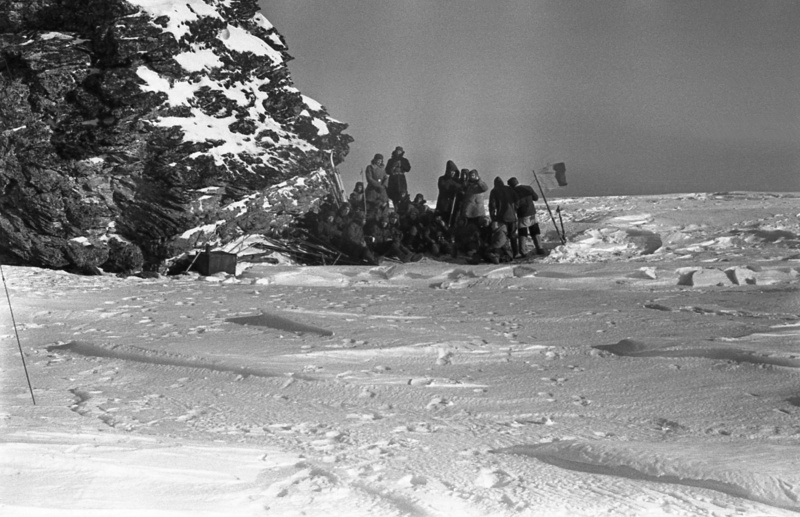 Students took three photo cameras from the tent, group diary, some alcohol and few minor things, and hurried down the mountain to the campsite that was already established at the base of the mountain. 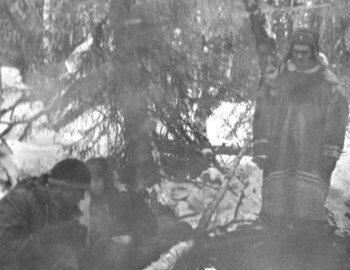 Several Mansi natives joined the group. 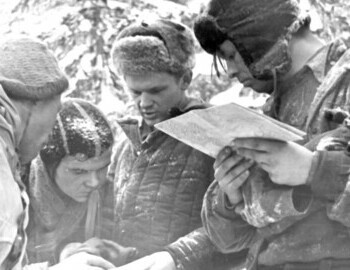 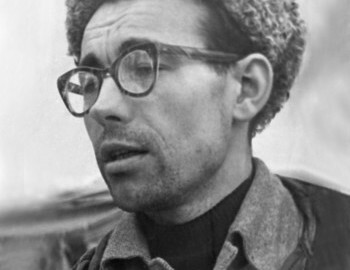 Additionally Egor Semyonovich Nevolin, a radioman, joined the search party. 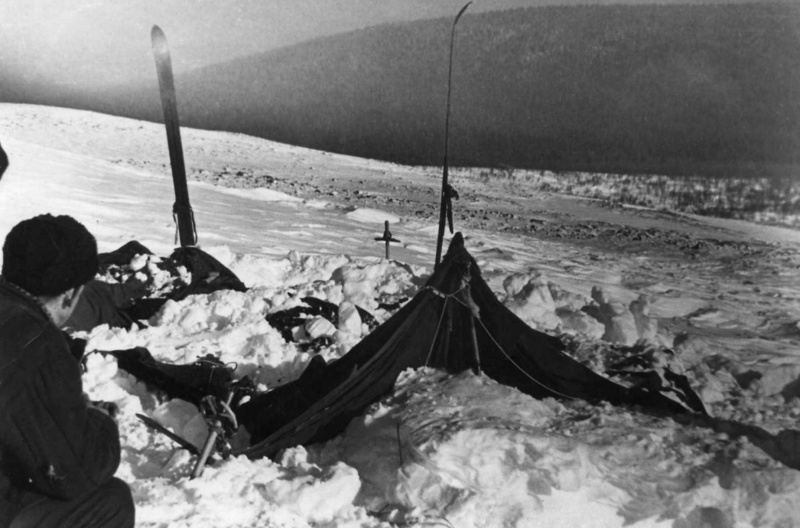 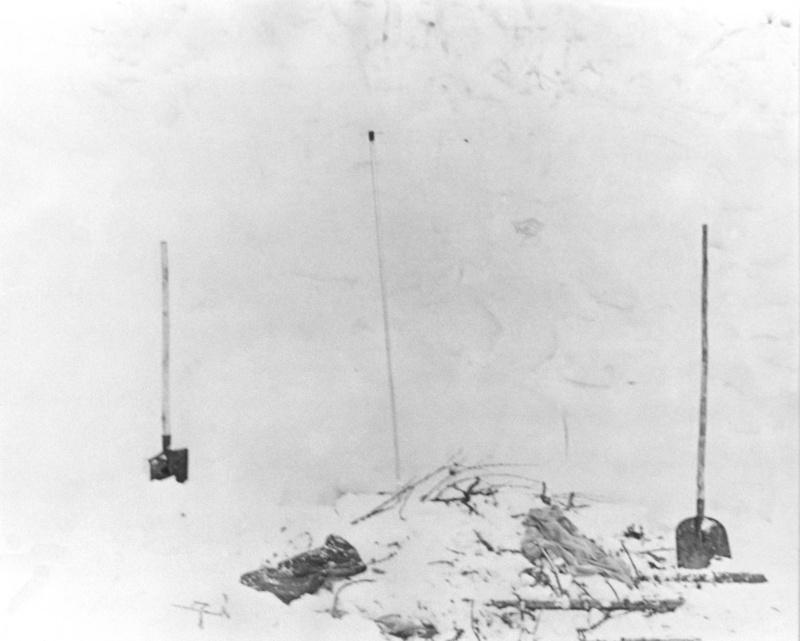 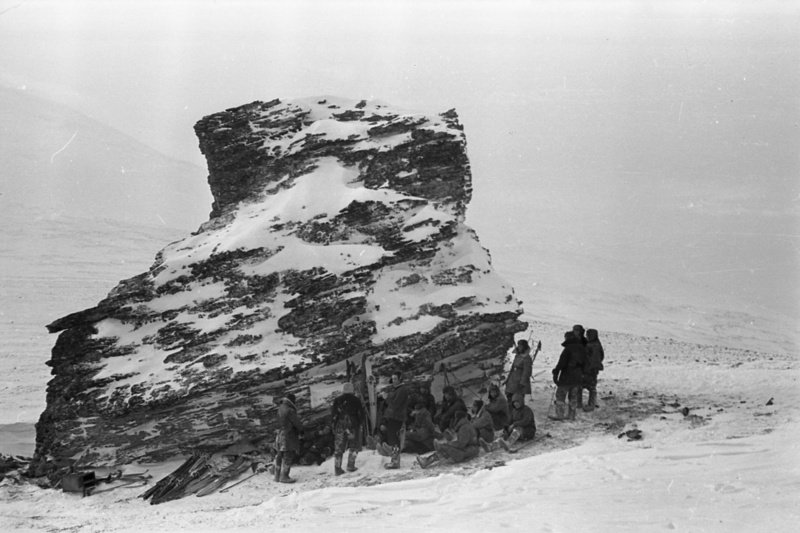 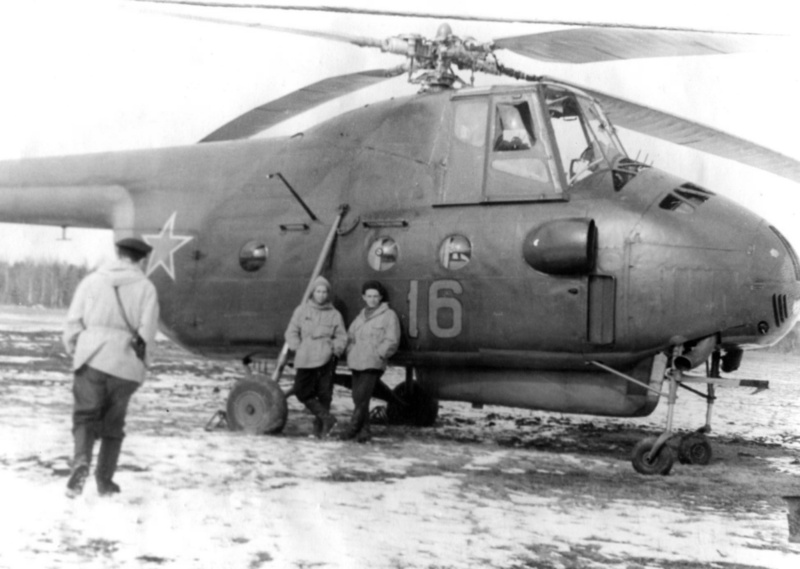 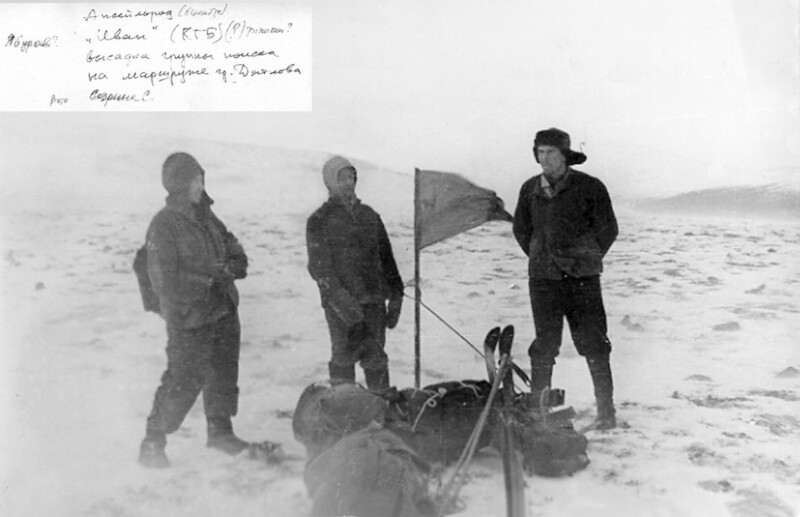 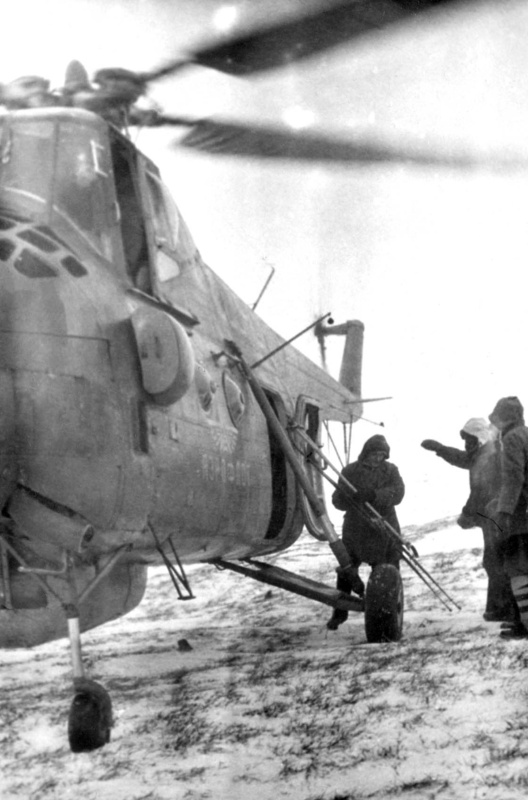 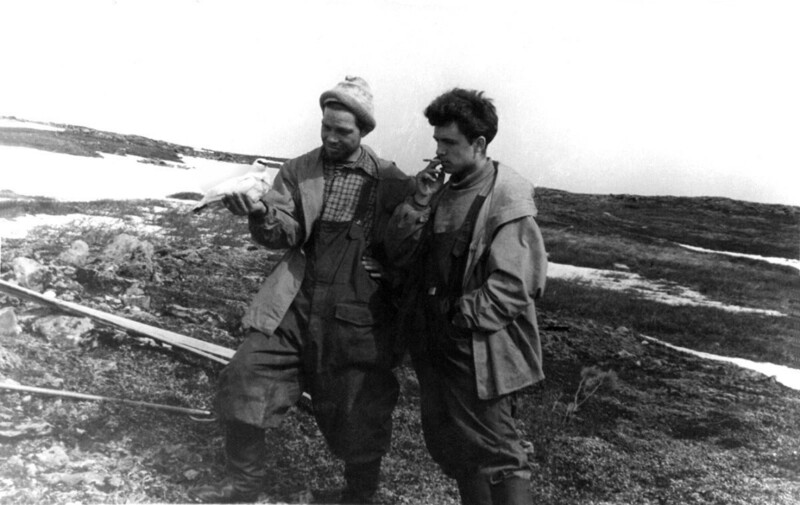 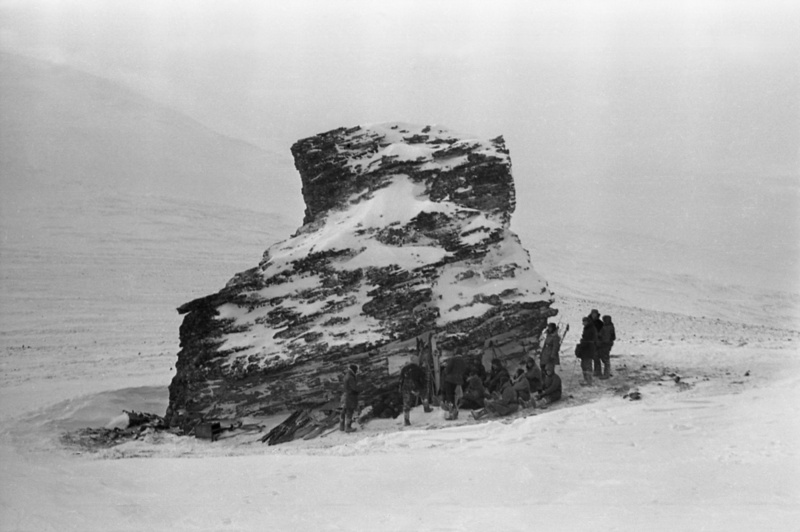 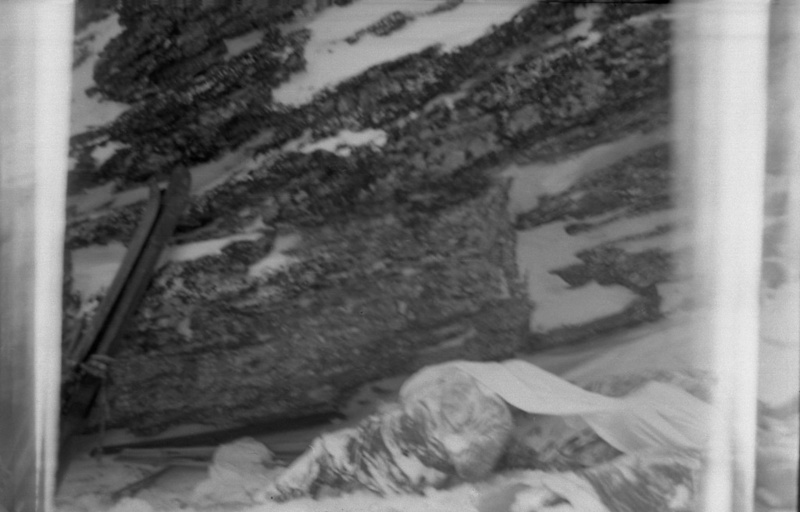 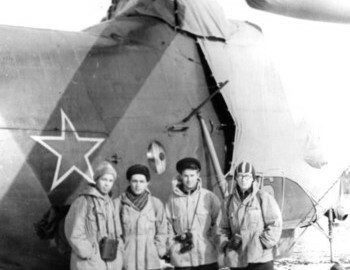 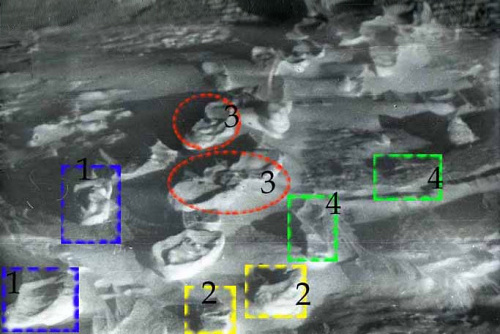 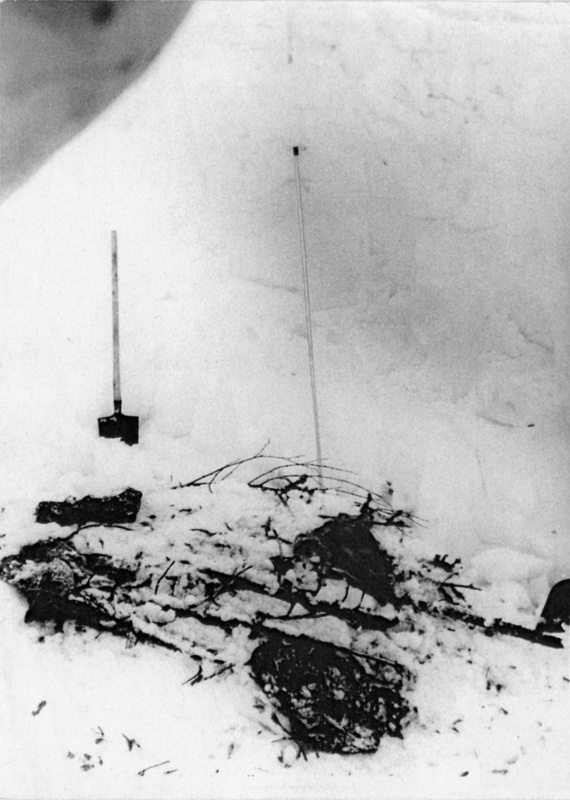 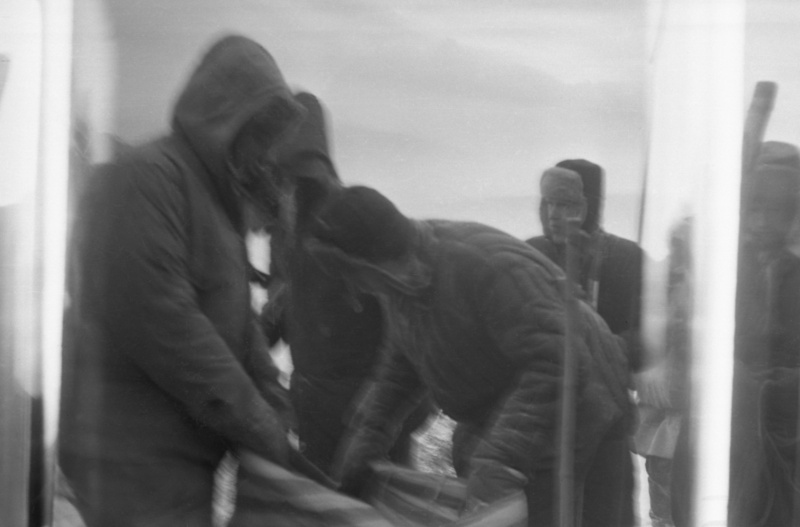 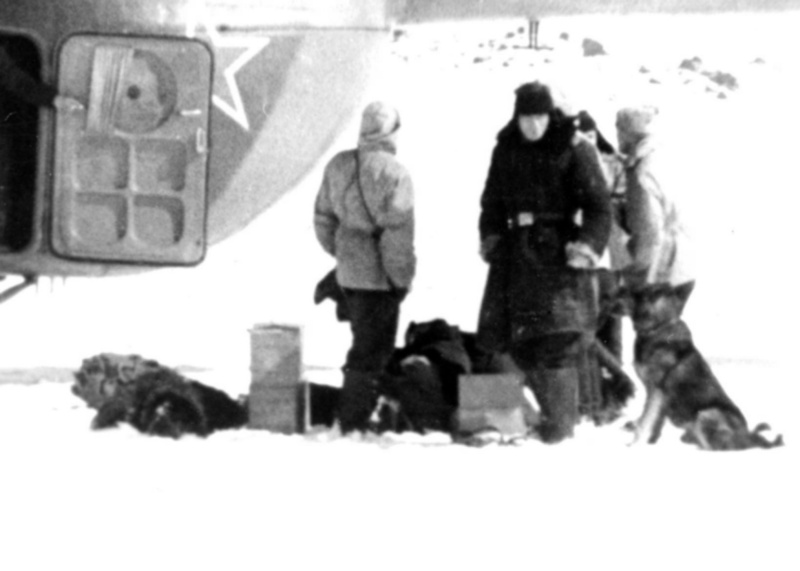 At 6 pm they radioed back about their discovery on the last campsite of the Dyatlov group. 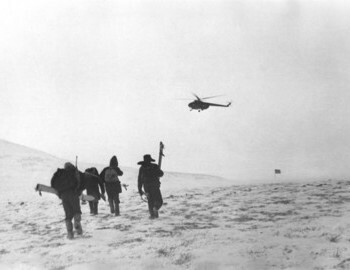 UPI informed them that a large search group with will be delivered by a helicopter to their location. 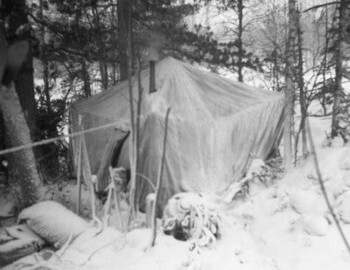 They would also deliver two large military tents for better comfort and security. 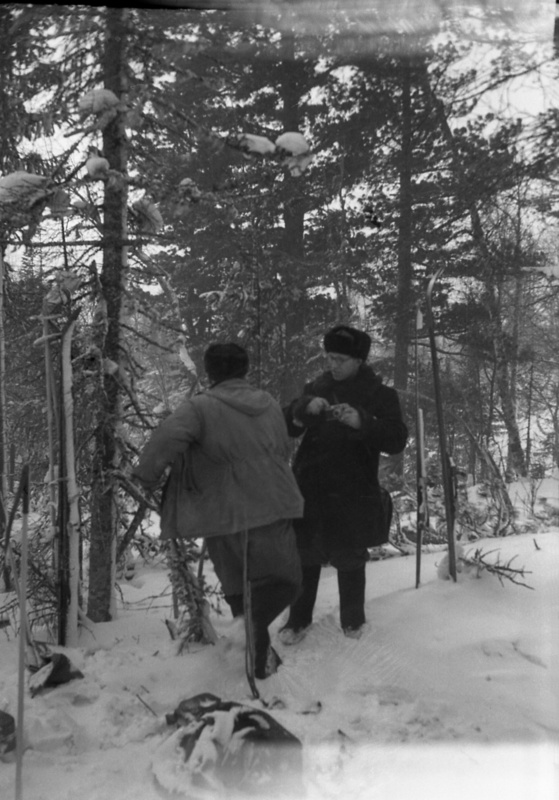 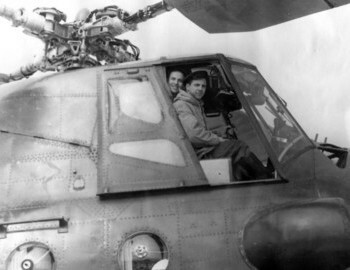 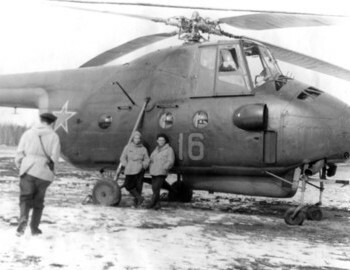 A detective would join the search and rescue effort with Colonel Ortyukov as well. 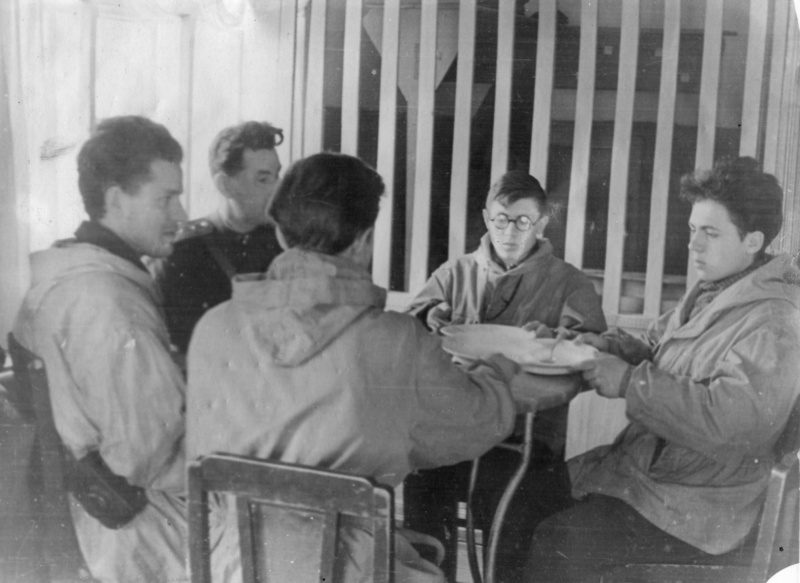 Several members started cooking dinner while everyone else was looking for clues how to continue the search. 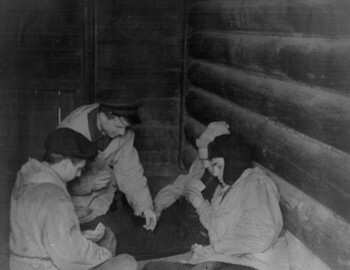 They found 710 rubles and railroad tickets for the whole group. 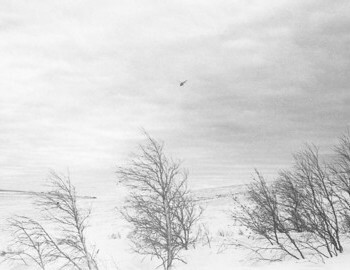 Most took this as a good omen. 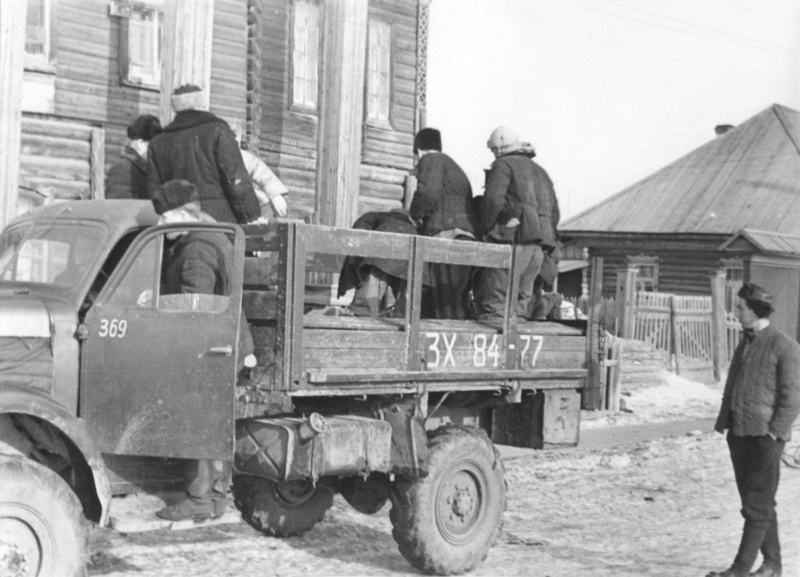 They assumed that criminals were not involved since they would steal everything of value. During dinner Boris Slobtzov raised a toast for the health of his friends and expressed hope that they will be found soon. 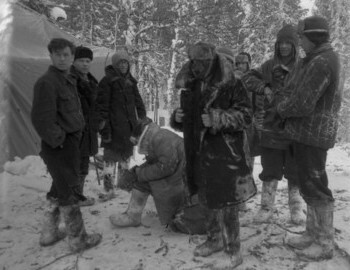 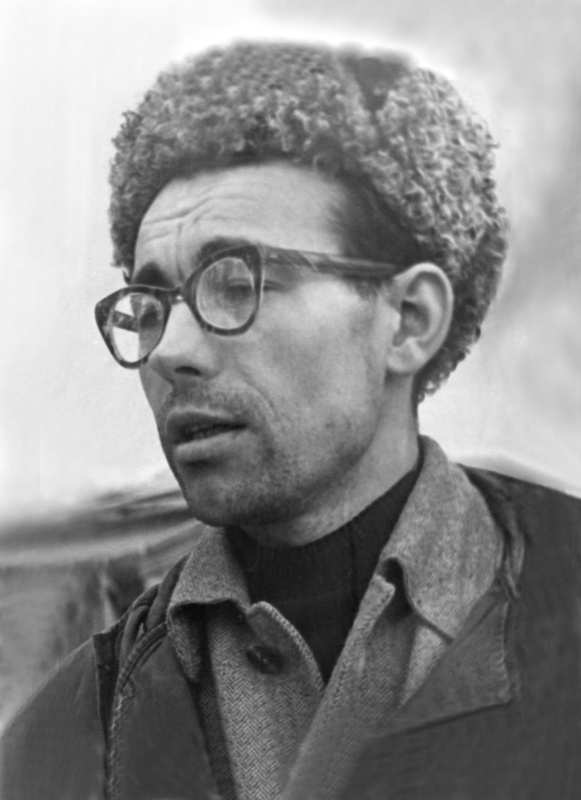 Local forester, Ivan Pashin, was less optimistic about finding everyone alive and suggested that they should probably drink for the dead rather than the living. 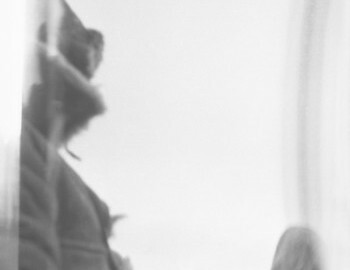 Students found his words offensive and almost beat him up. 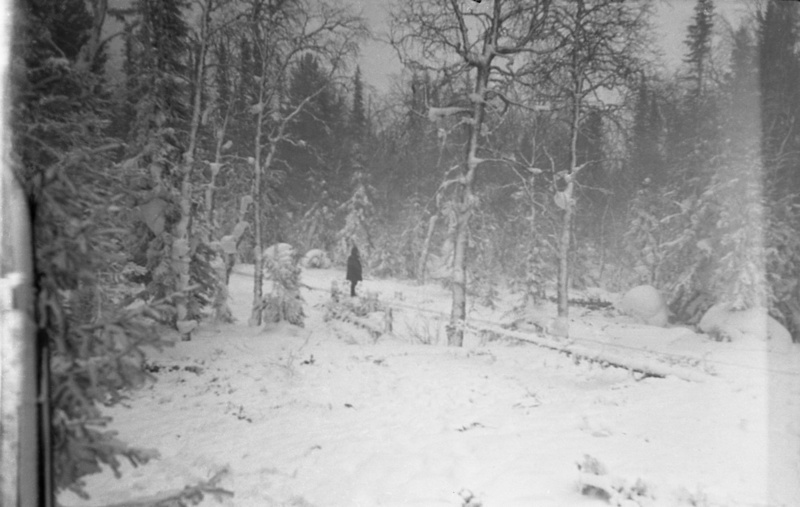 The thought of their friends simply perish like that in Siberian Taiga couldn't sink into their minds yet. 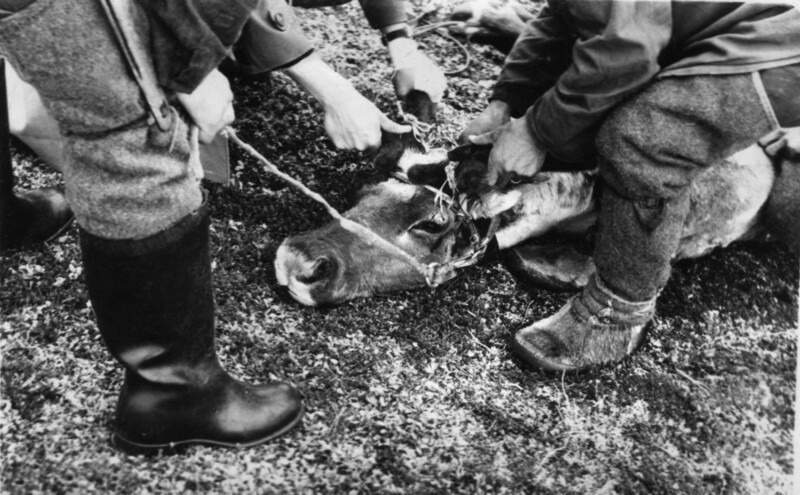 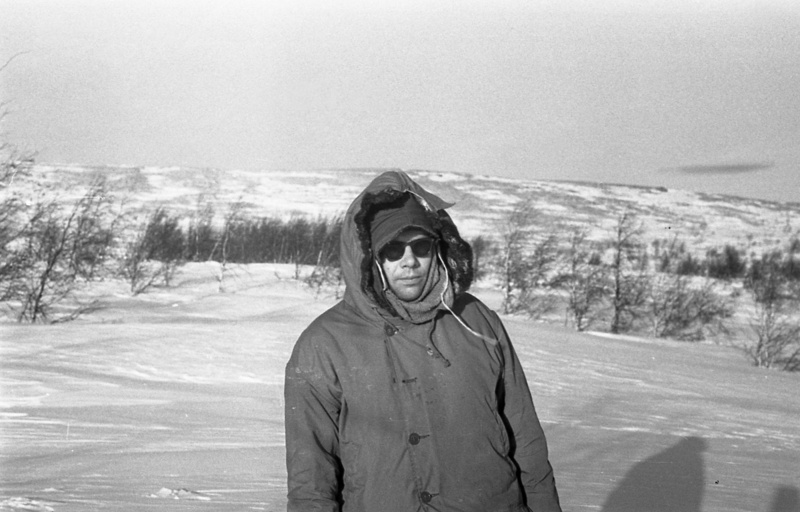 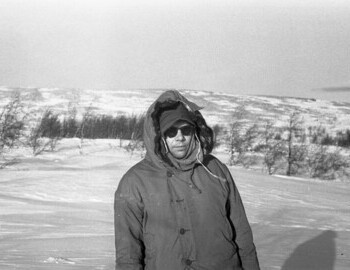 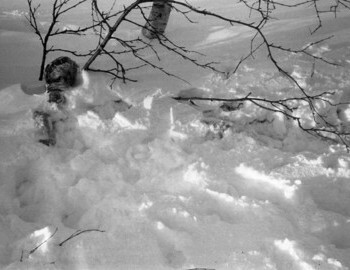 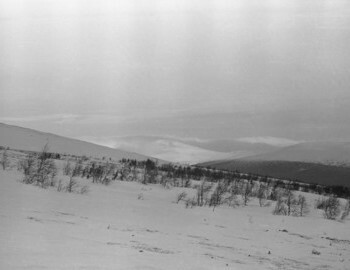 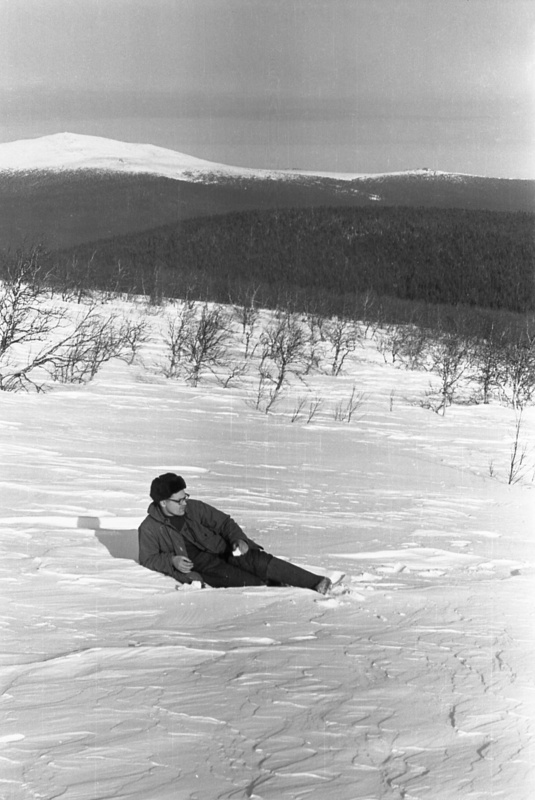 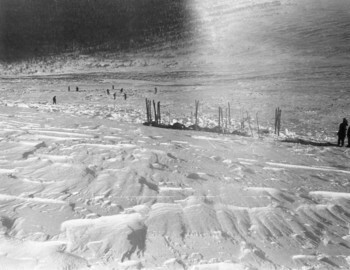 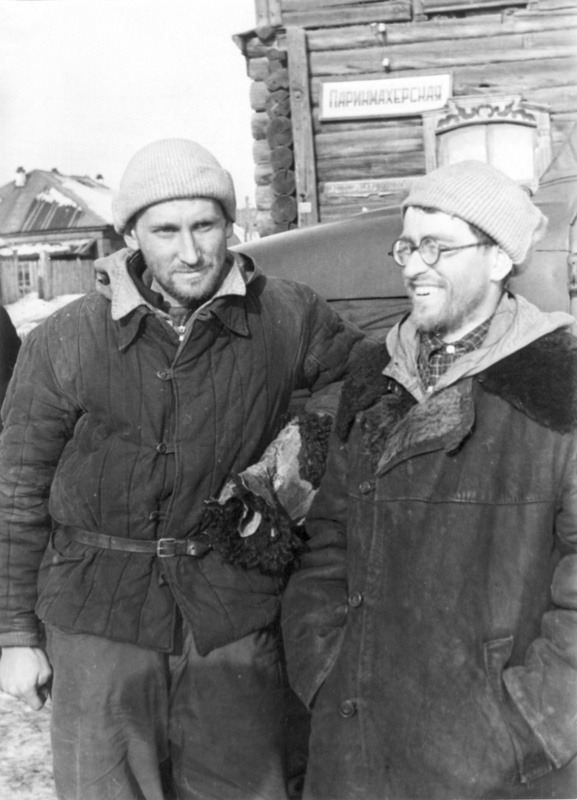 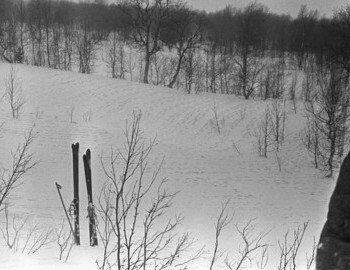 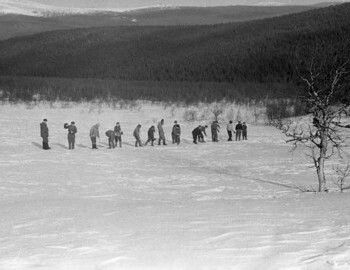 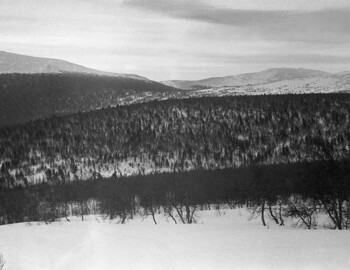 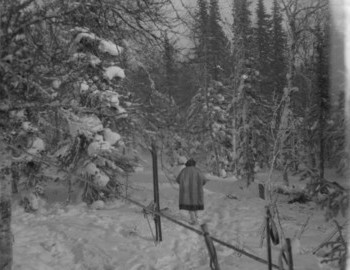 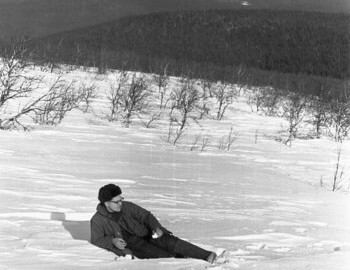 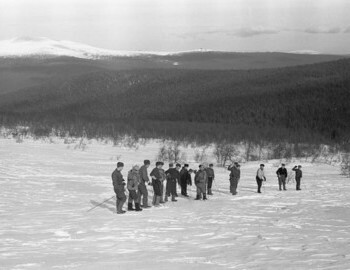 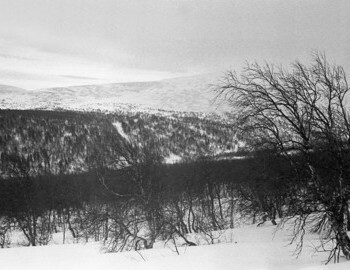 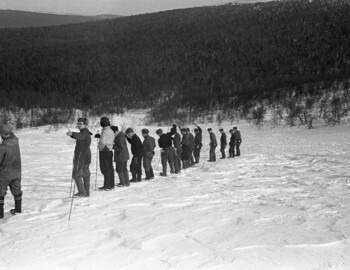 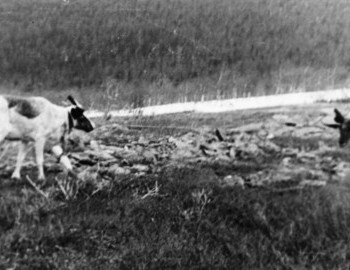 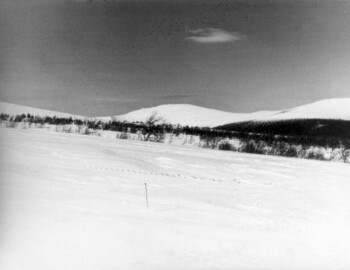 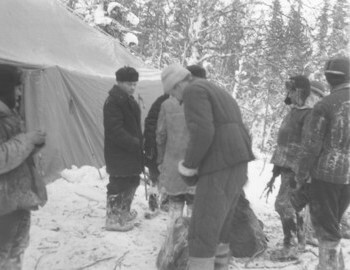 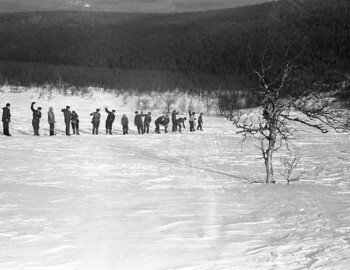 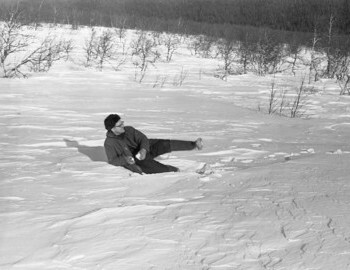 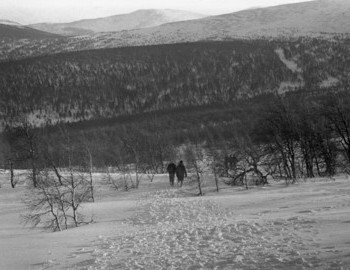 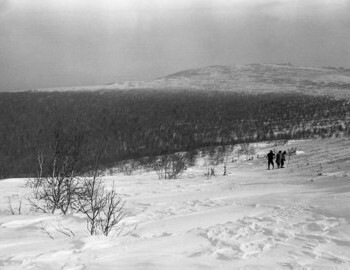 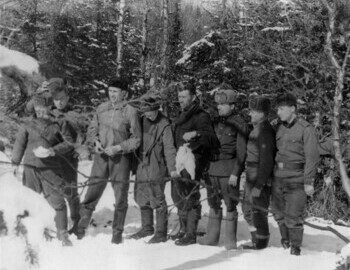 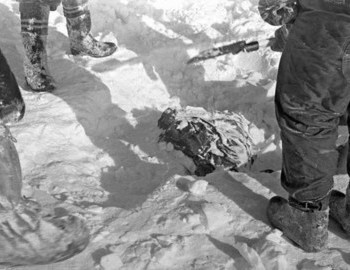 The next day - March 3, 1959 at Ivdel airport all things from the location where the tent was found were spread out and protocoled: 9 parka, 8 quilted jackets (vatnik), 1 fur jacket, 2 fur sleeveless vests, 4 shell pants, 1 cotton pants, 4 Scarf, 13 pairs of gloves (fur, cloth and leather), 8 pairs of ski boots, 7 pcs. 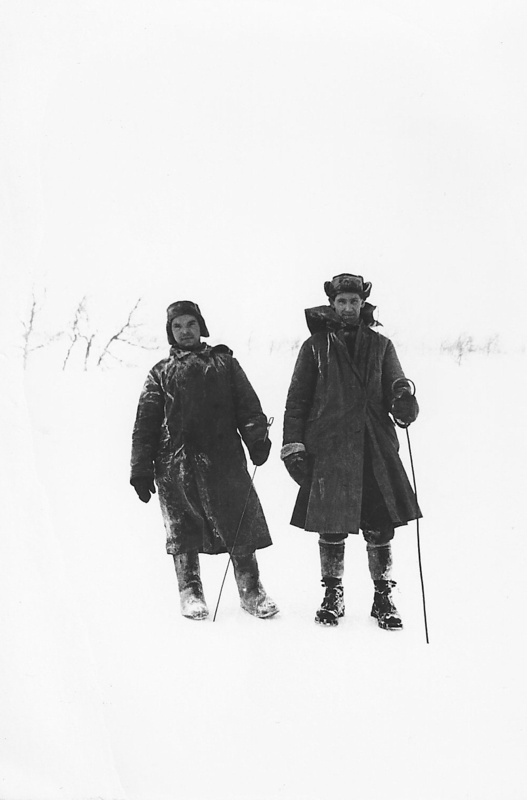 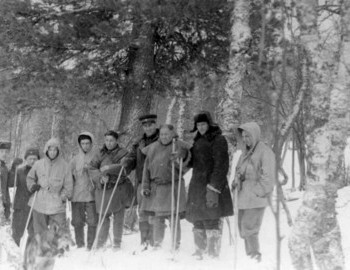 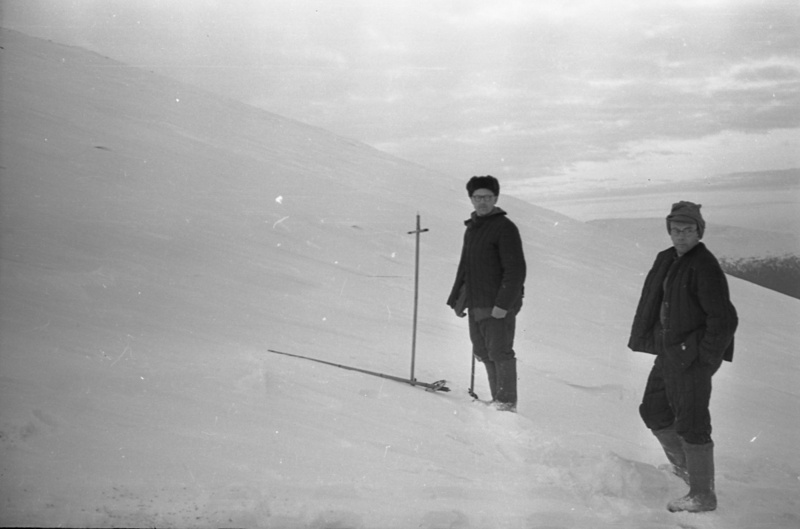 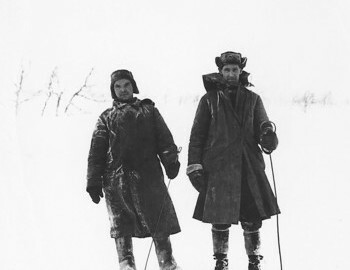 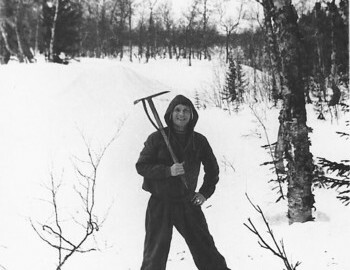 boots (valenki), 2 pairs of slippers, 8 pairs of gaiters, 3 skating caps, 1 fur hat, 2 felt beret, 3 compass, 1 pocket watch, 2 Finnish knives (Tibo's and Krivo's) in their parkas, Kolevatov's Finnish knife in black leather sheath, 3 axes (2 large and 1 small in a leather case), 19 pcs overboots, 2 buckets, 2 pot, 2 flasks, 1 first aid kit. 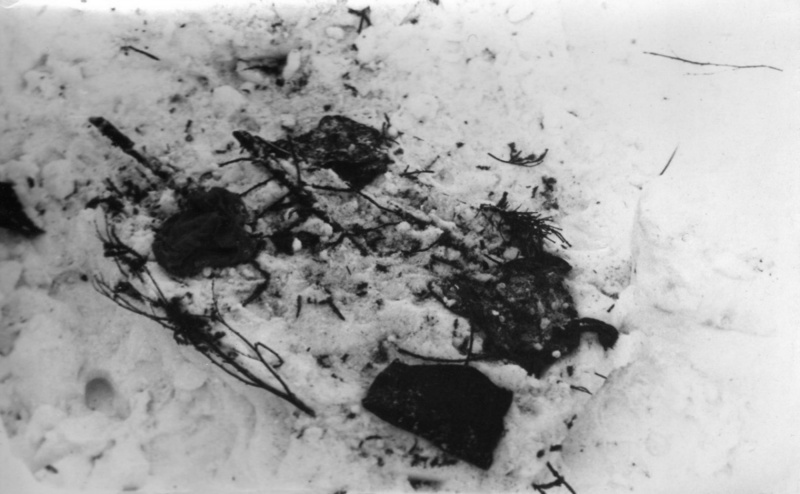 There was also a significant number of small items (socks, foot clothes, masks, toothbrushes) taken out of the backpacks, making it difficult to determine who did they belong to. 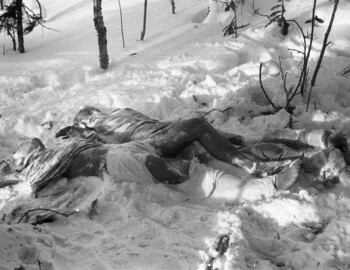 Conclusions: They left without outer clothes, hats, gloves and shoes. 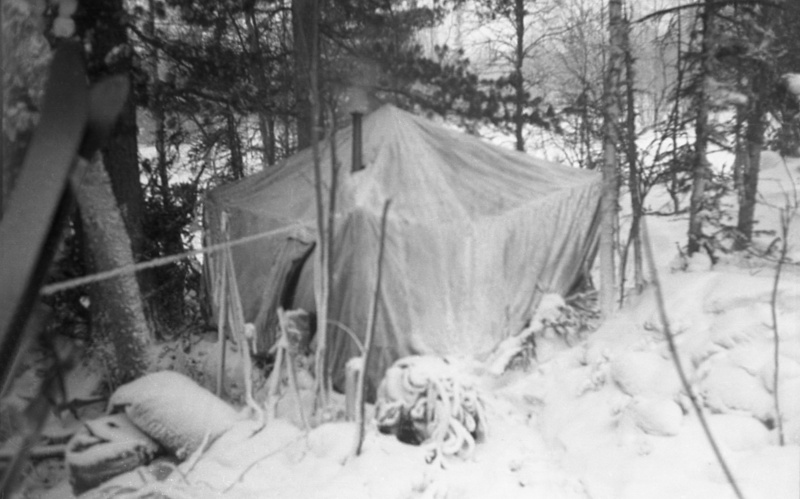 Only exceptionally serious threat might motivate a group of 9 young and physically fit people urgently leave their shelter in the winter evening in a completely uninhabited forest. 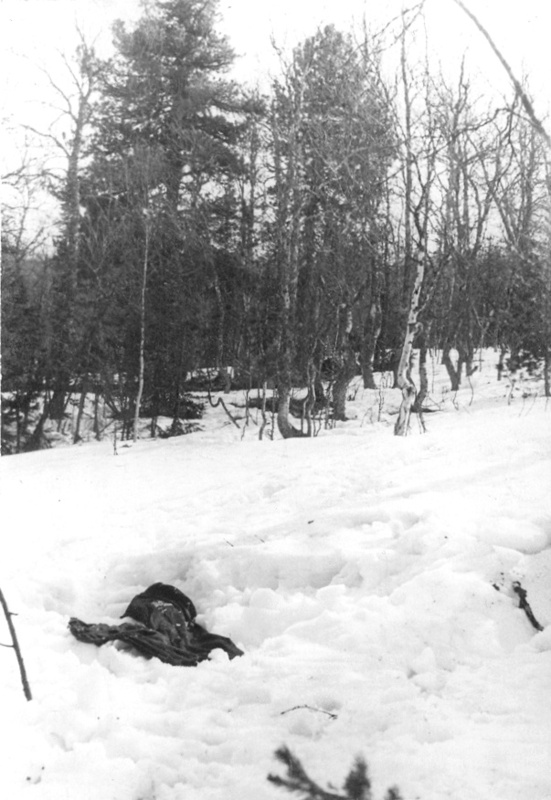 The question apparently was: a retreat down the hill, or the immediate and imminent death at the camp. 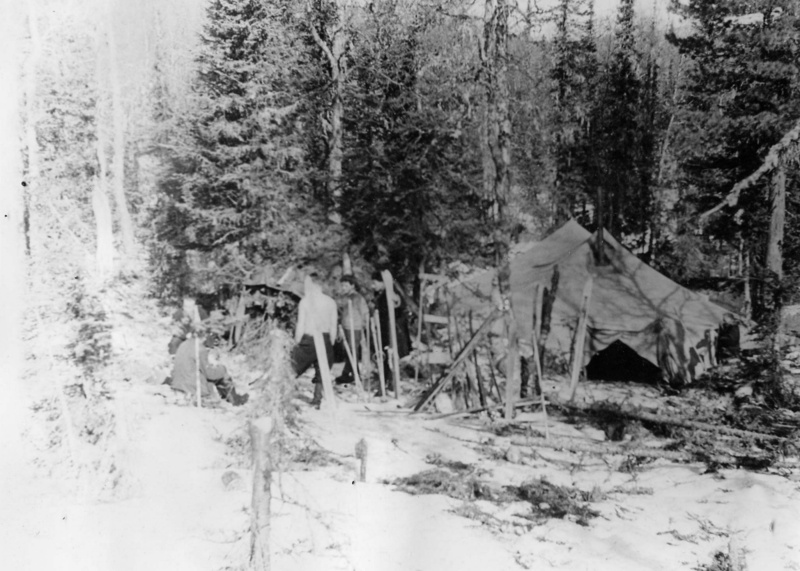 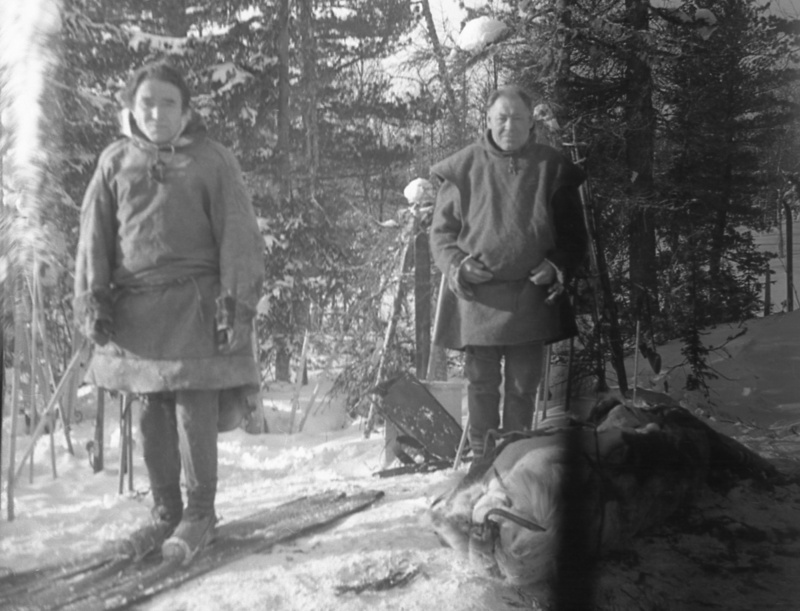 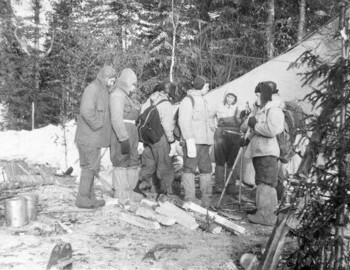 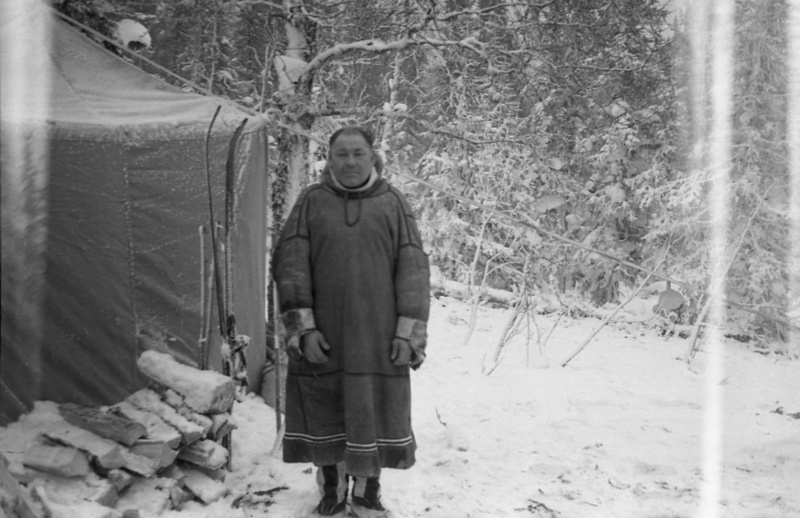 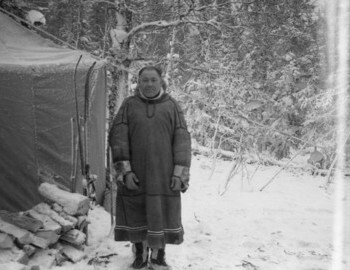 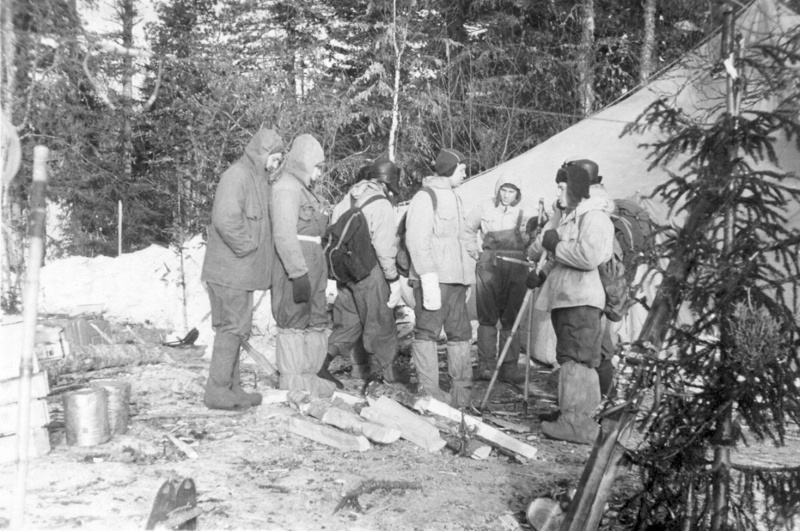 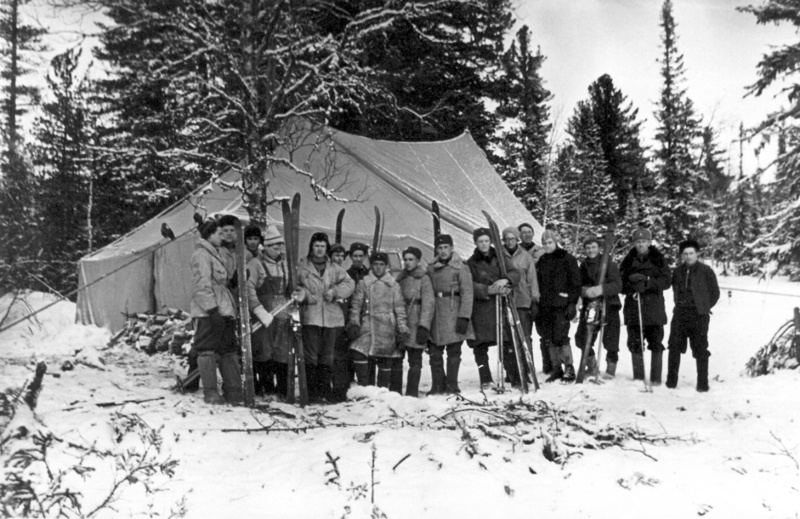 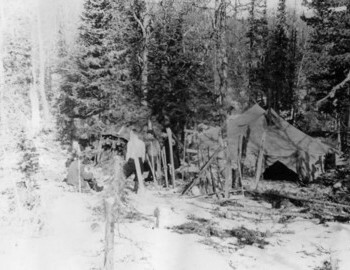 This is not to say that the group was completely unarmed - hikers left in the tent three axes and three Finnish knives, and likely they had more knives with them since they cut the fir and birch trees later in the night. 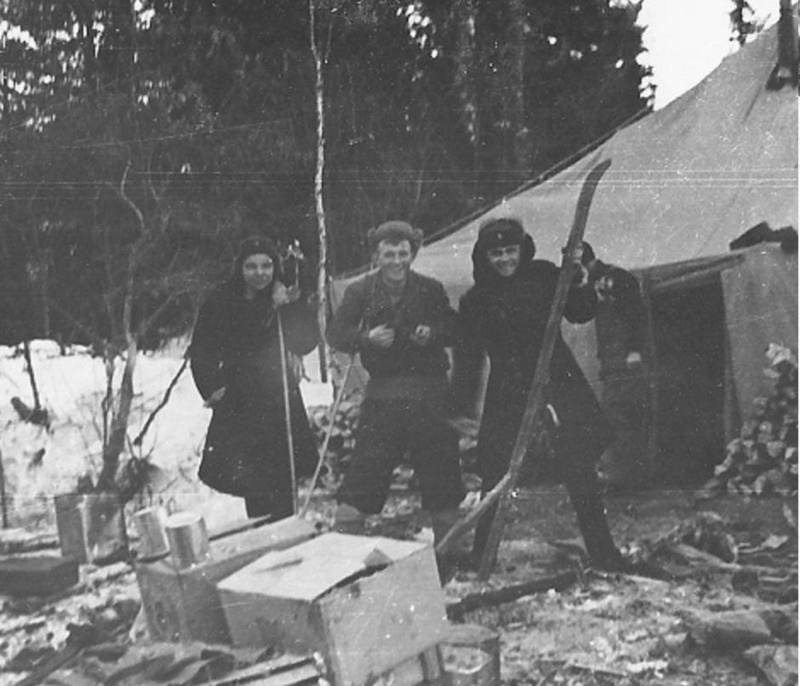 The danger they faced in the camp was not such that could be confronted with axes and knives. 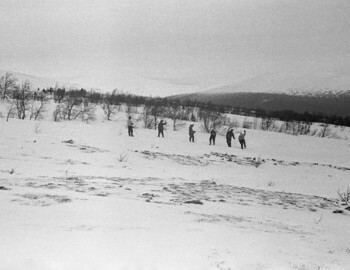 Photos of the search party. 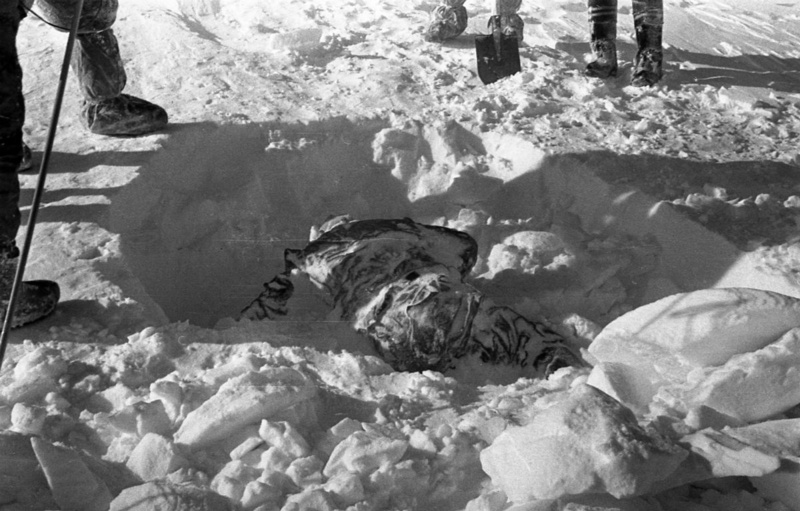 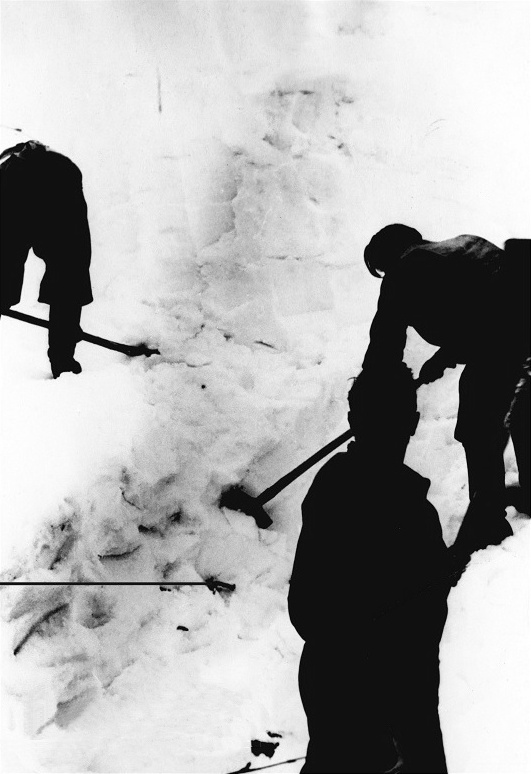 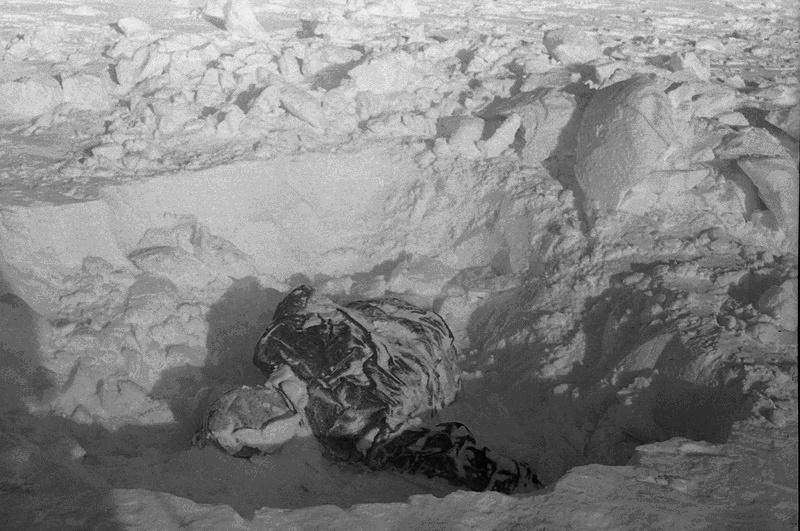 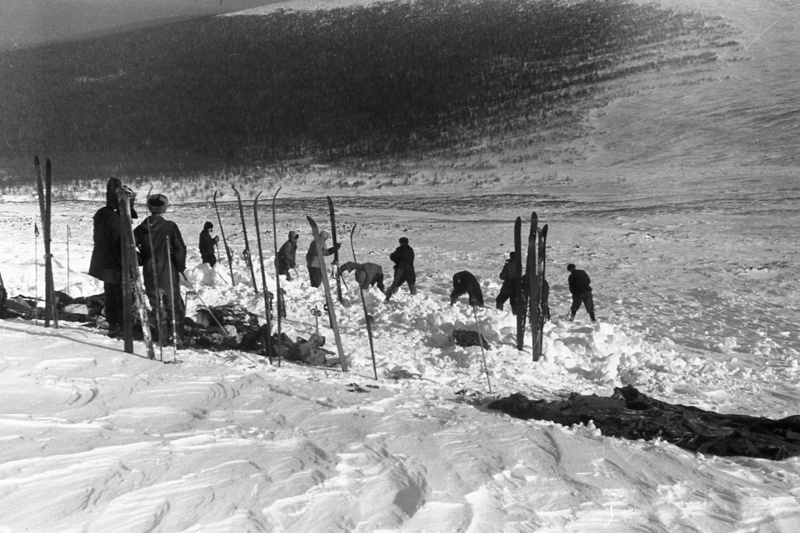 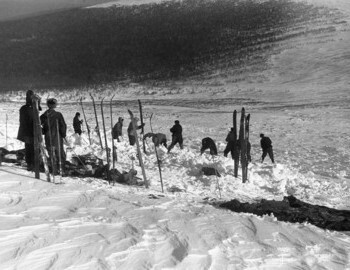 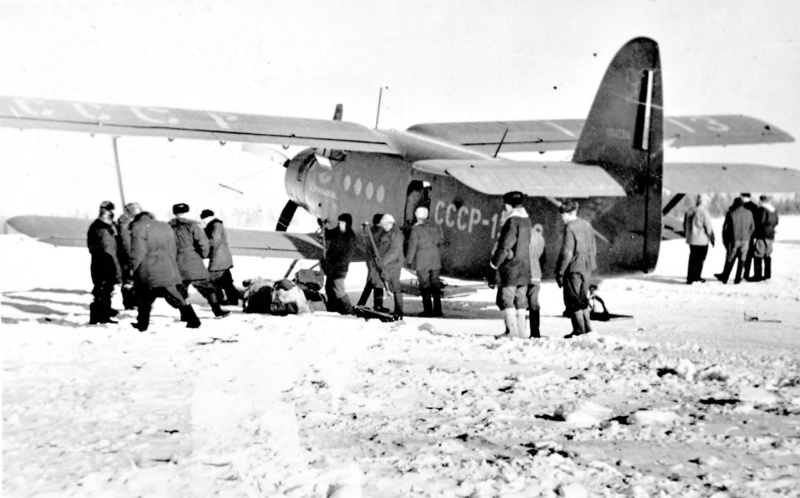 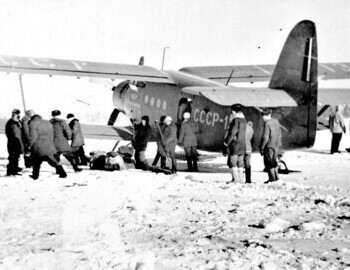 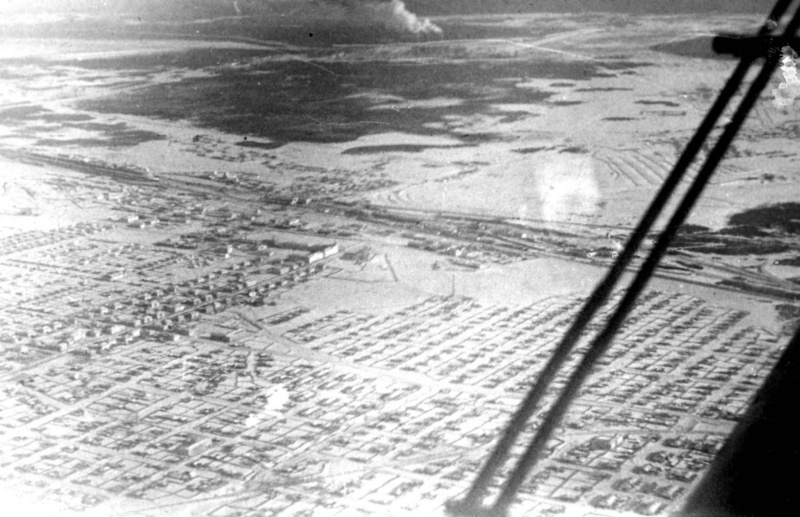 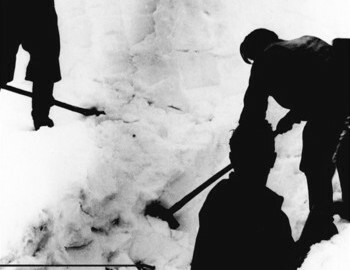 People line up and start probing puncturing the snow every 50 cm all the way to the ground, then the probe was twisted and pulled out catching either blood, or clothes, hair, sometimes there was garbage.